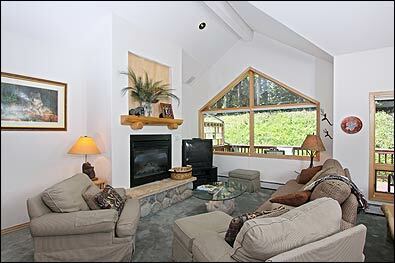 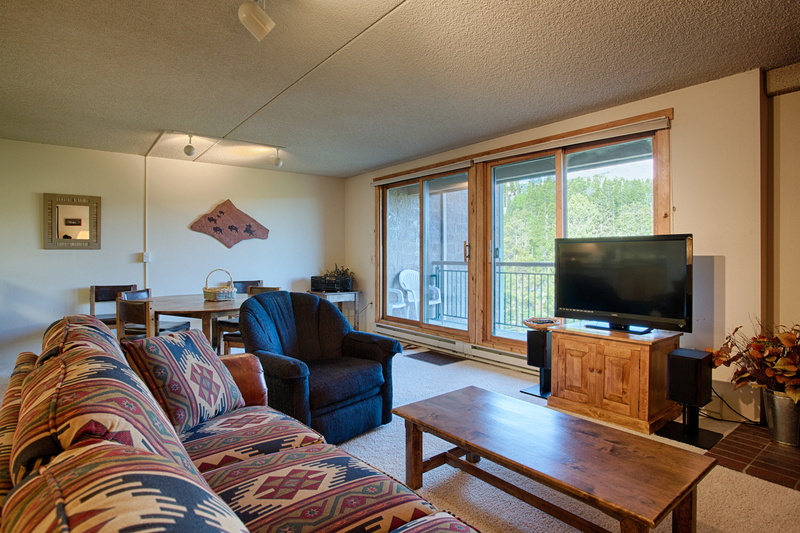 The Tyra Lookout complex is the ideal choice for a relaxing and convenient vacation with an affordable price. 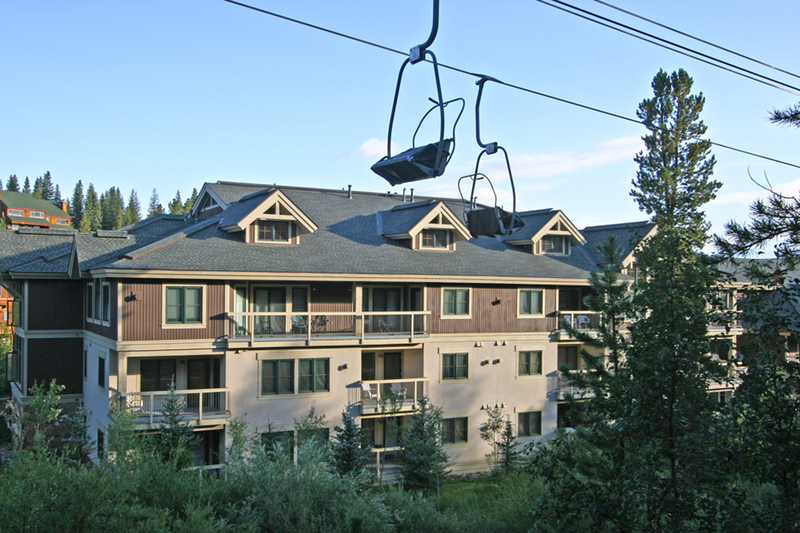 Tyra Lookout is located slopeside next to the Snowflake Lift for true Ski-In/Ski-Out access to the Breckenridge Ski Resort. 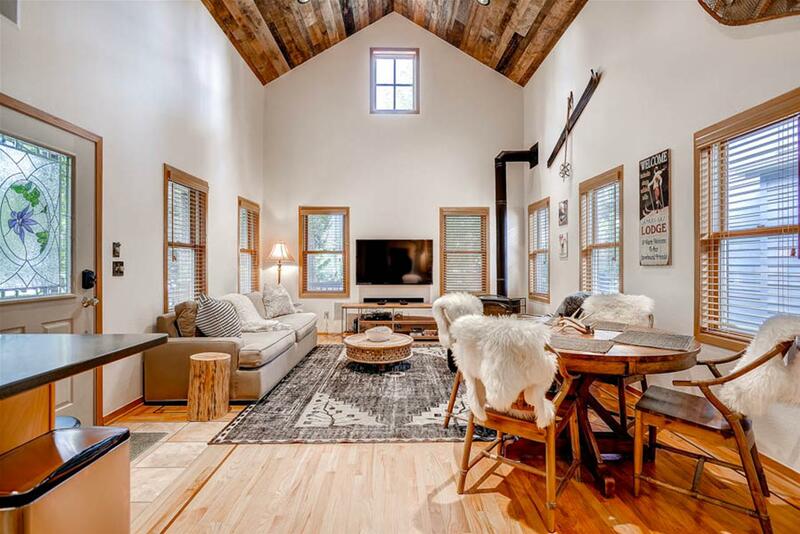 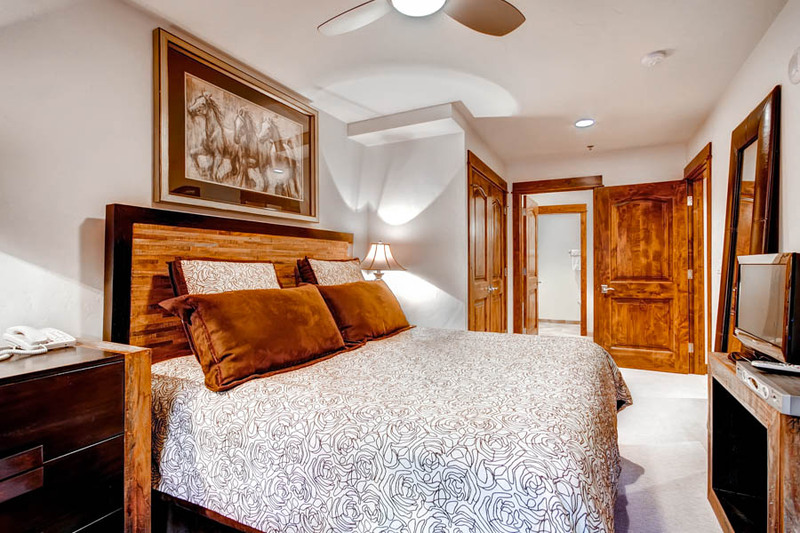 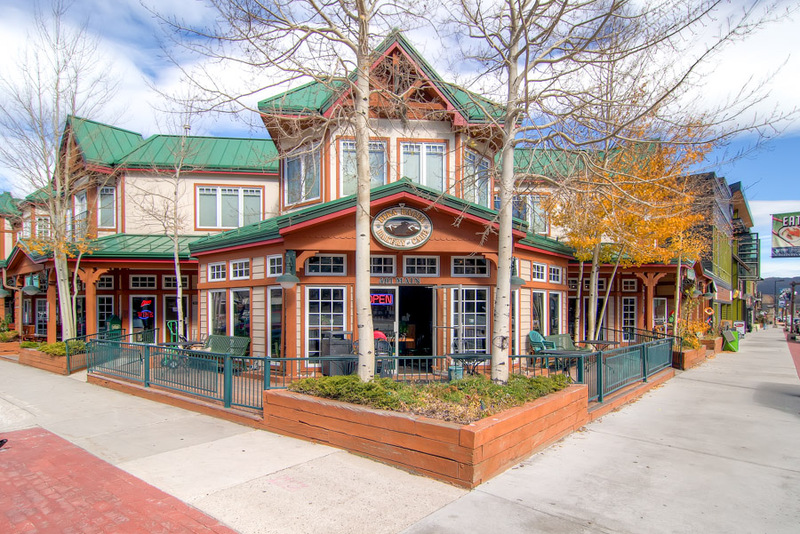 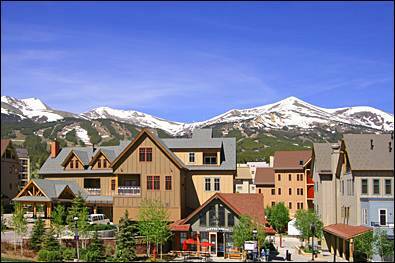 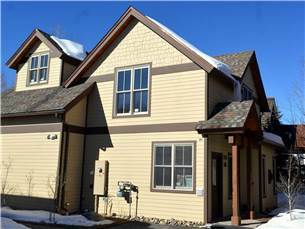 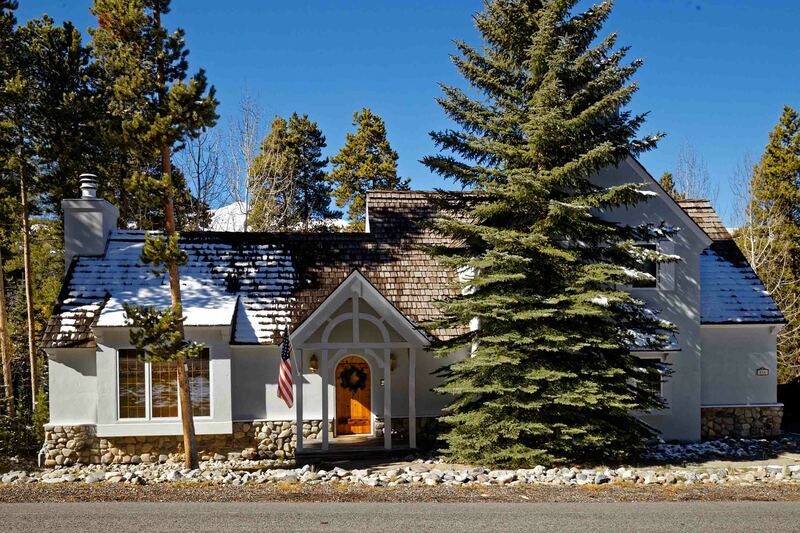 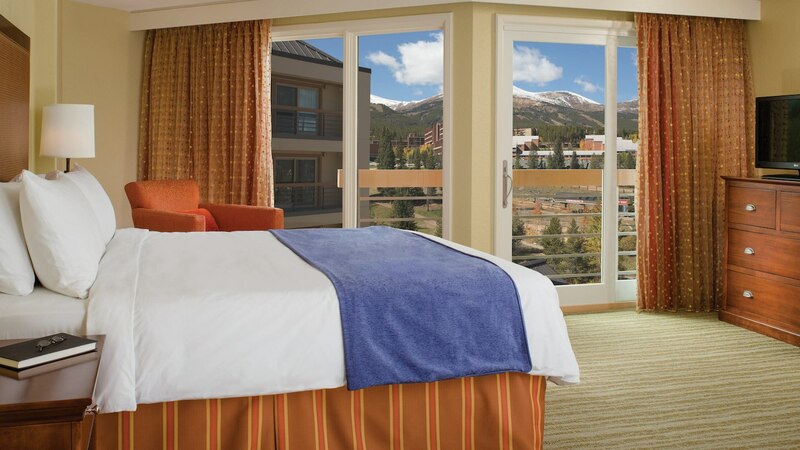 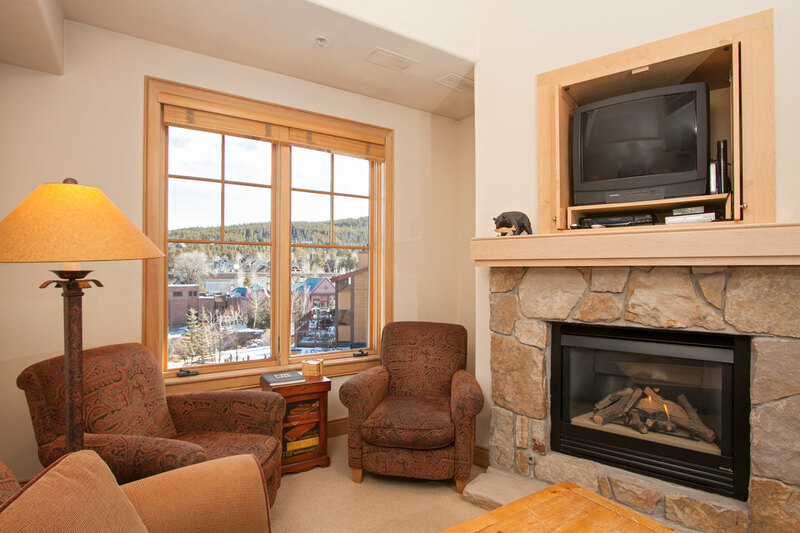 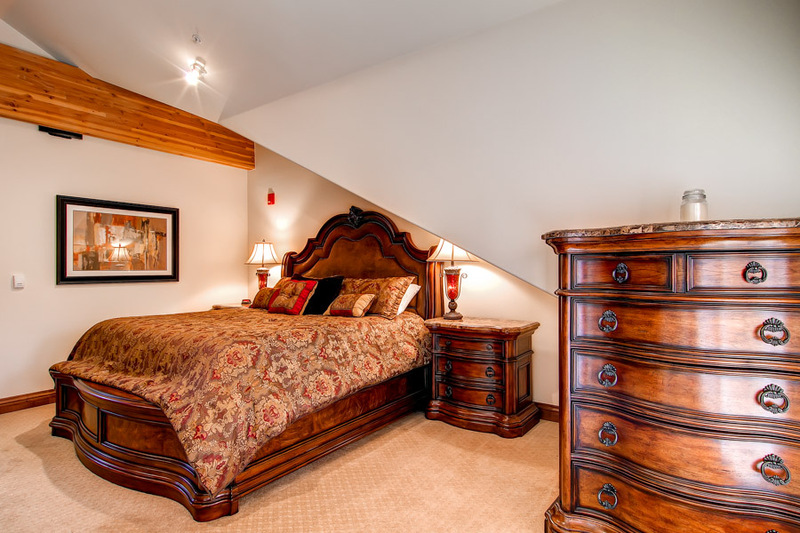 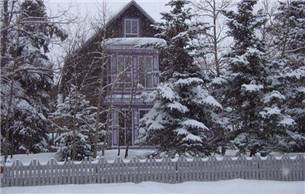 The property is also just three and a half blocks to Historic Main Street with access to everything Breckenridge has to offer. 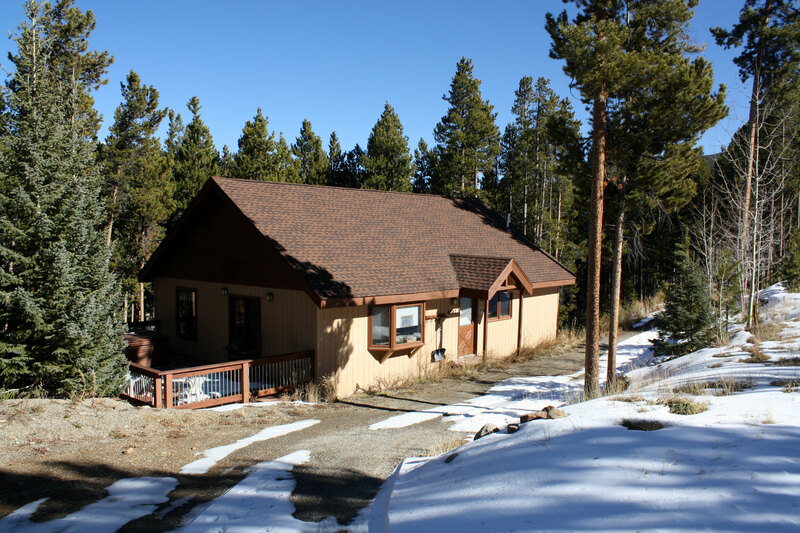 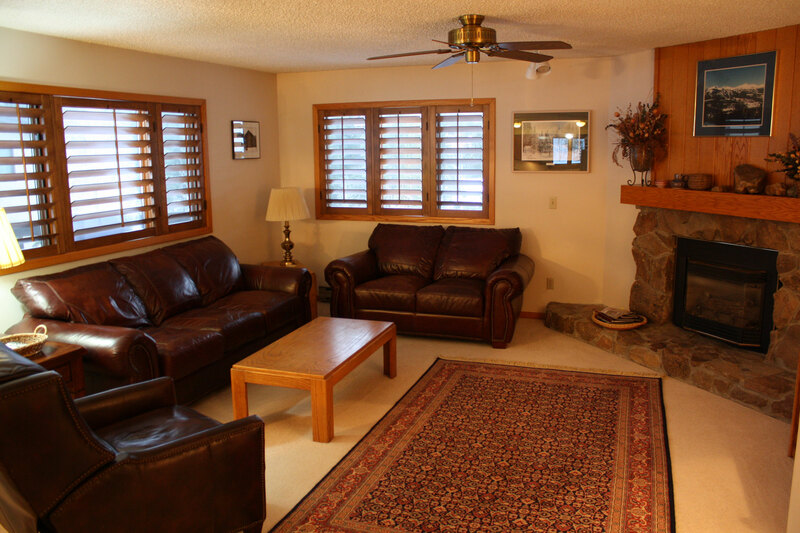 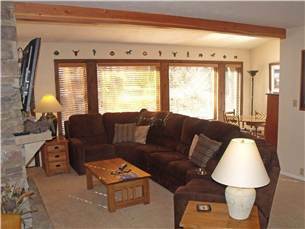 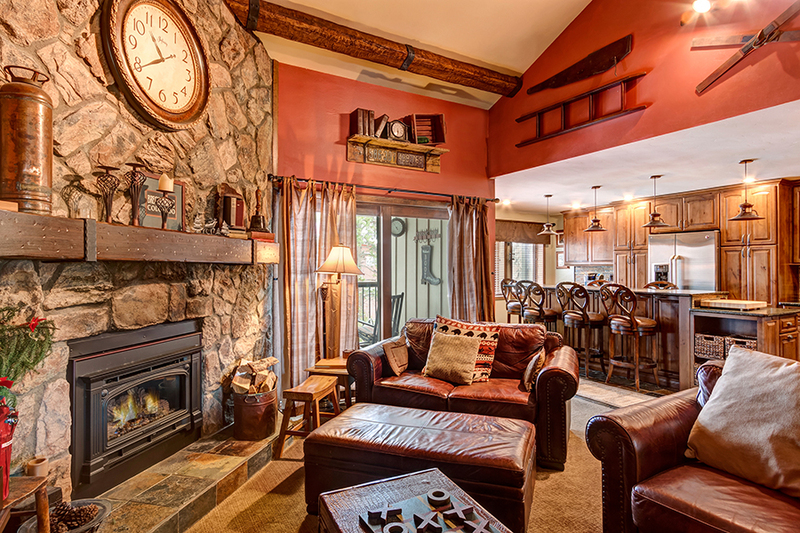 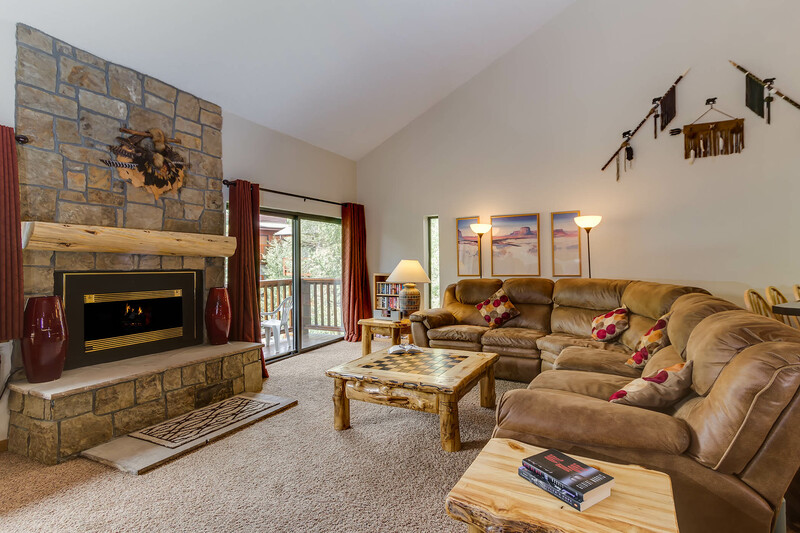 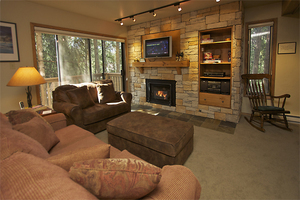 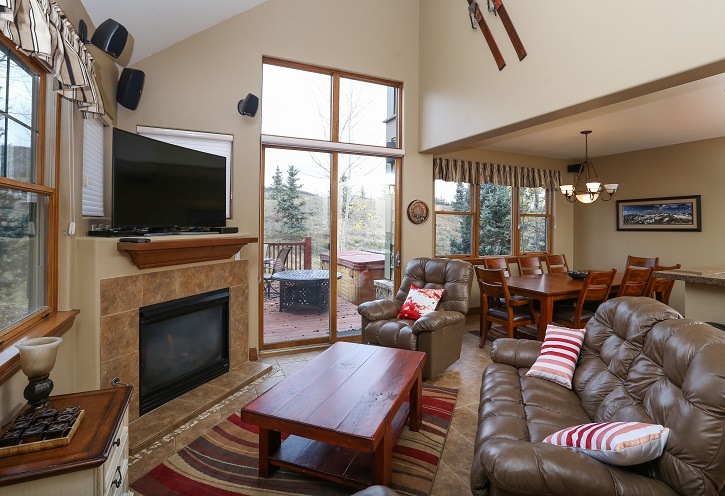 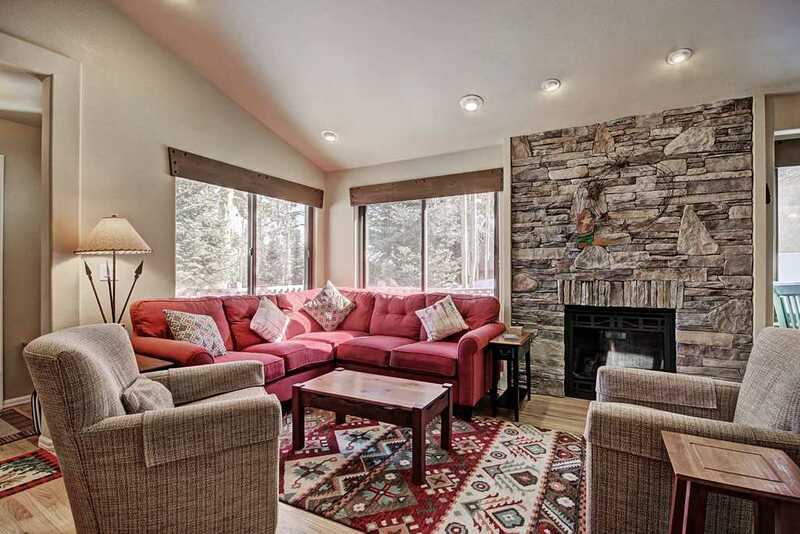 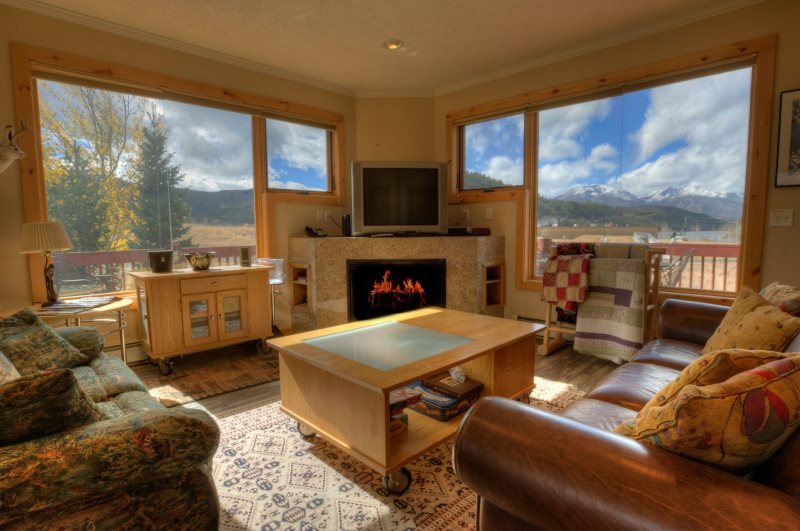 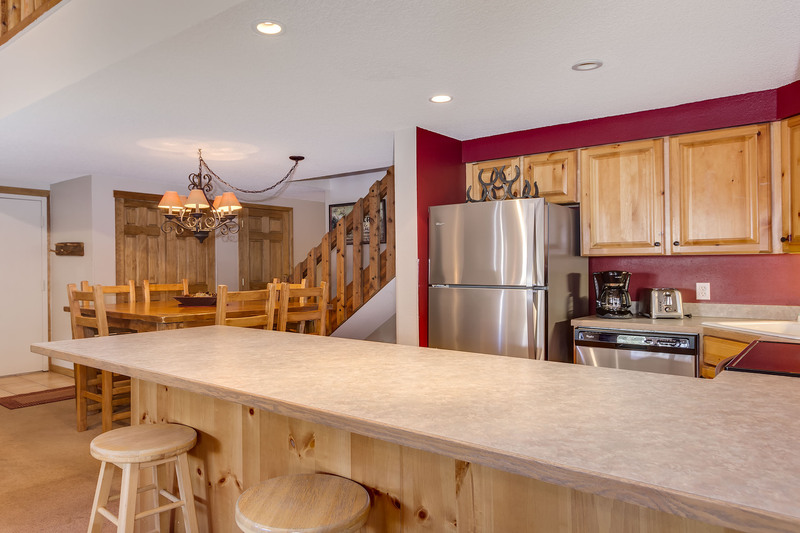 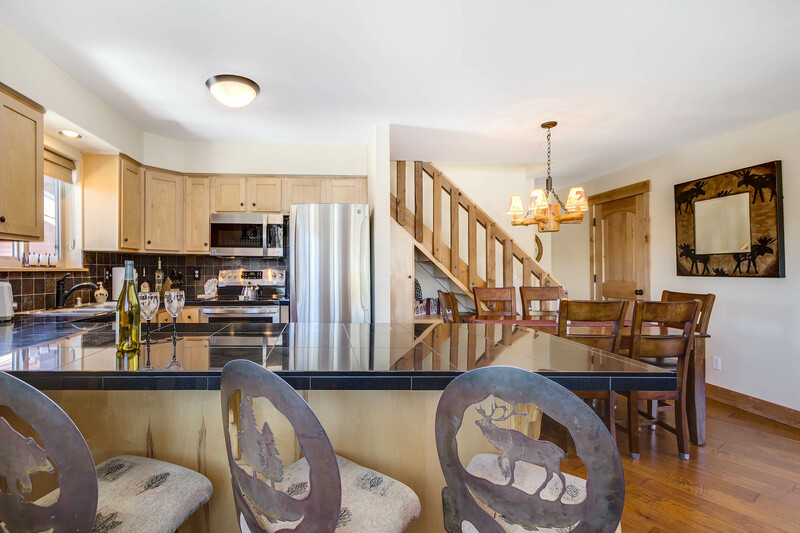 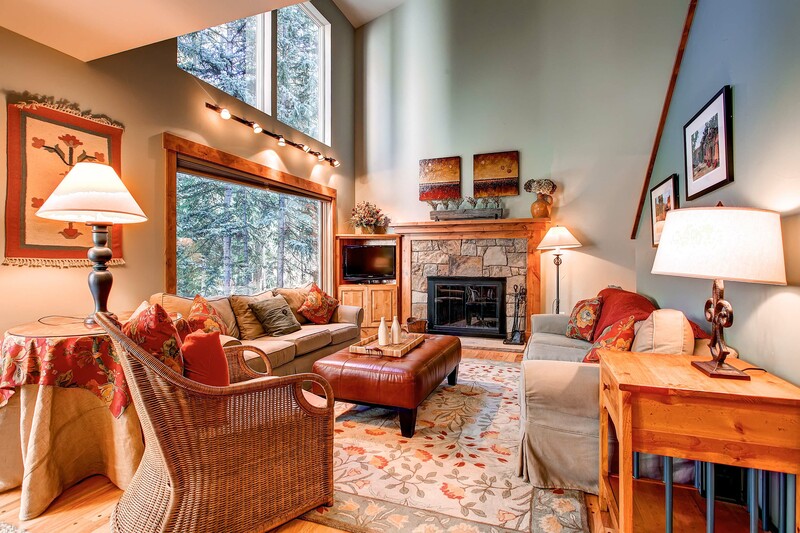 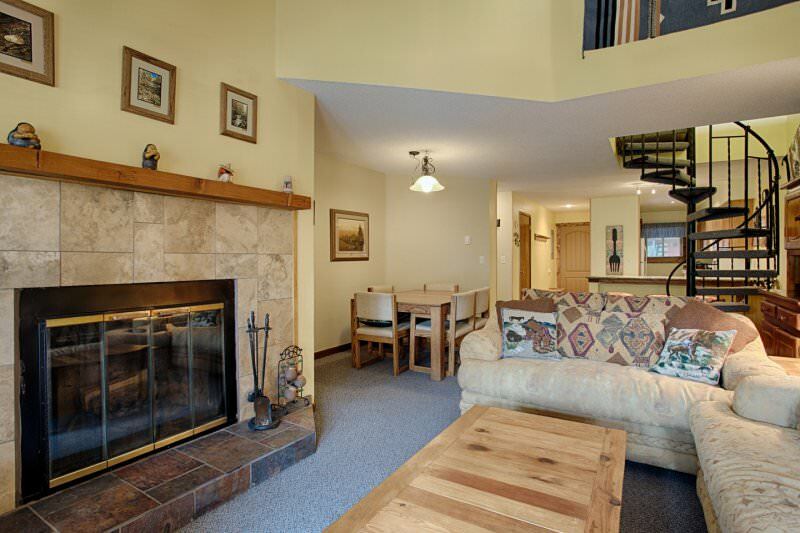 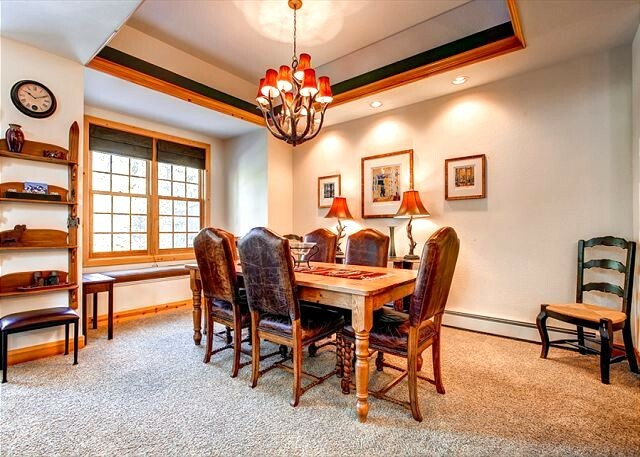 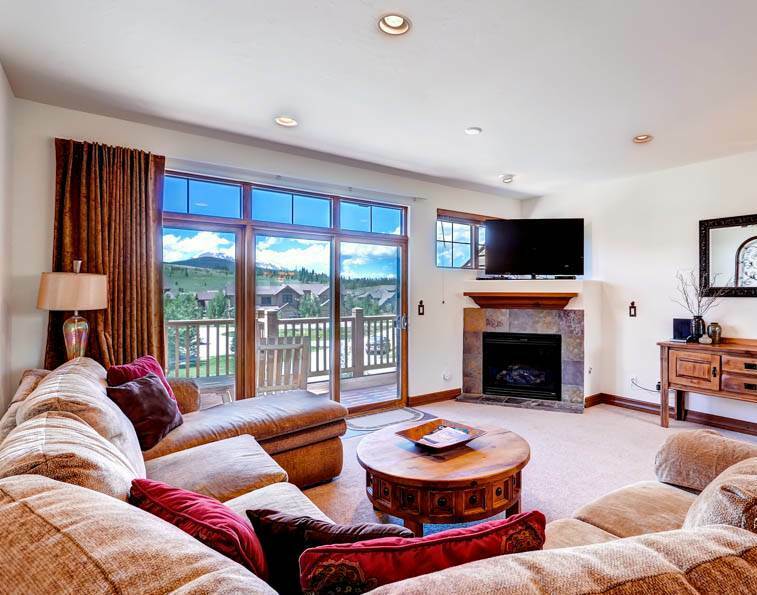 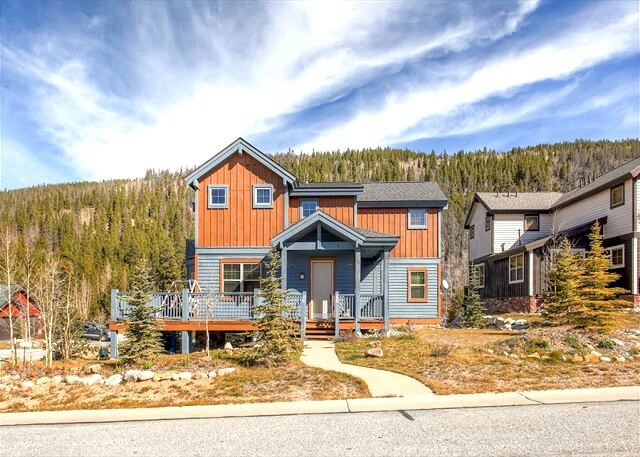 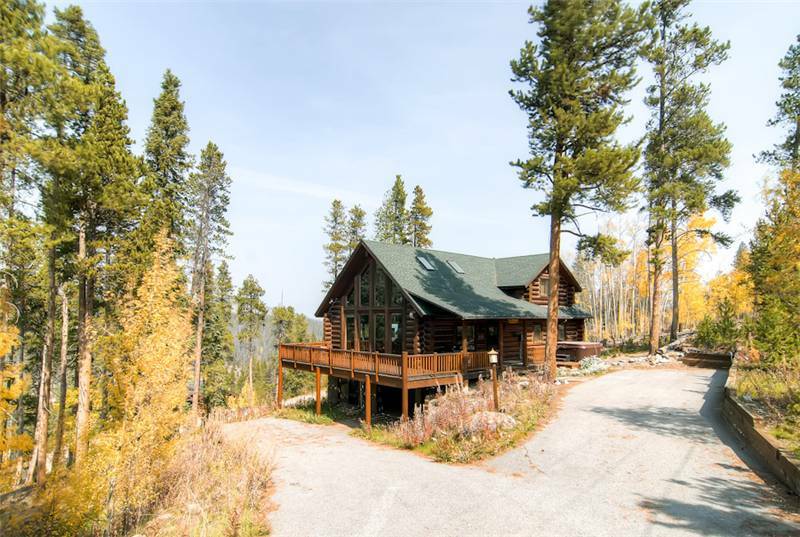 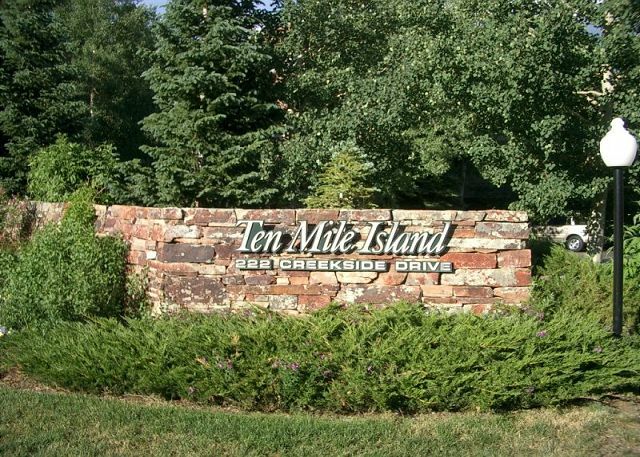 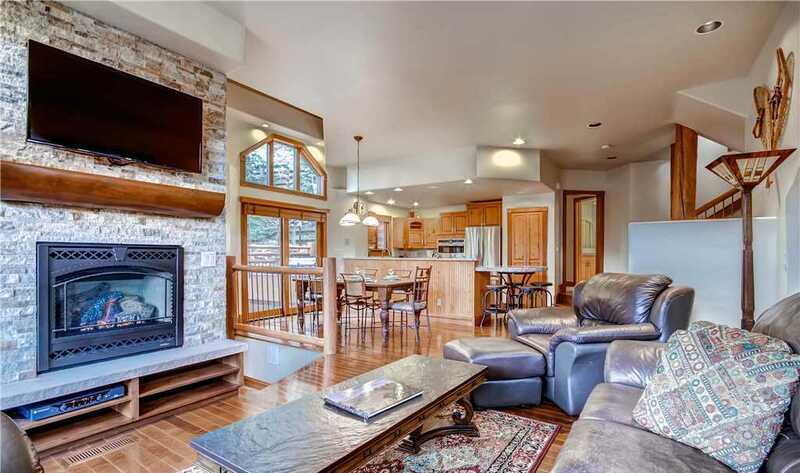 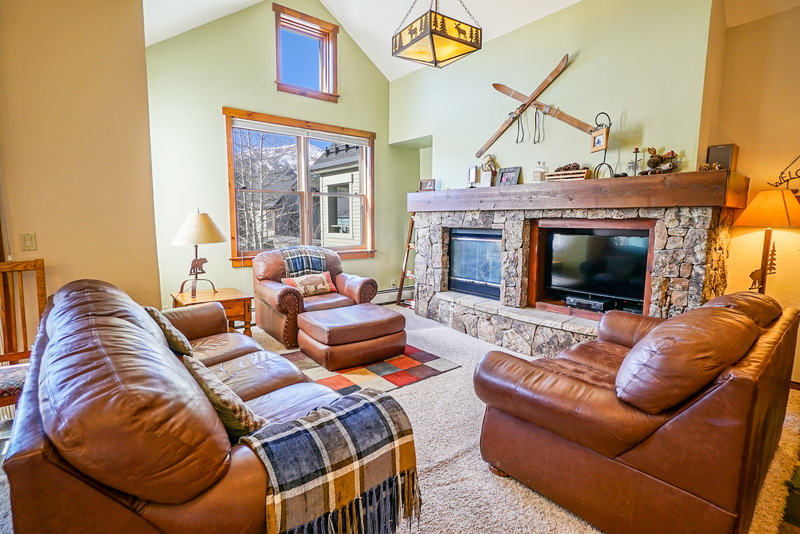 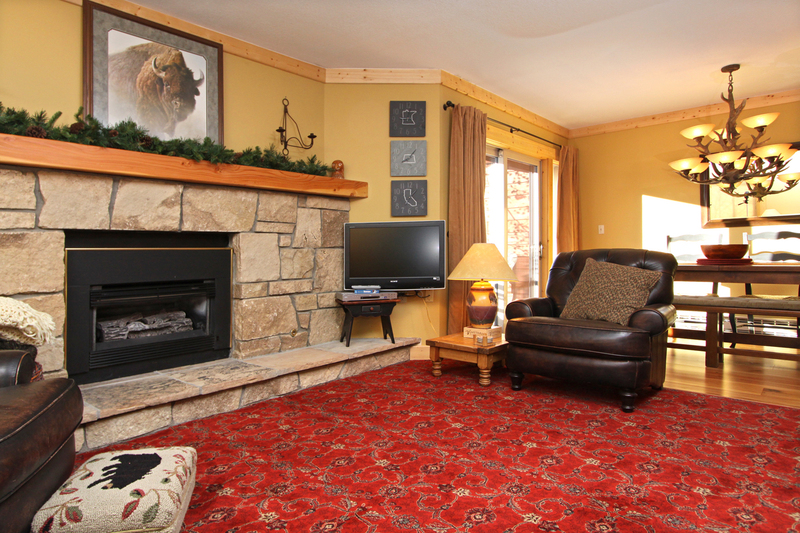 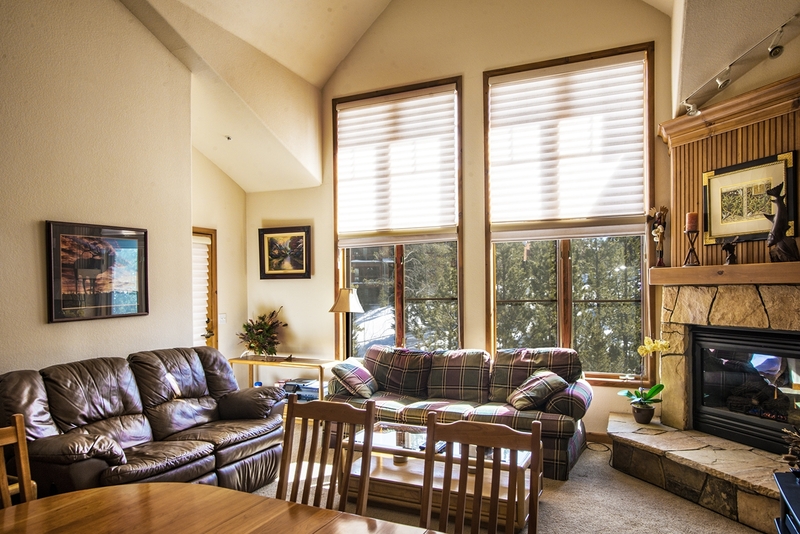 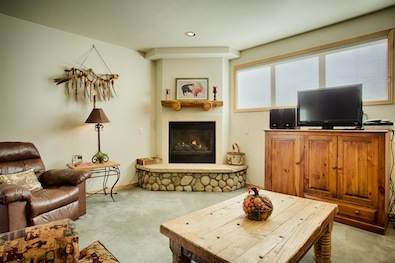 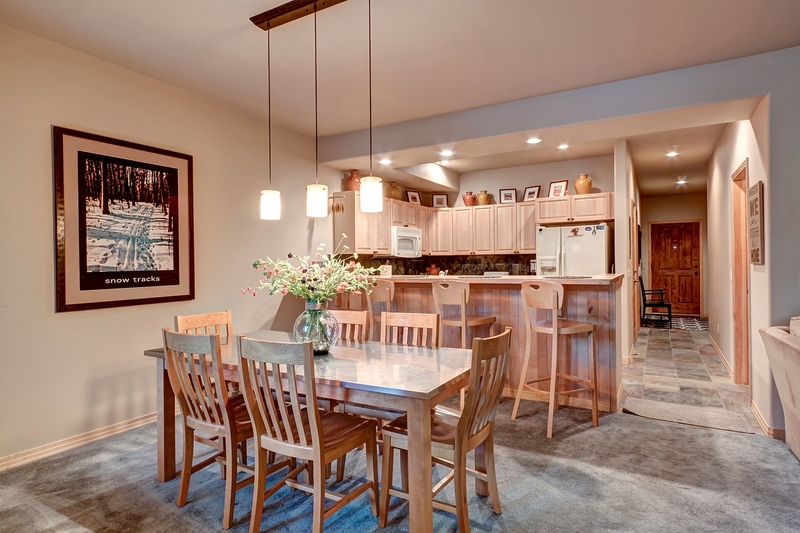 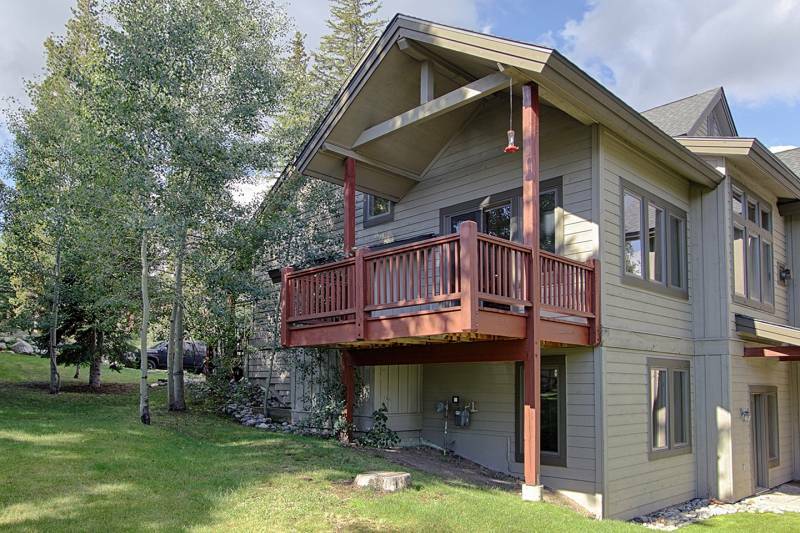 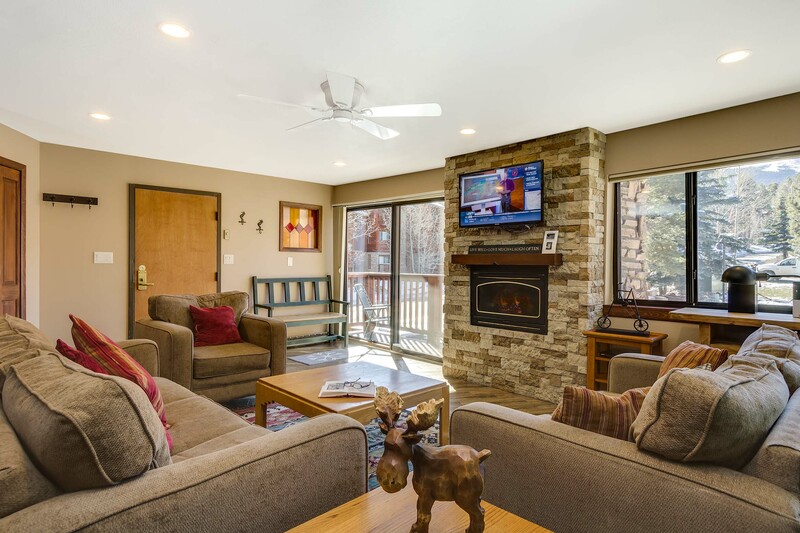 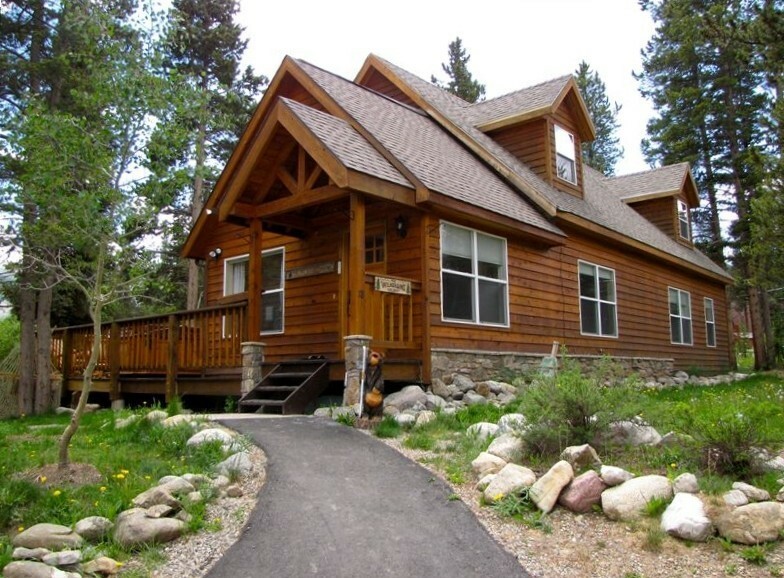 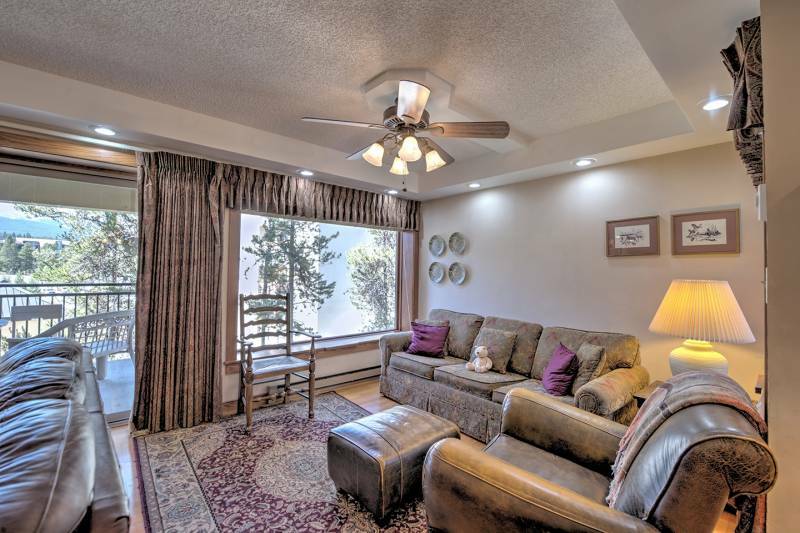 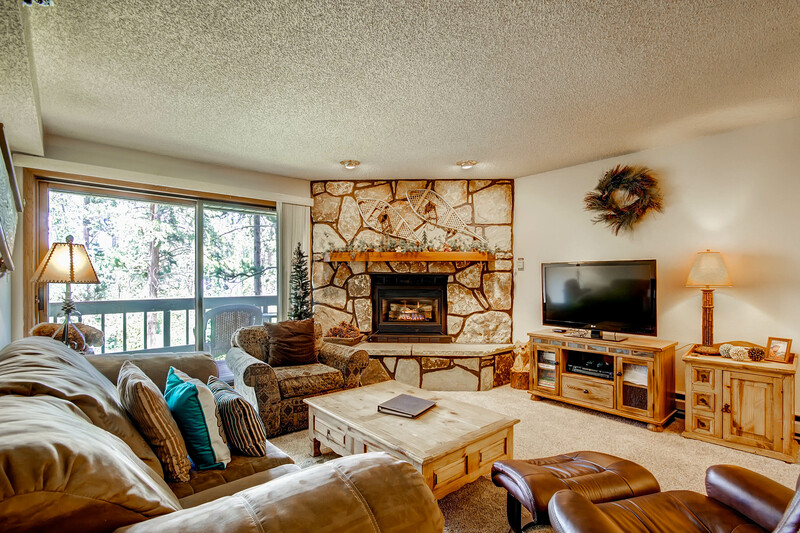 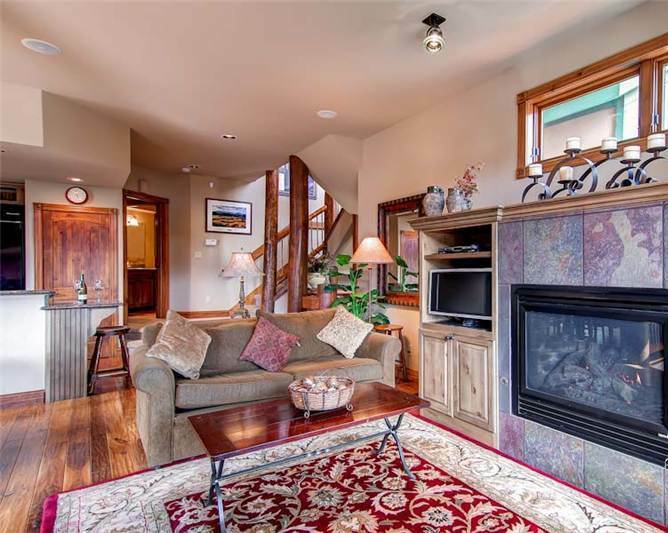 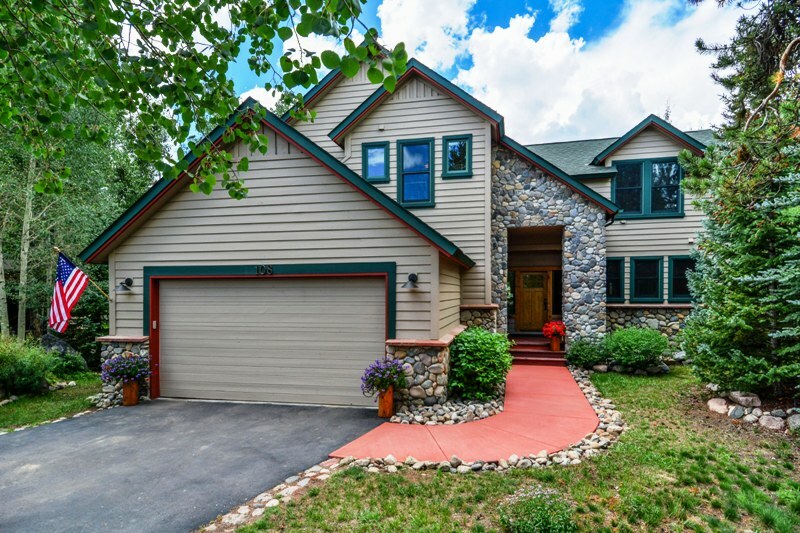 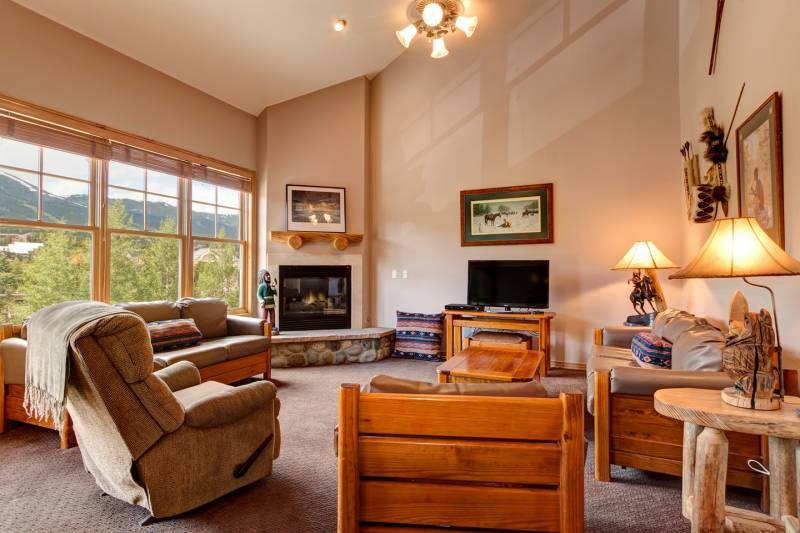 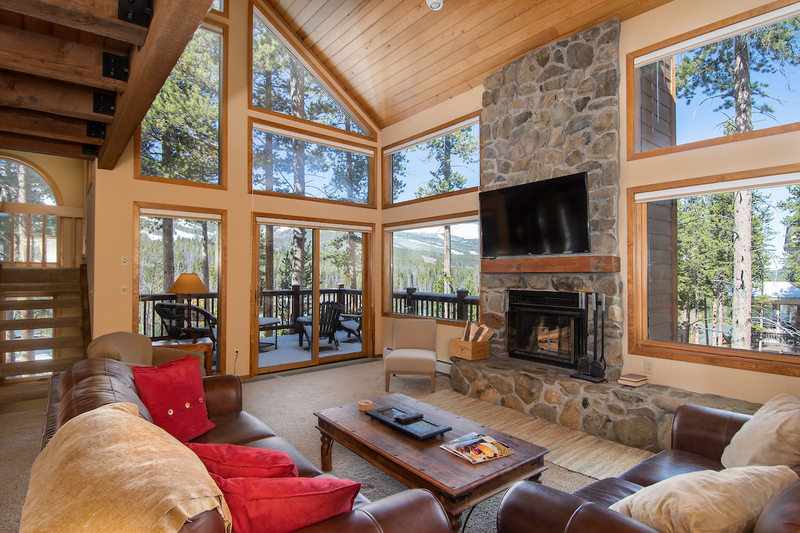 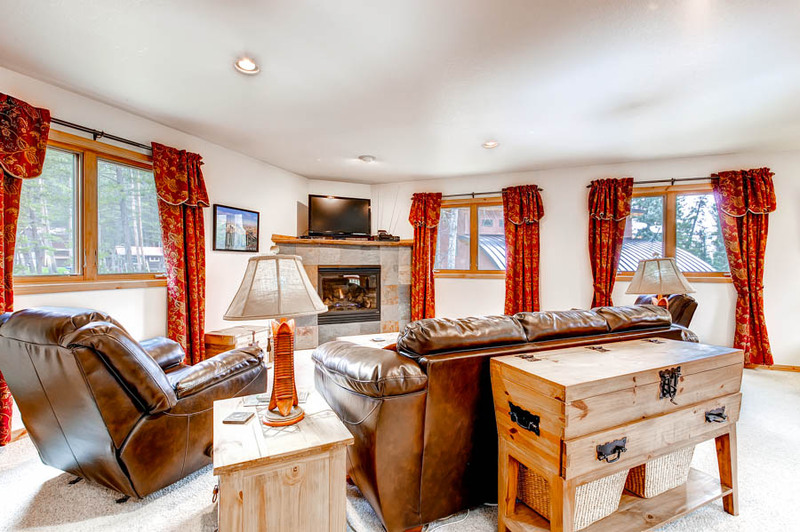 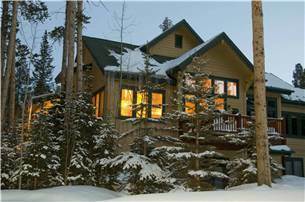 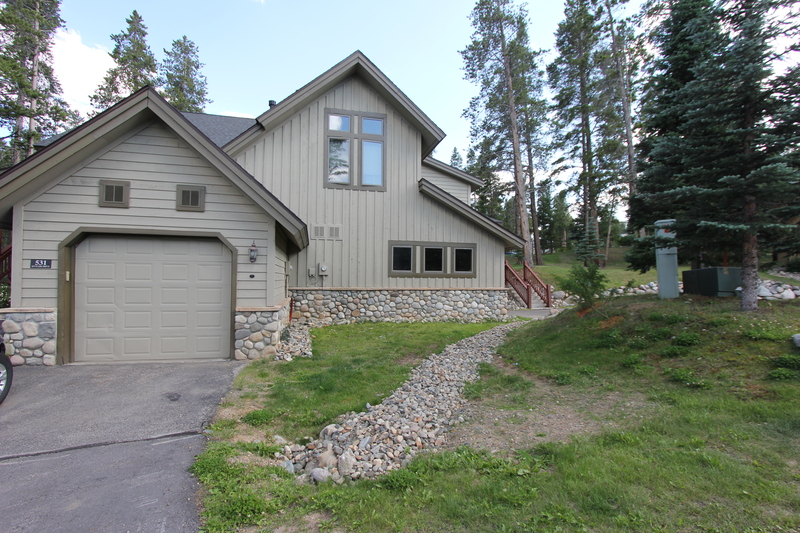 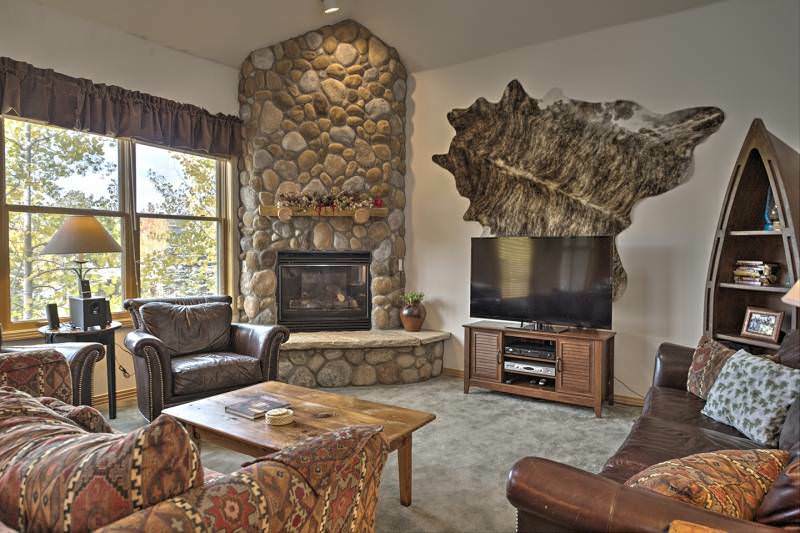 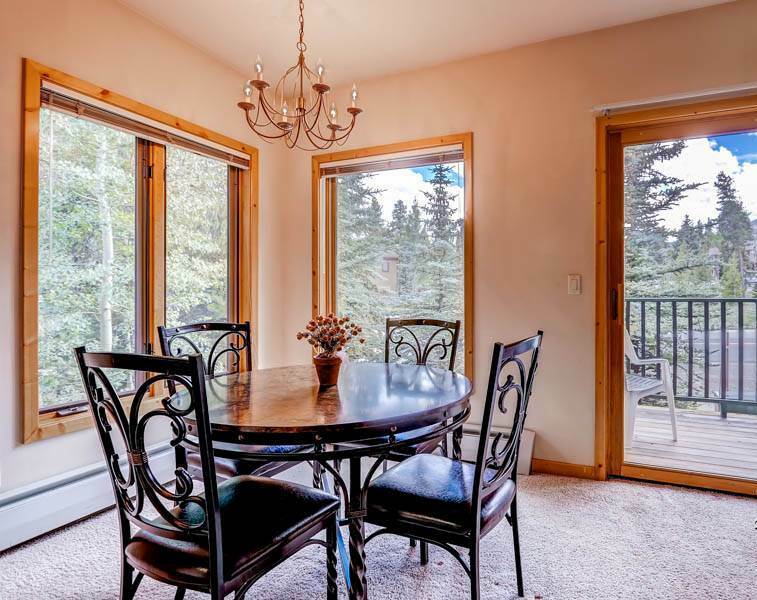 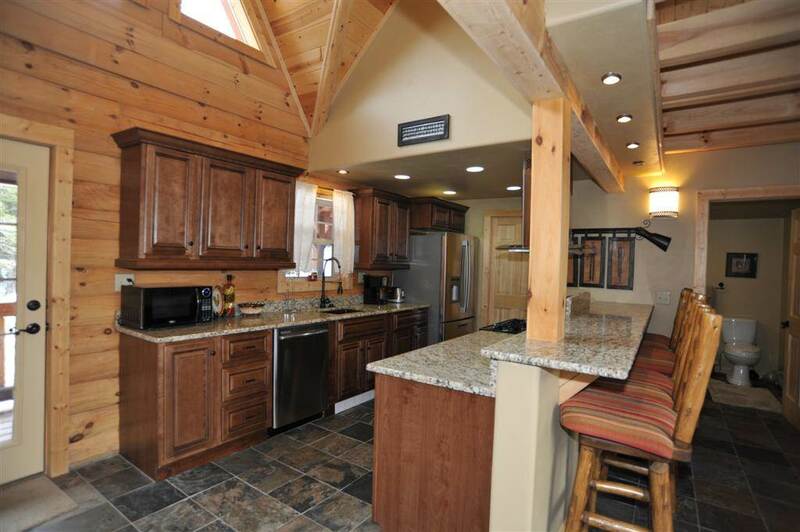 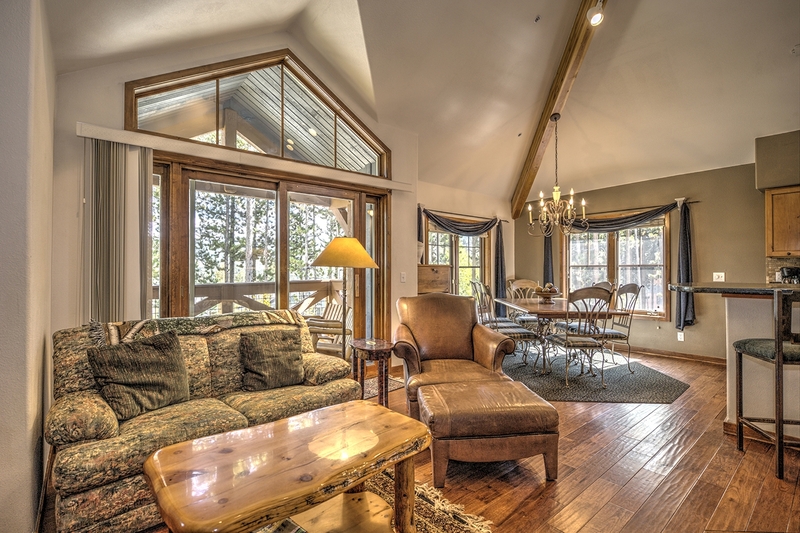 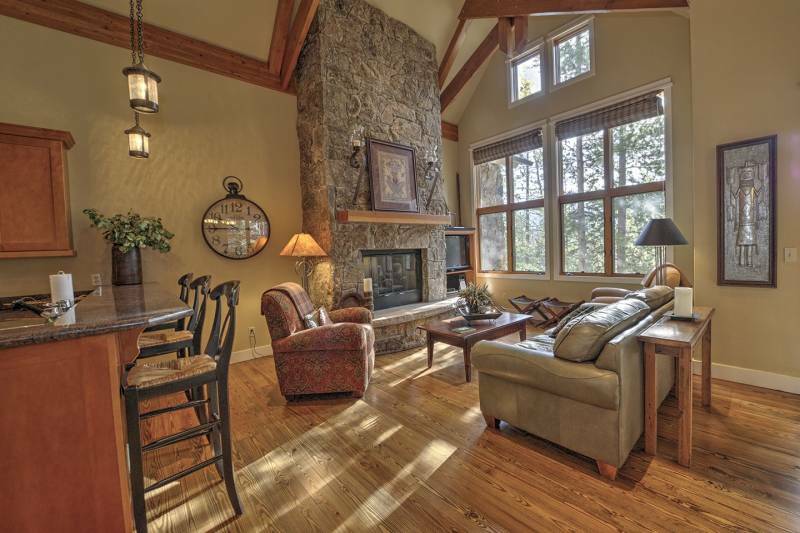 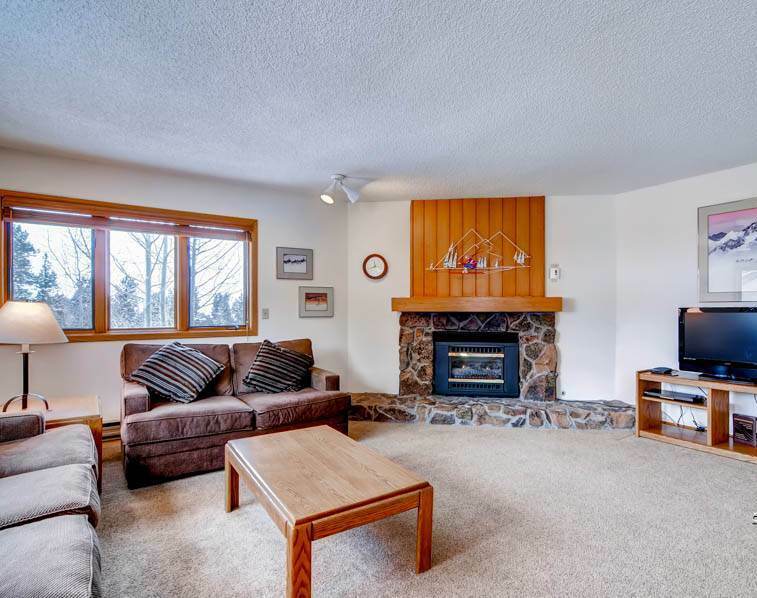 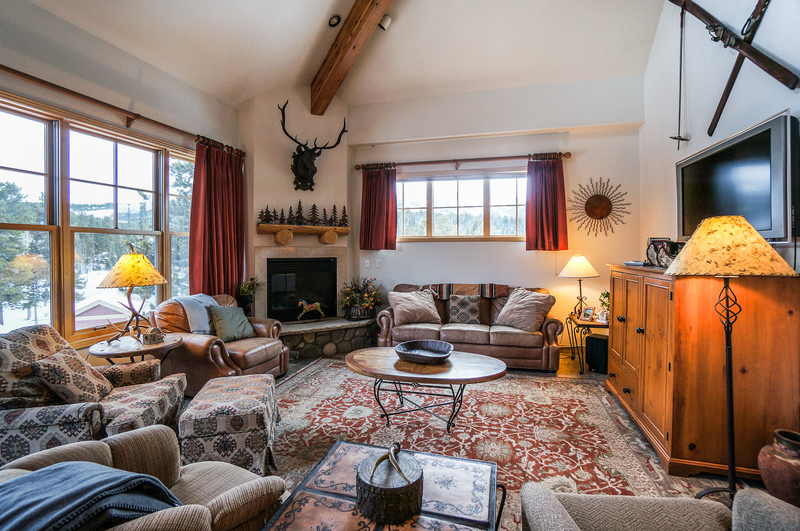 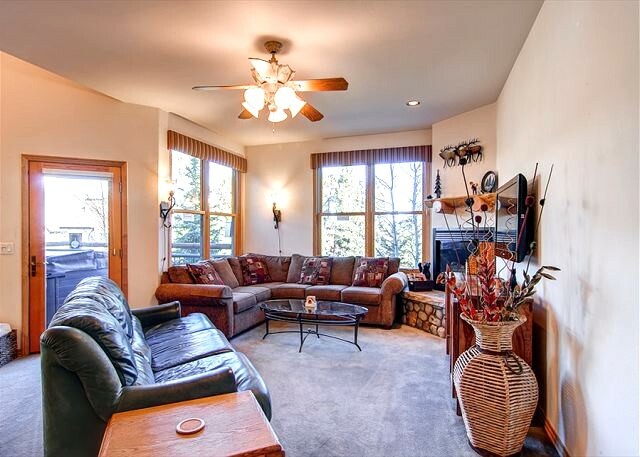 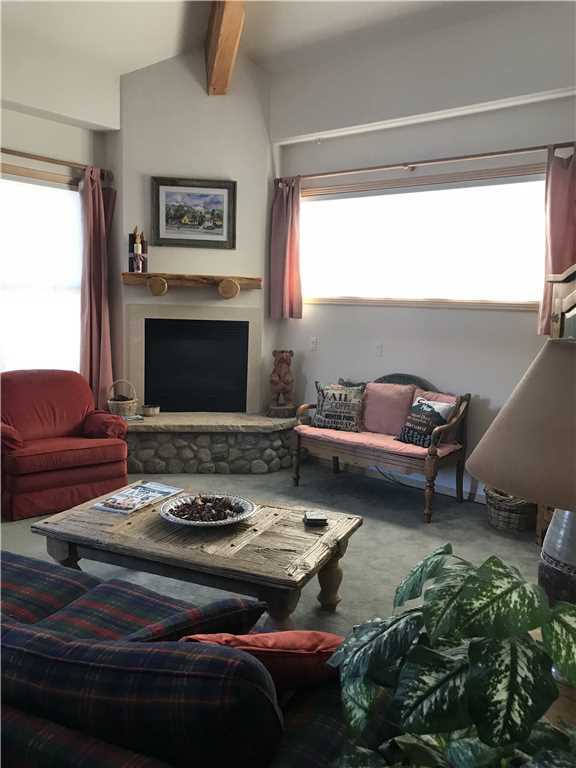 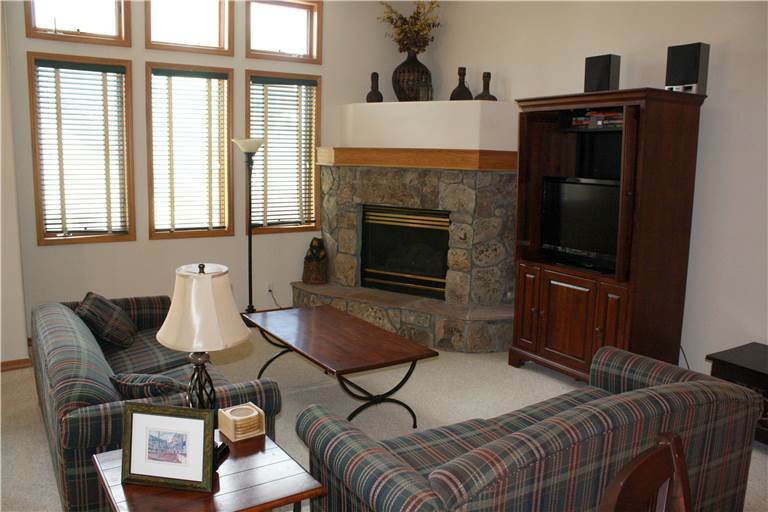 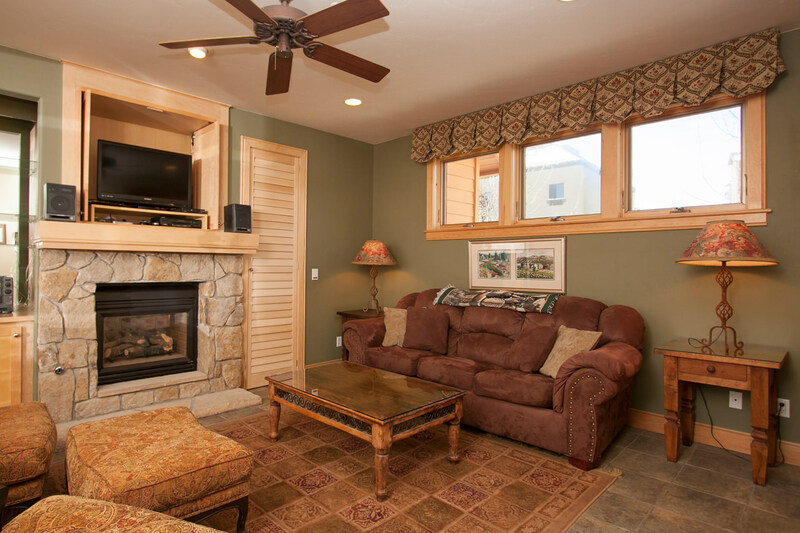 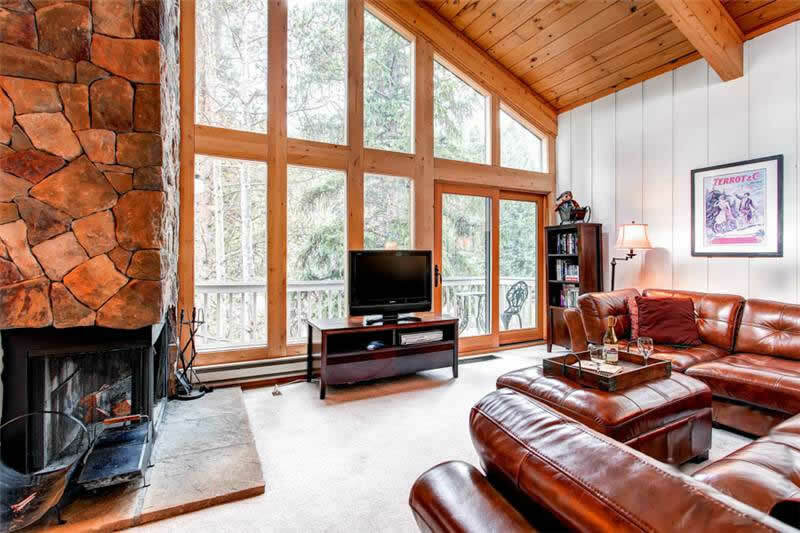 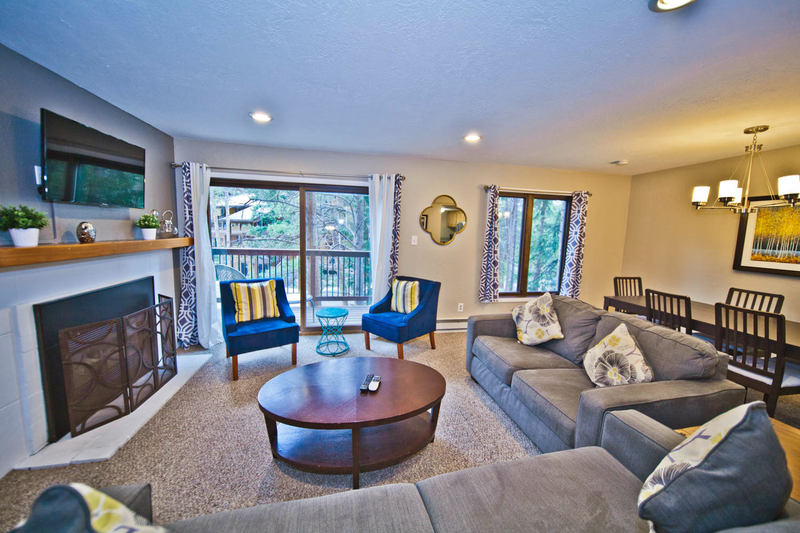 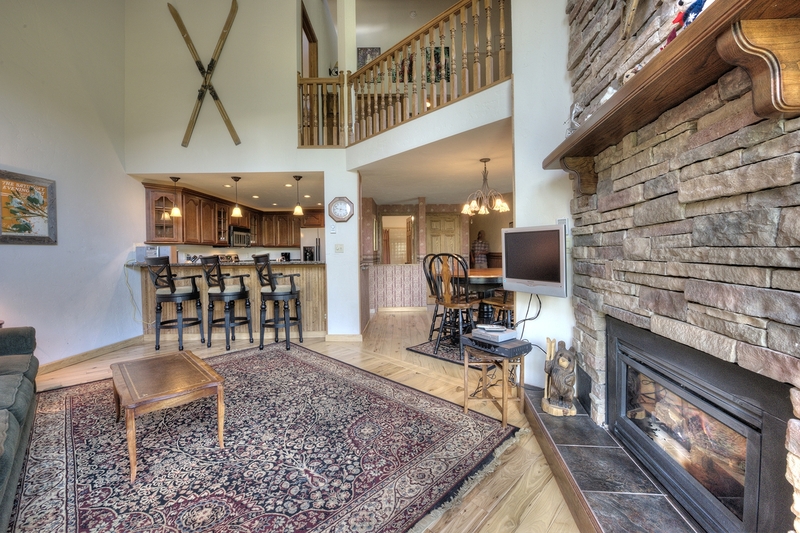 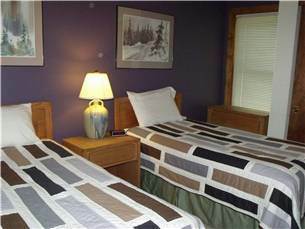 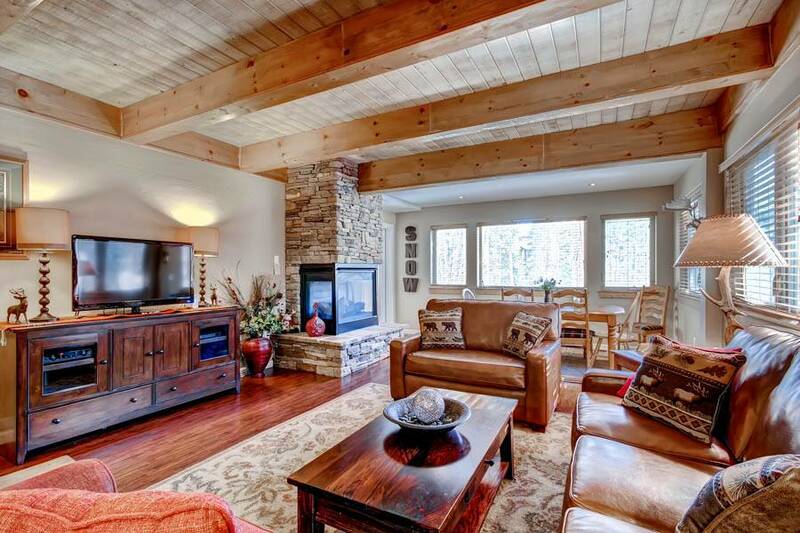 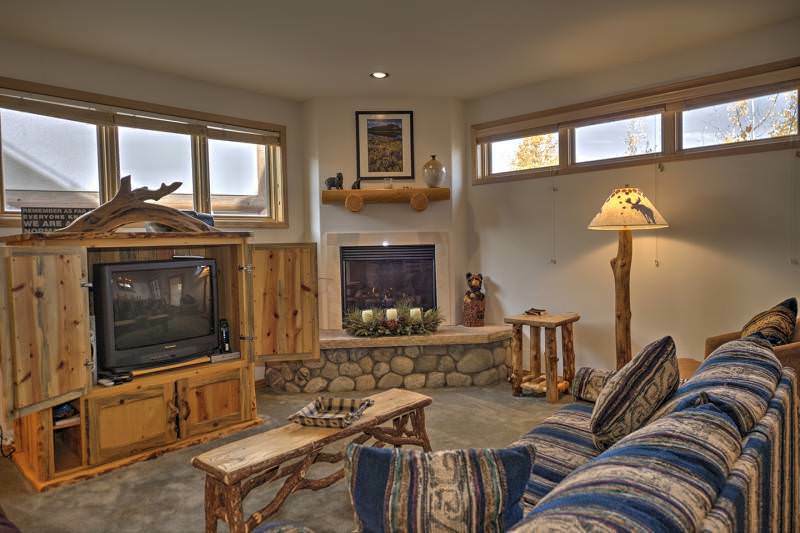 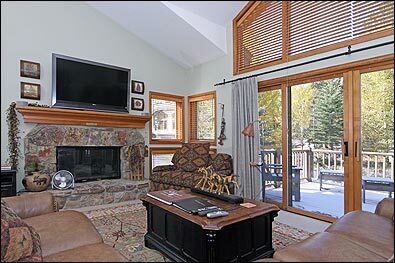 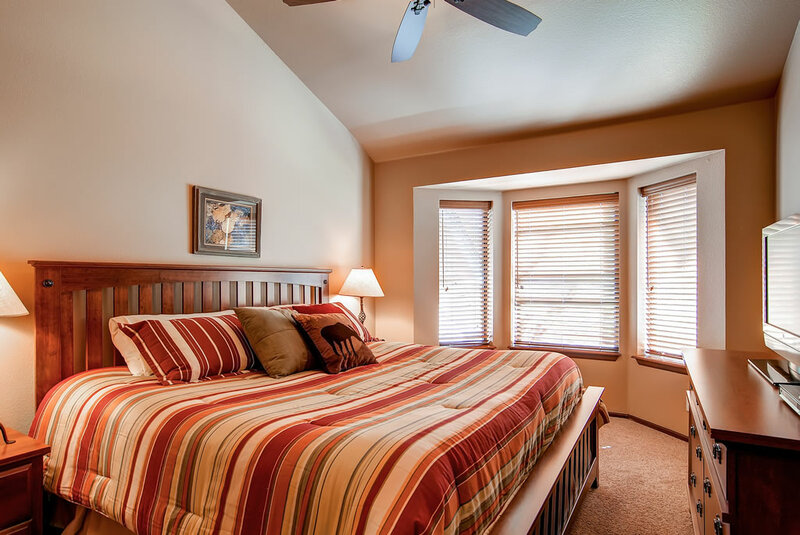 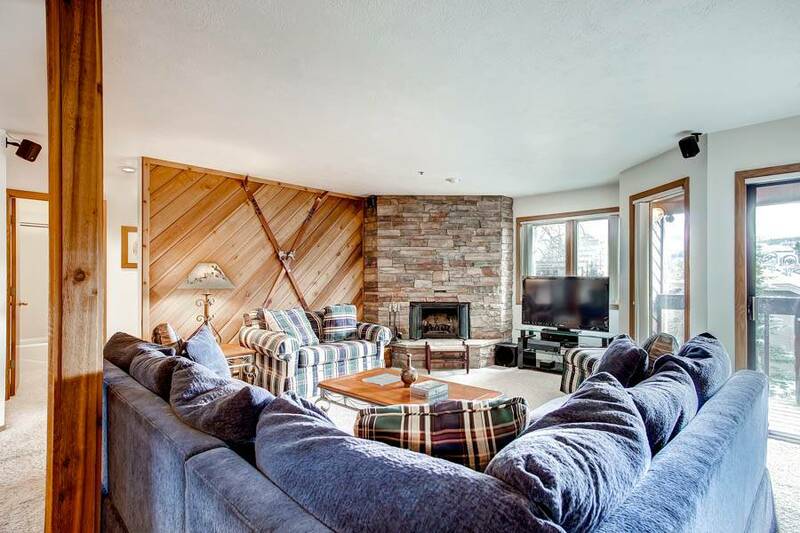 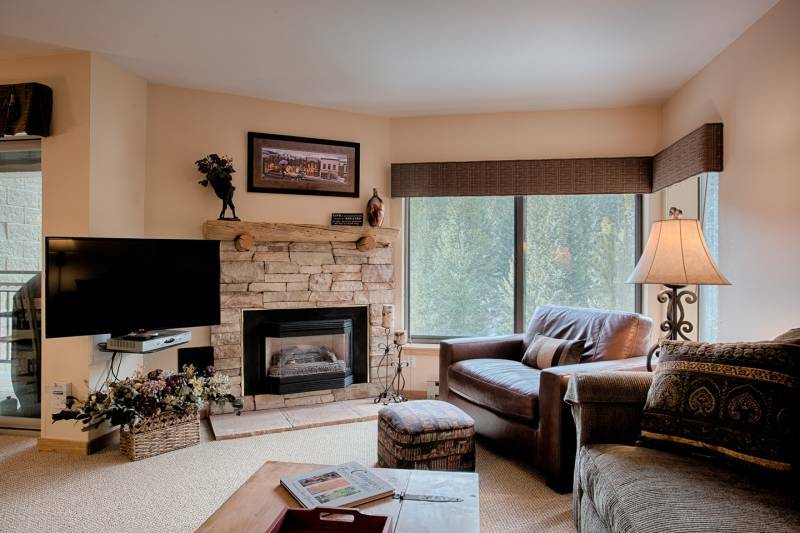 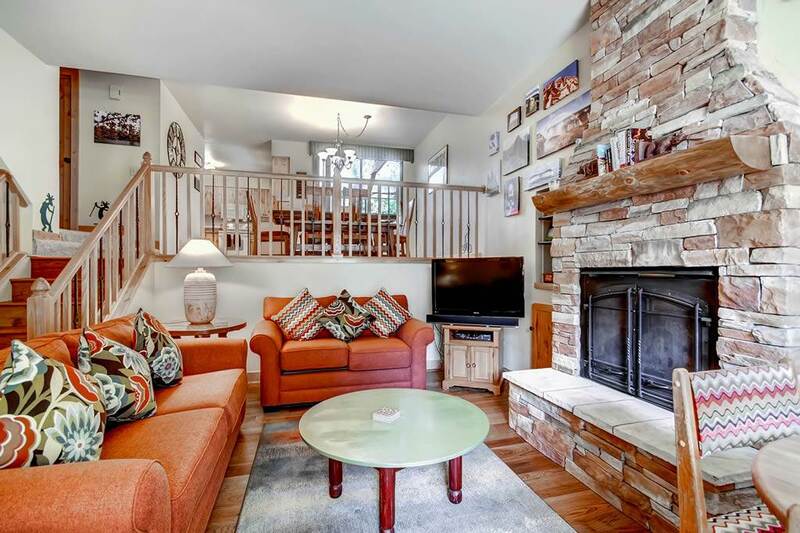 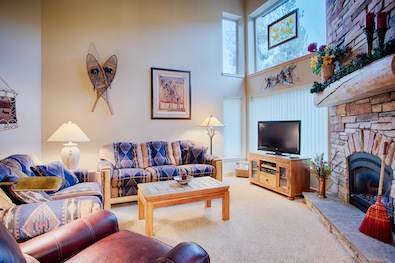 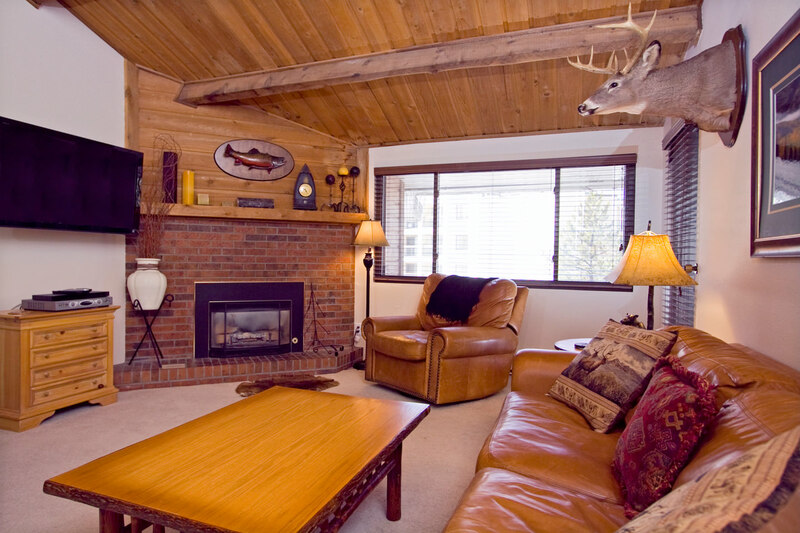 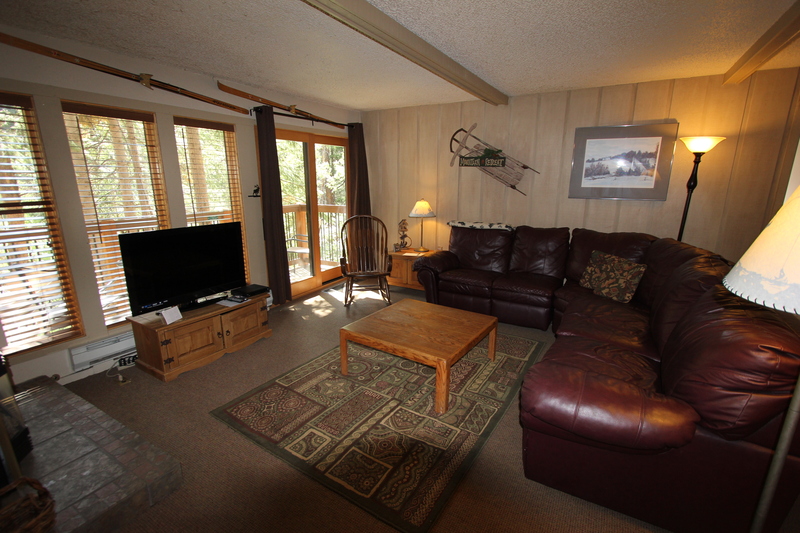 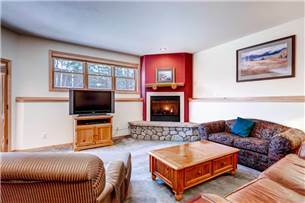 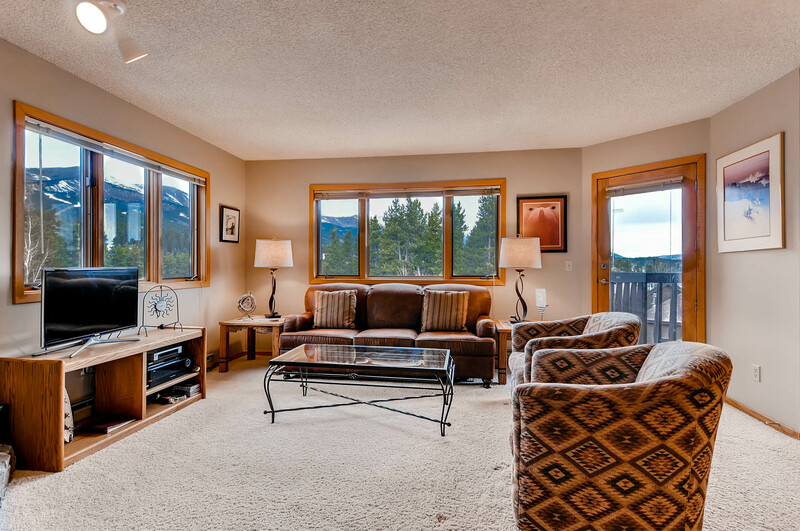 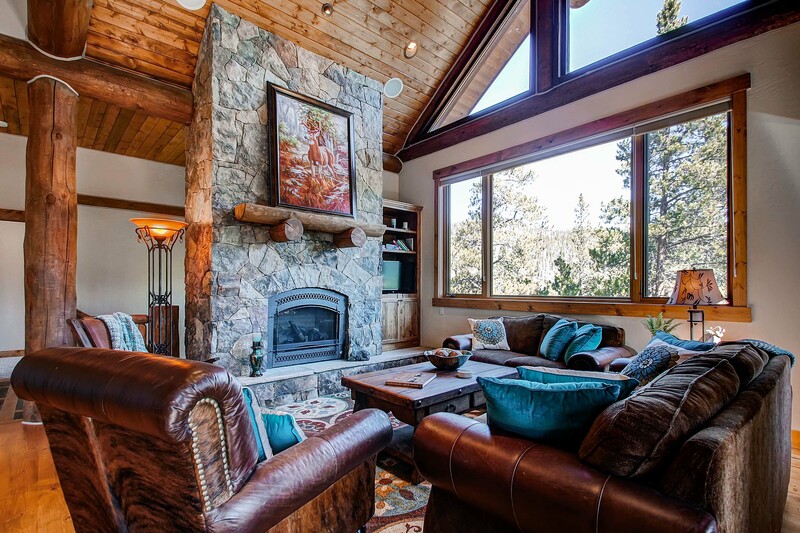 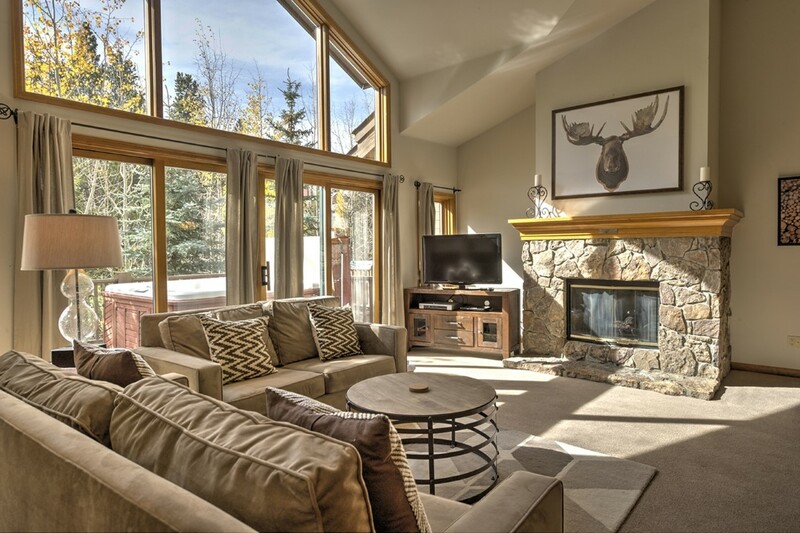 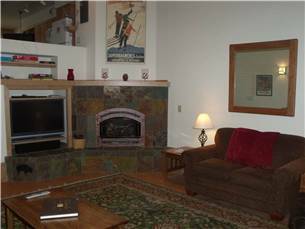 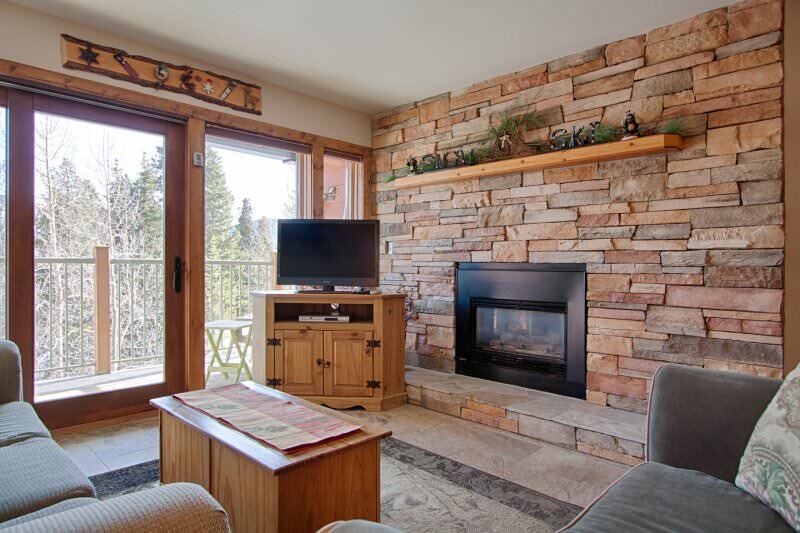 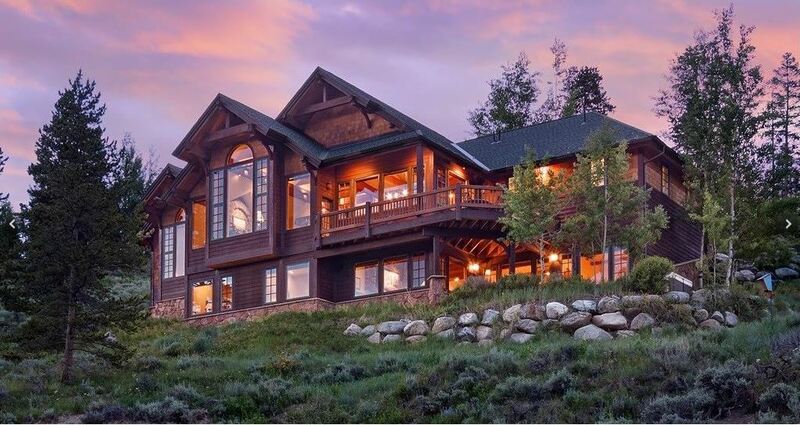 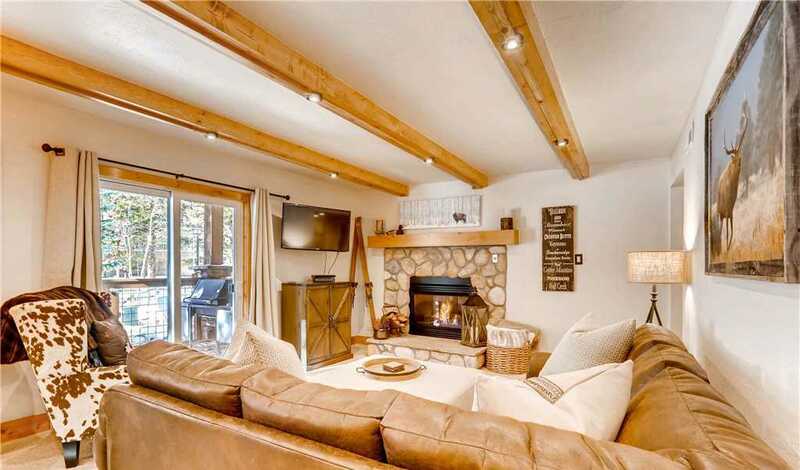 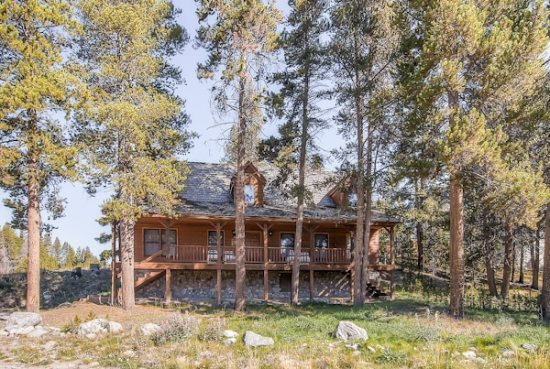 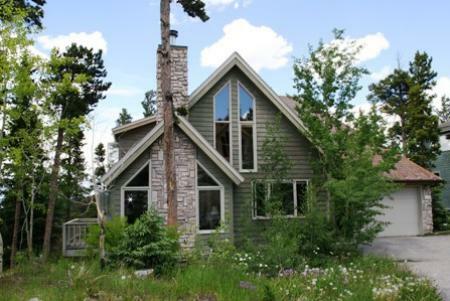 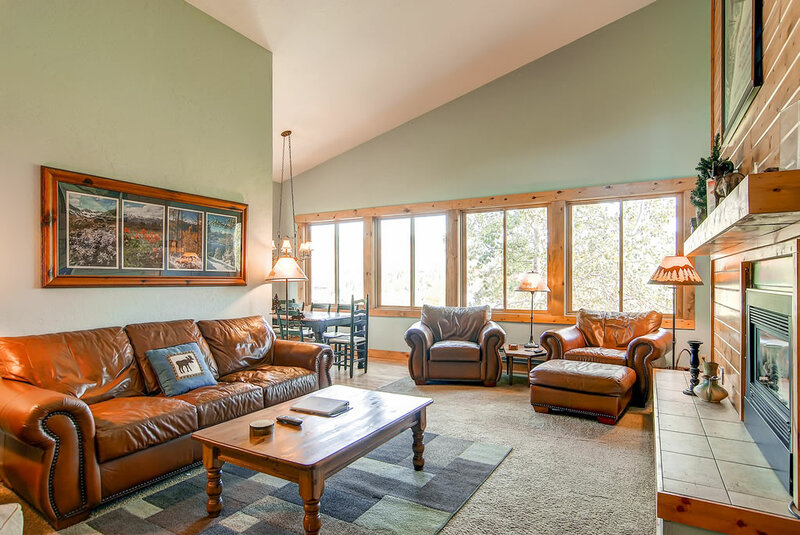 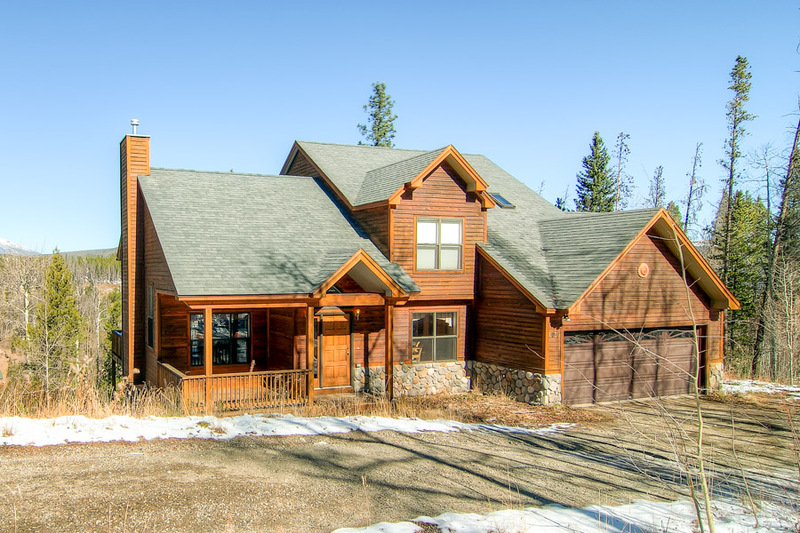 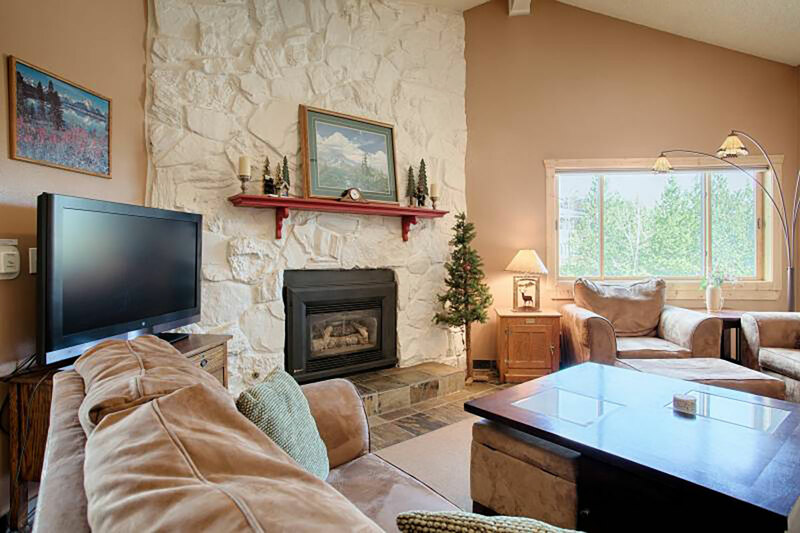 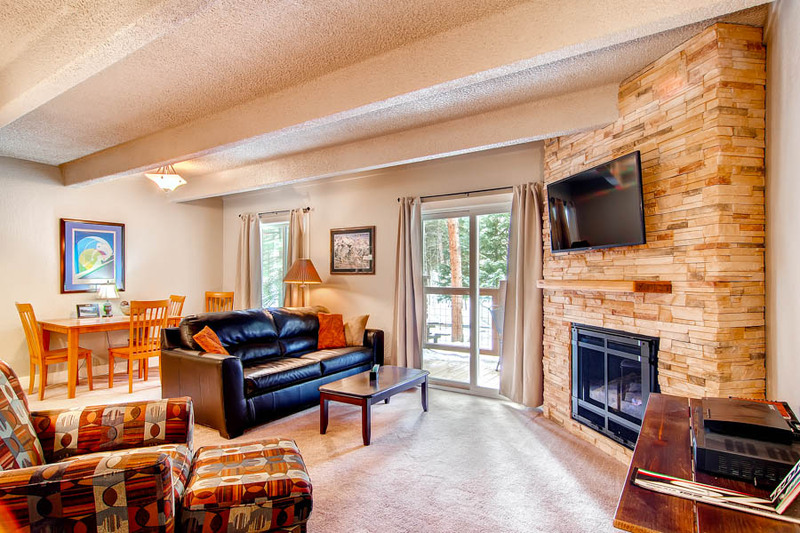 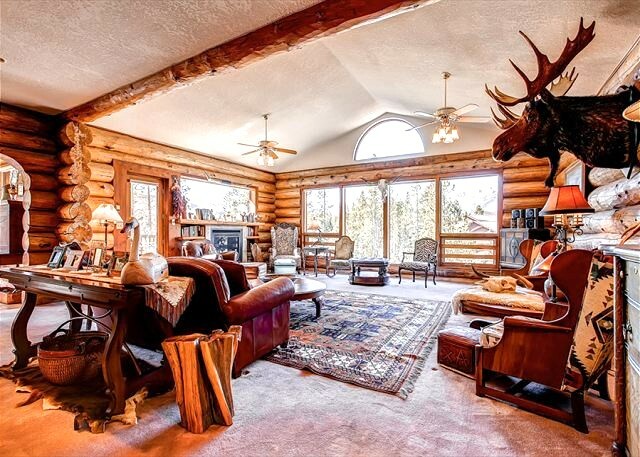 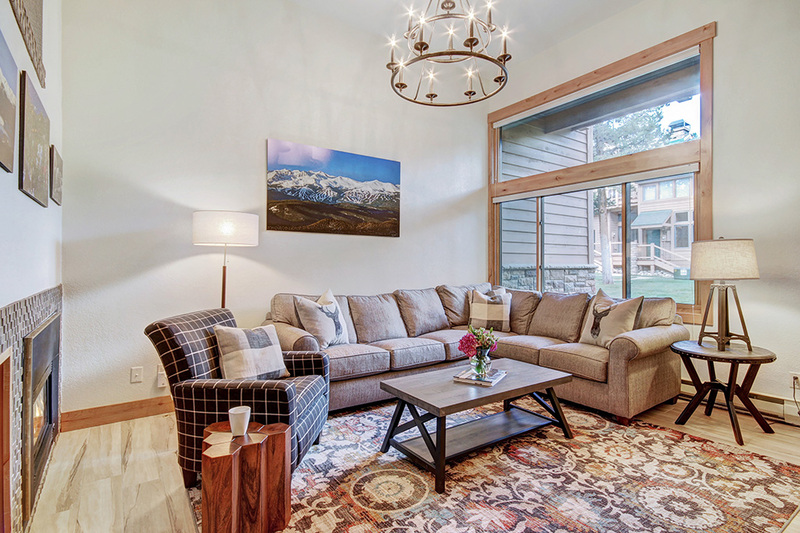 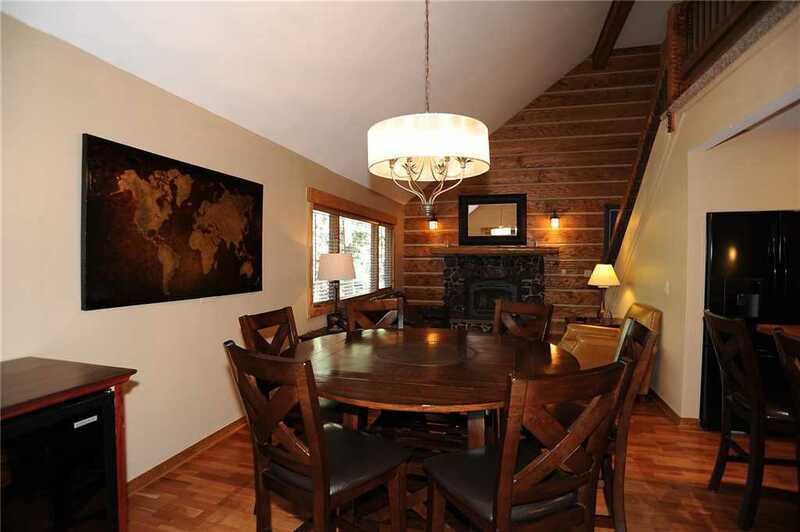 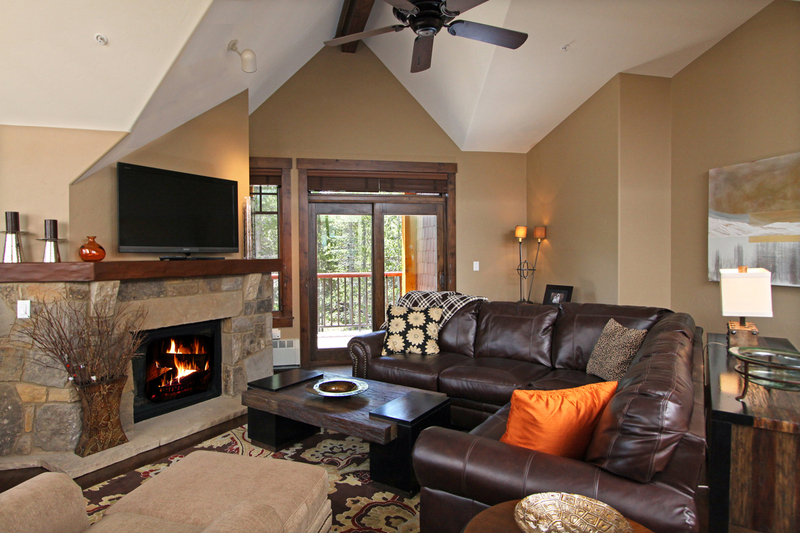 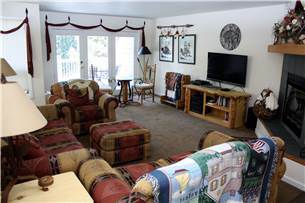 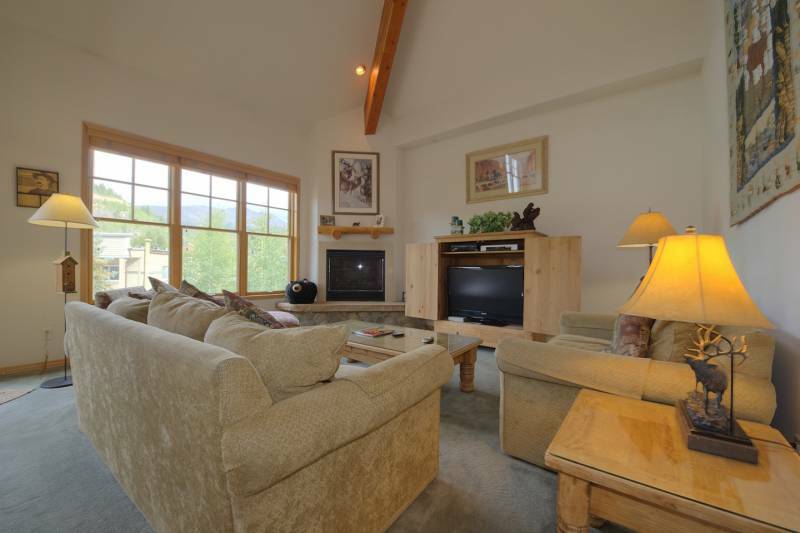 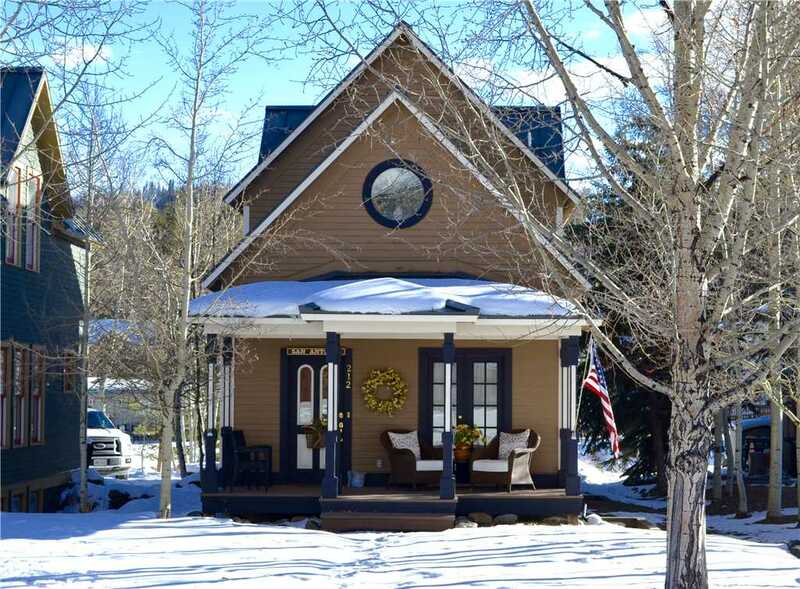 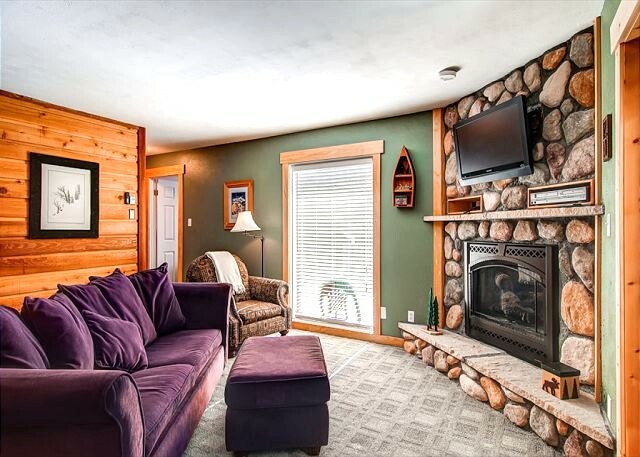 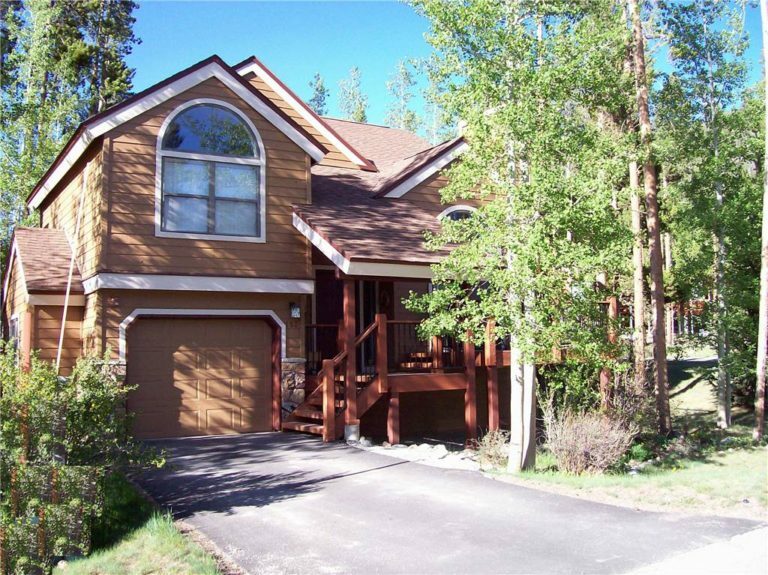 This adorable retreat also supplies ready access to the Sawmill Creek Trail across the street and is just a short drive to many other fine hiking trails, Gold Medal fly fishing lakes and streams, sailing on Lake Dillon, or golfing in Silverthorne, Breckenridge, Keystone, and Copper Mountain. 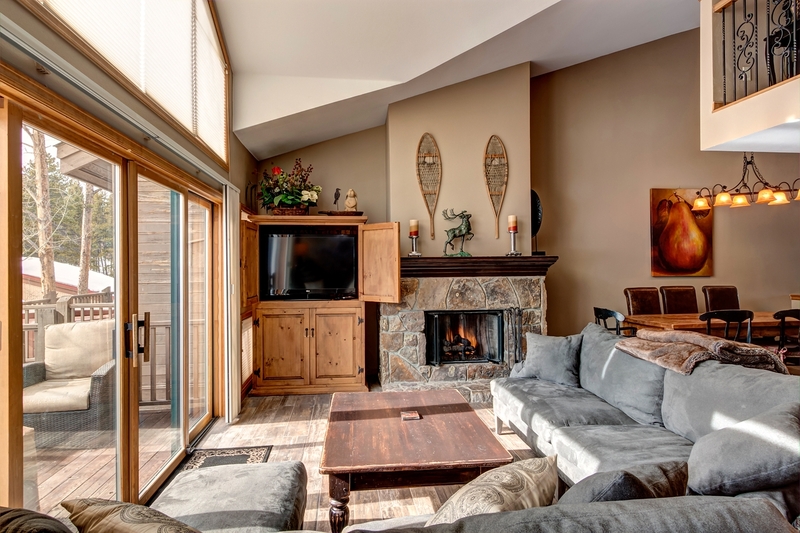 The main entrance of The Tyra Lookout leads you into an open floor plan that is great for couples, small families, or groups of four. 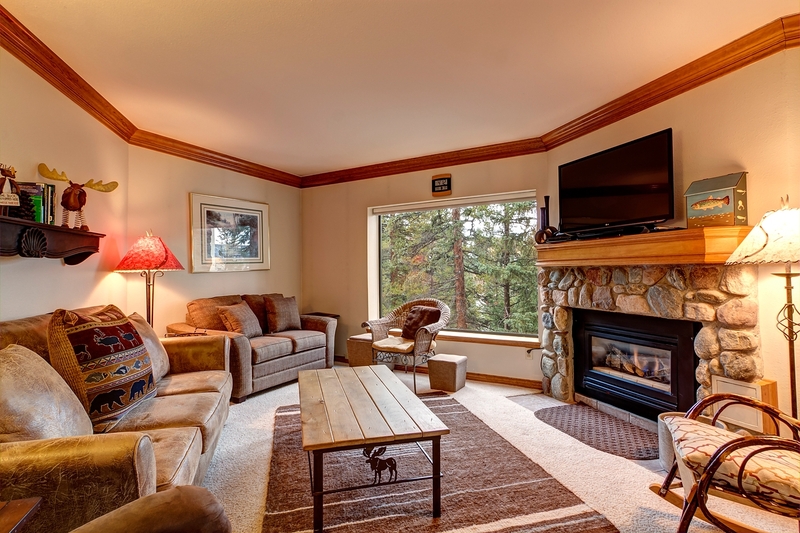 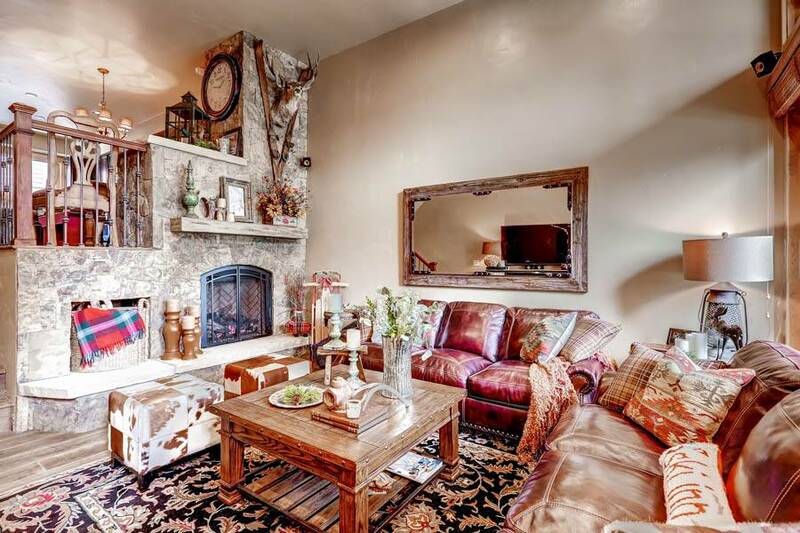 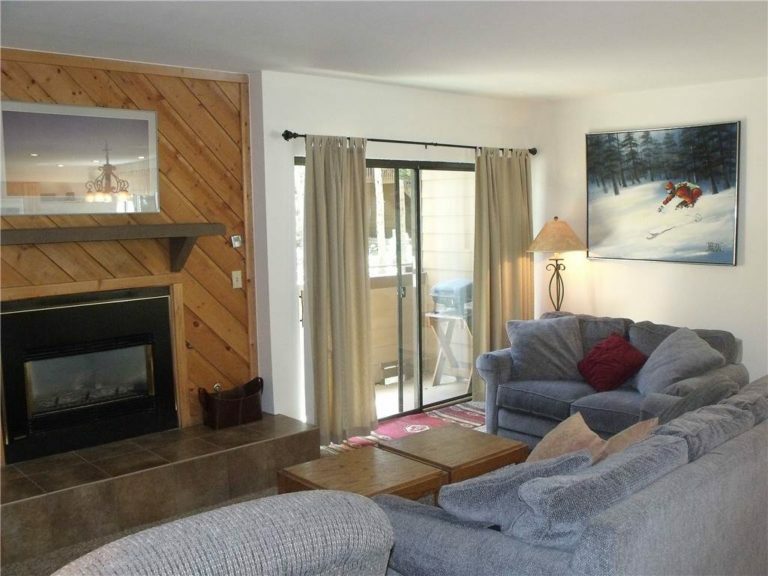 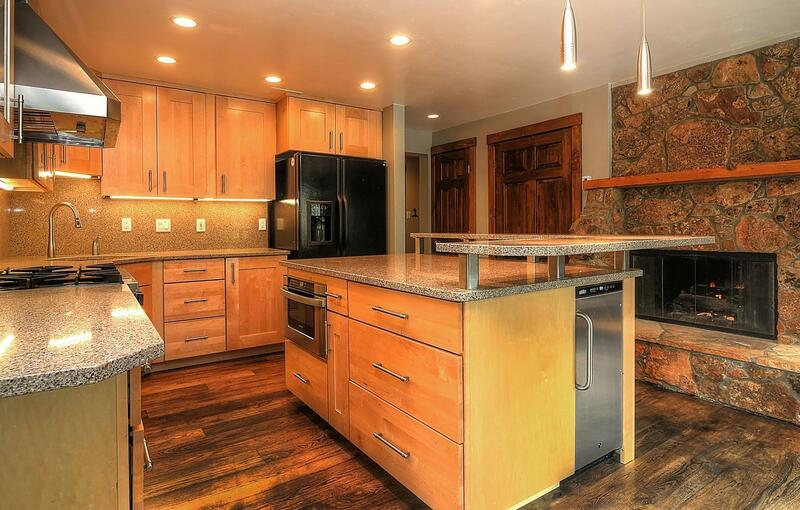 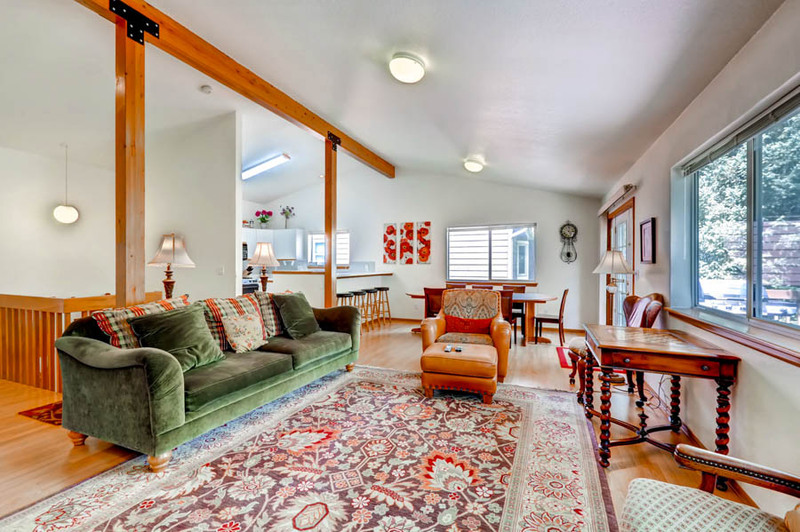 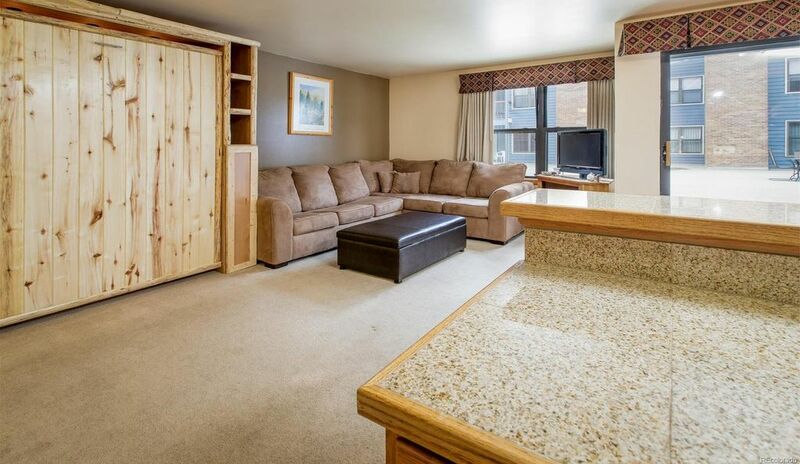 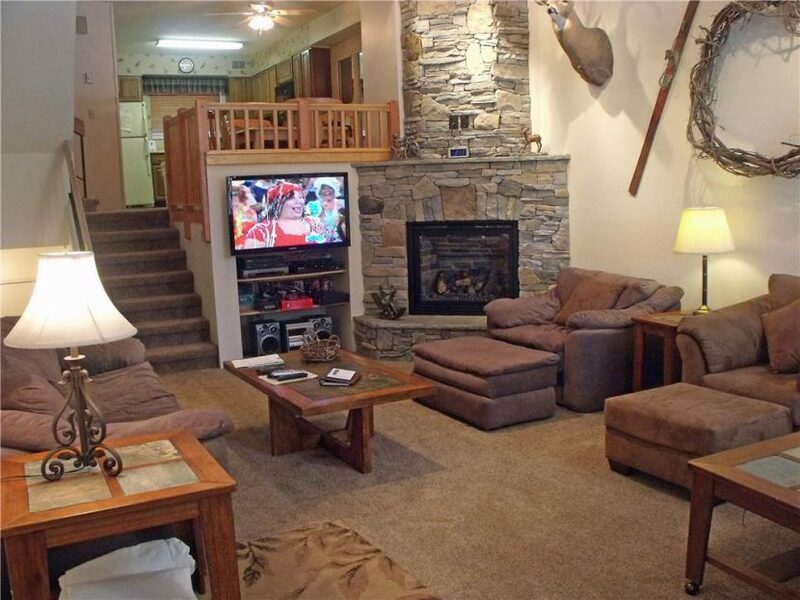 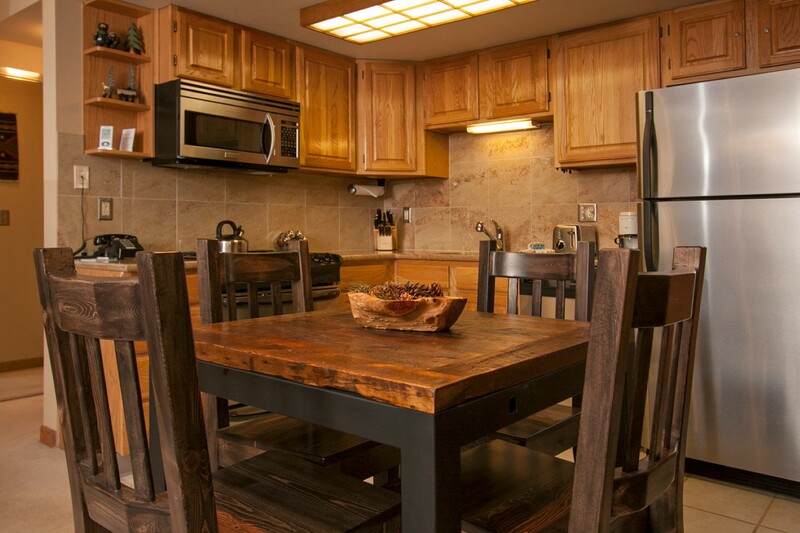 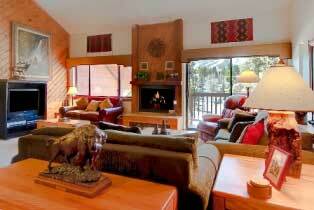 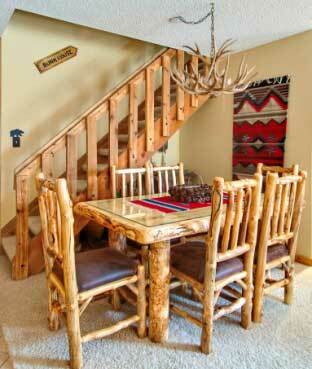 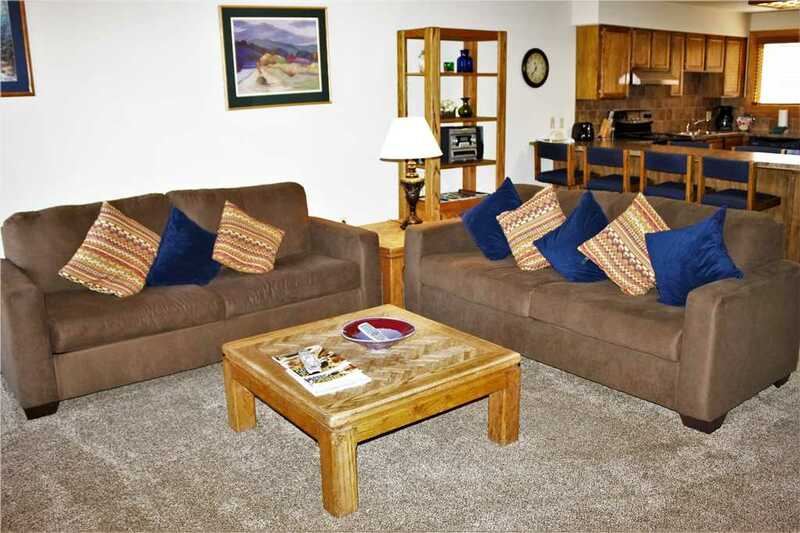 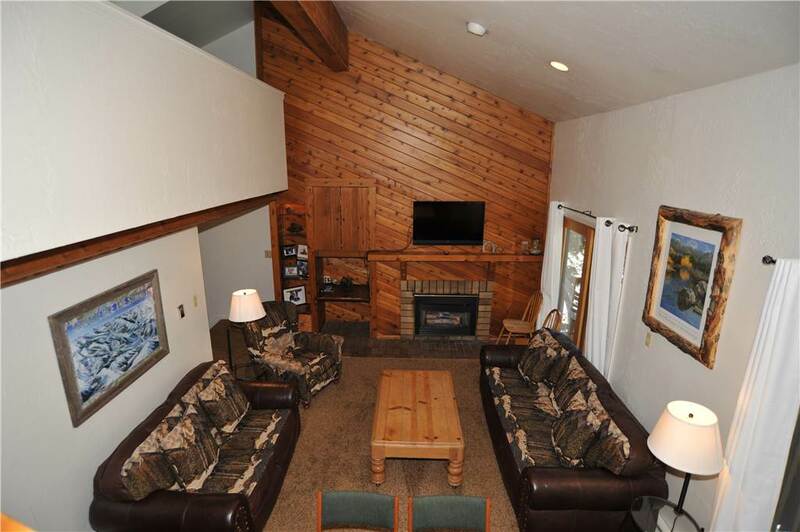 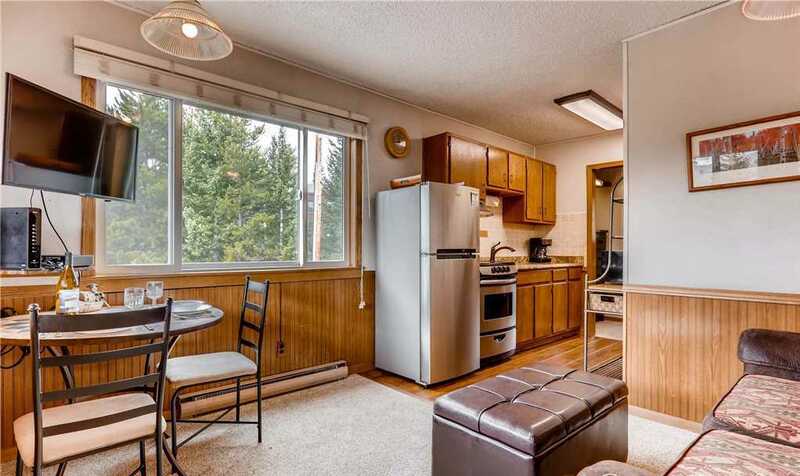 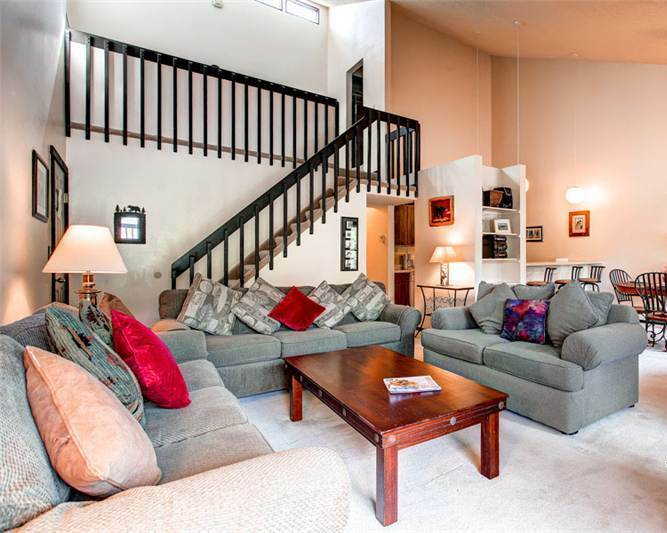 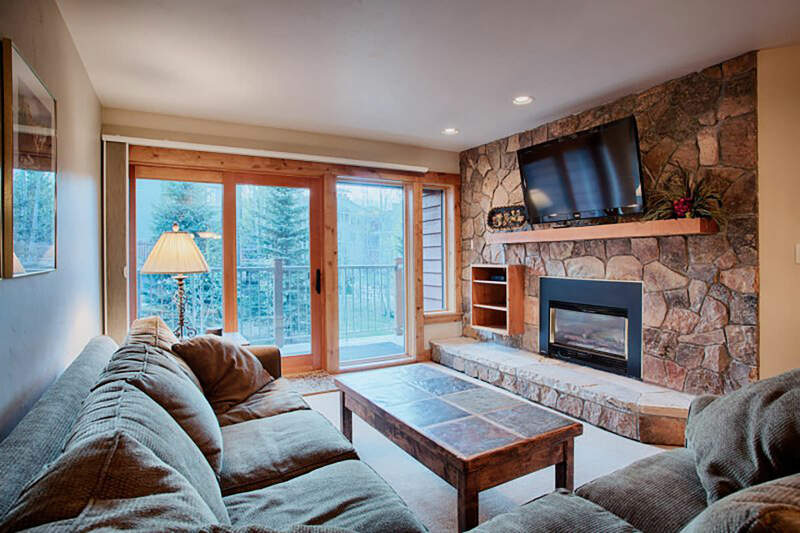 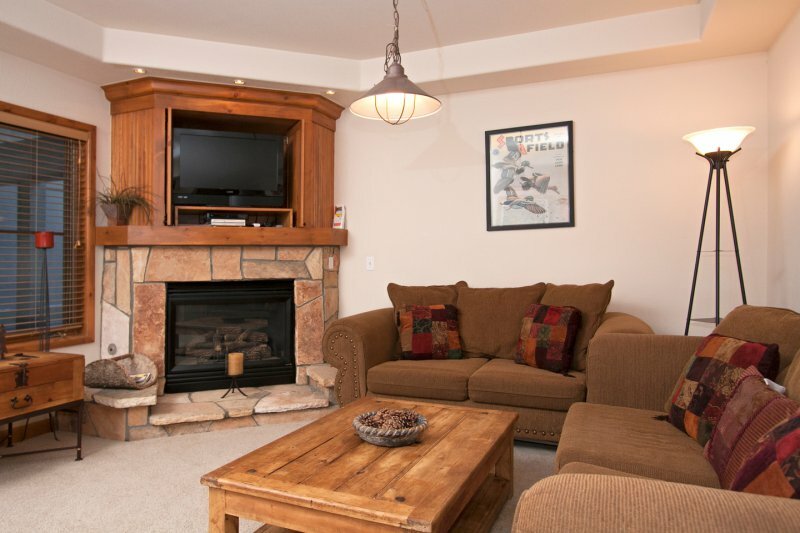 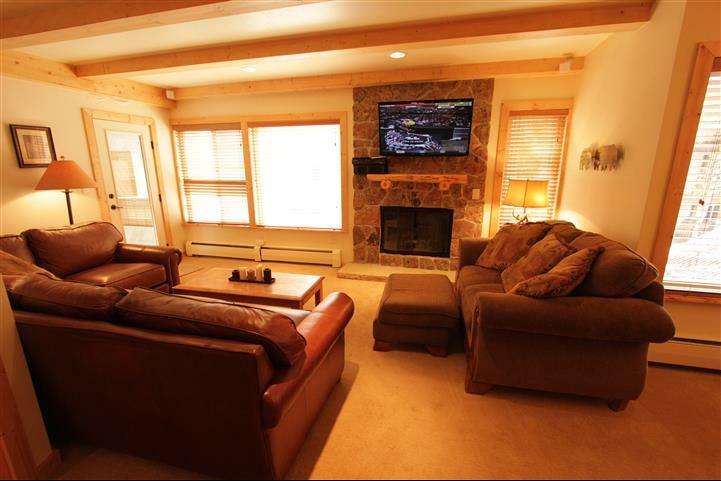 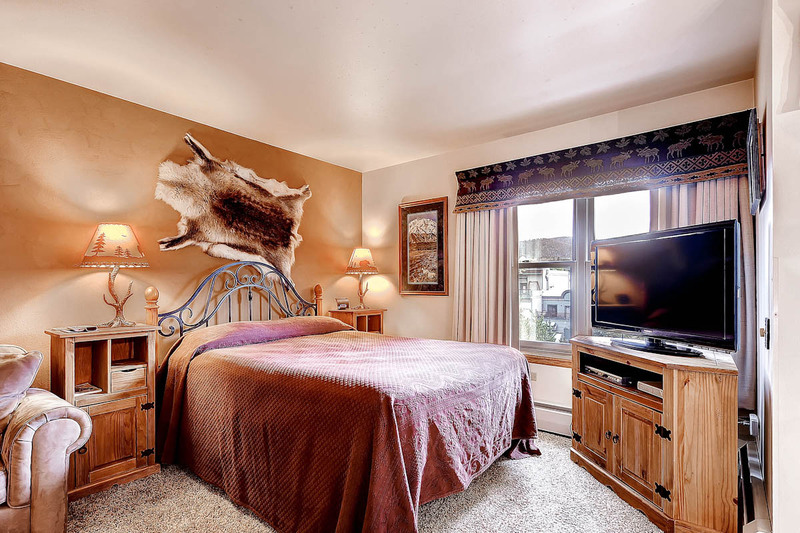 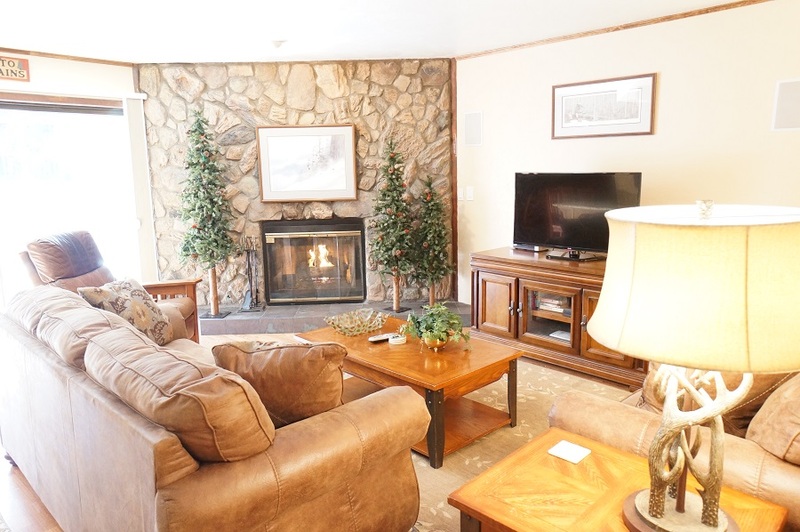 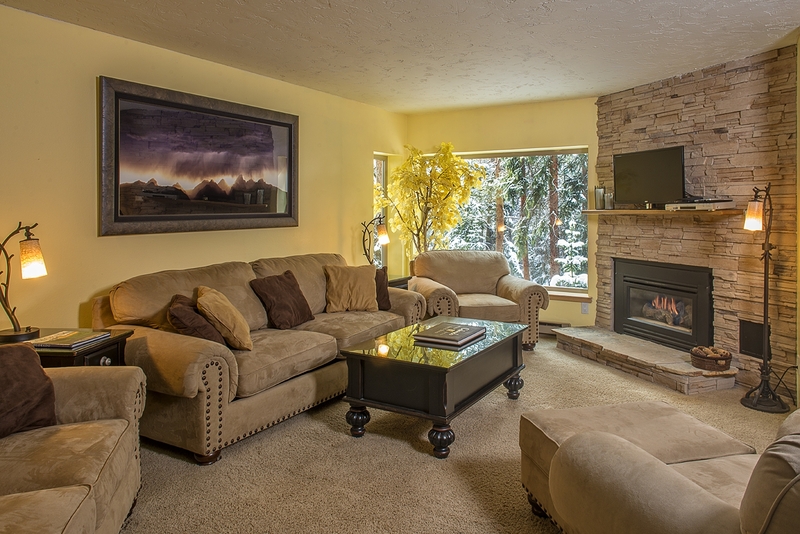 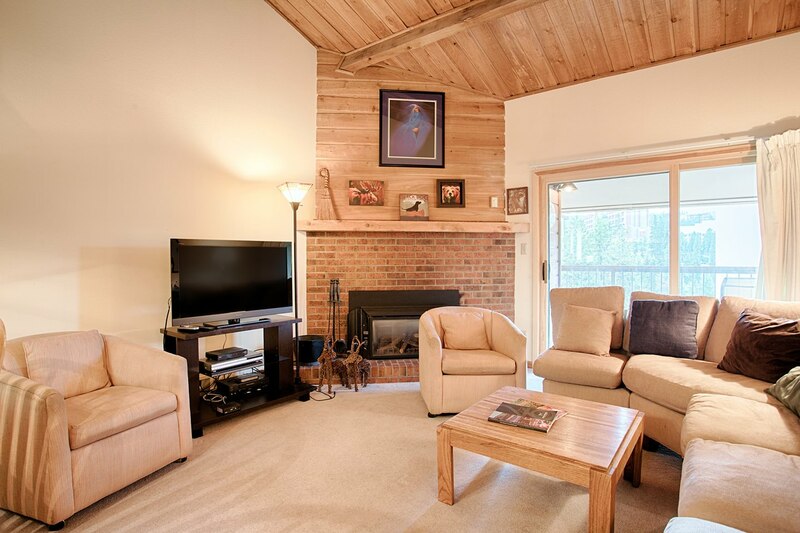 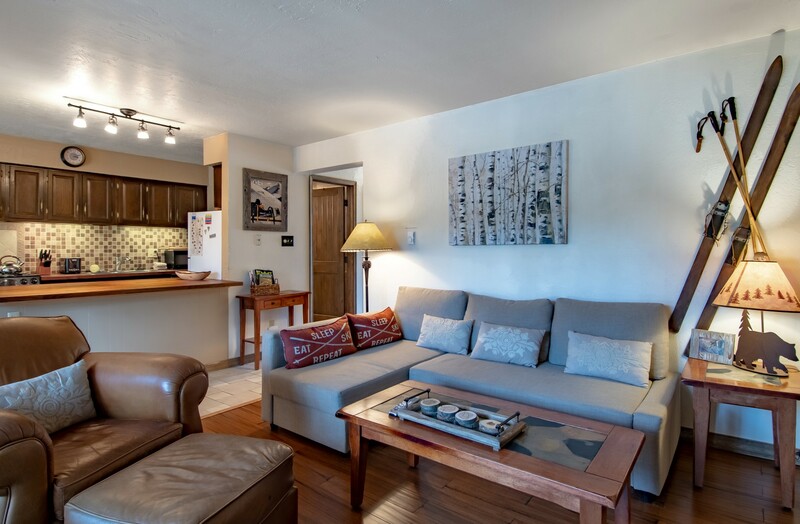 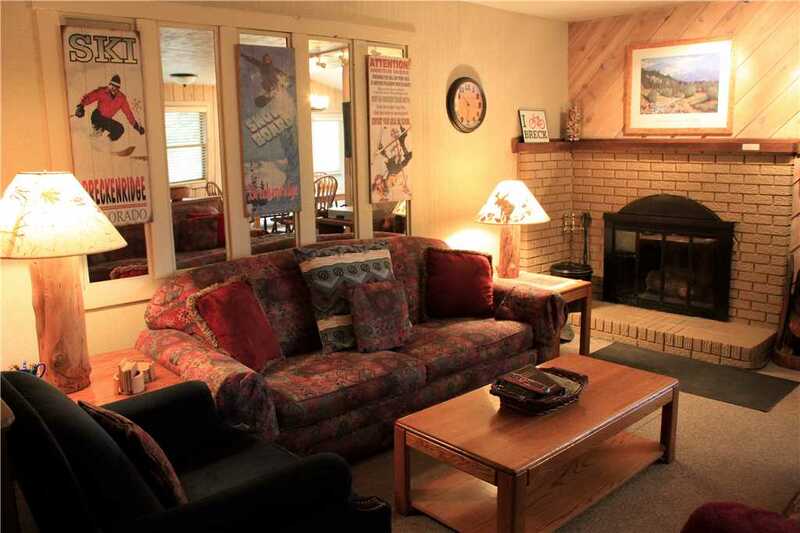 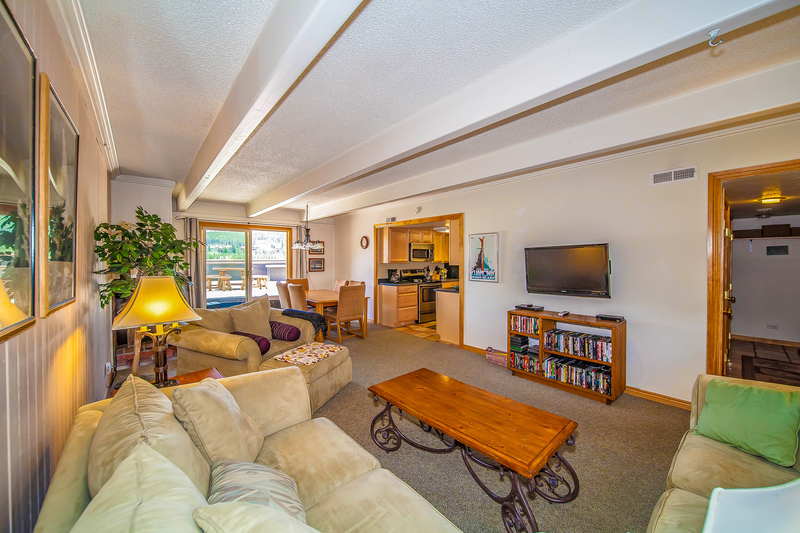 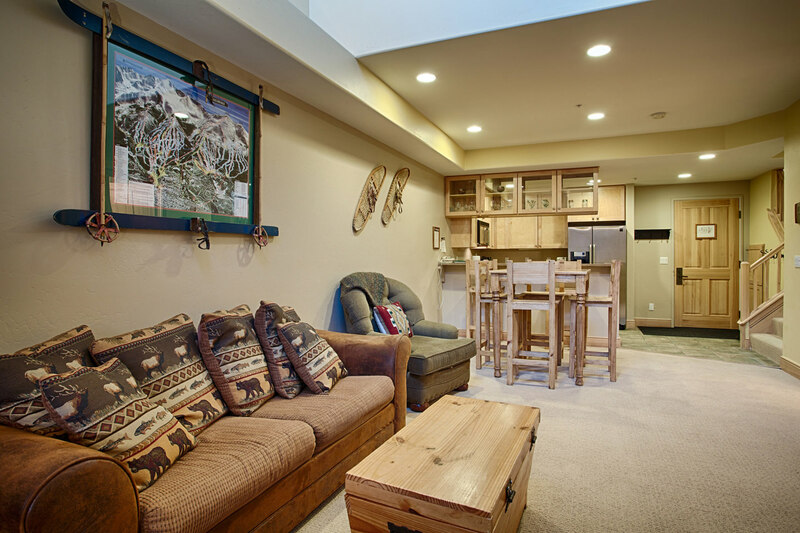 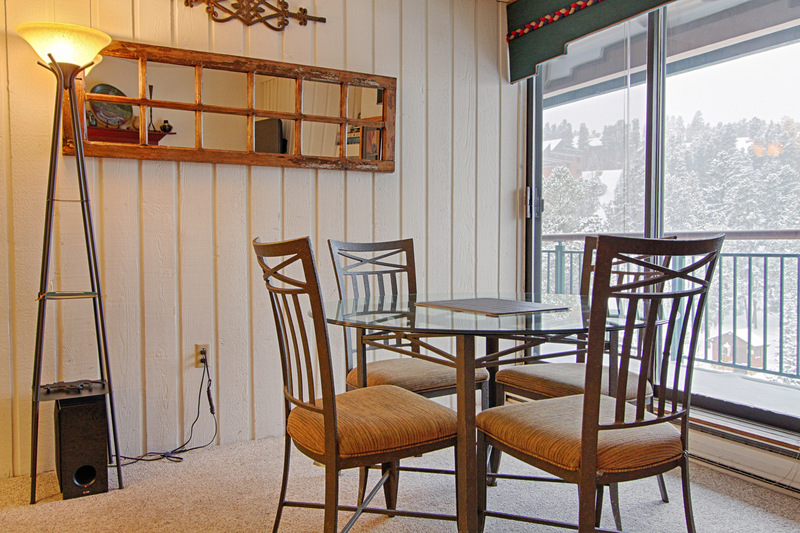 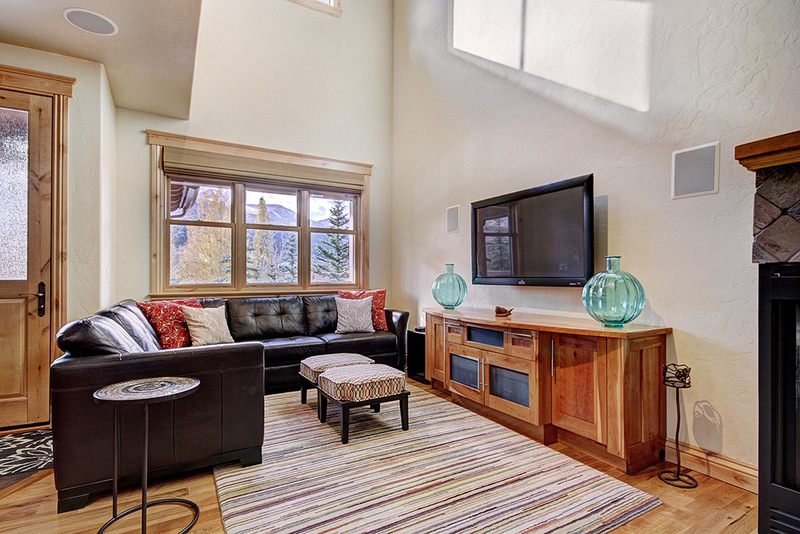 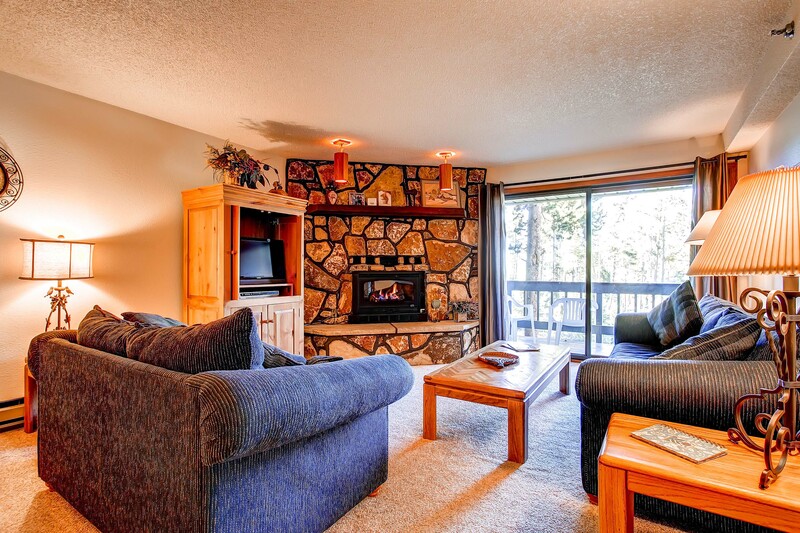 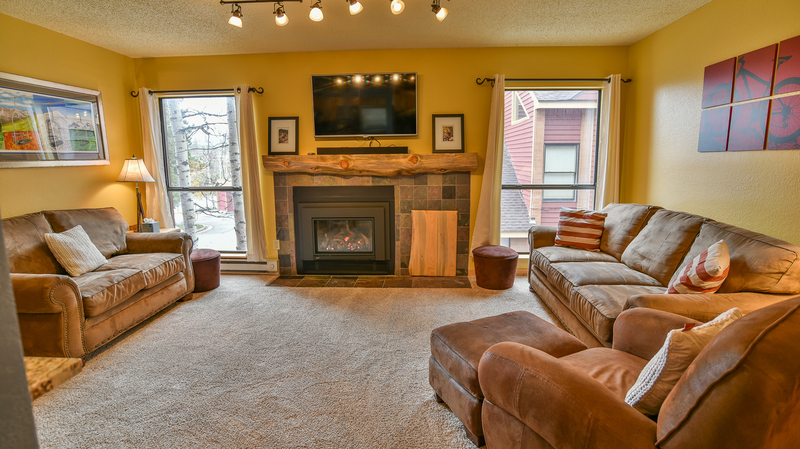 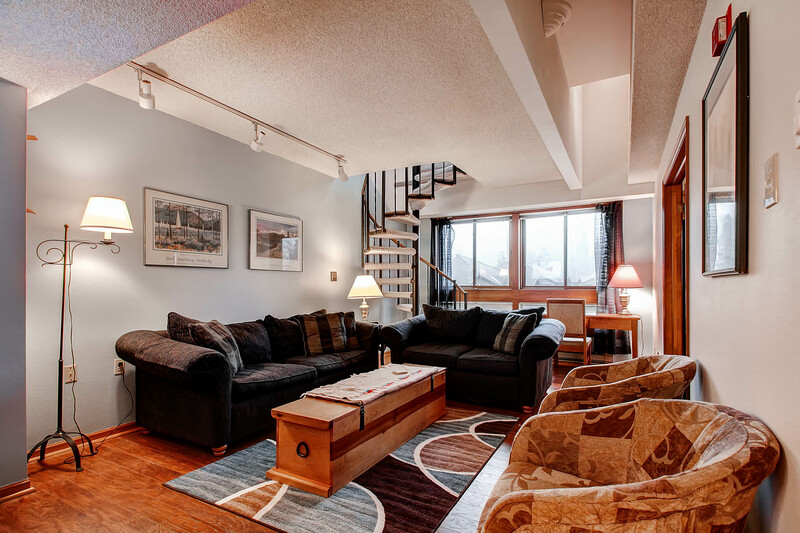 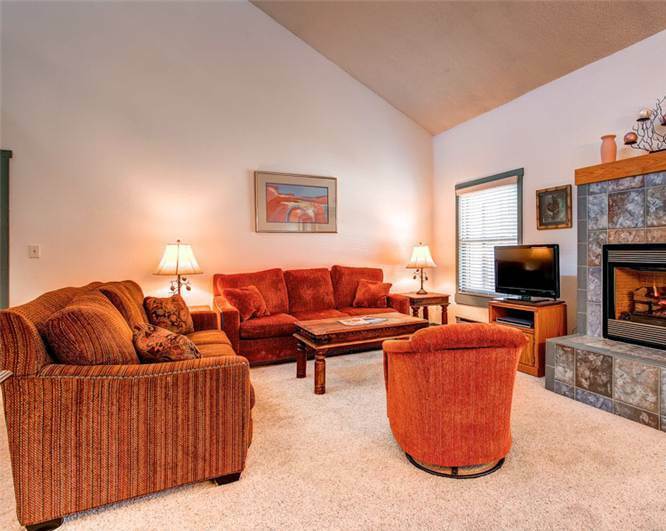 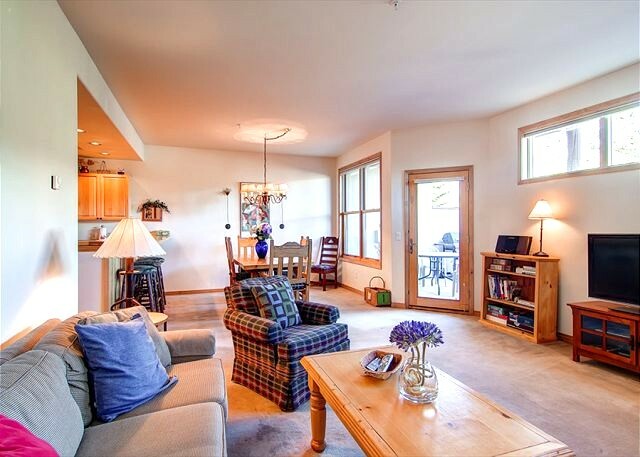 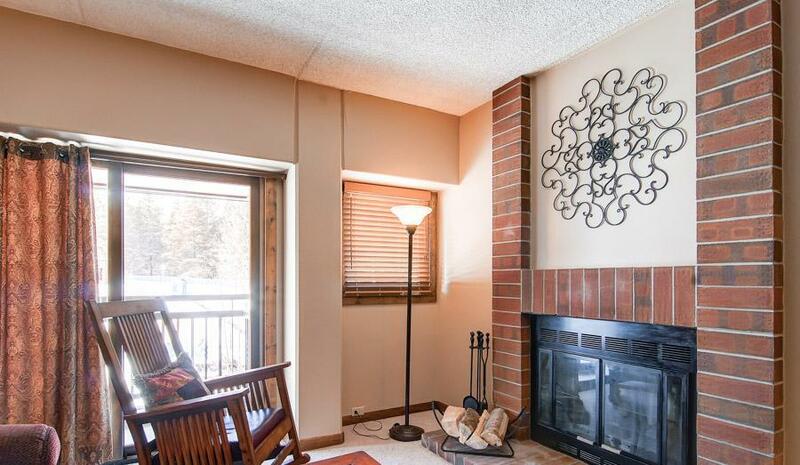 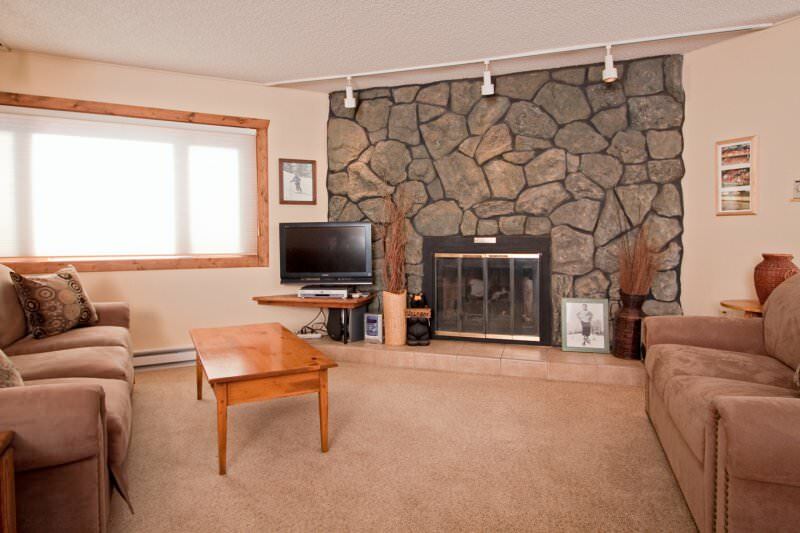 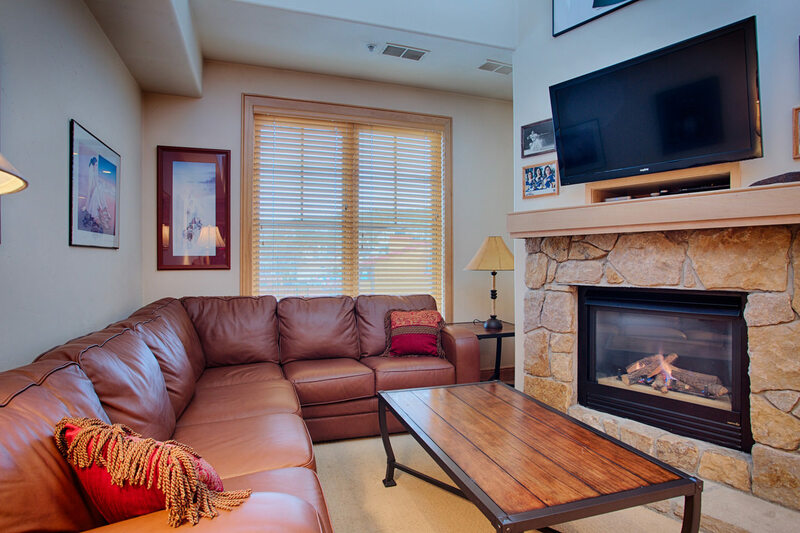 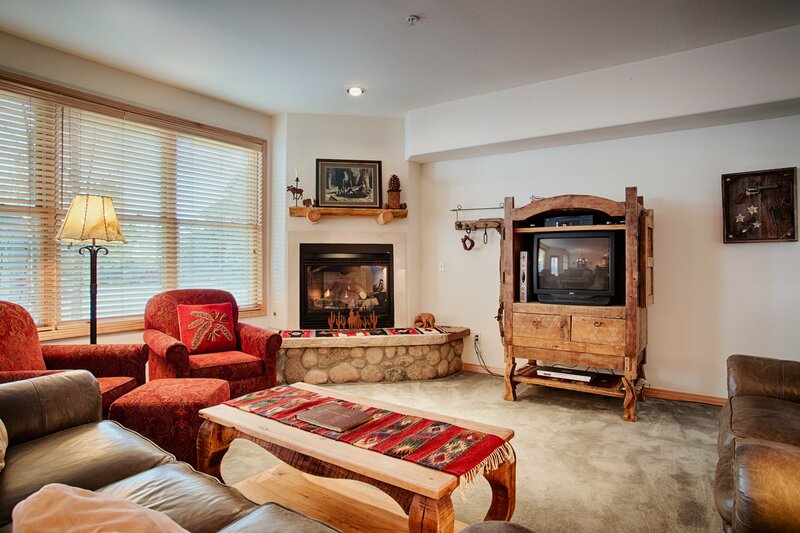 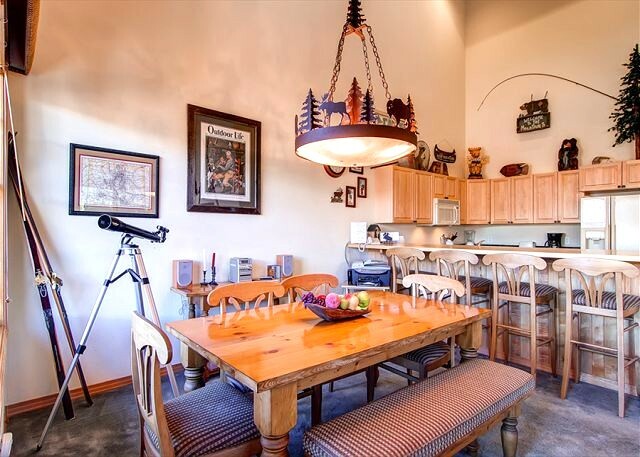 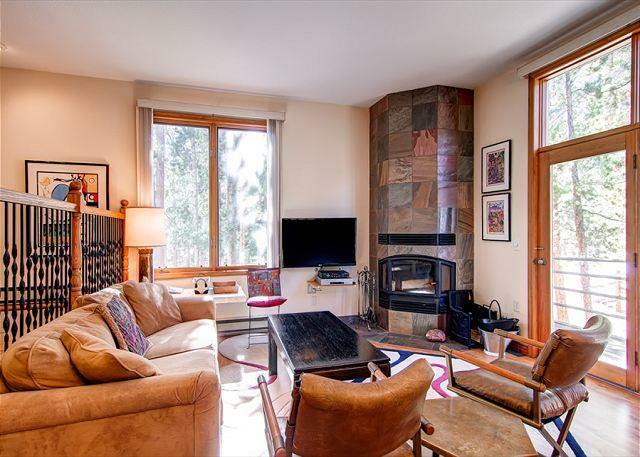 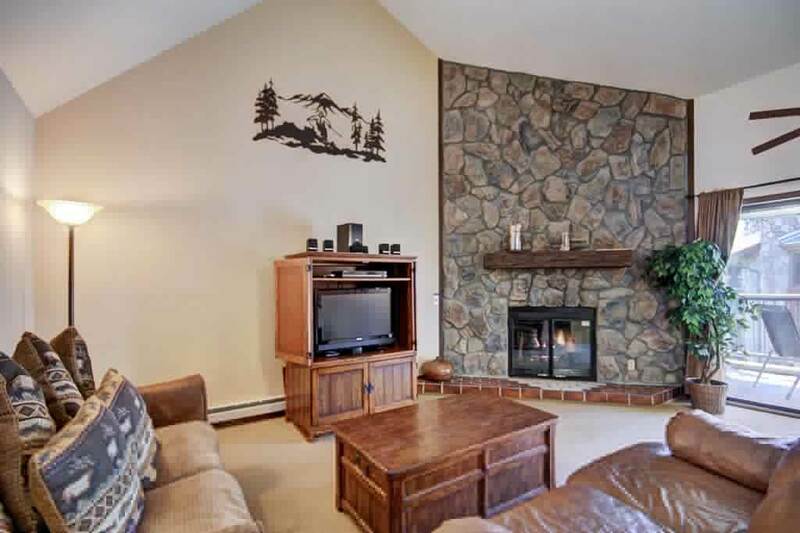 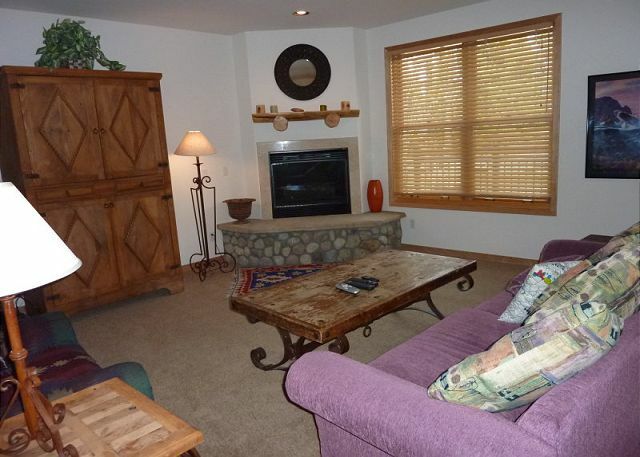 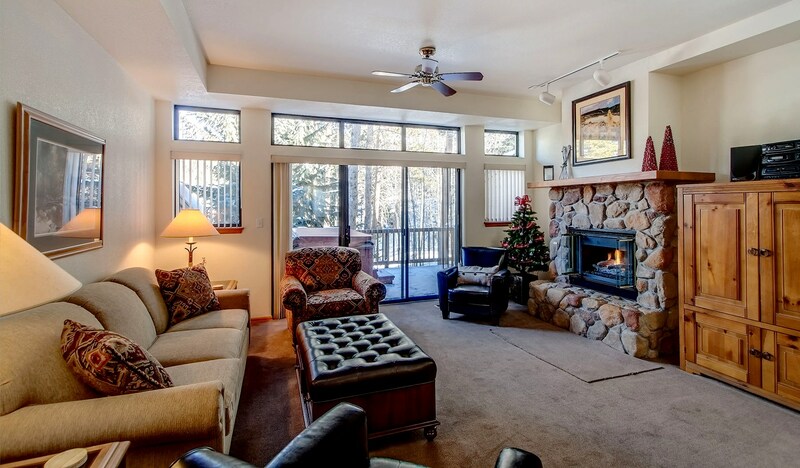 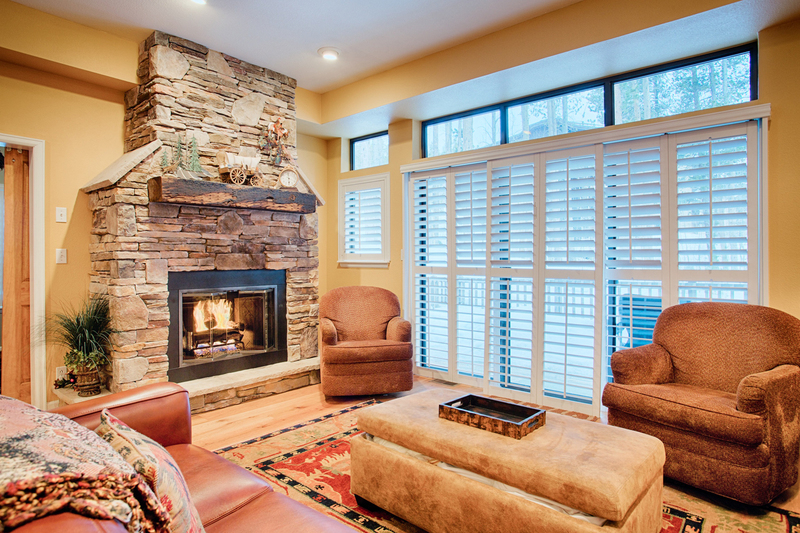 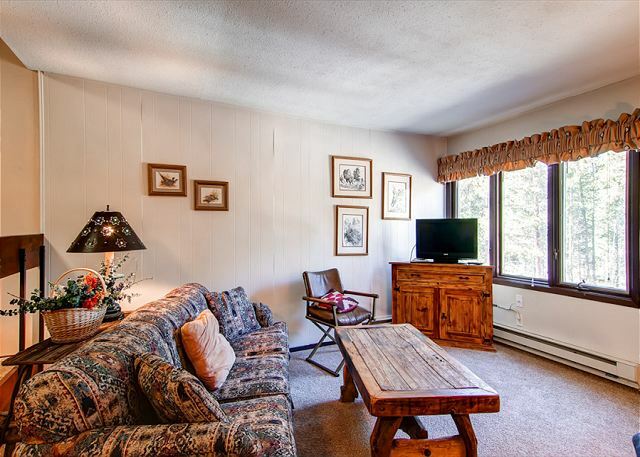 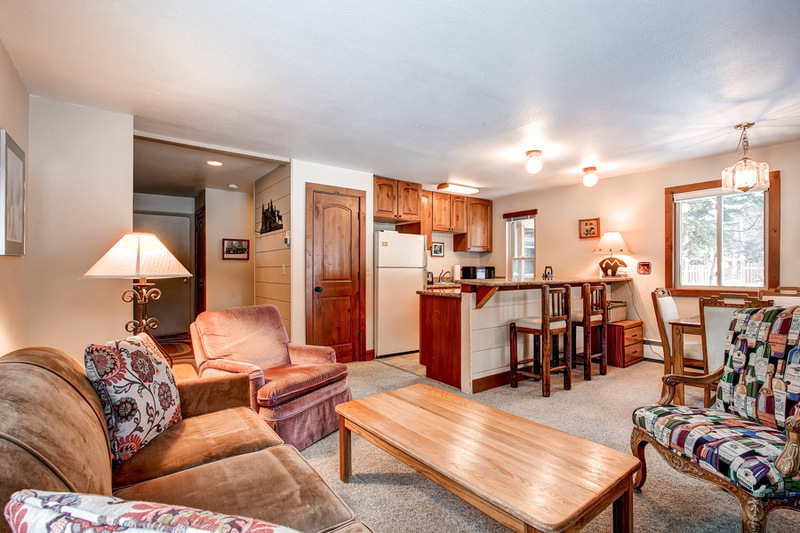 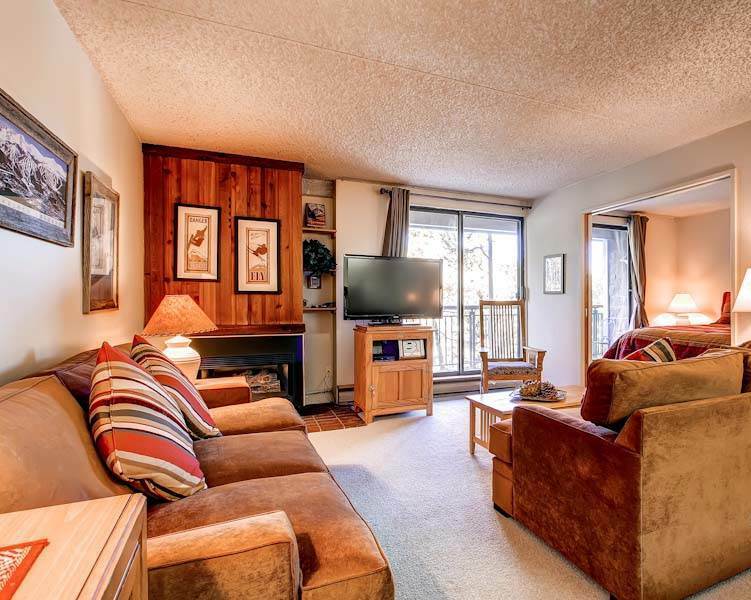 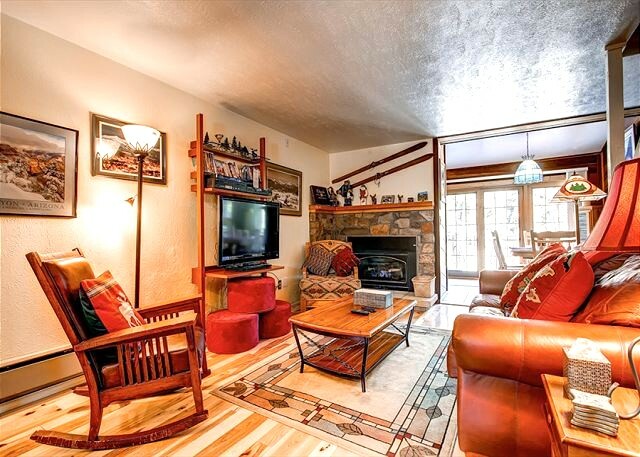 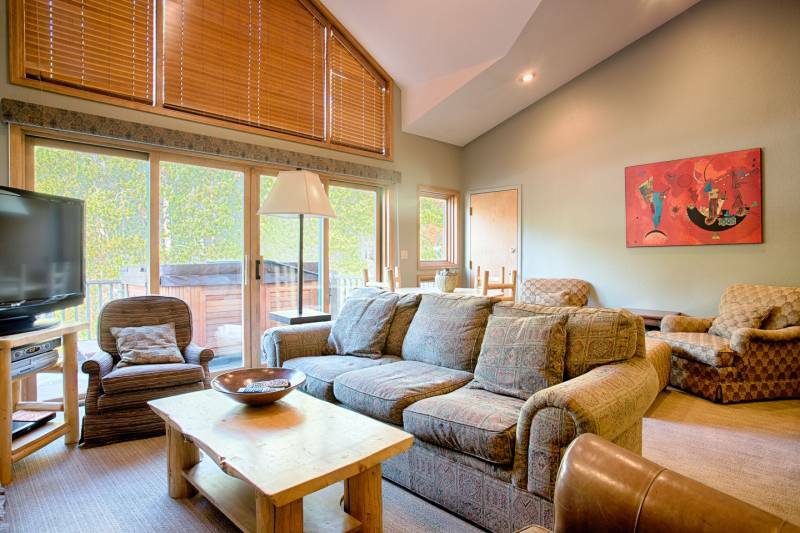 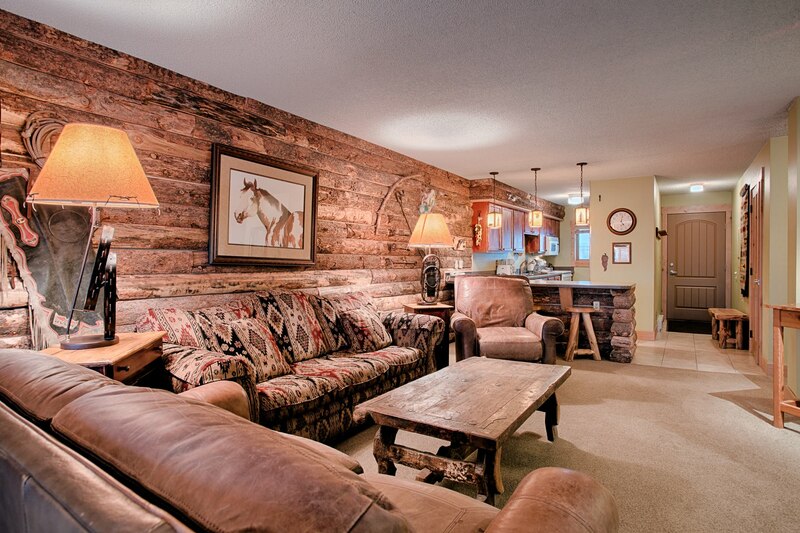 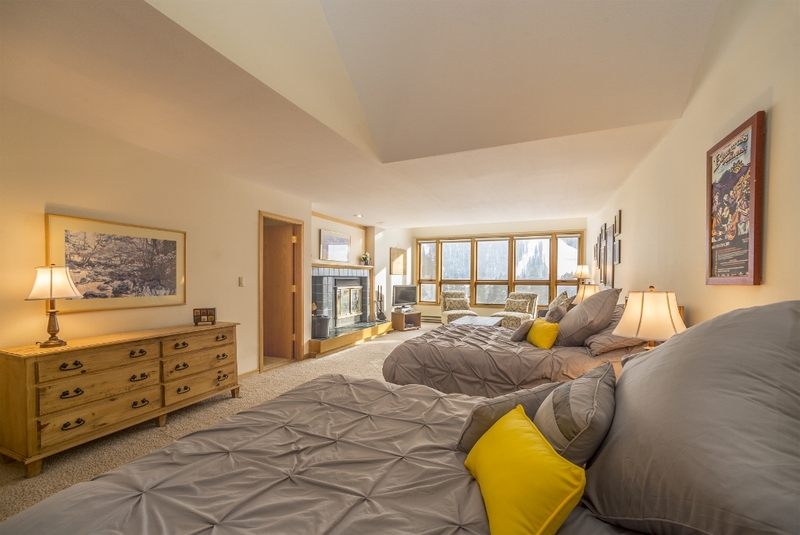 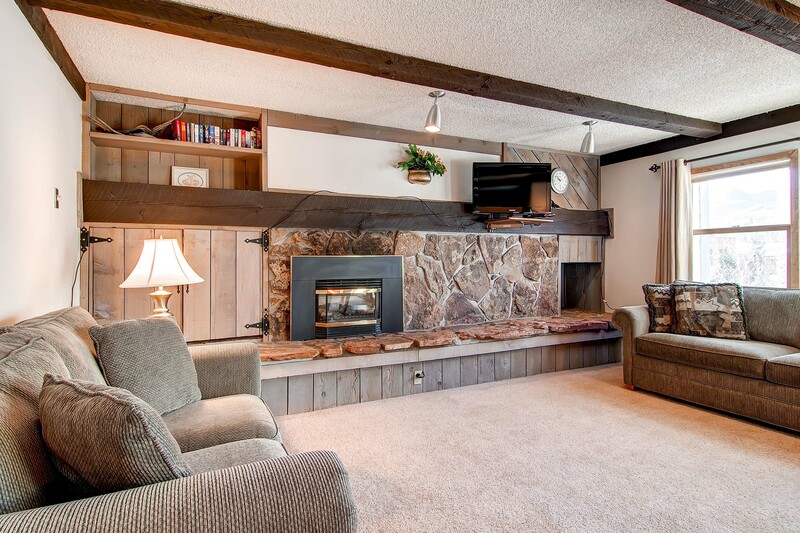 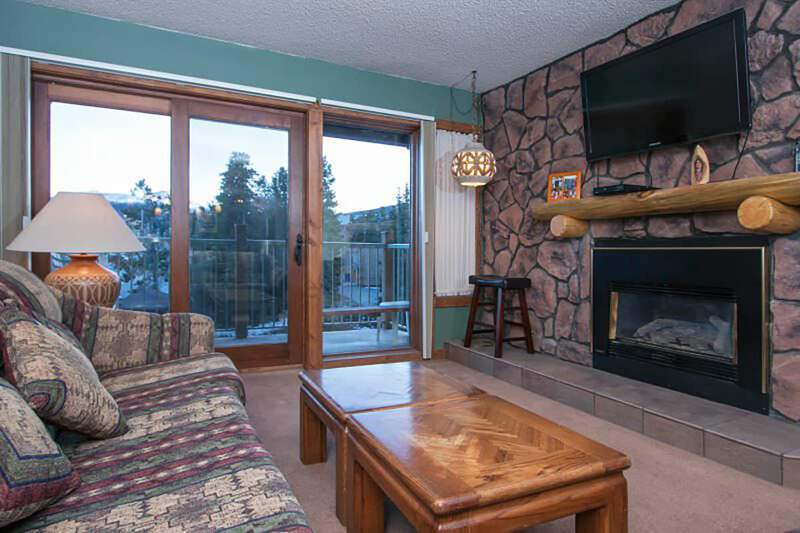 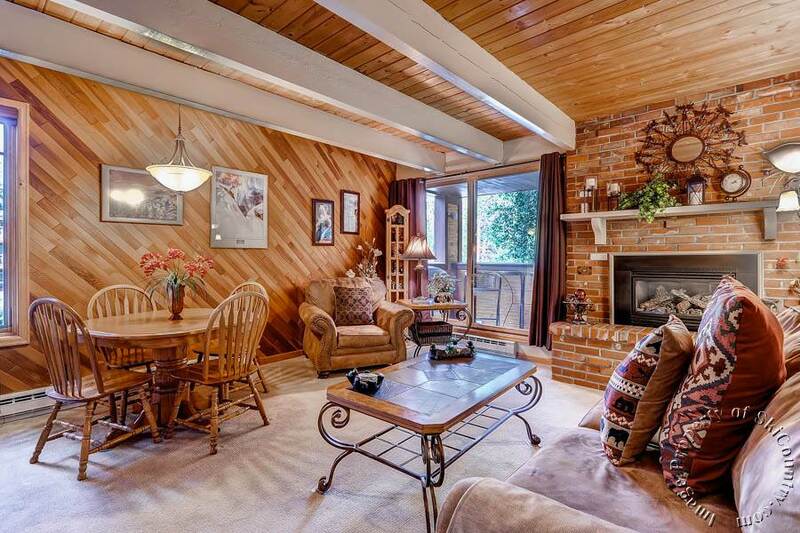 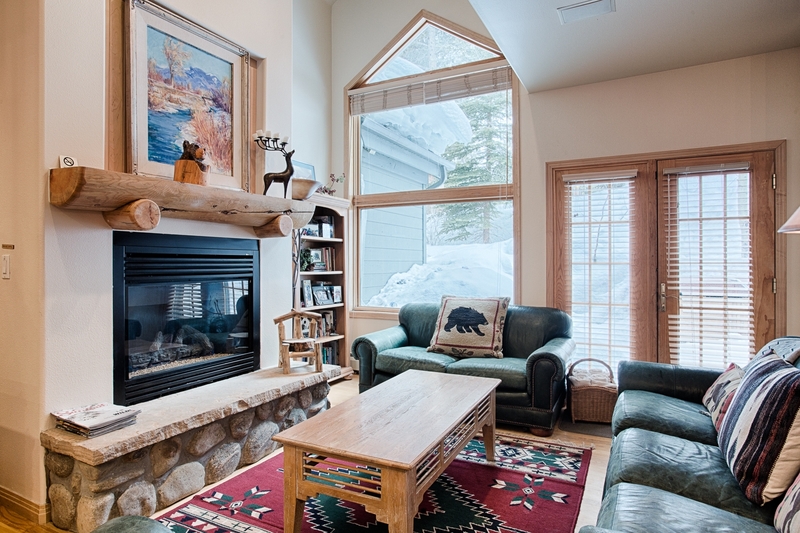 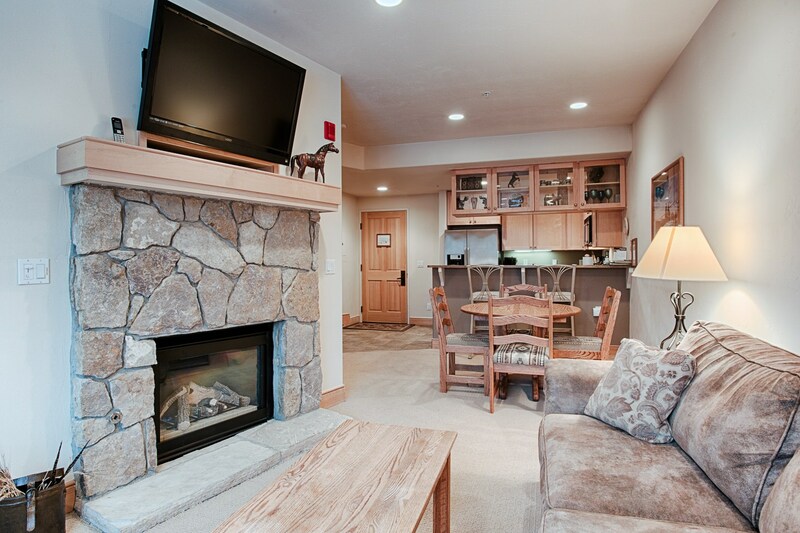 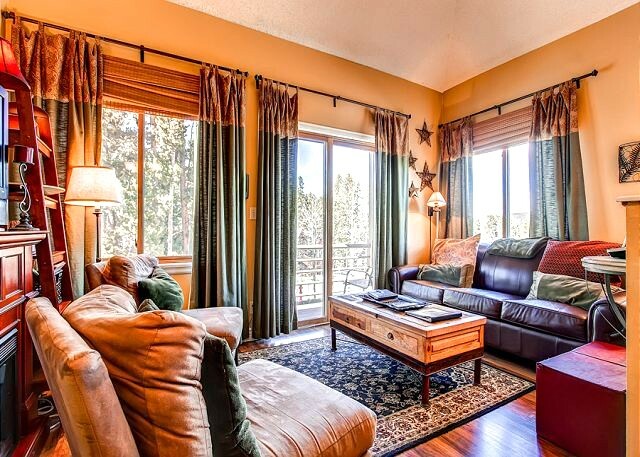 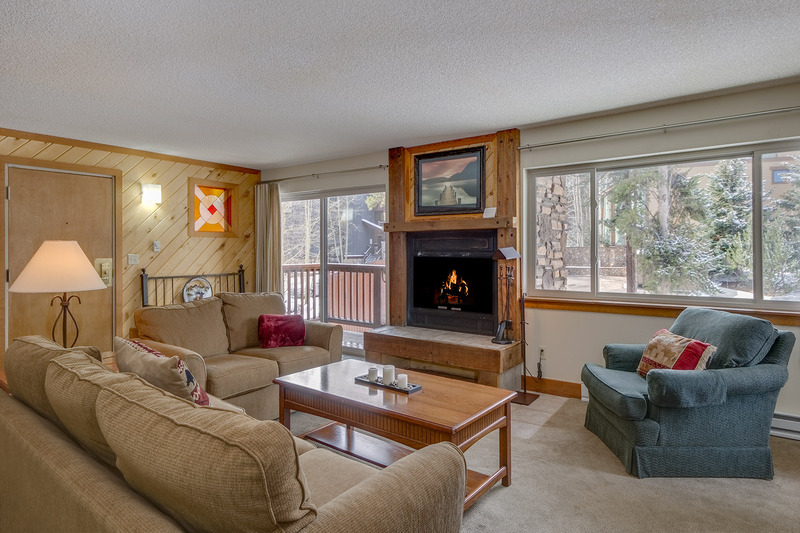 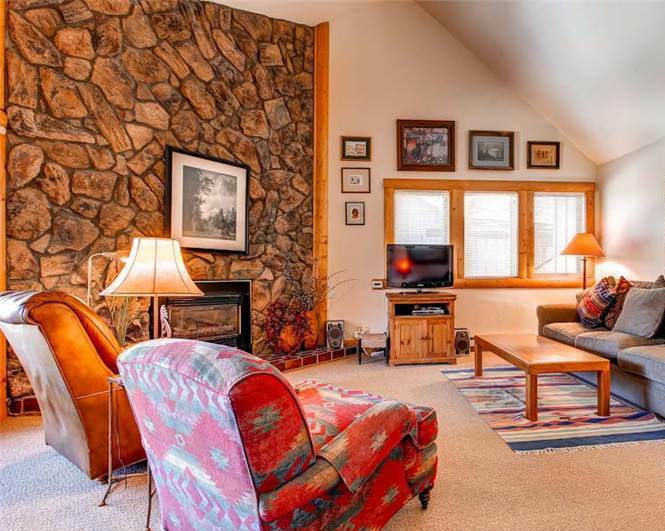 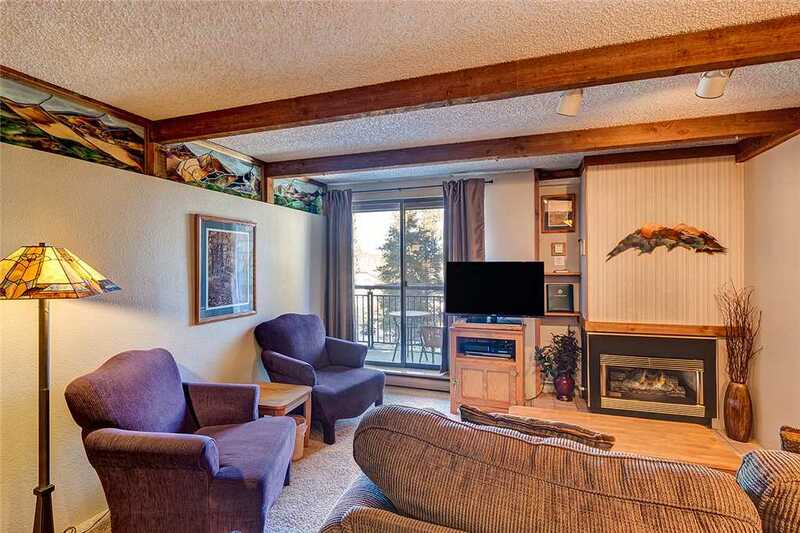 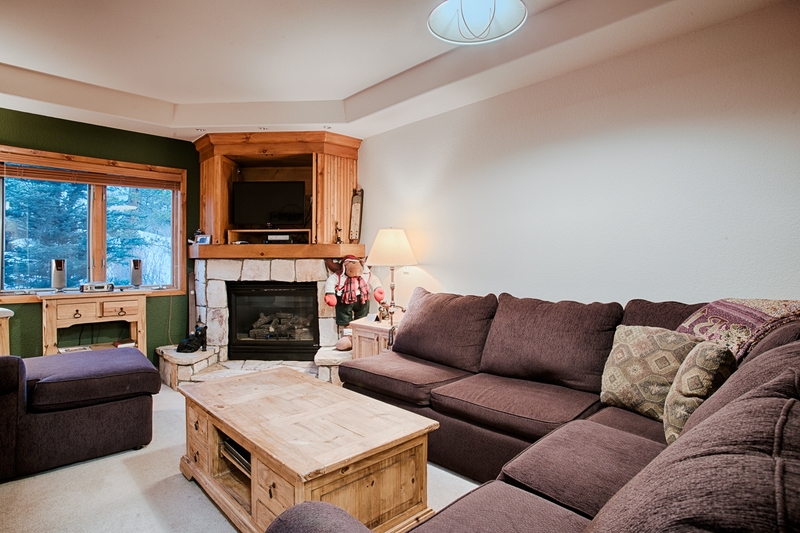 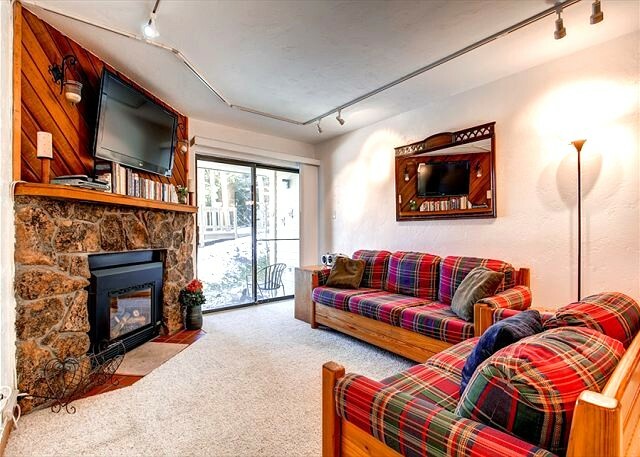 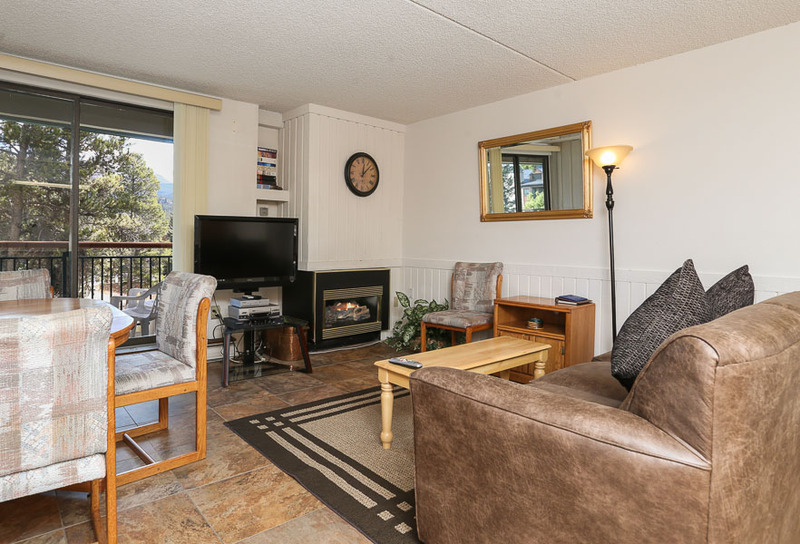 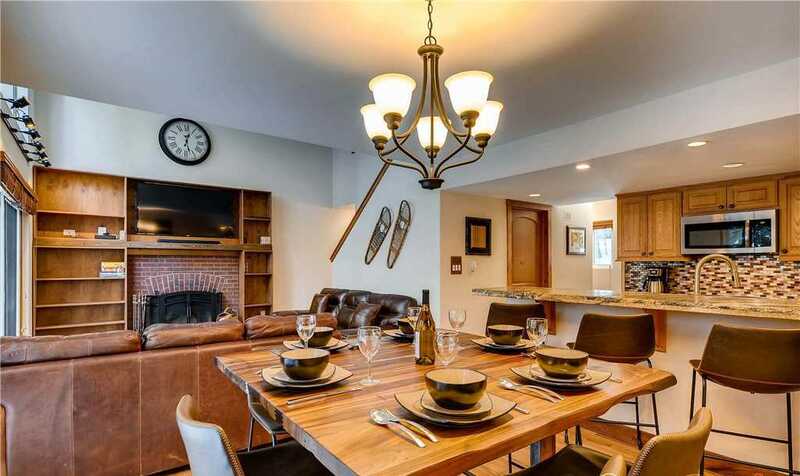 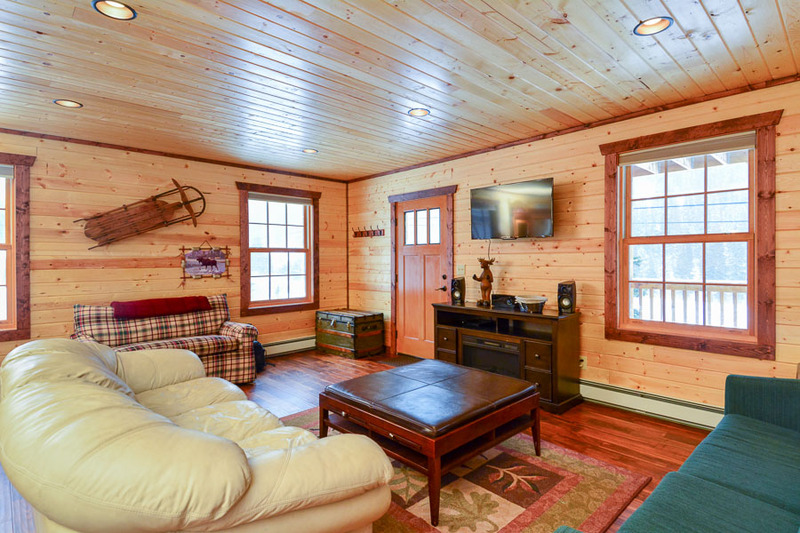 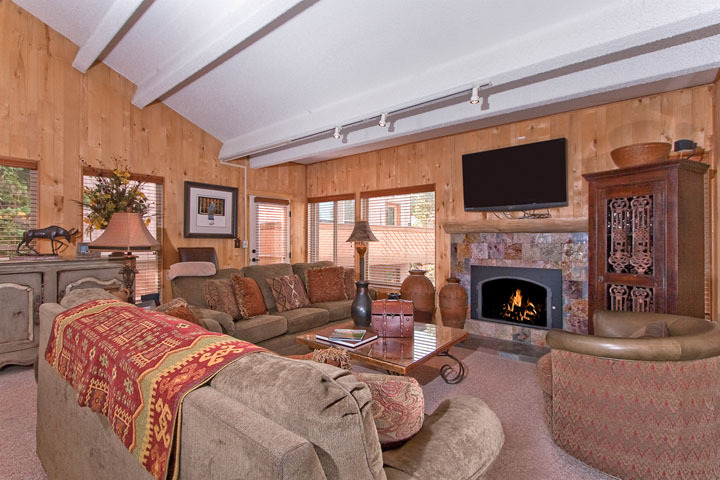 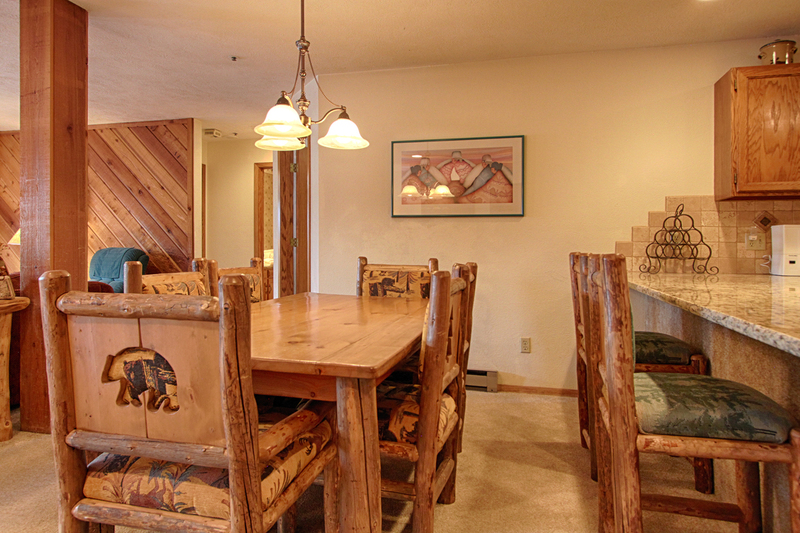 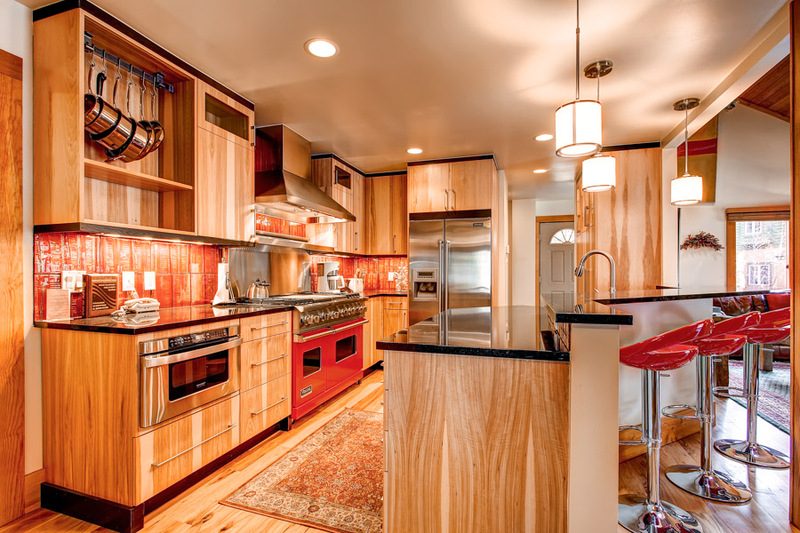 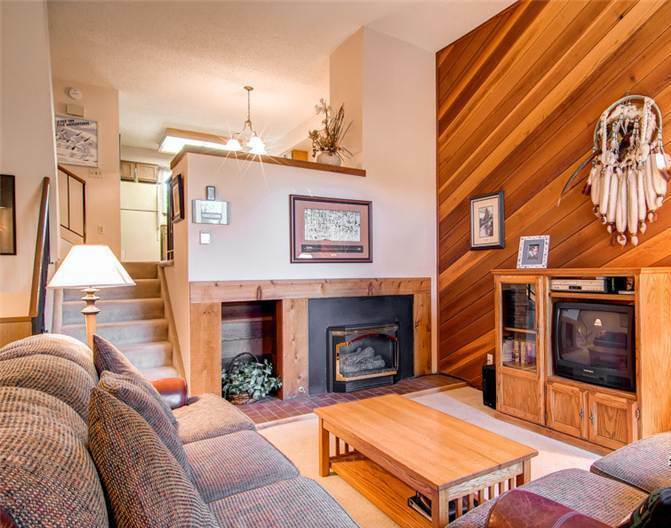 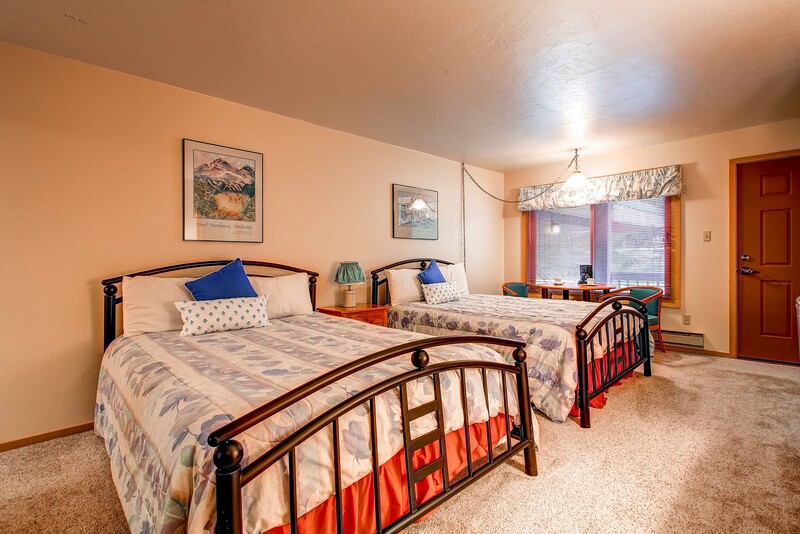 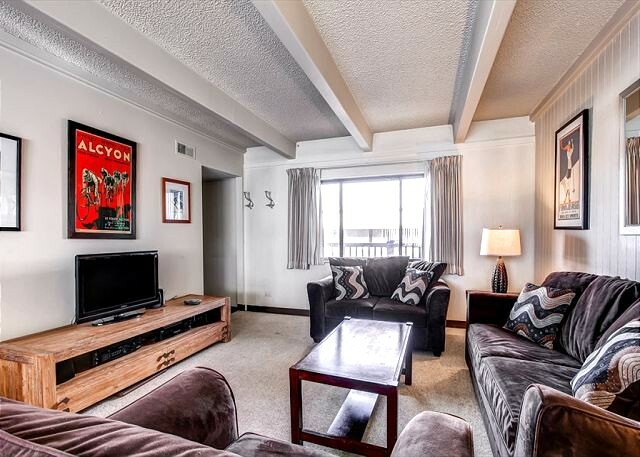 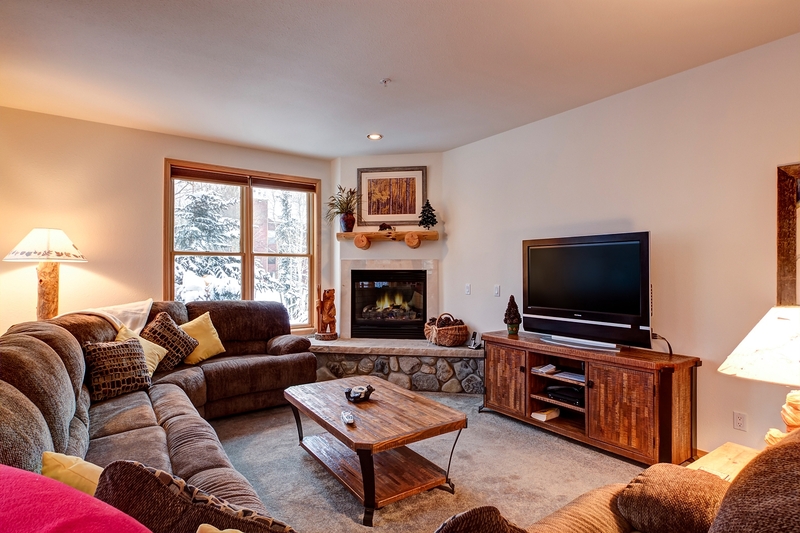 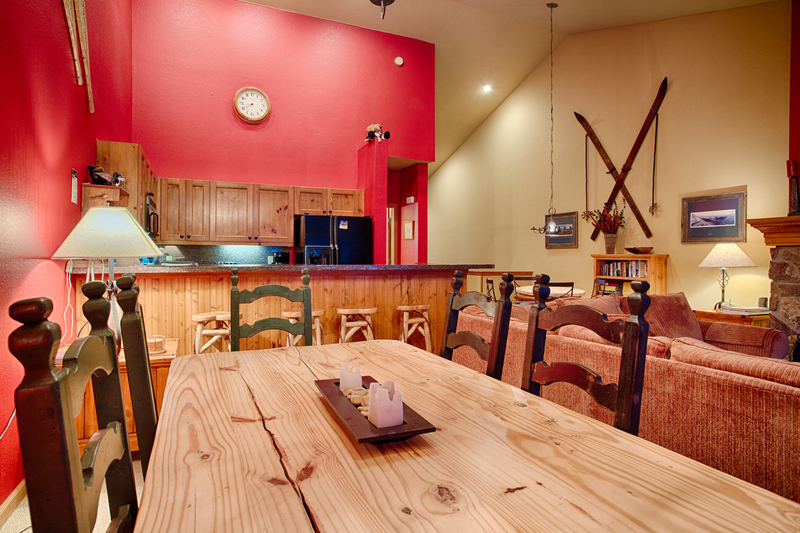 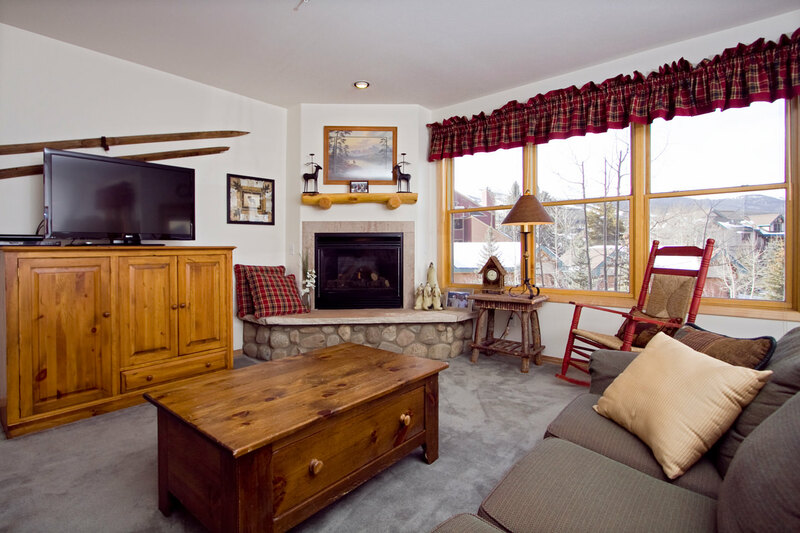 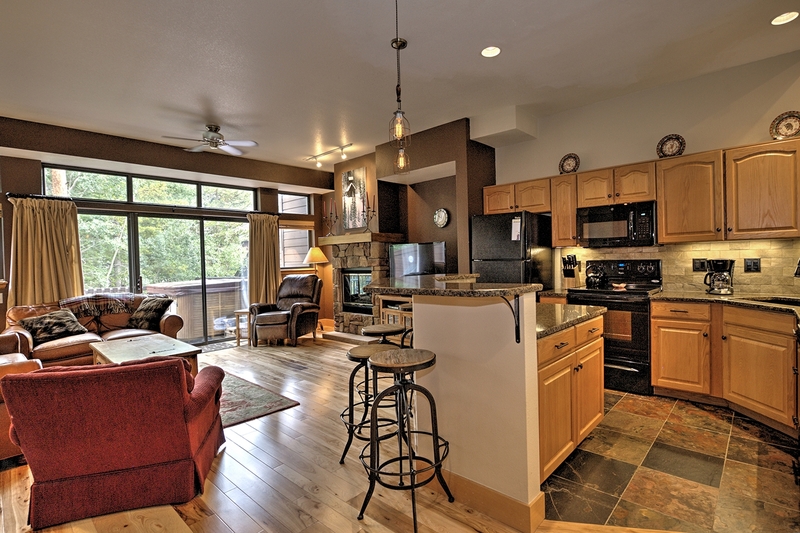 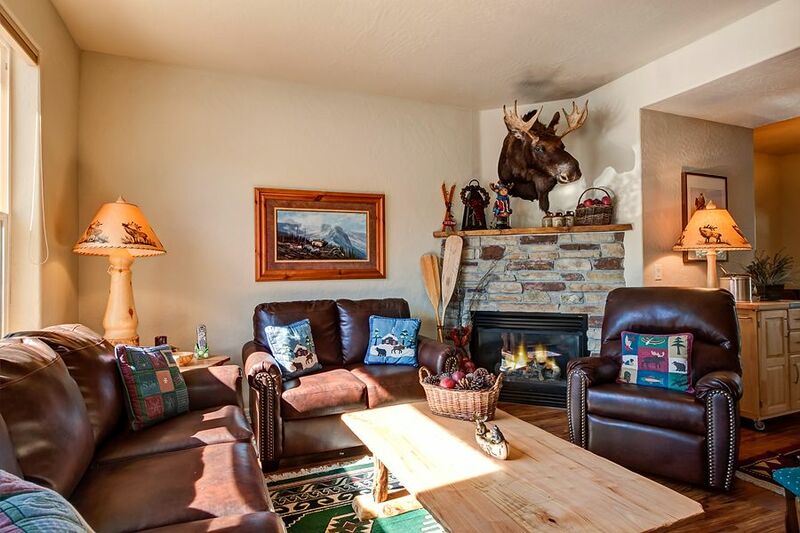 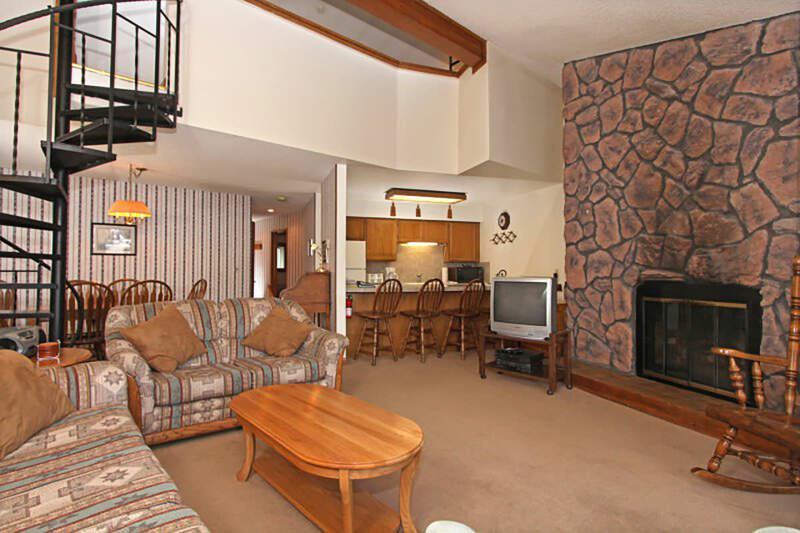 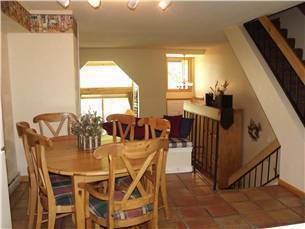 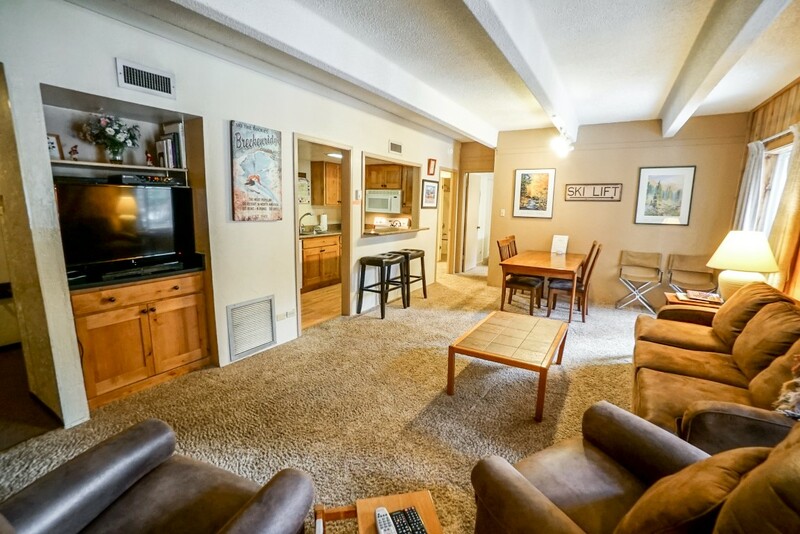 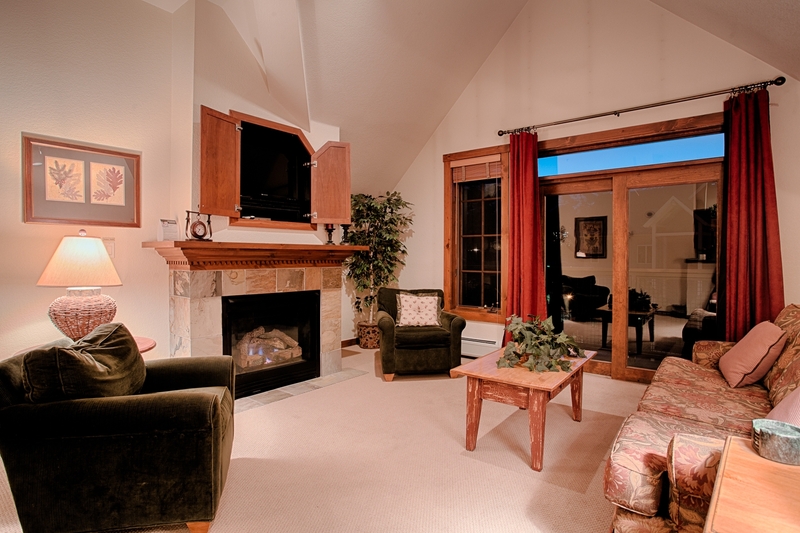 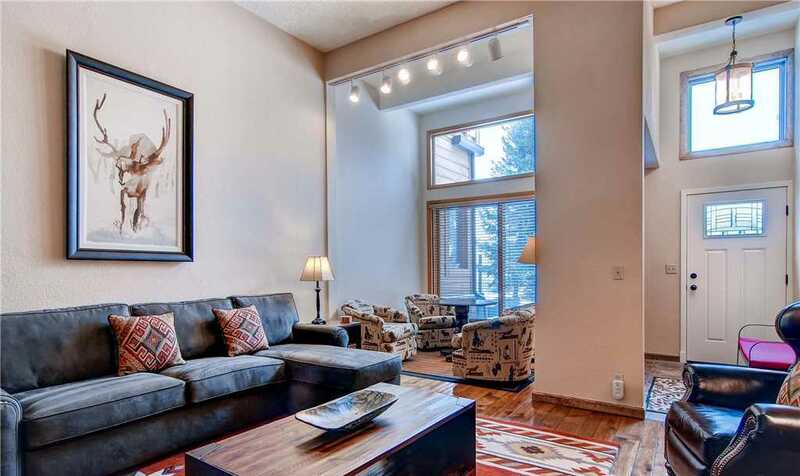 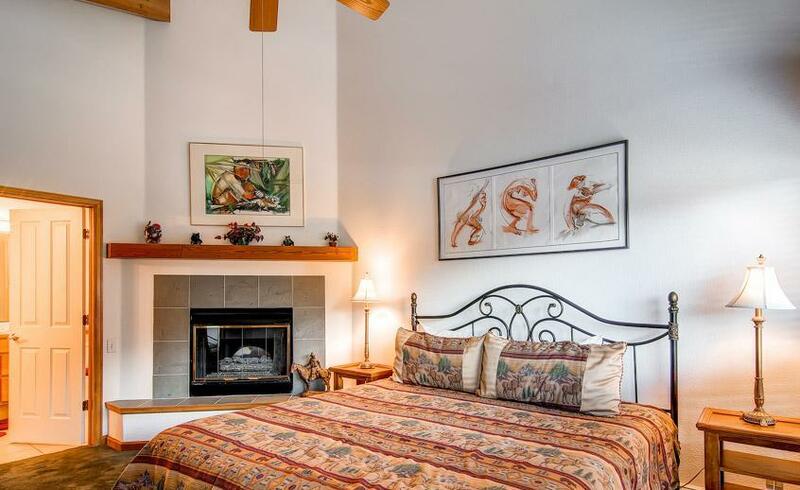 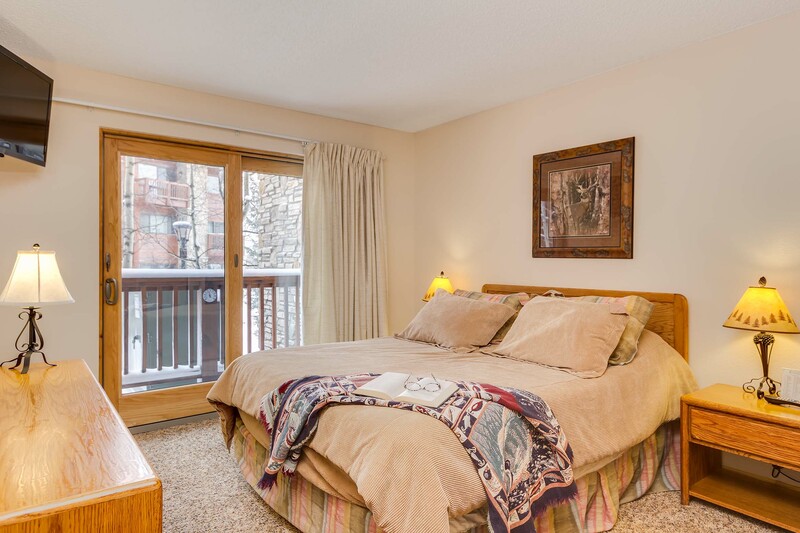 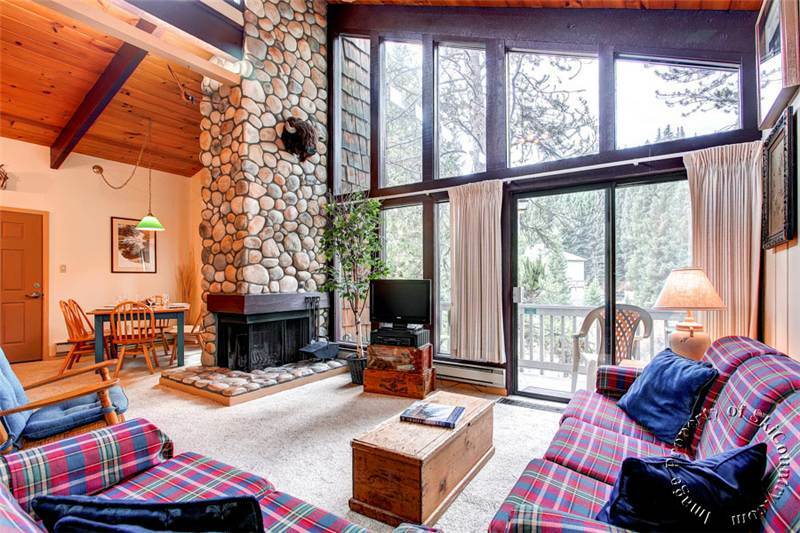 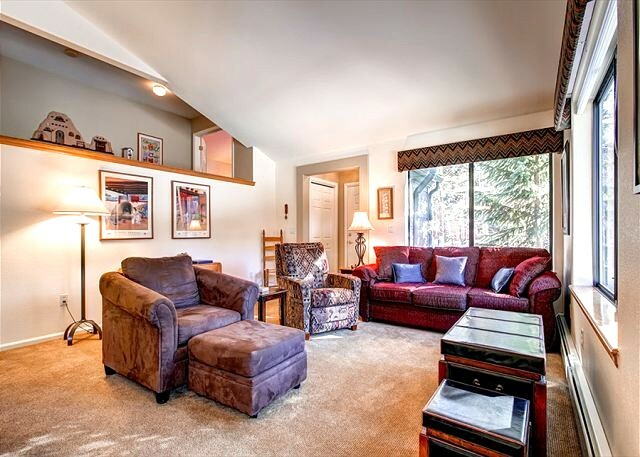 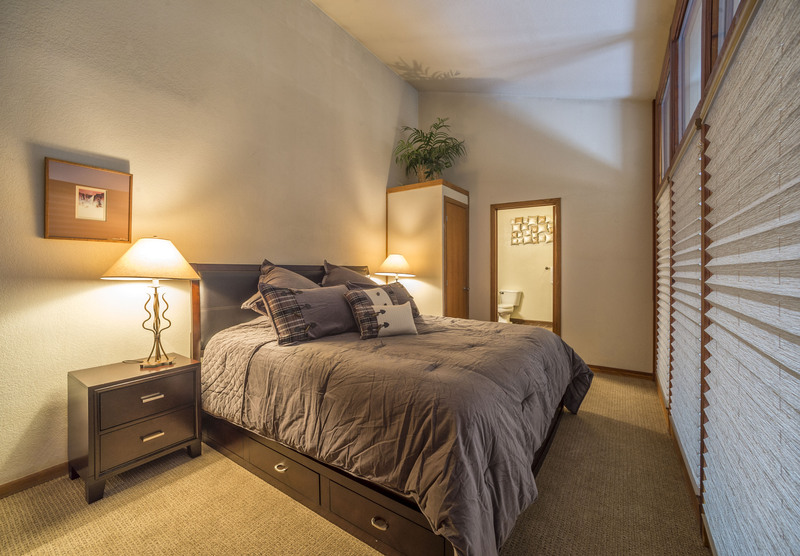 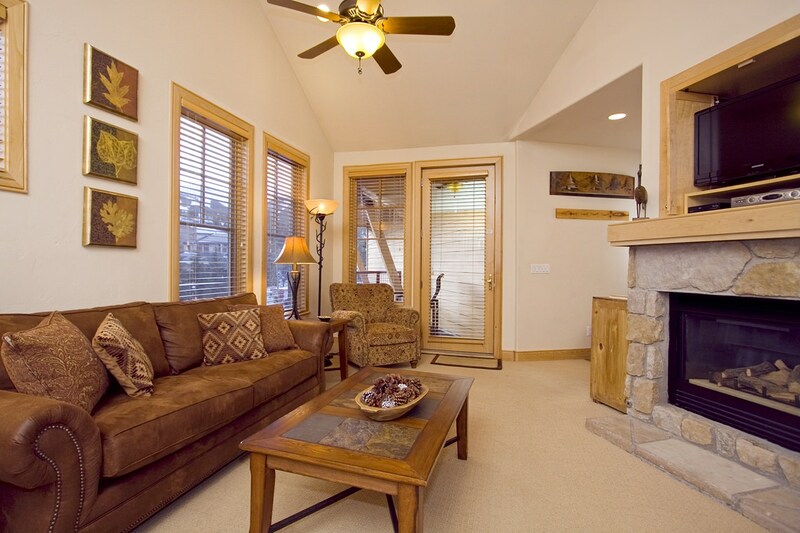 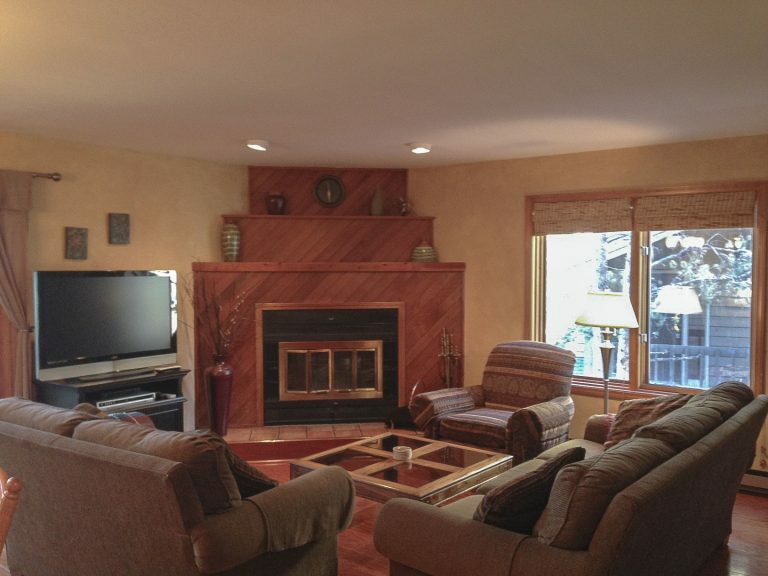 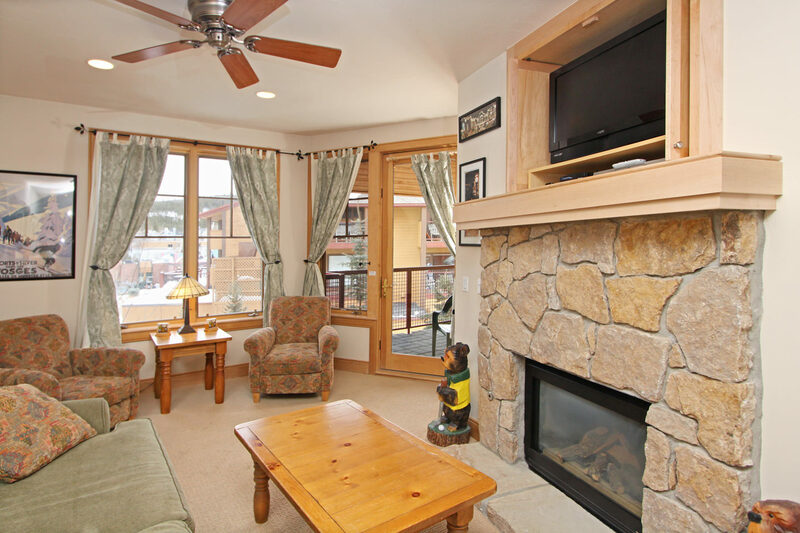 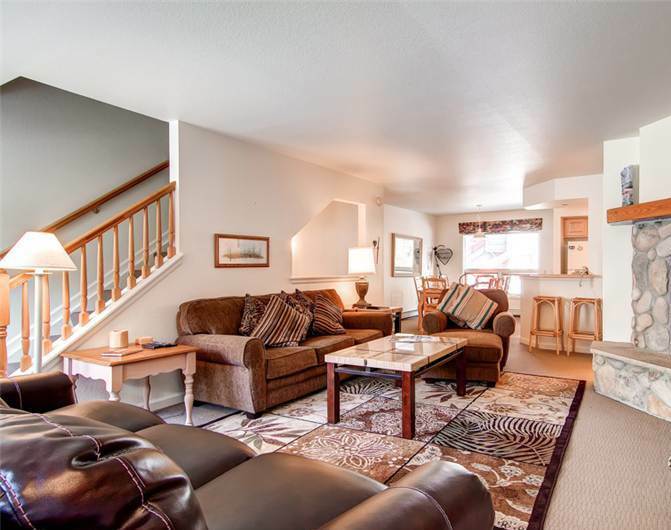 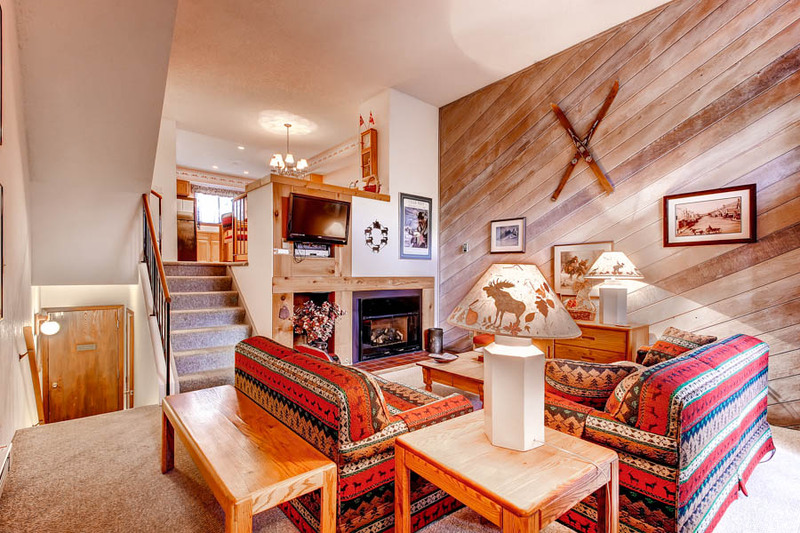 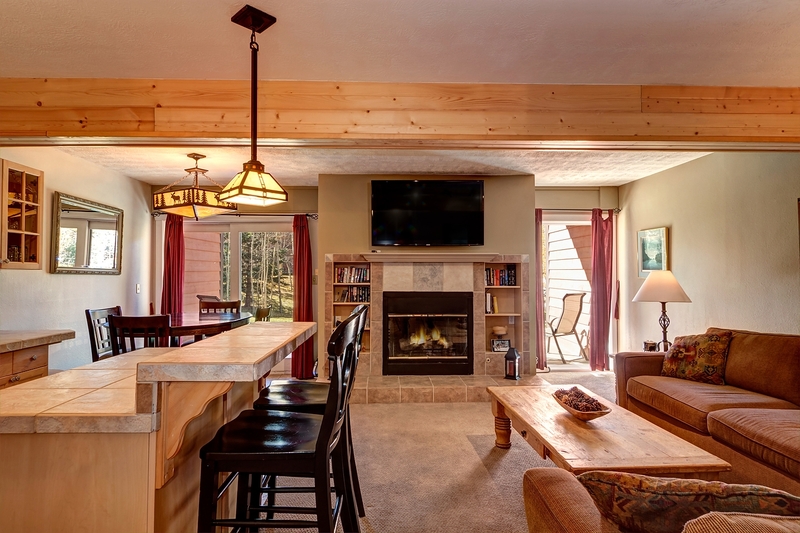 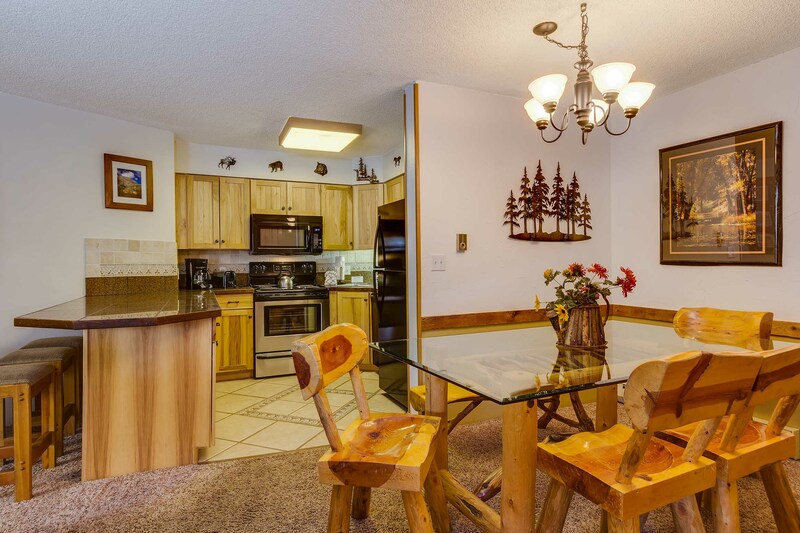 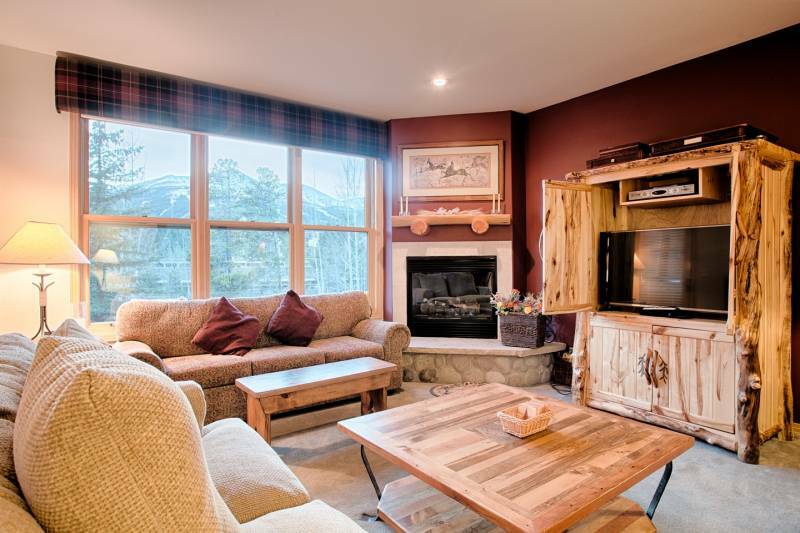 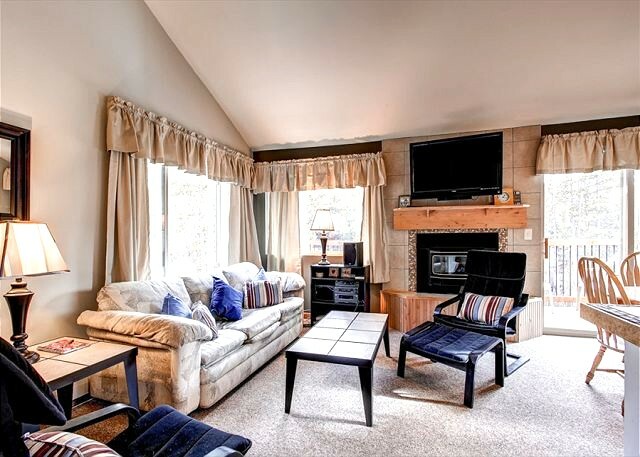 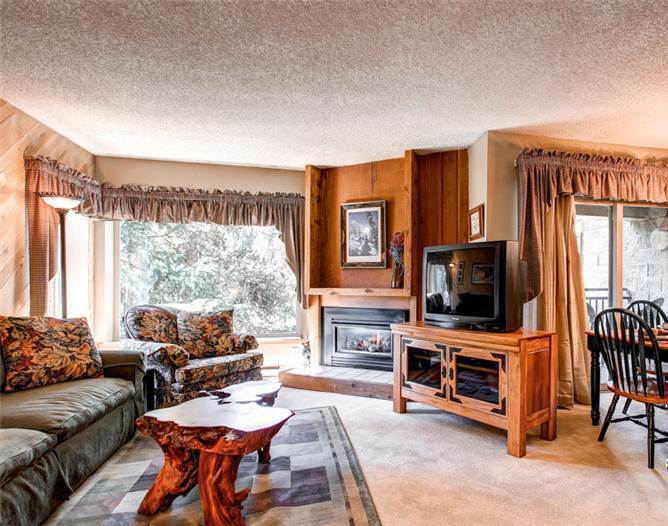 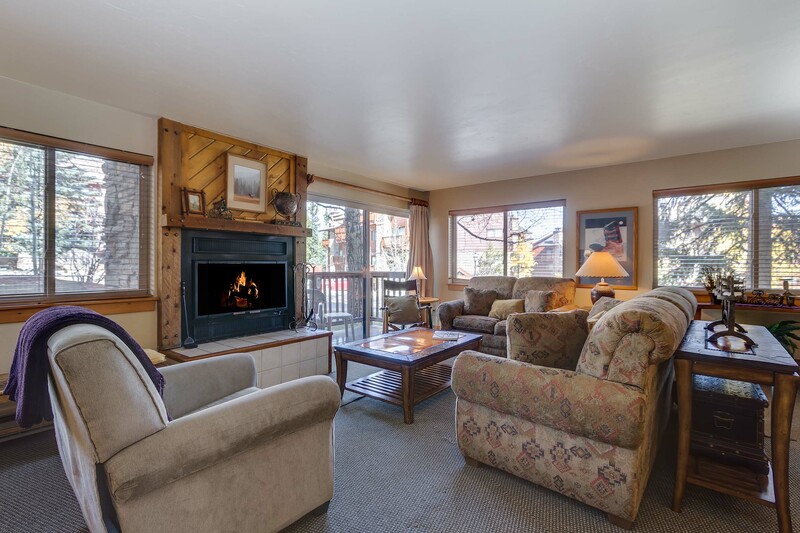 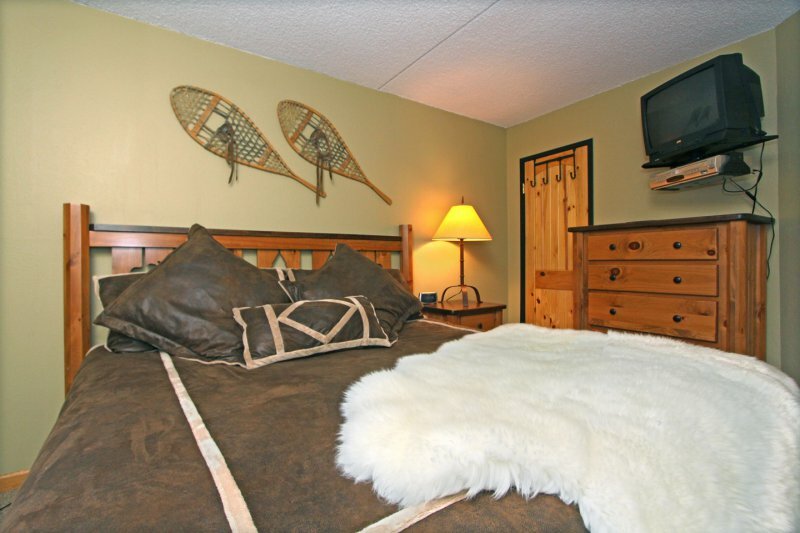 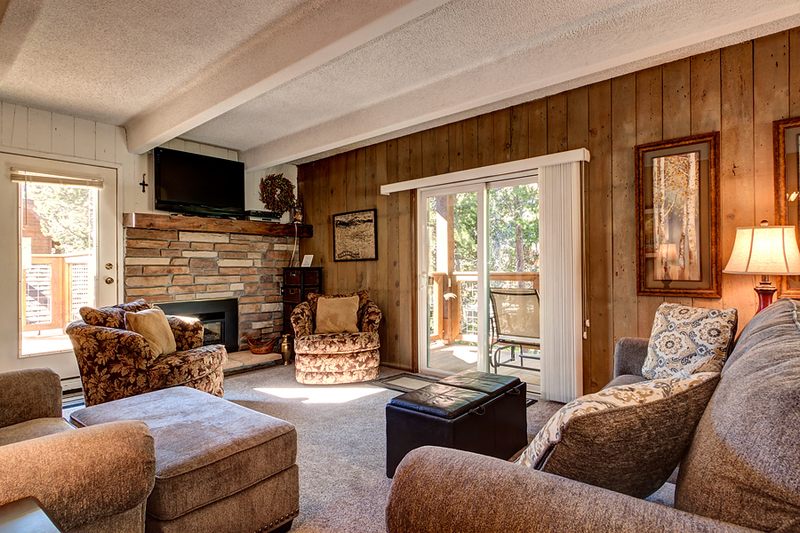 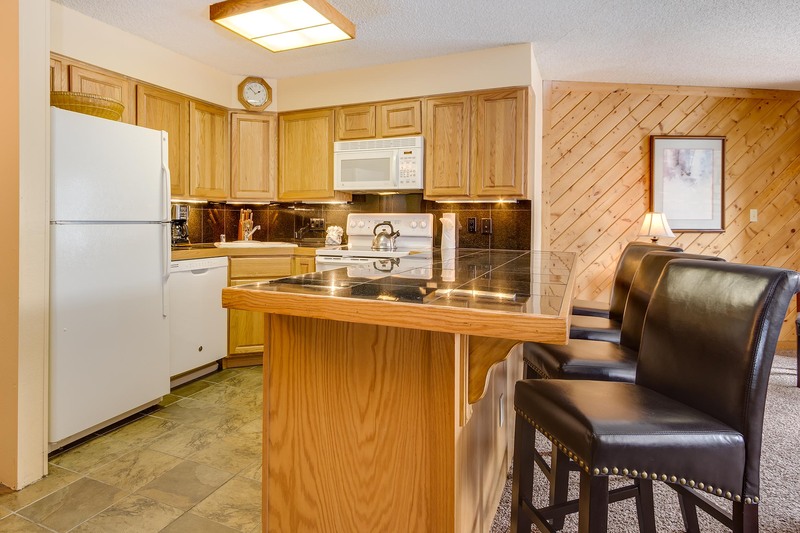 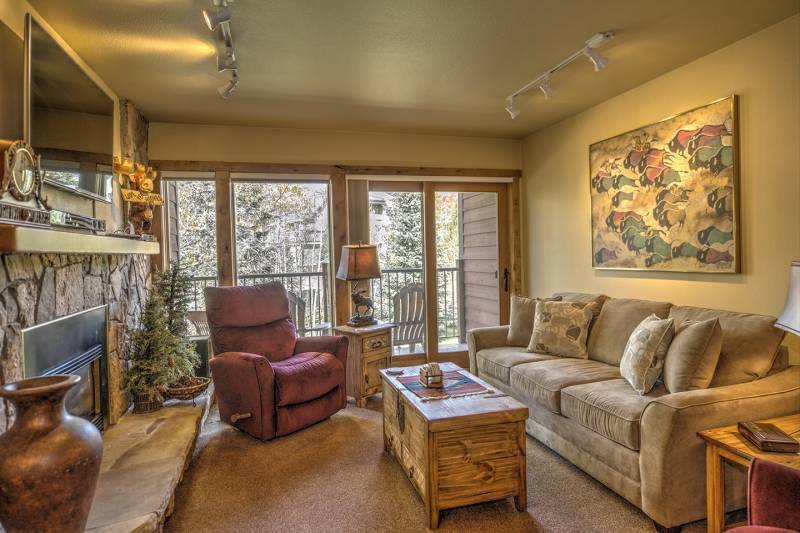 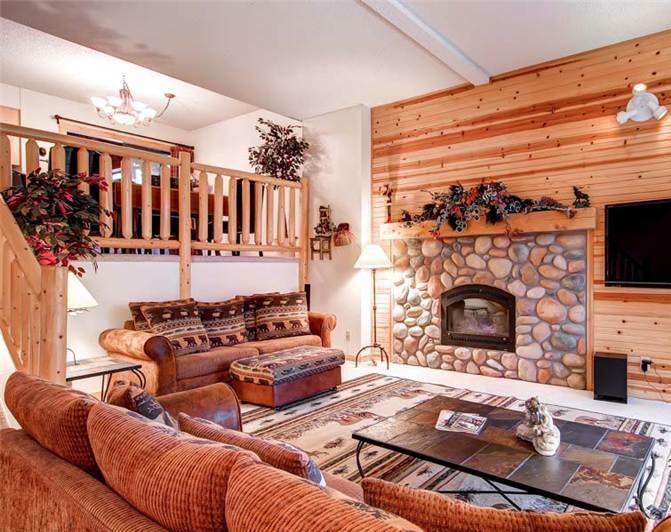 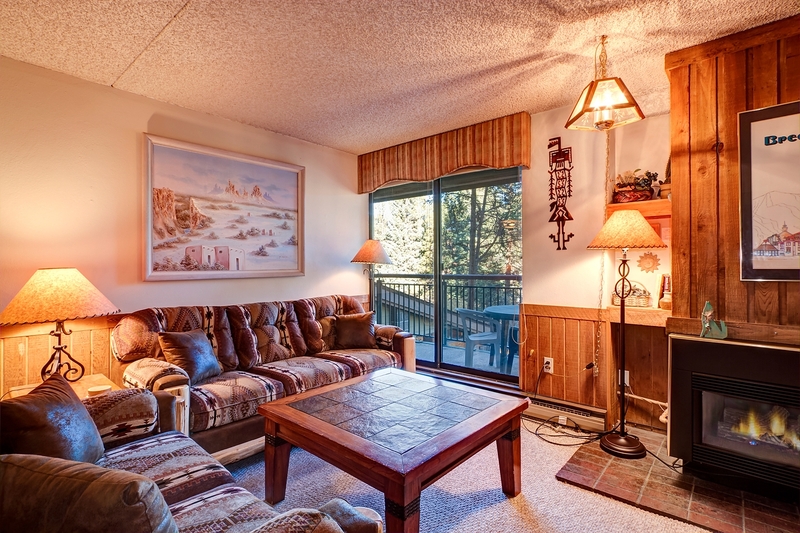 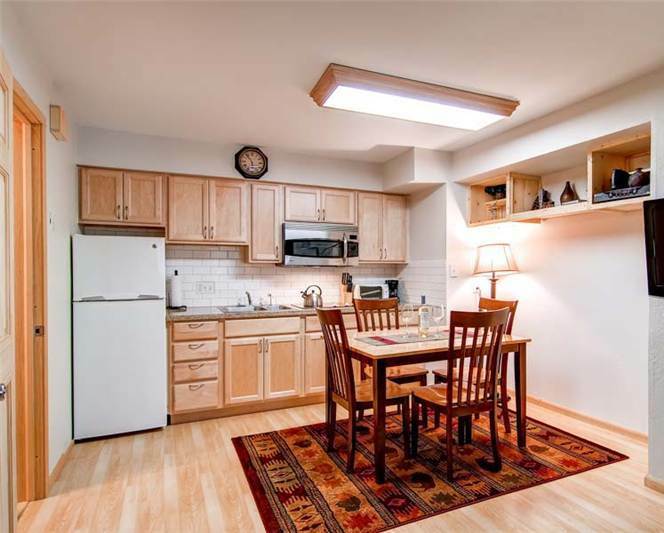 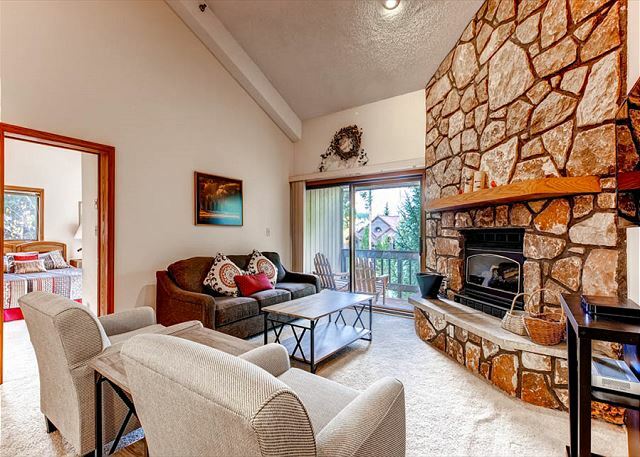 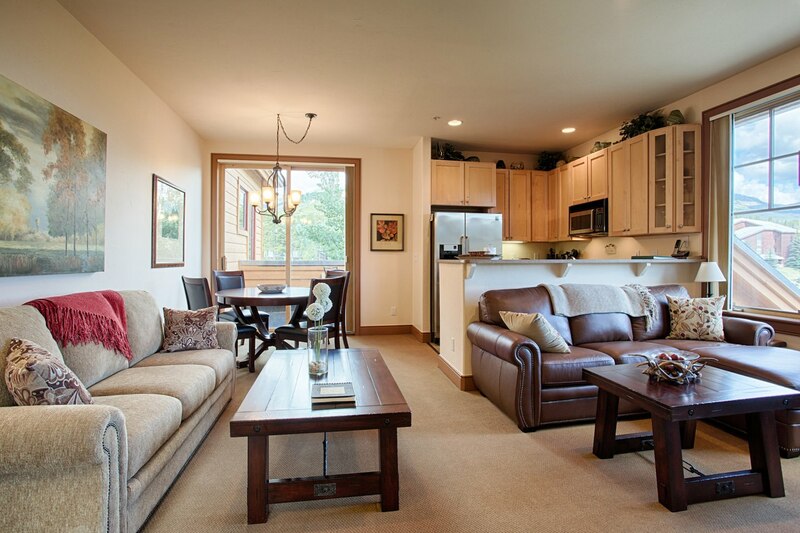 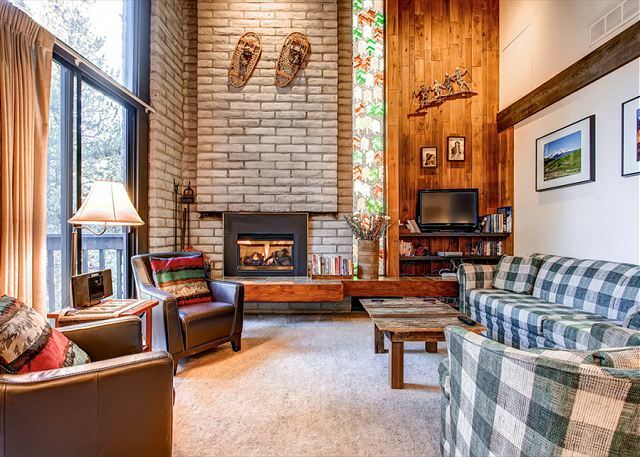 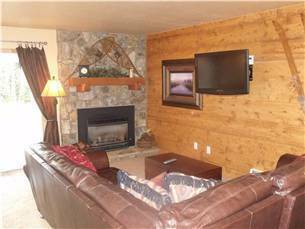 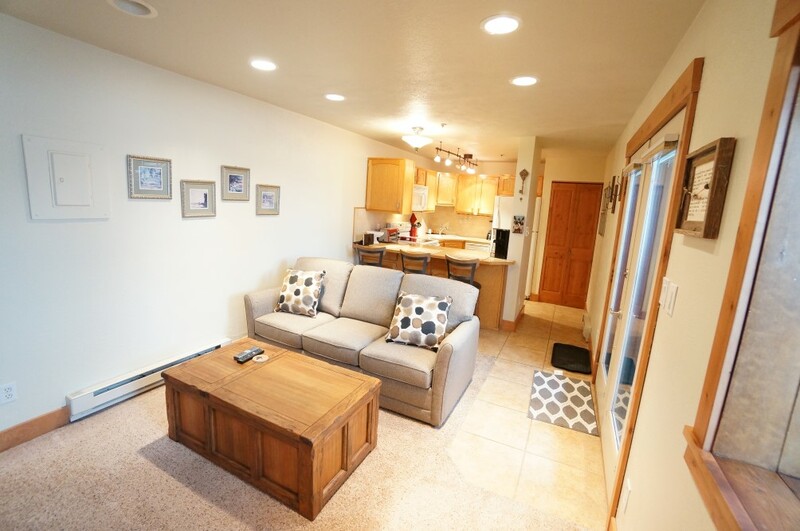 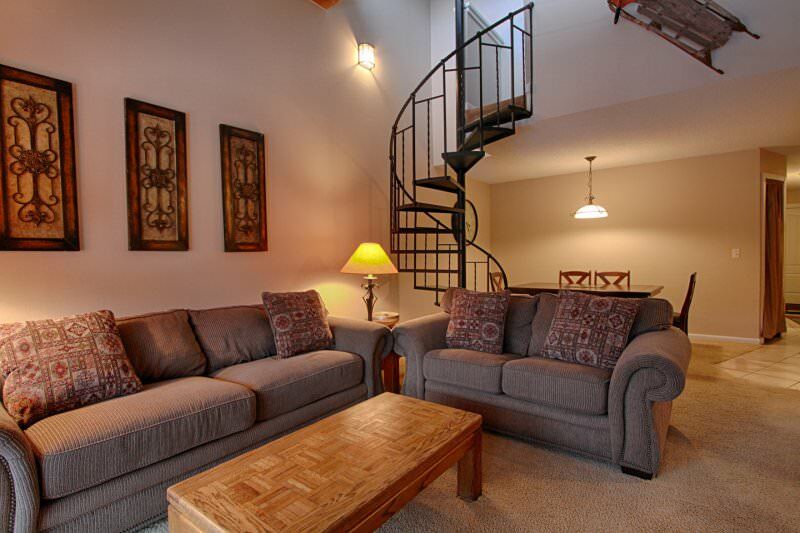 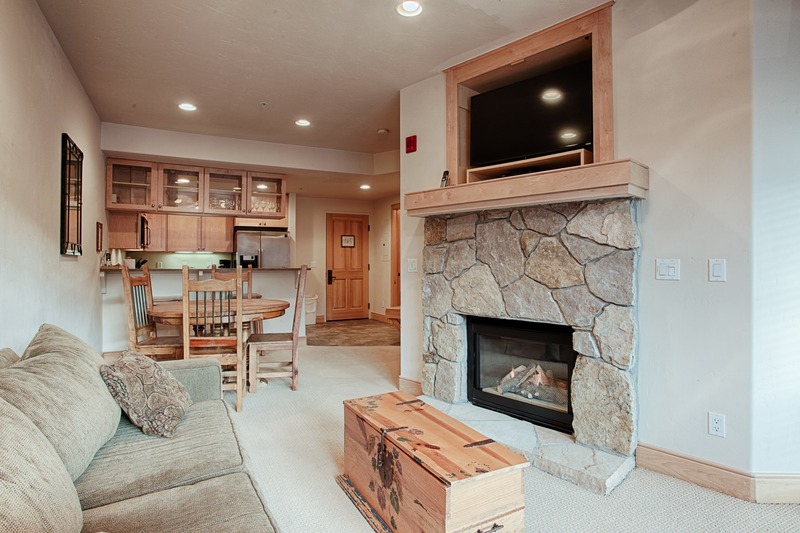 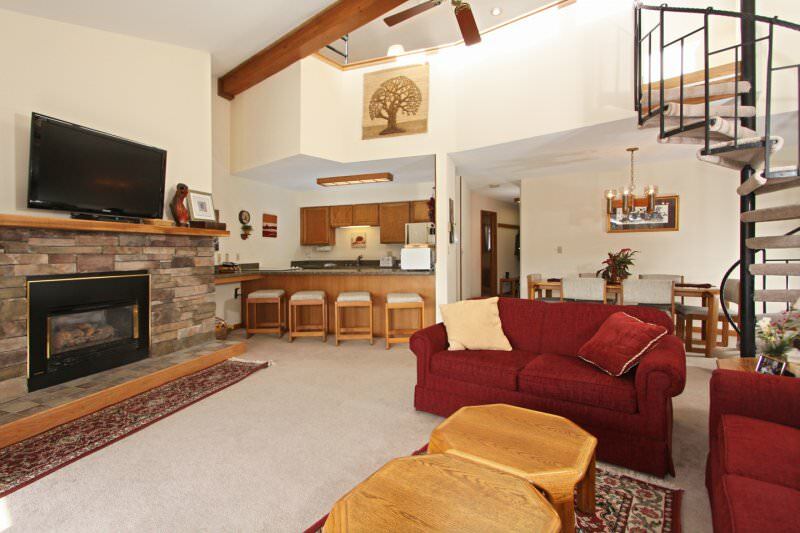 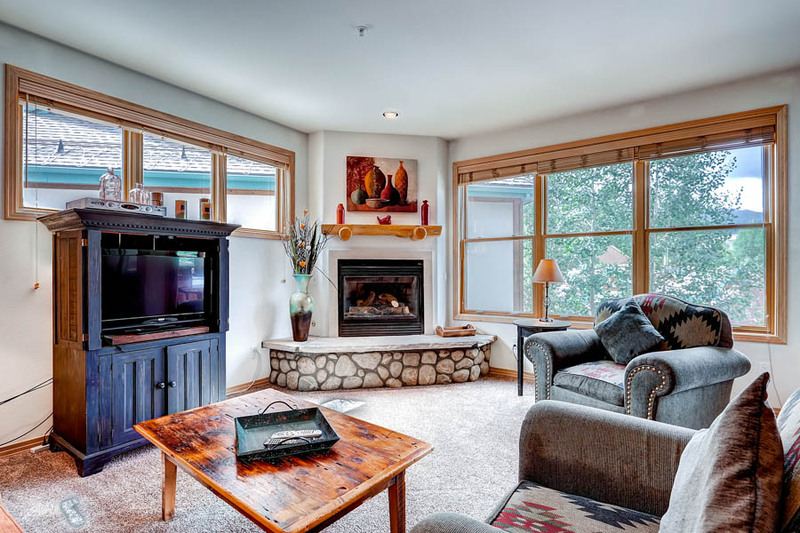 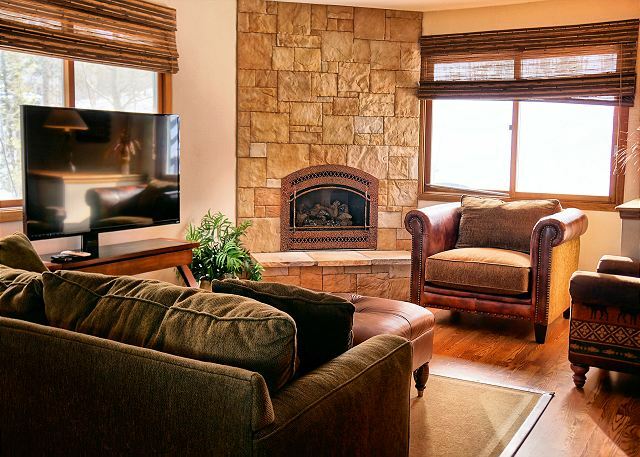 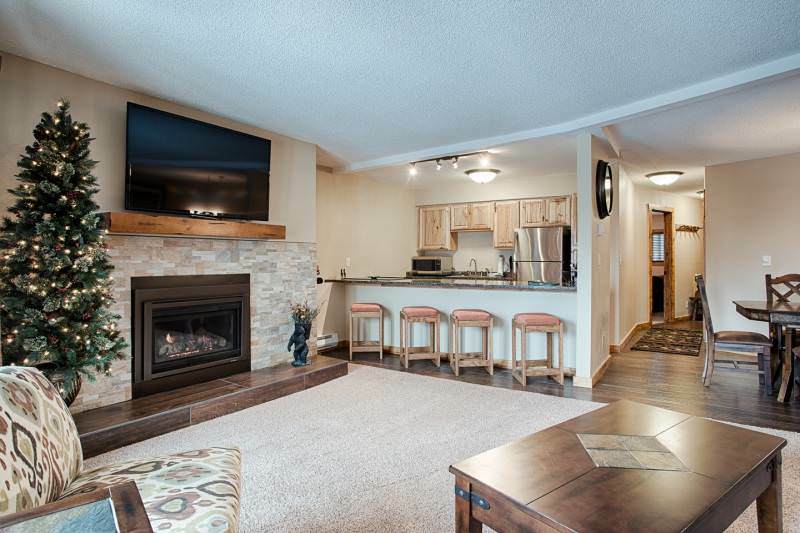 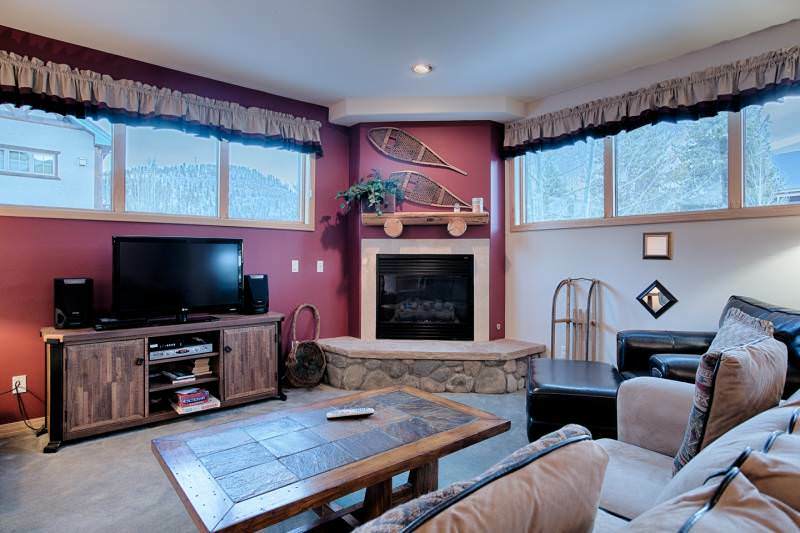 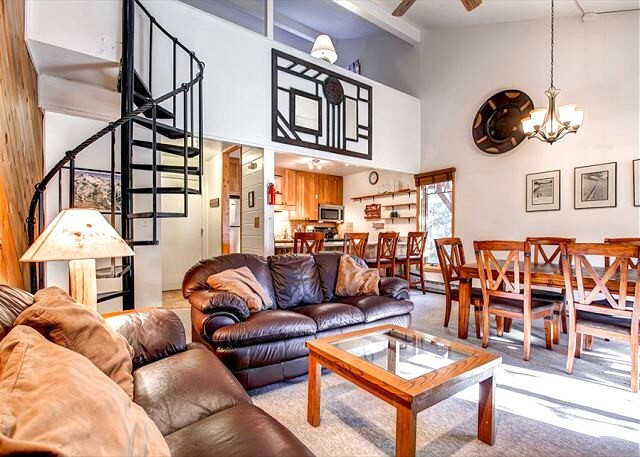 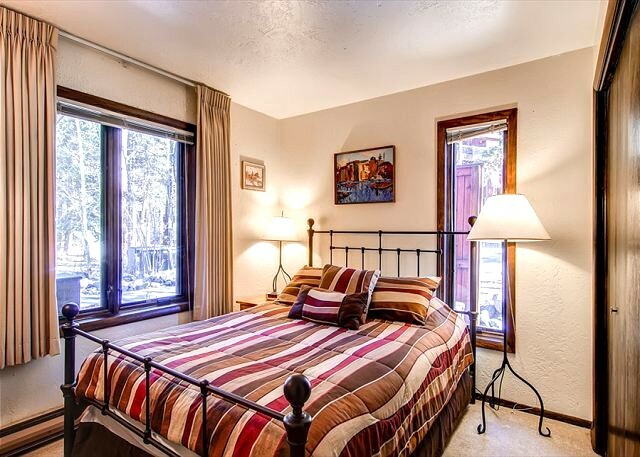 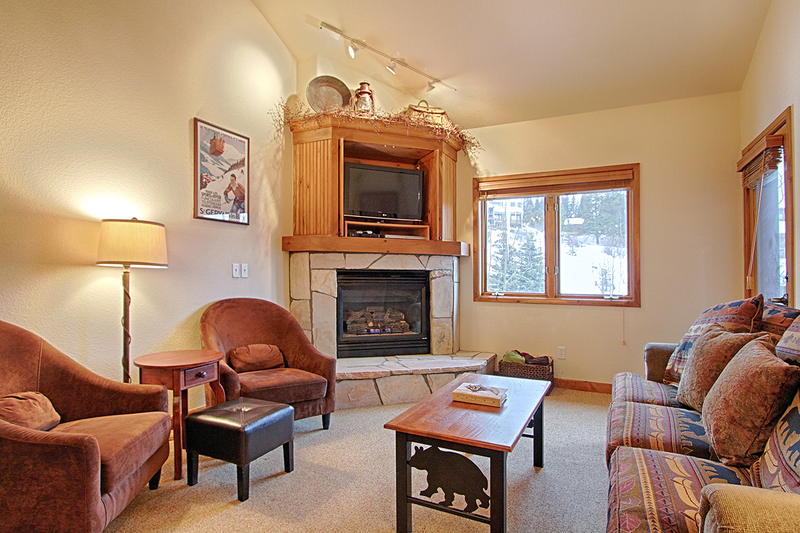 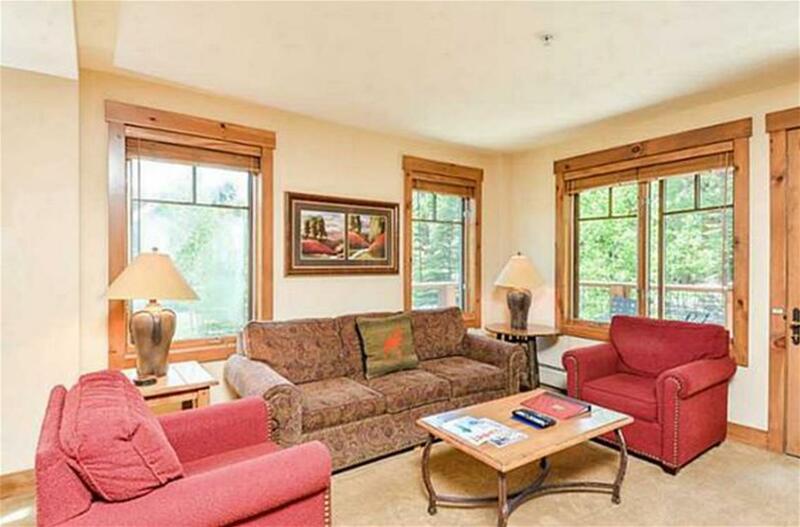 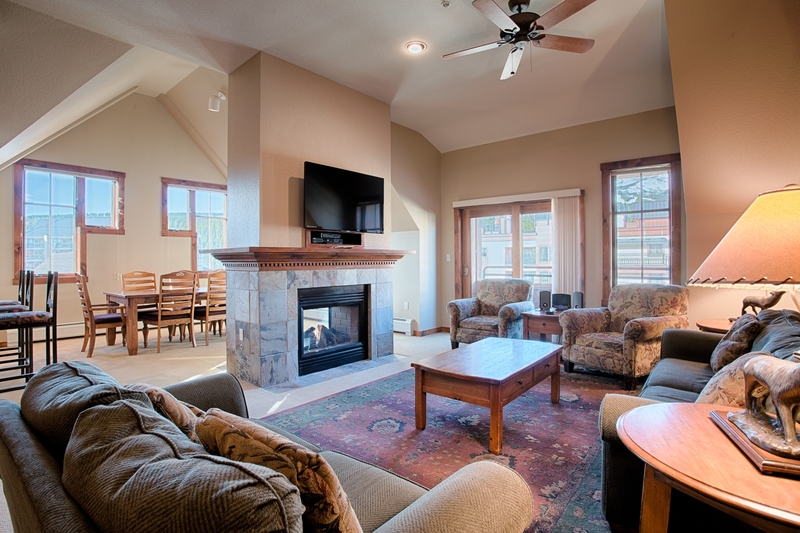 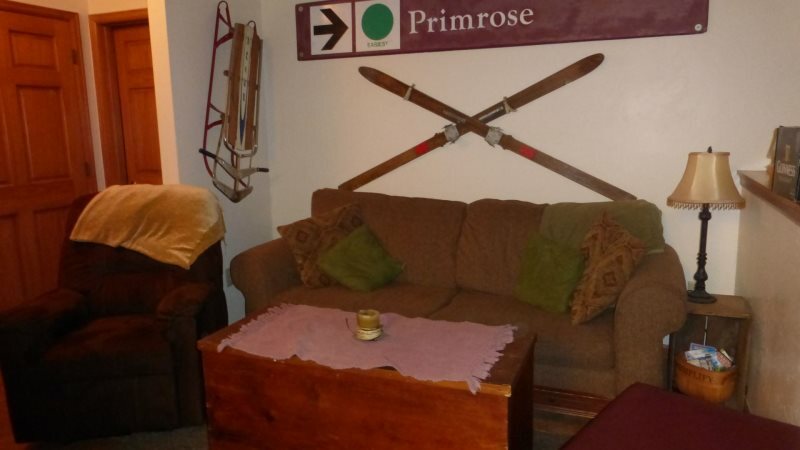 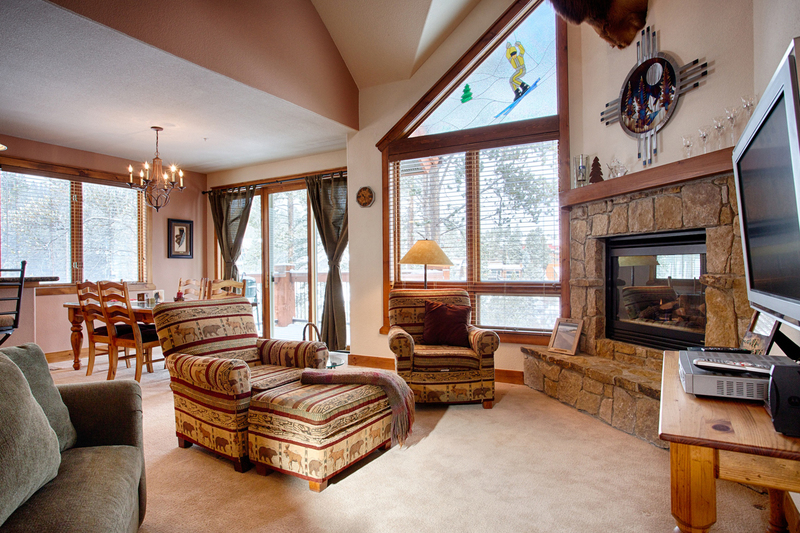 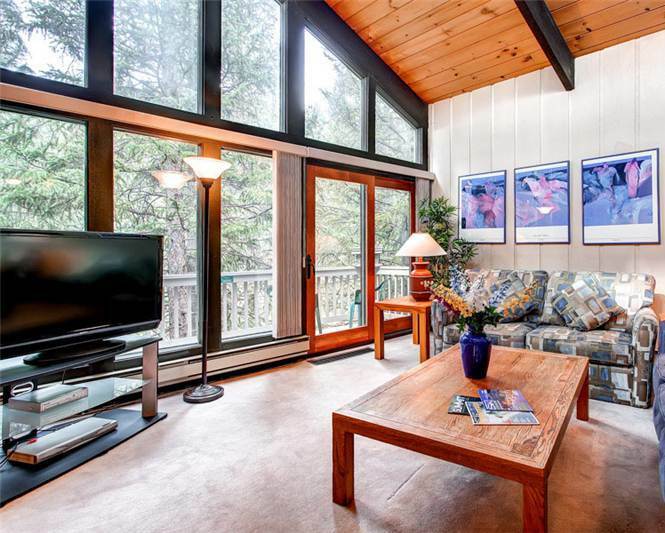 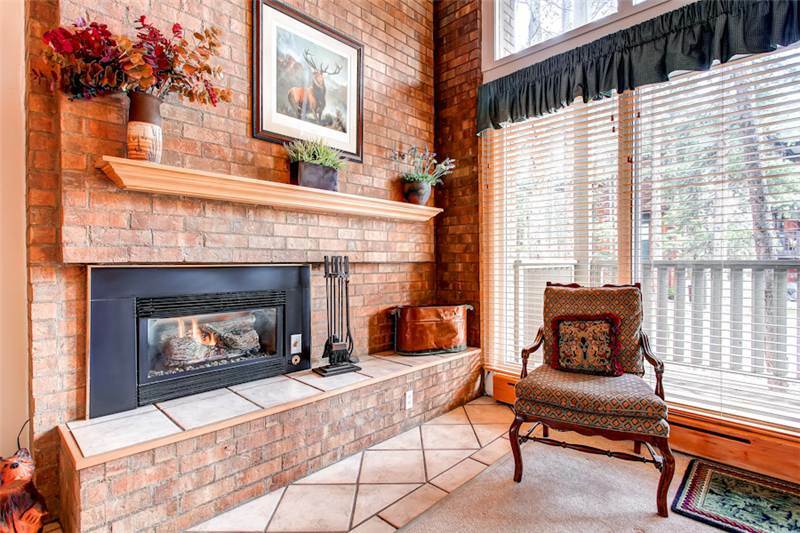 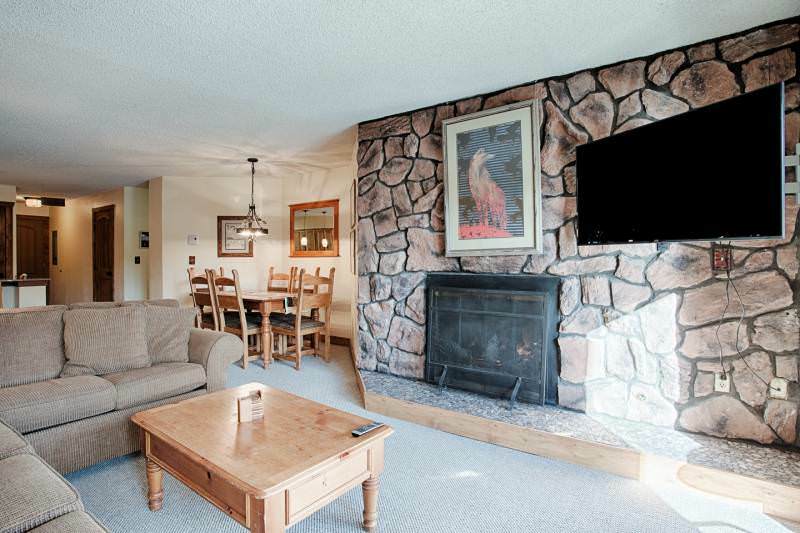 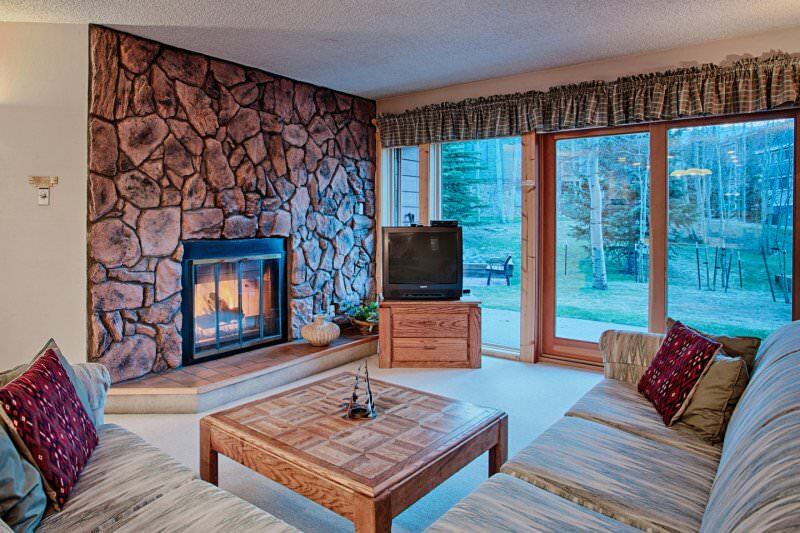 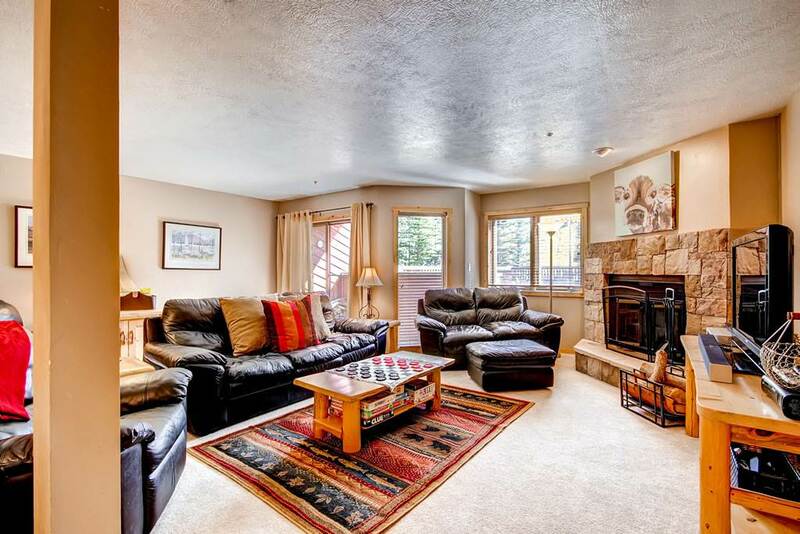 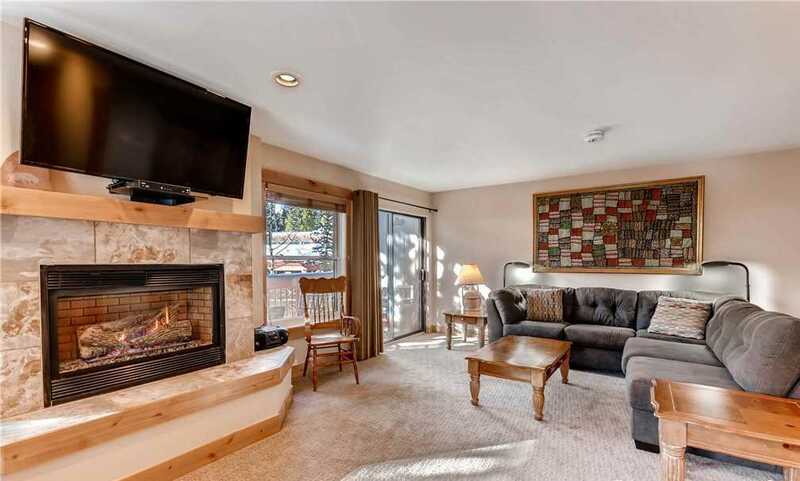 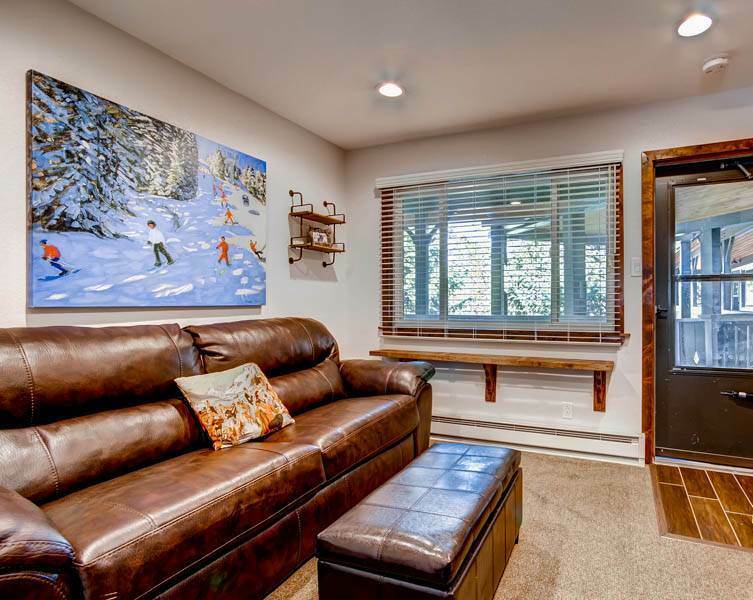 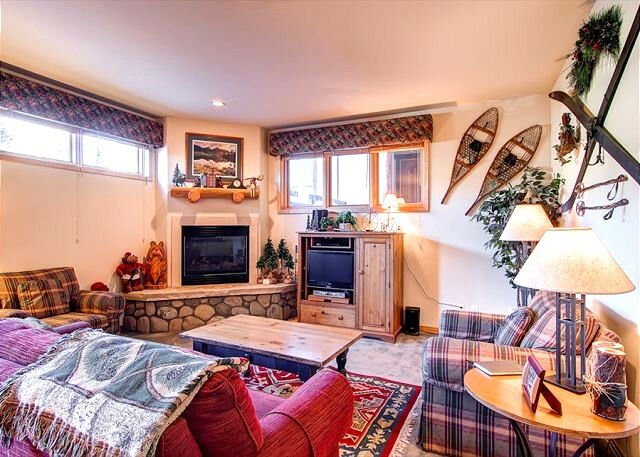 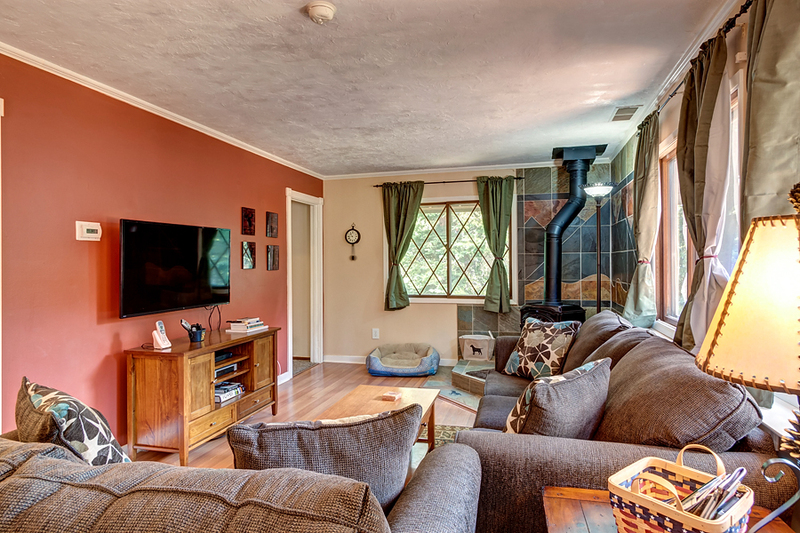 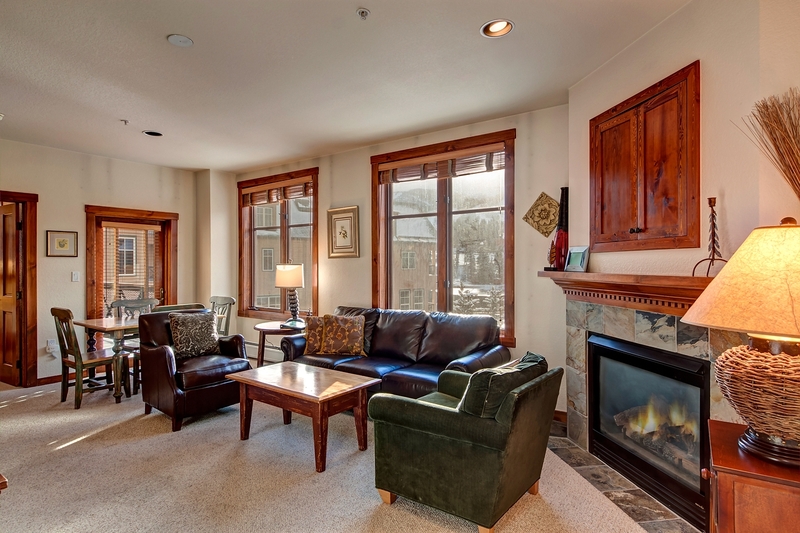 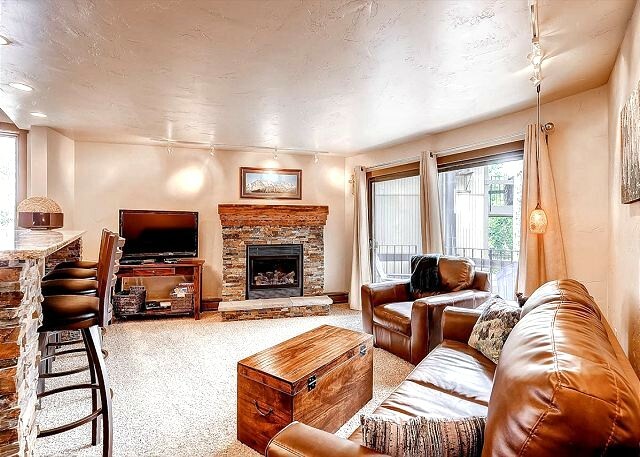 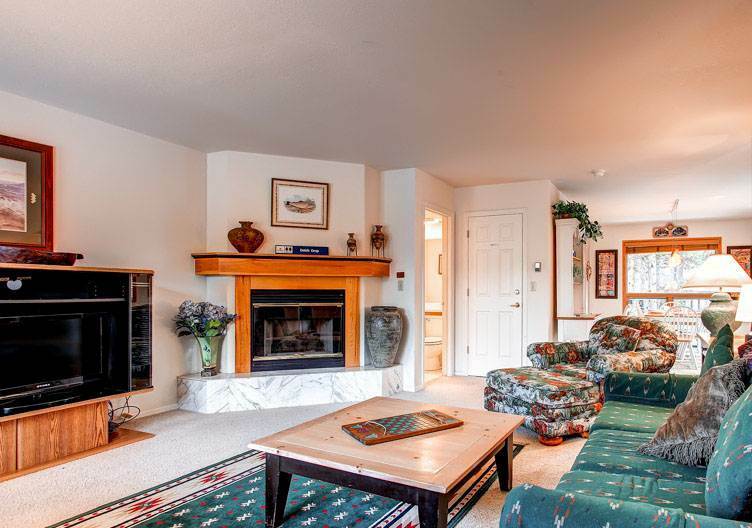 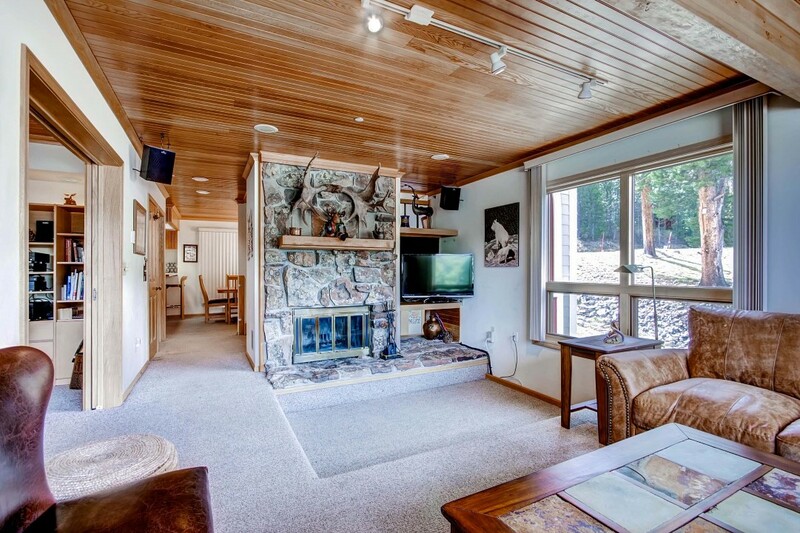 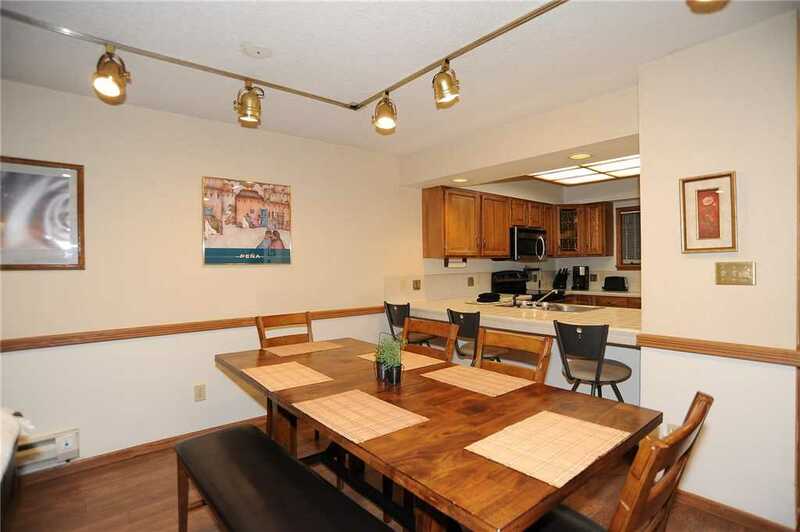 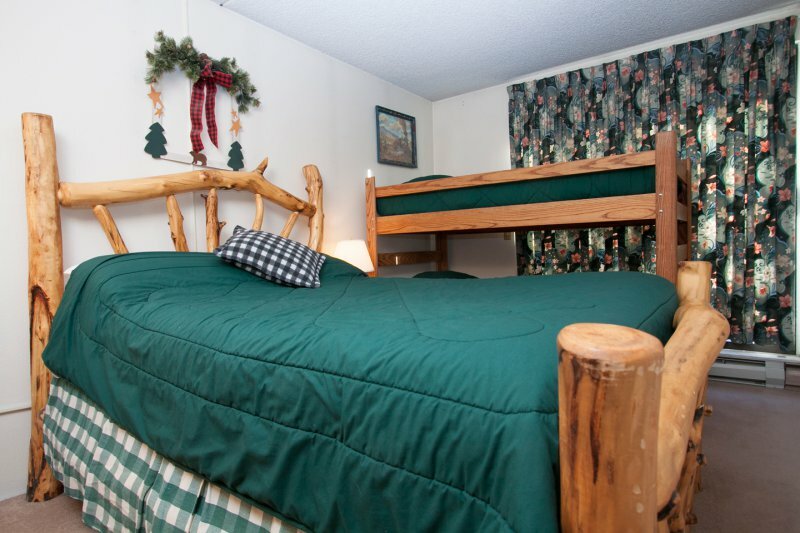 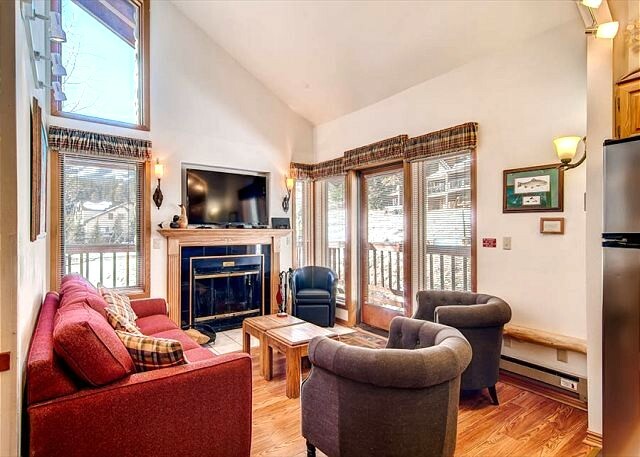 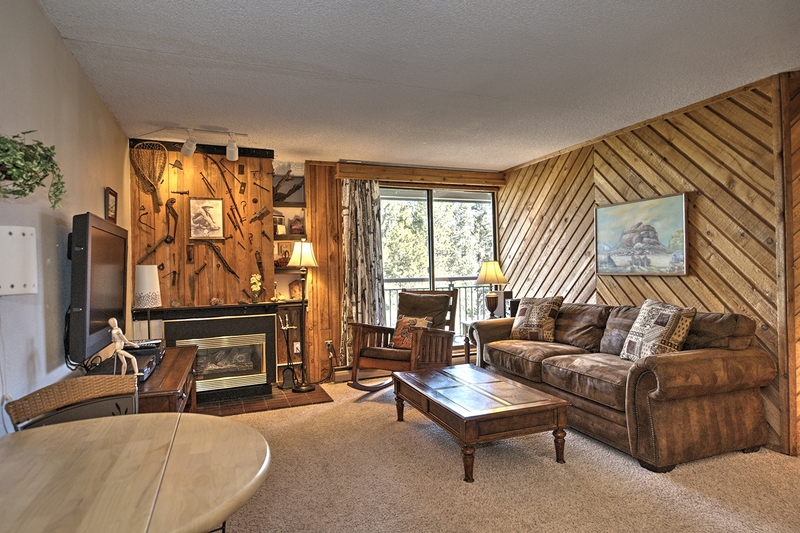 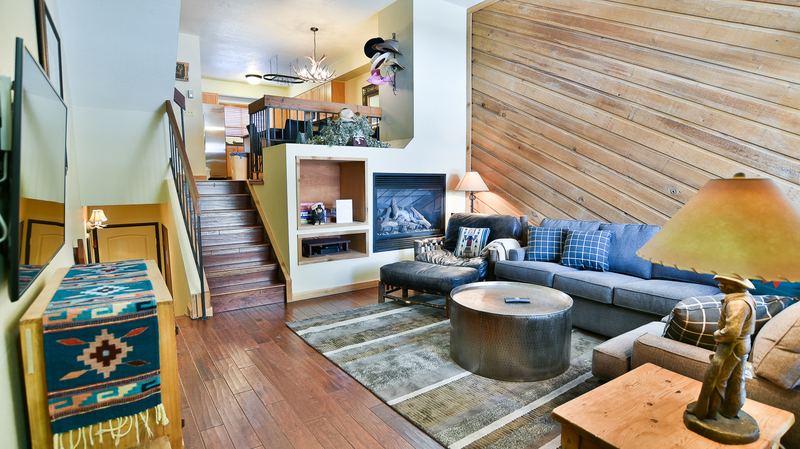 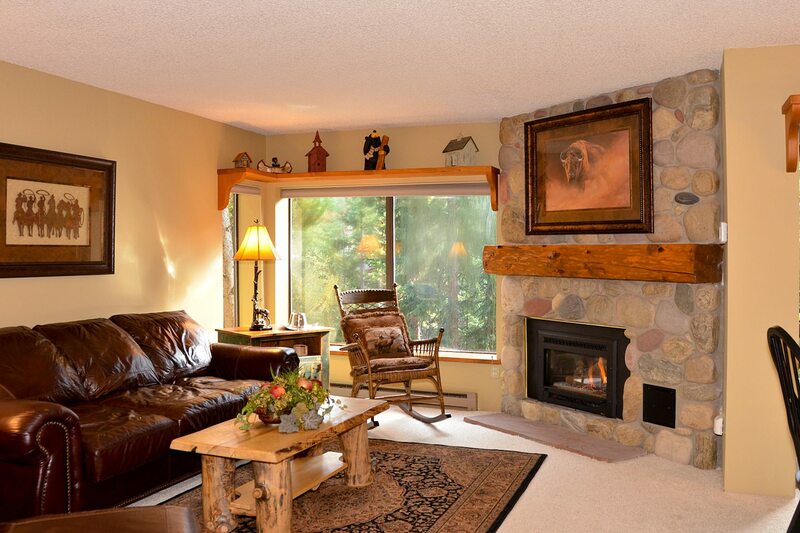 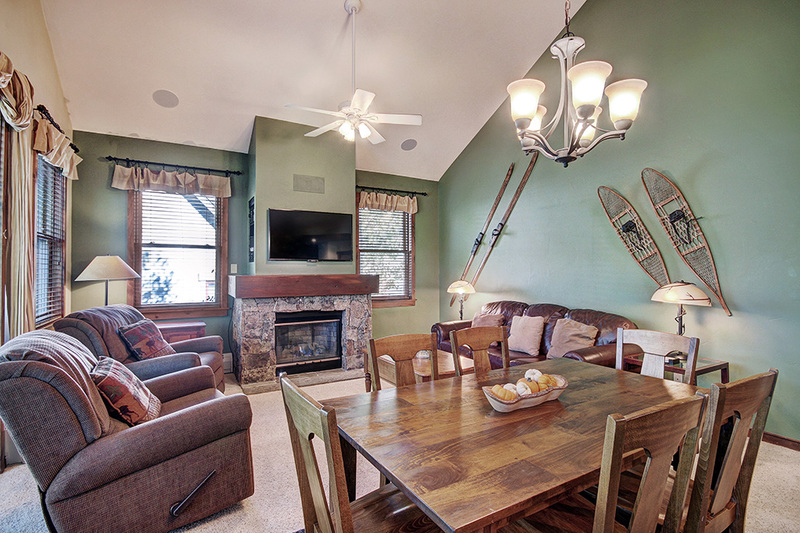 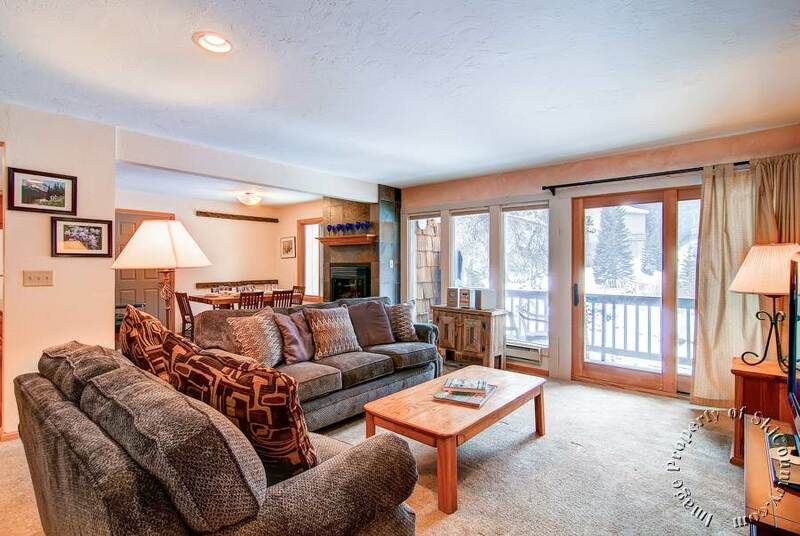 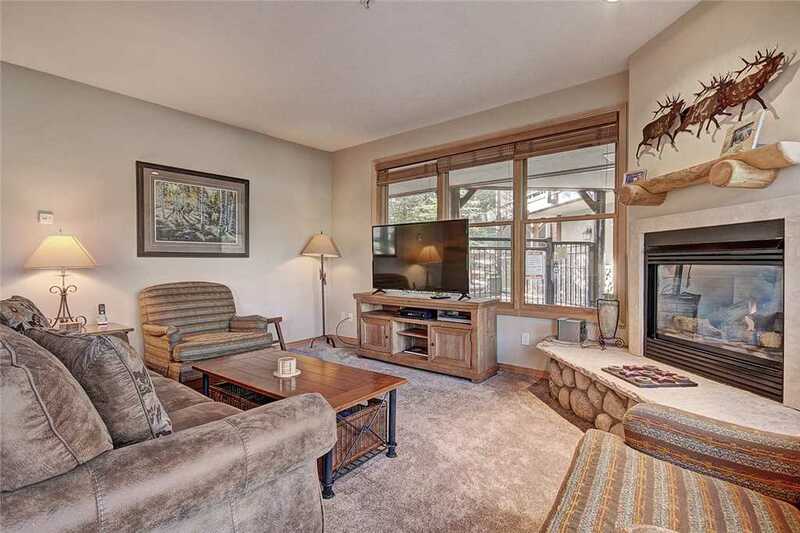 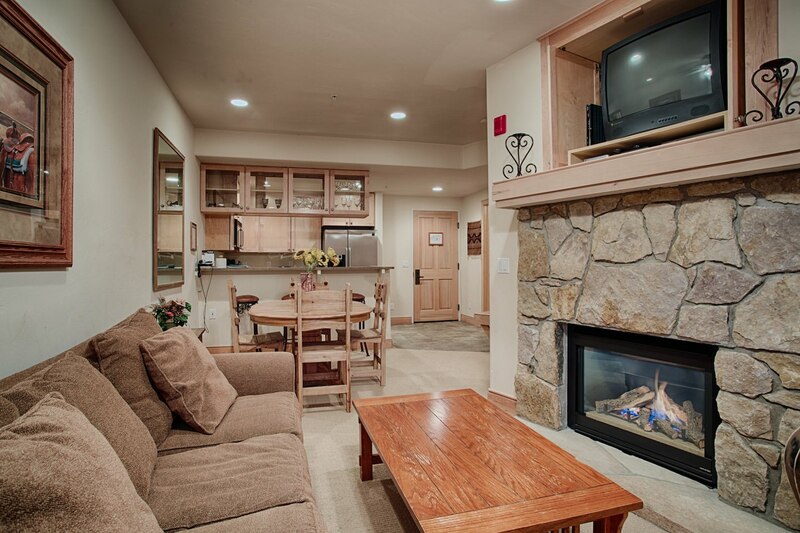 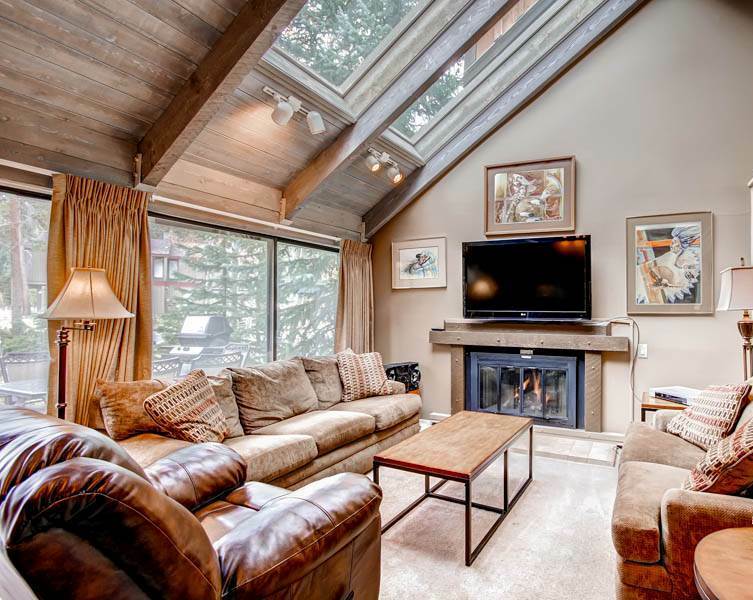 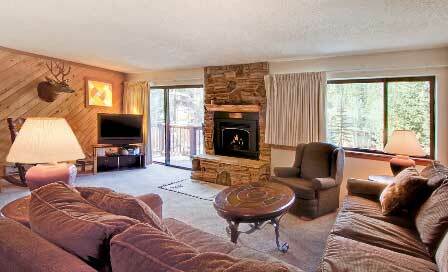 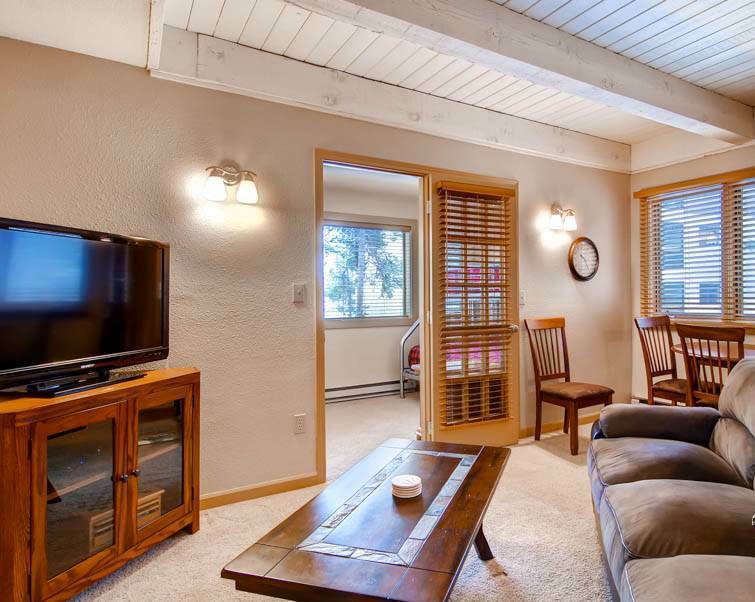 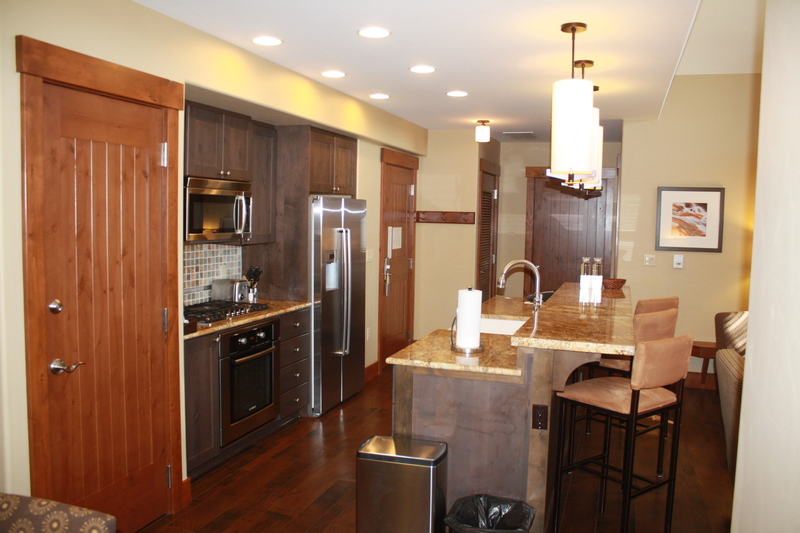 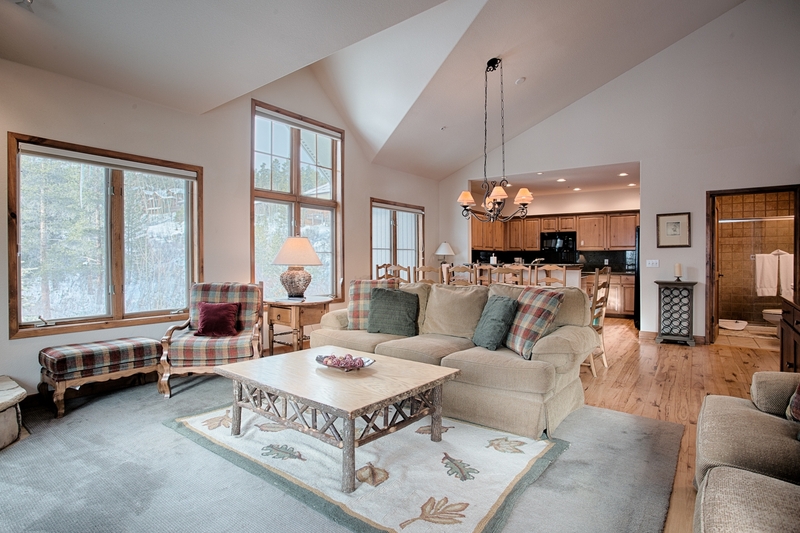 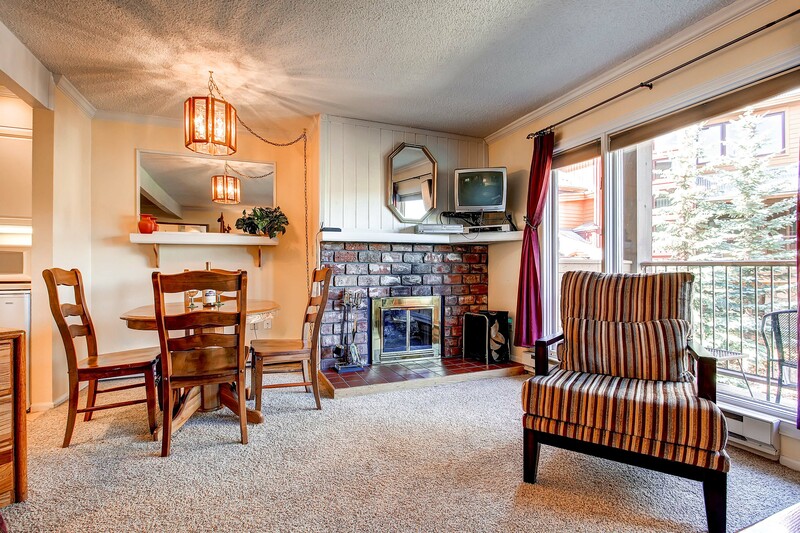 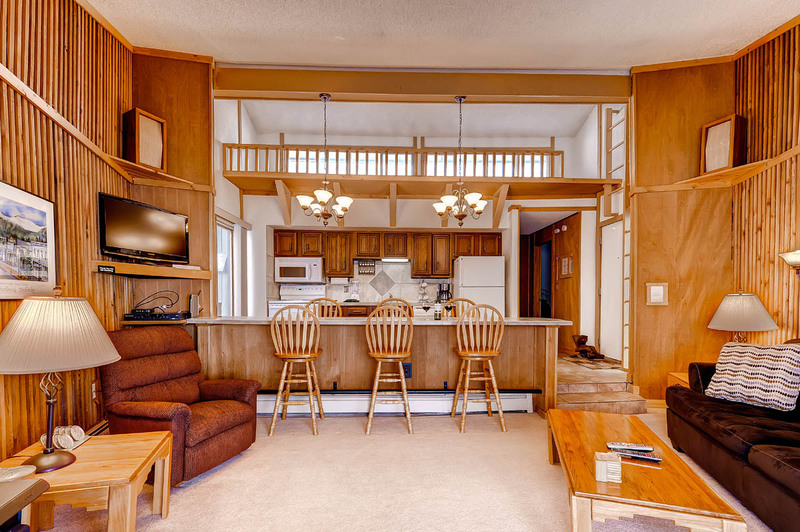 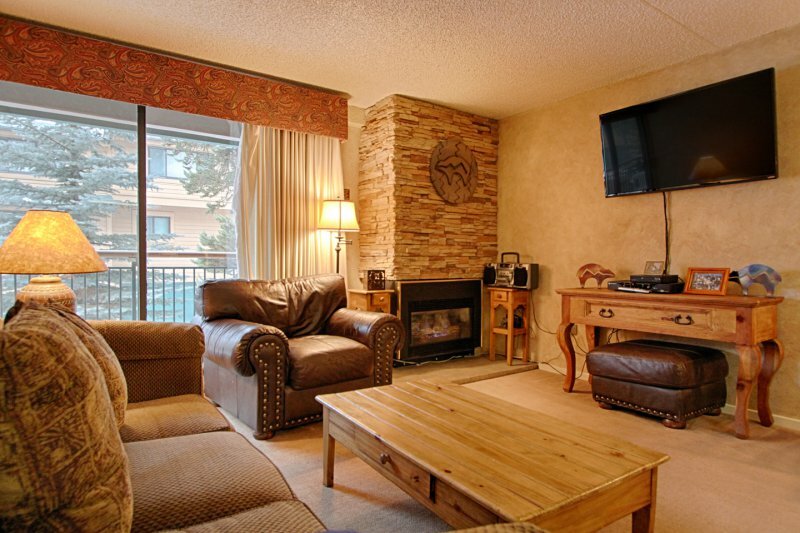 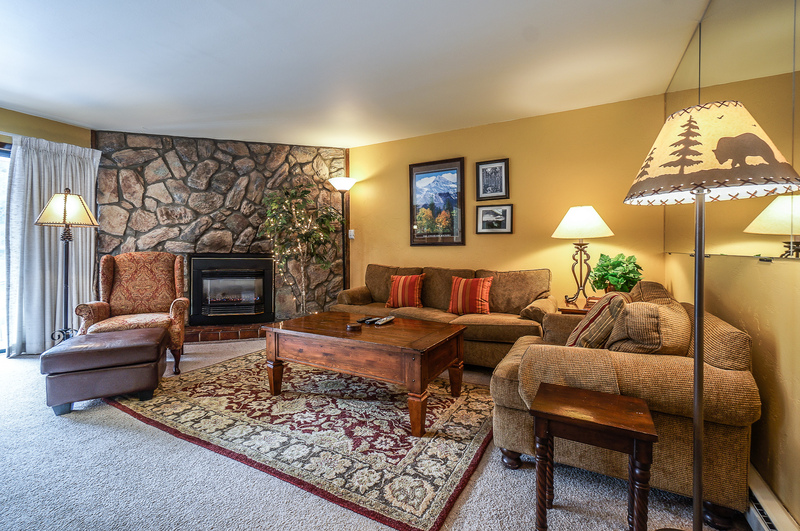 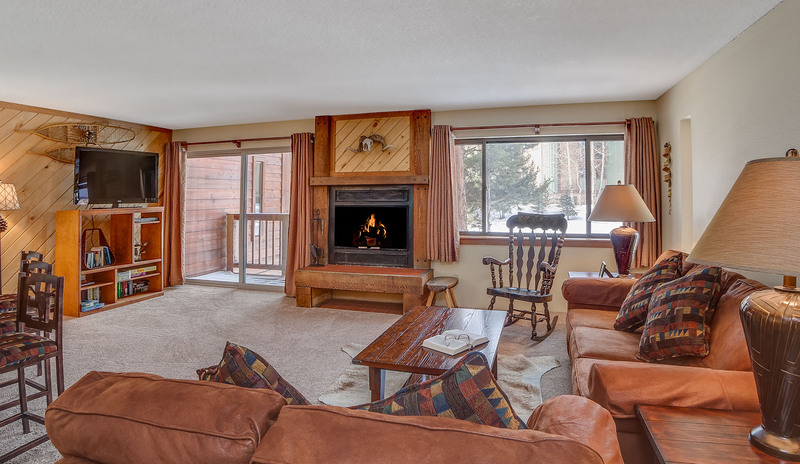 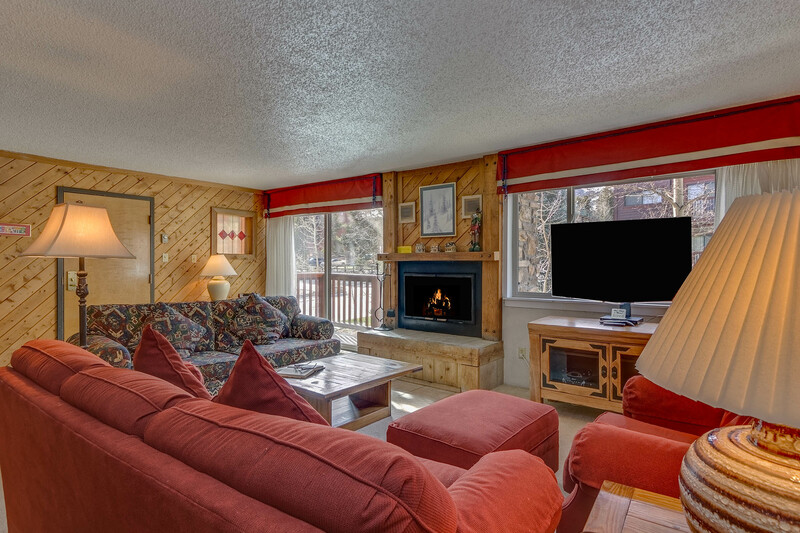 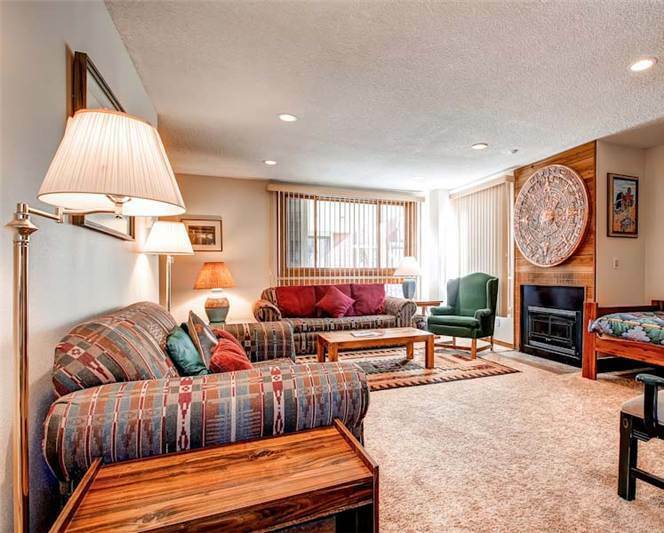 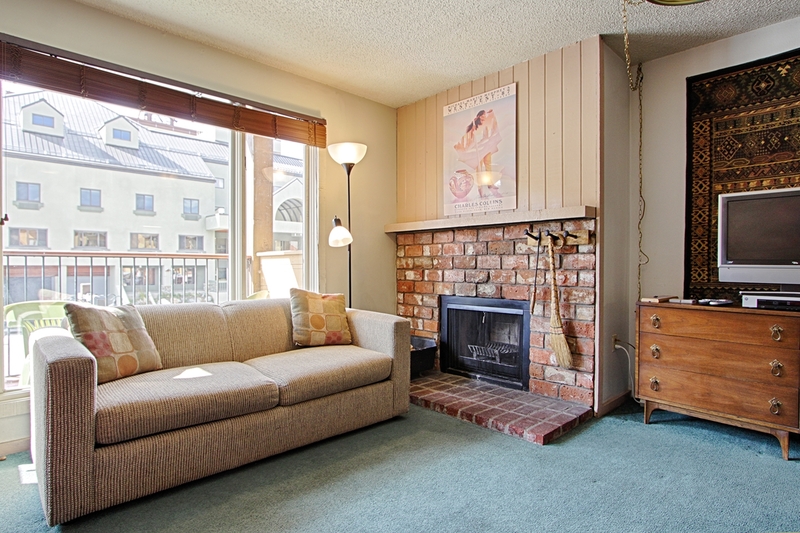 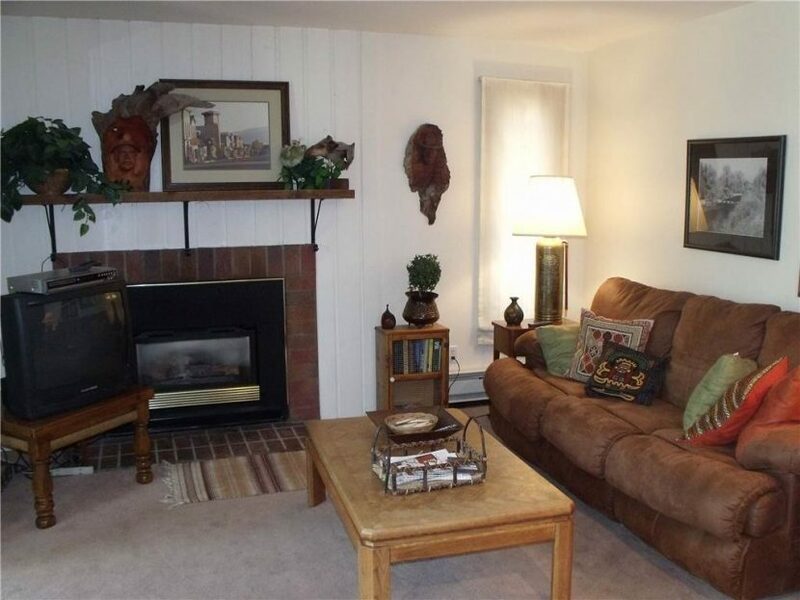 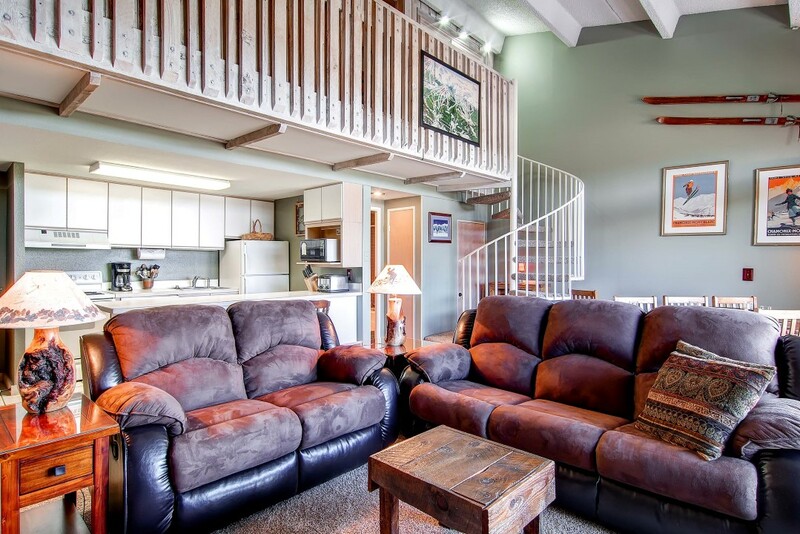 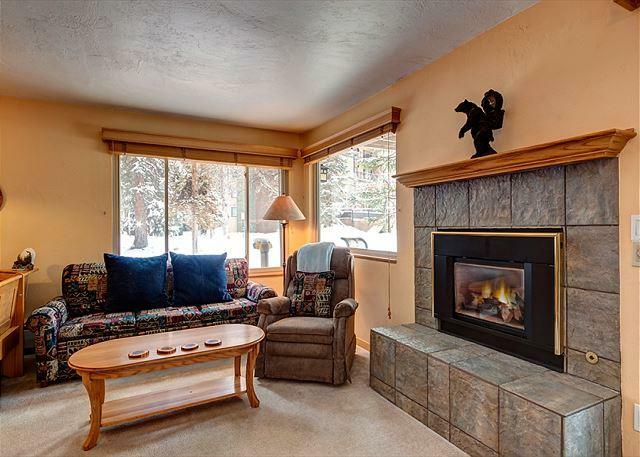 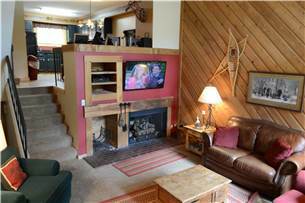 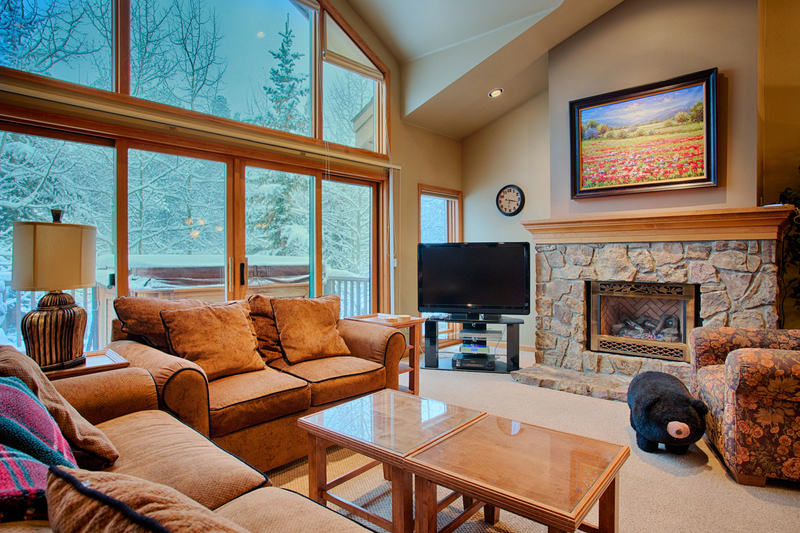 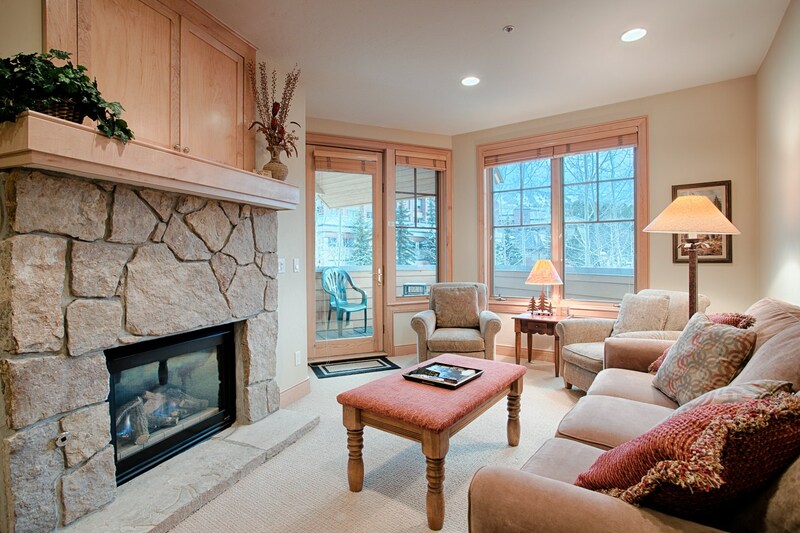 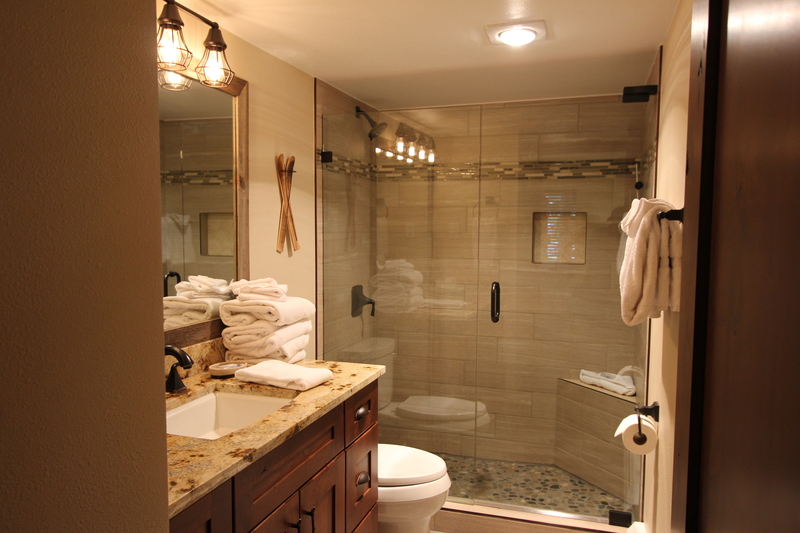 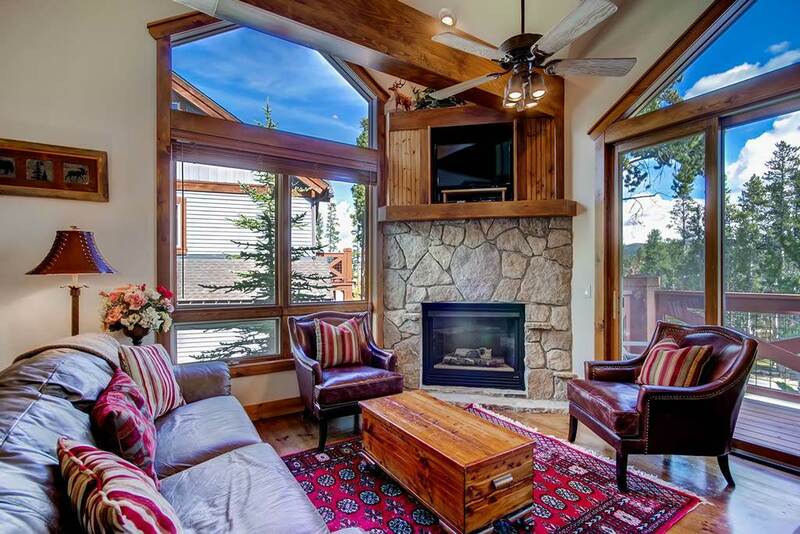 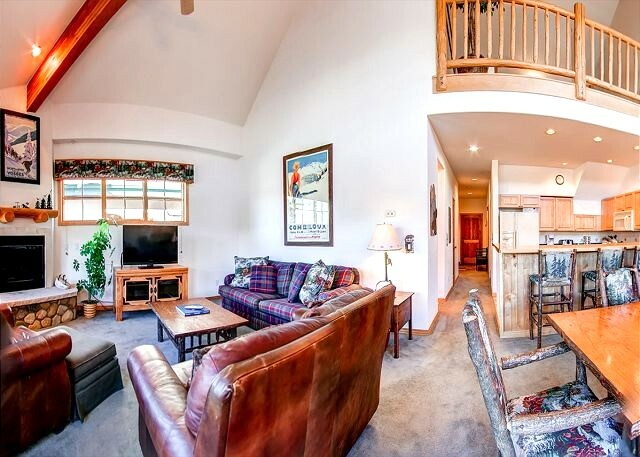 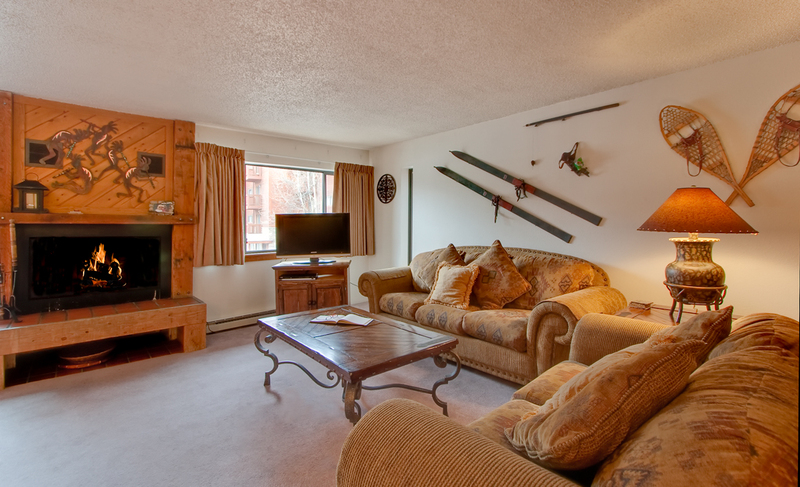 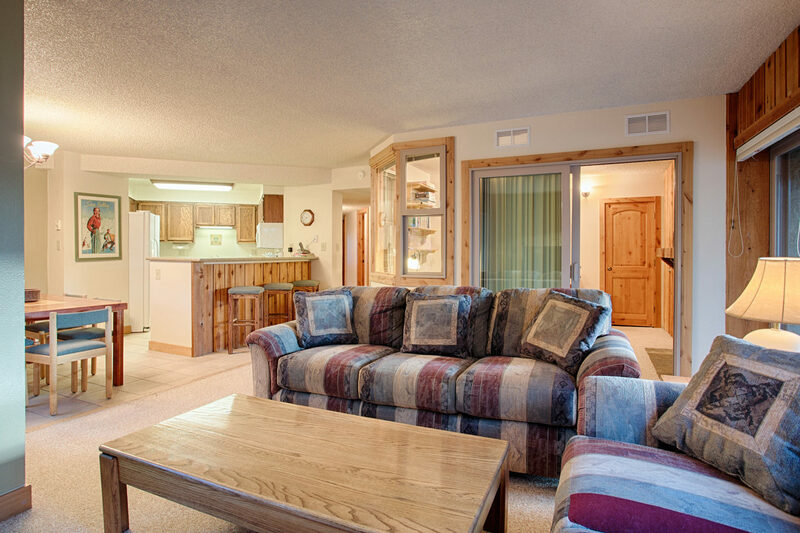 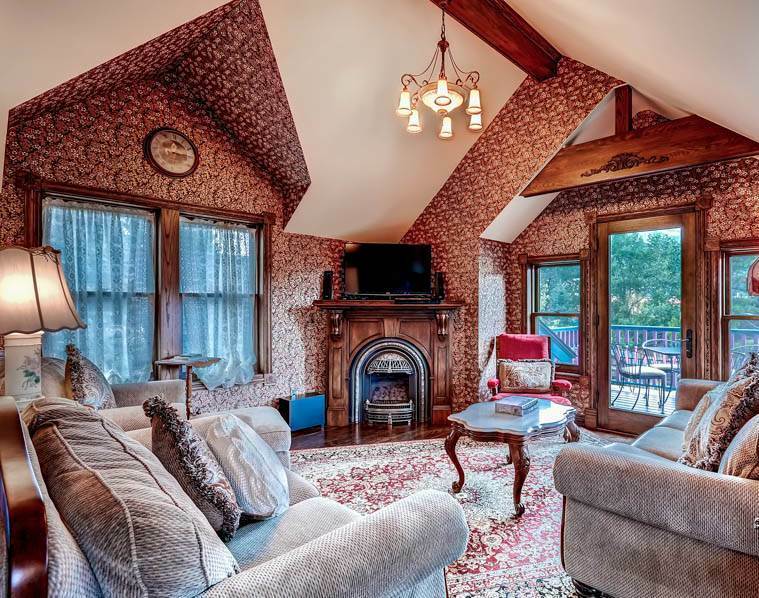 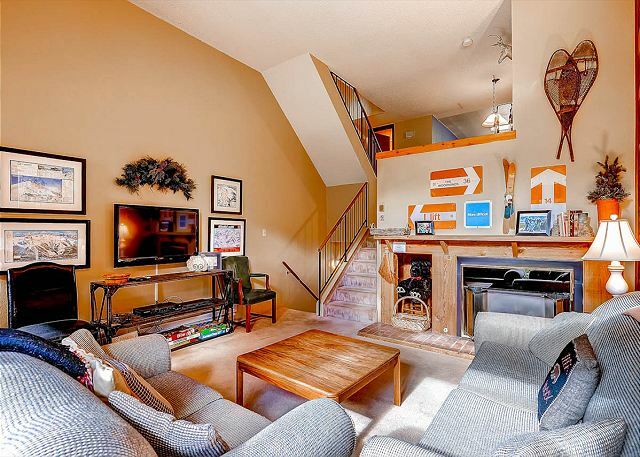 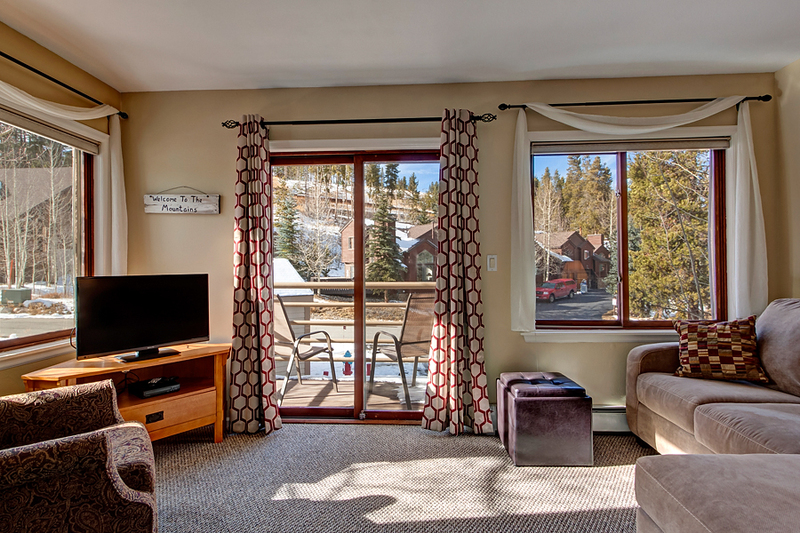 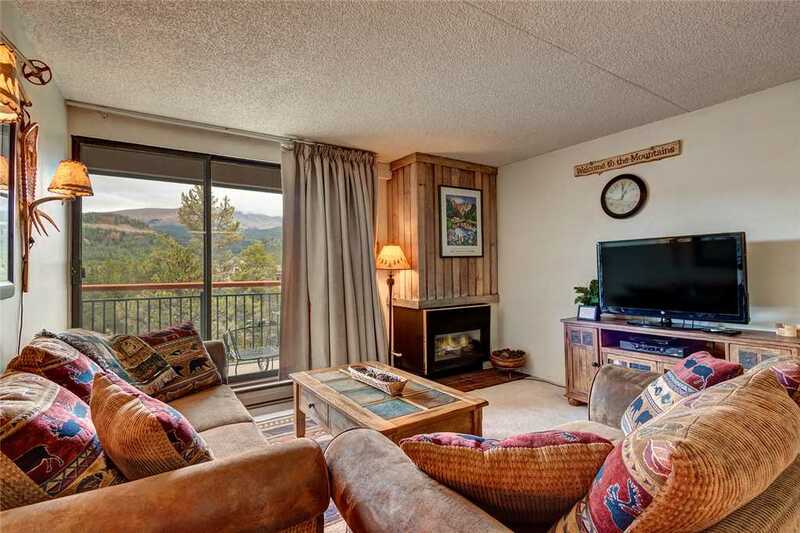 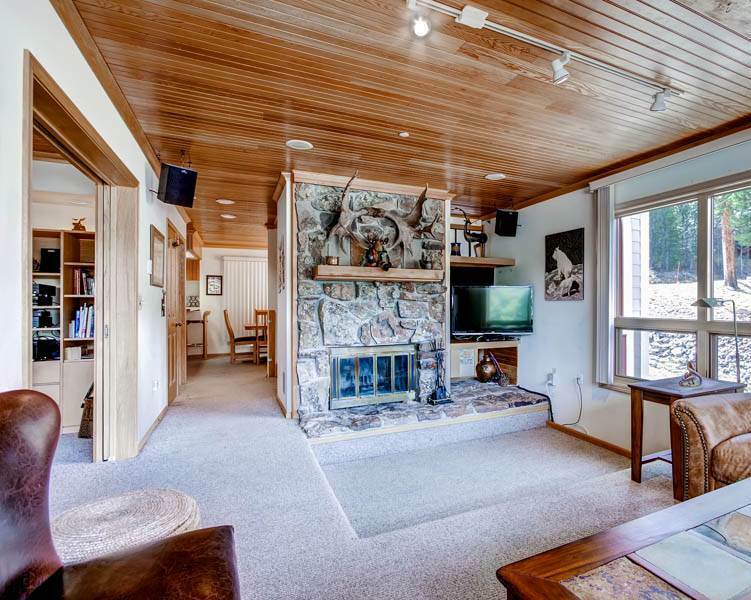 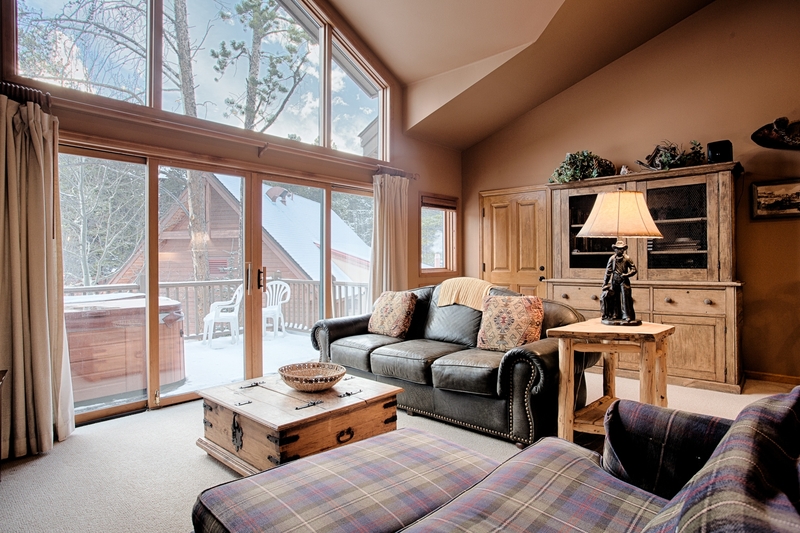 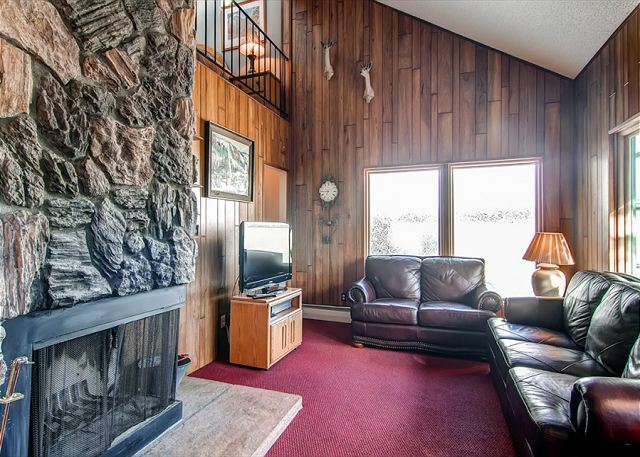 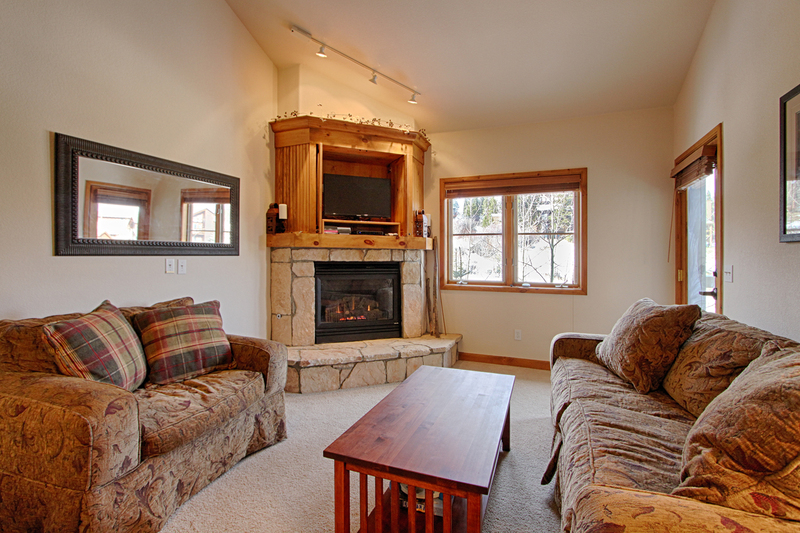 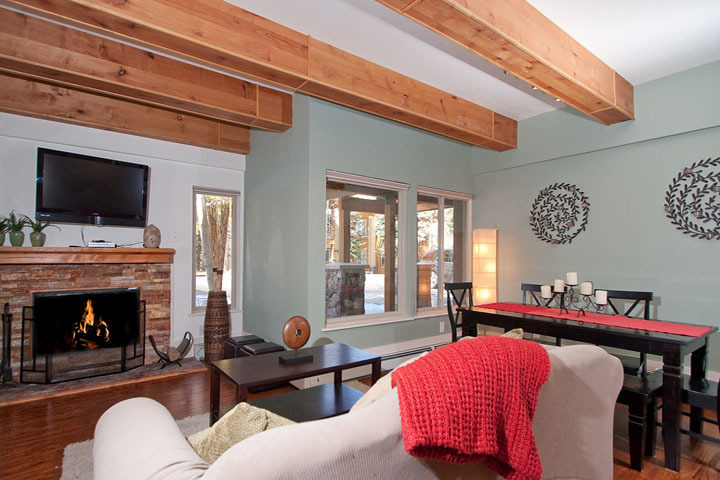 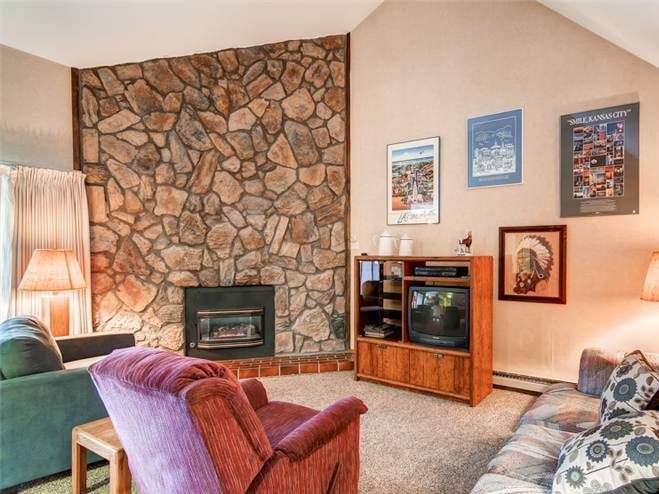 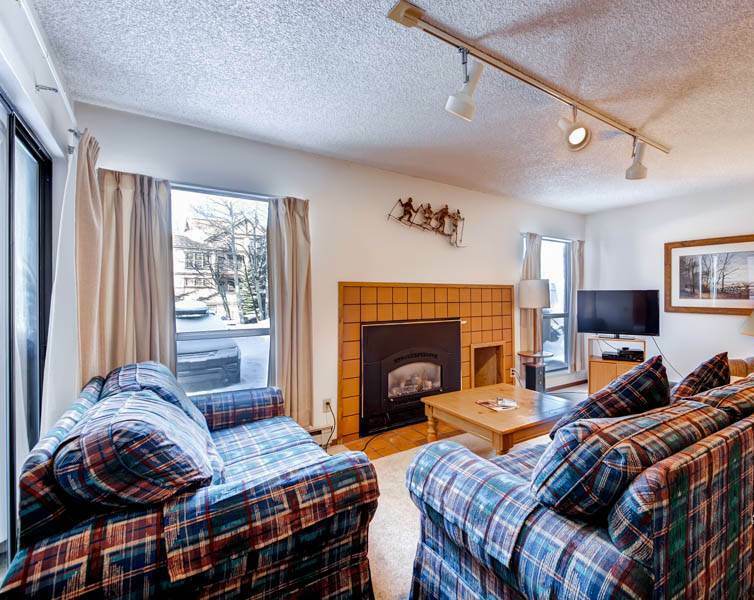 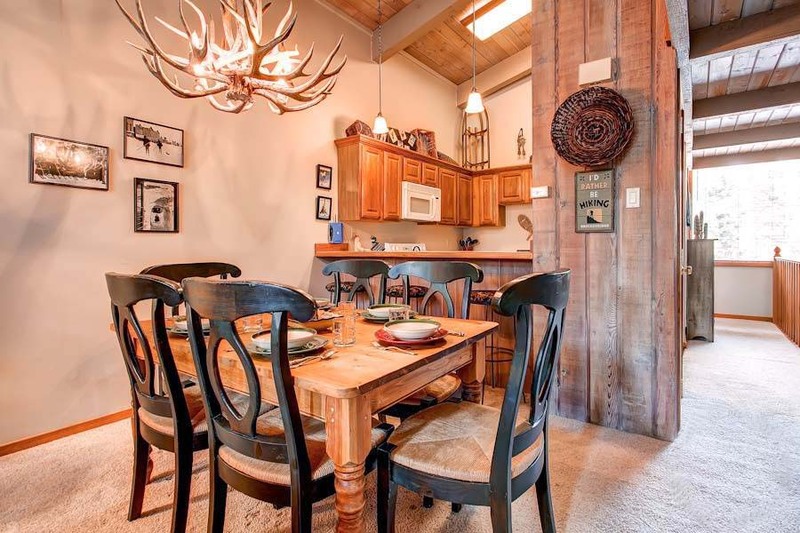 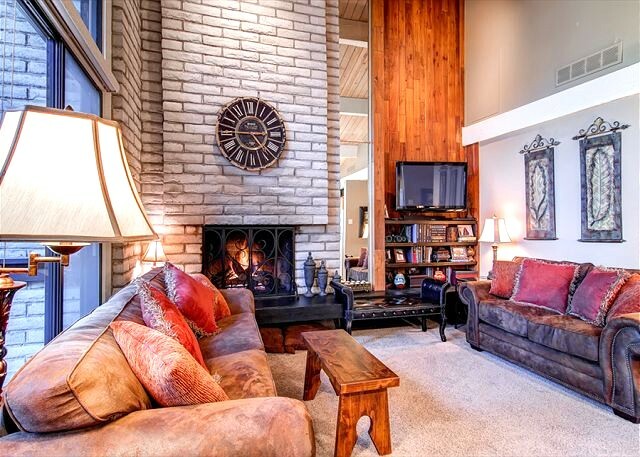 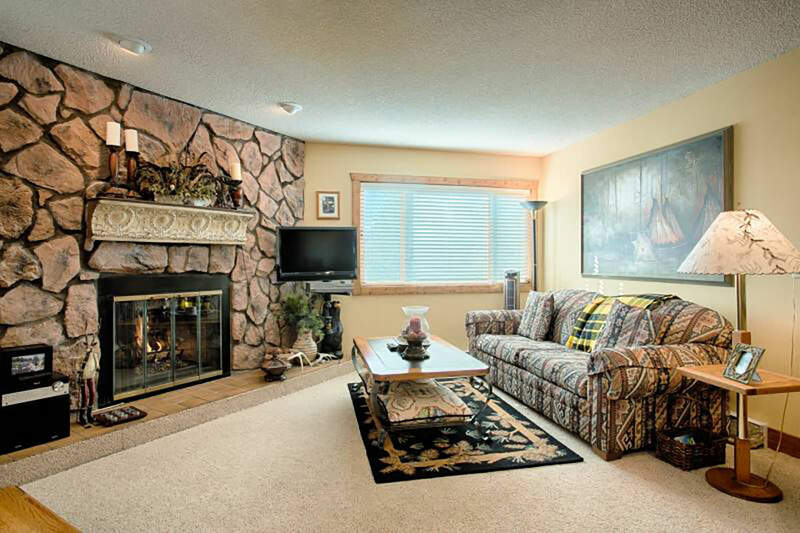 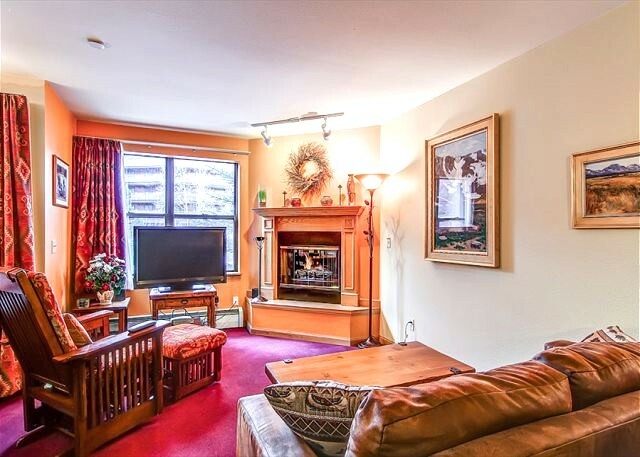 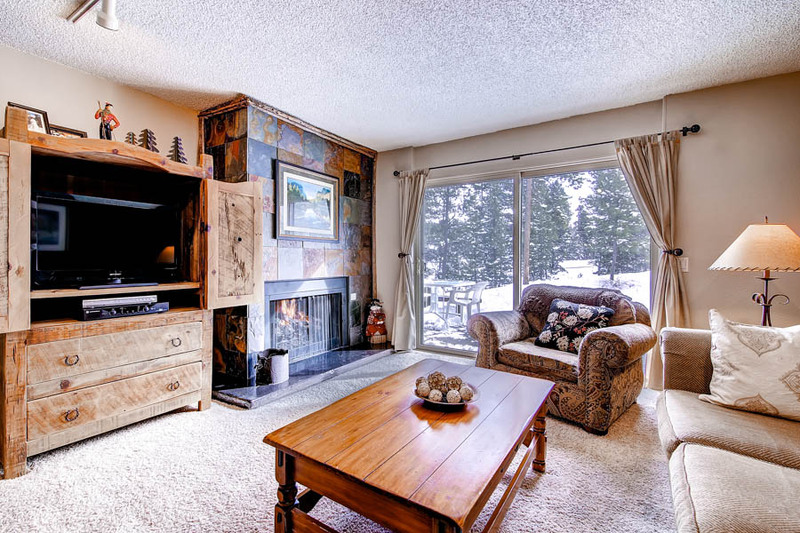 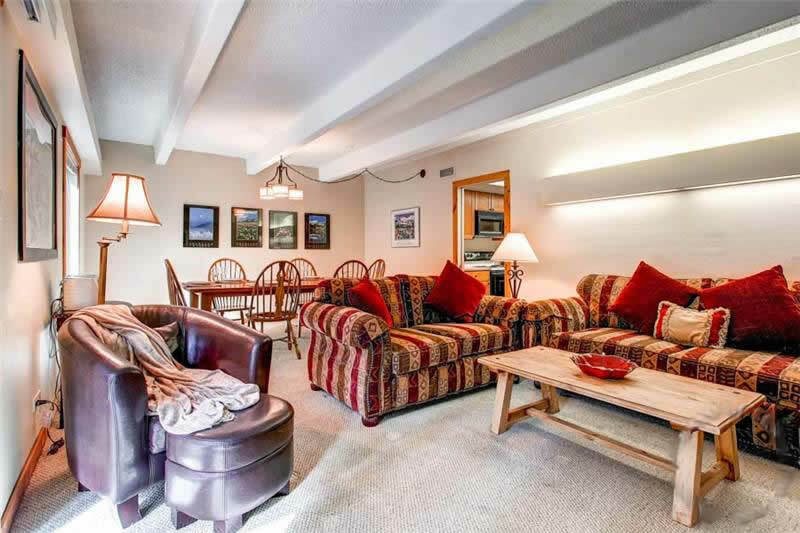 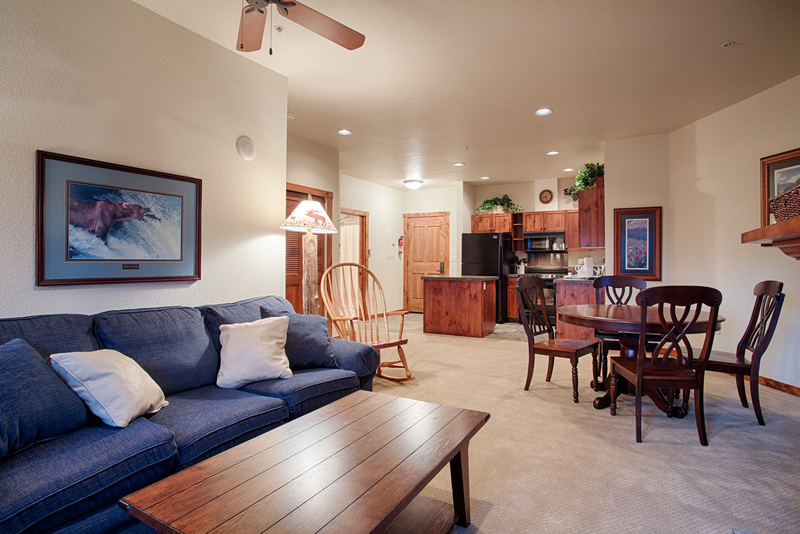 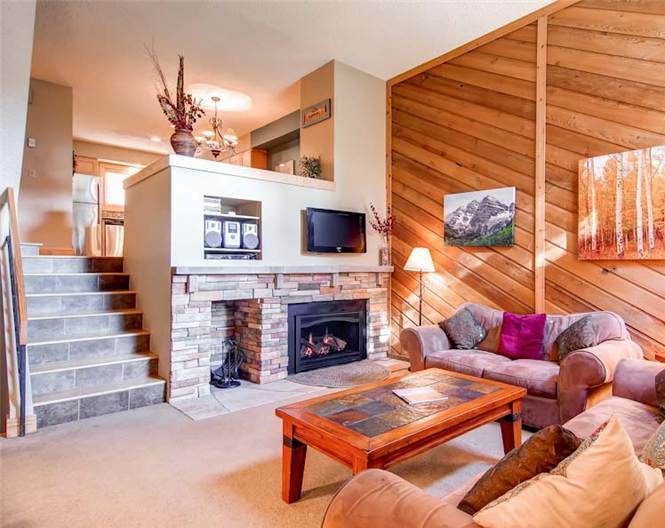 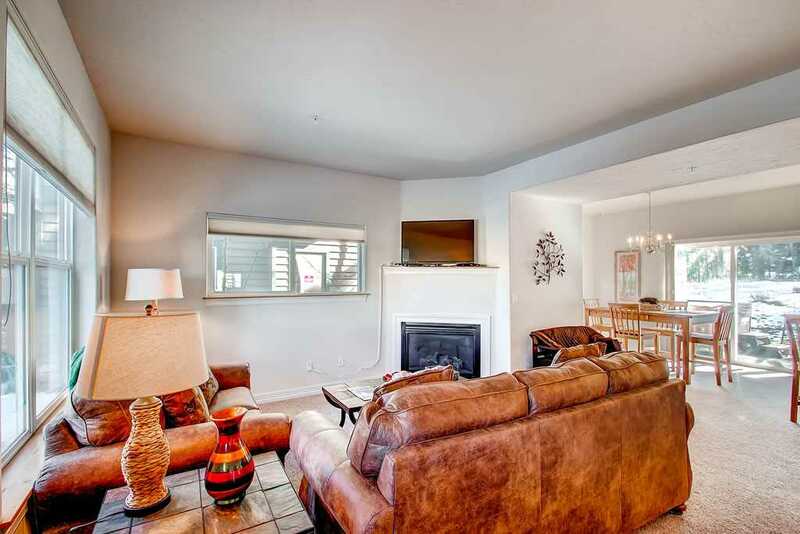 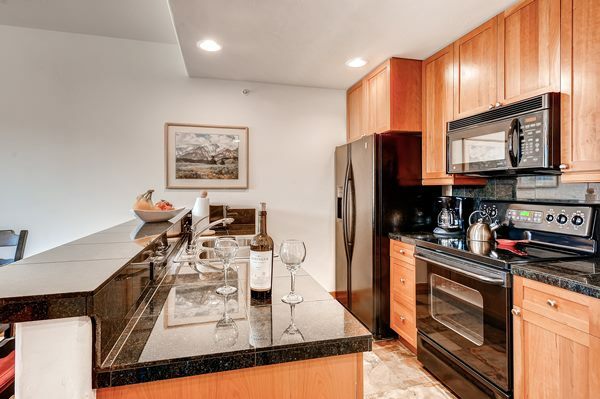 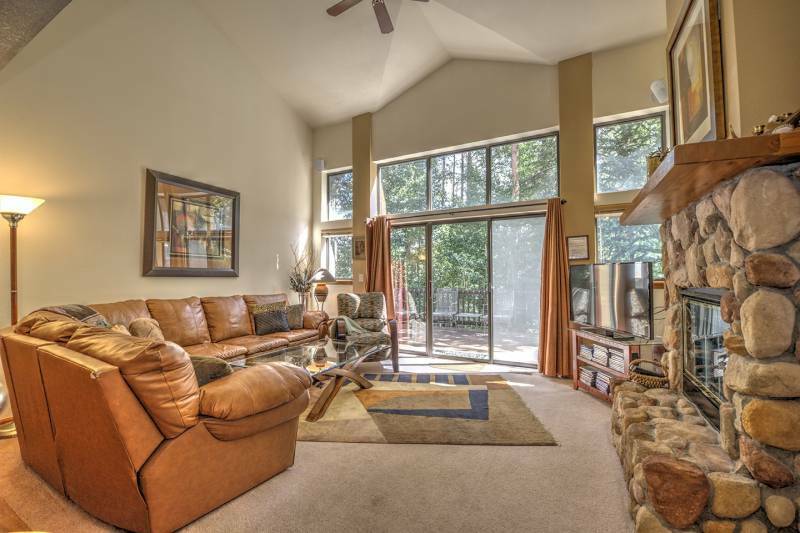 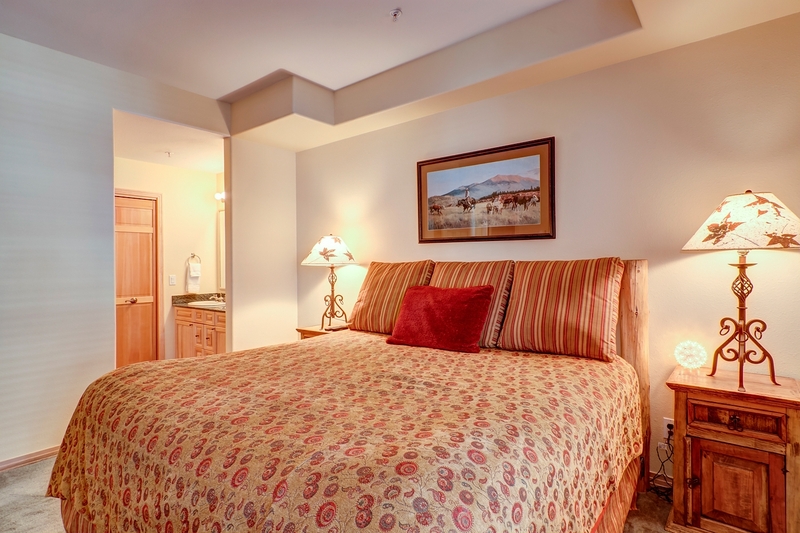 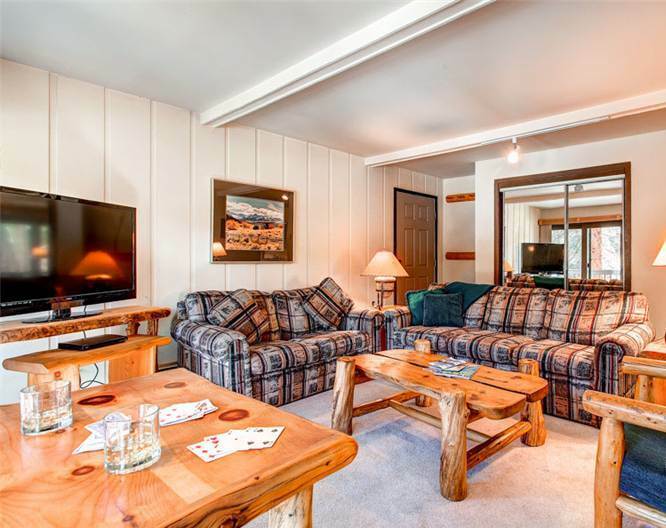 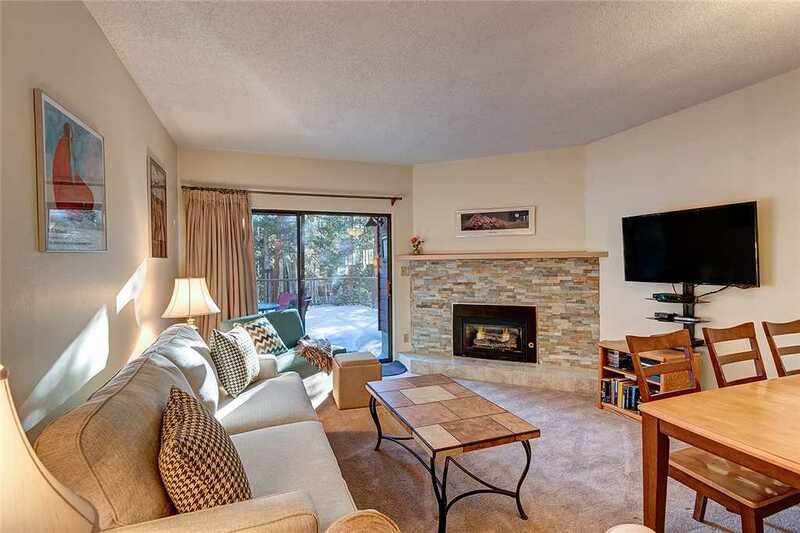 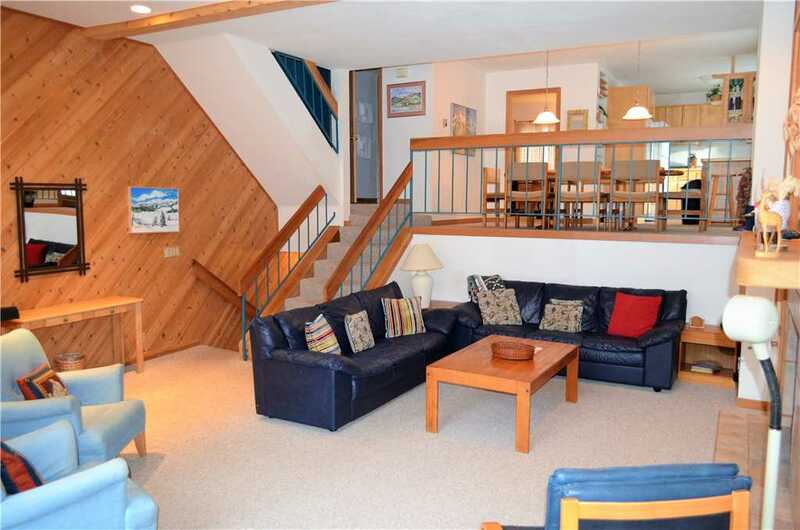 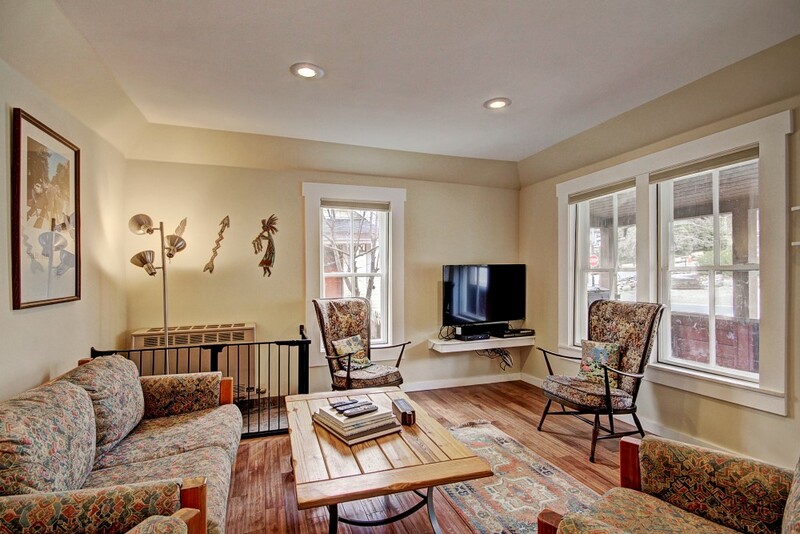 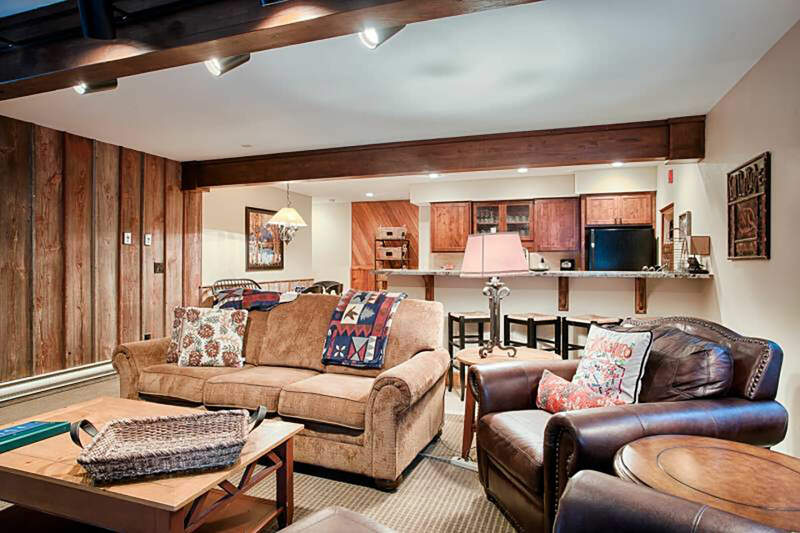 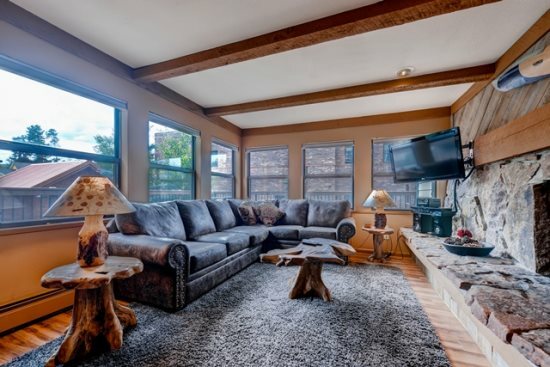 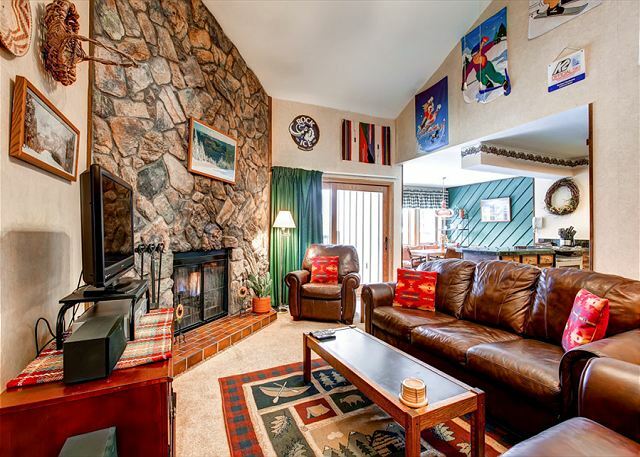 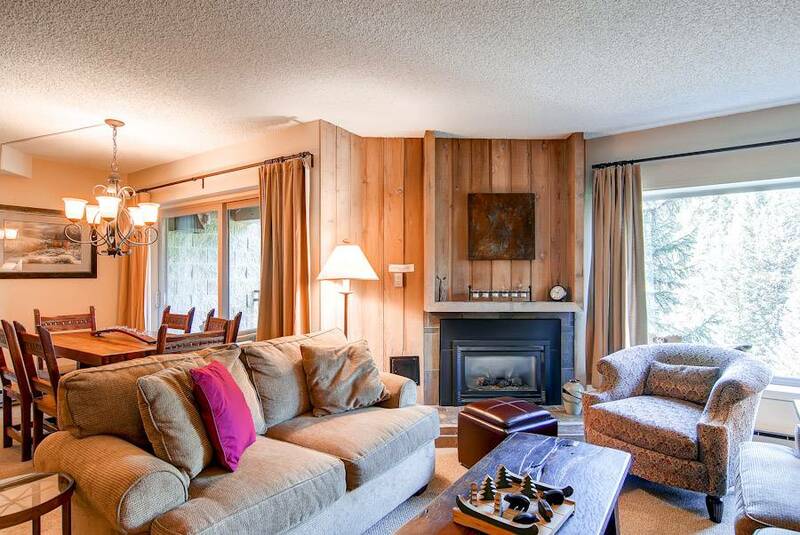 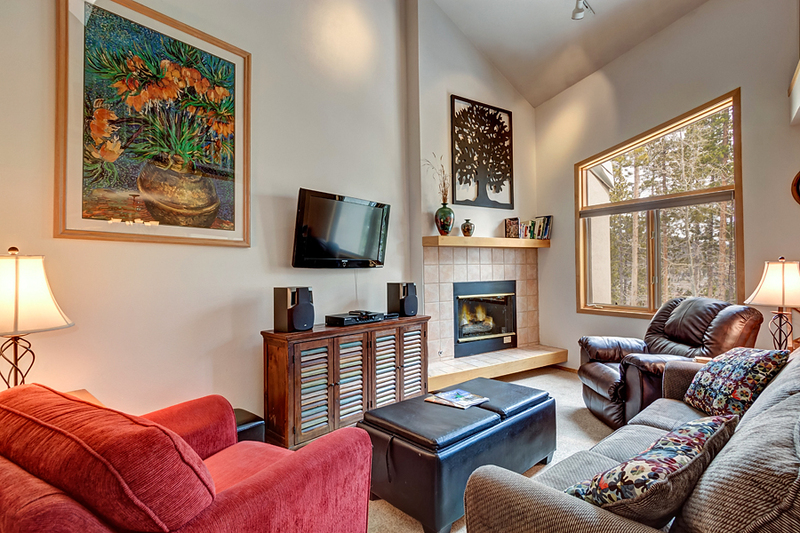 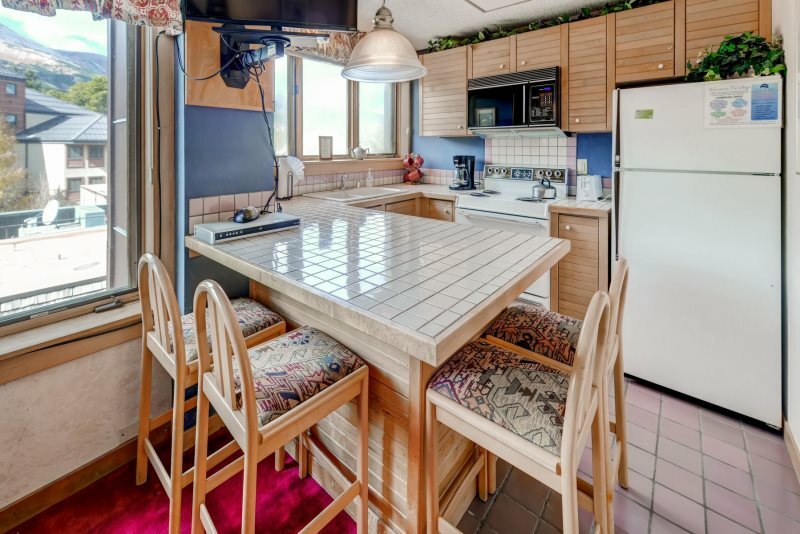 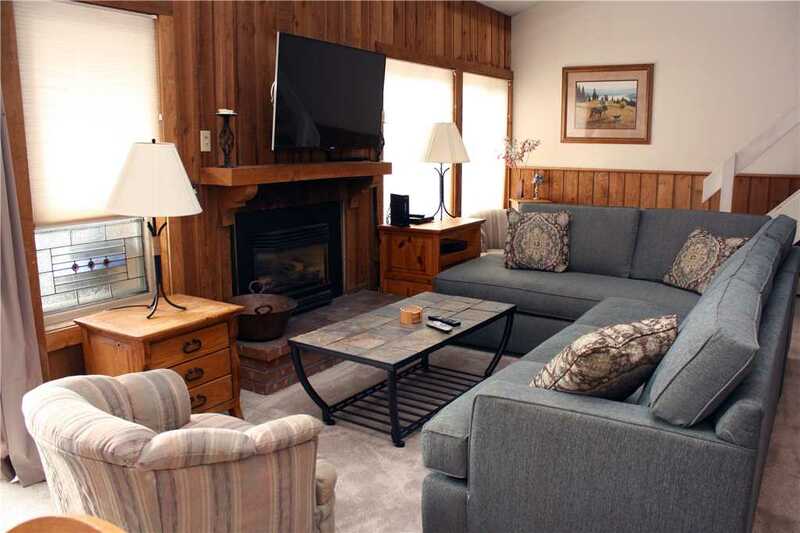 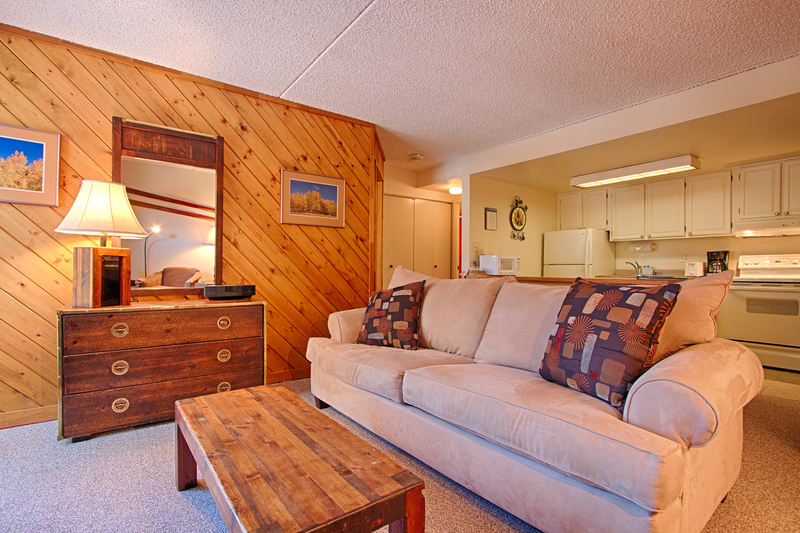 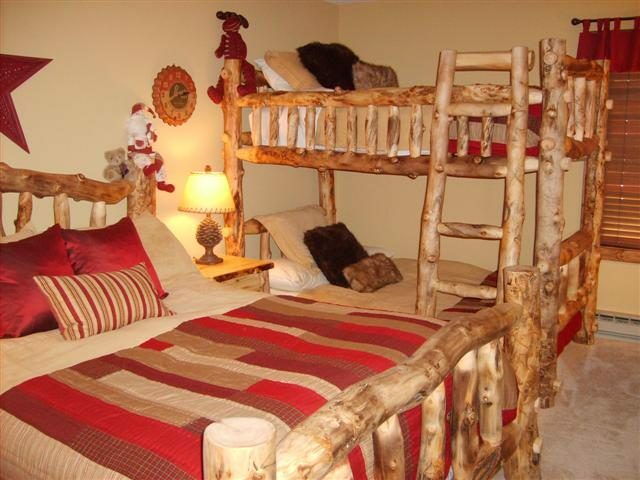 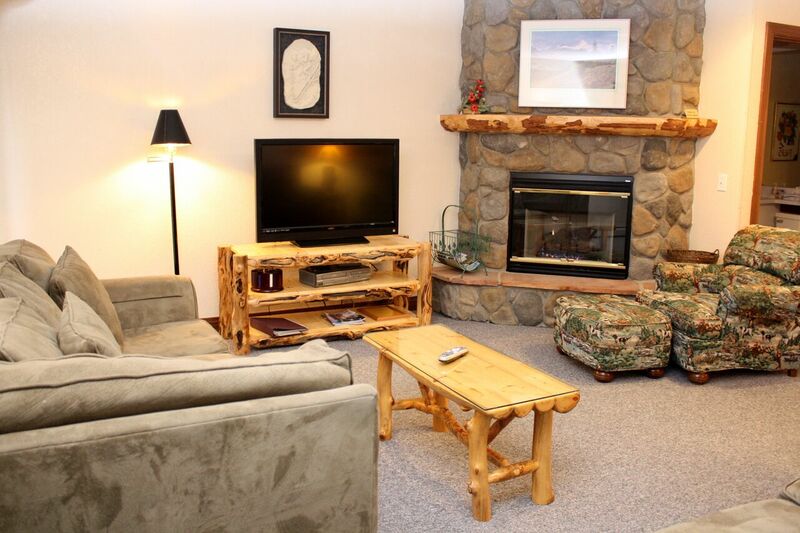 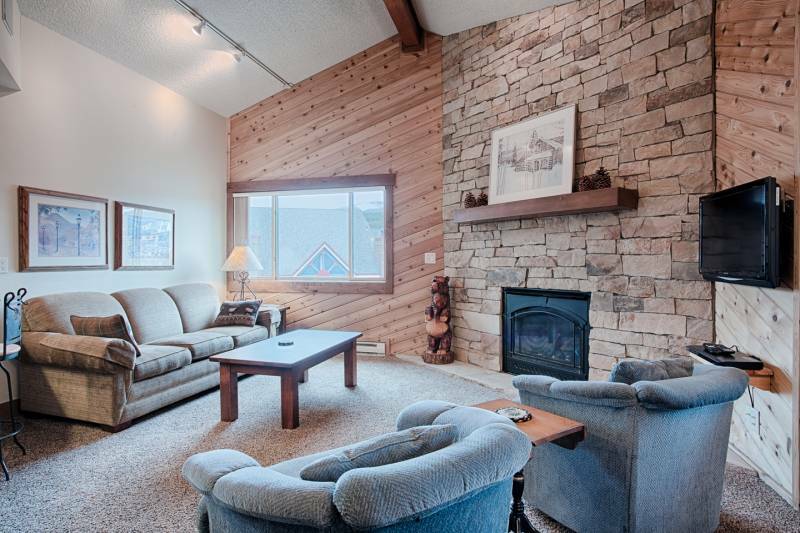 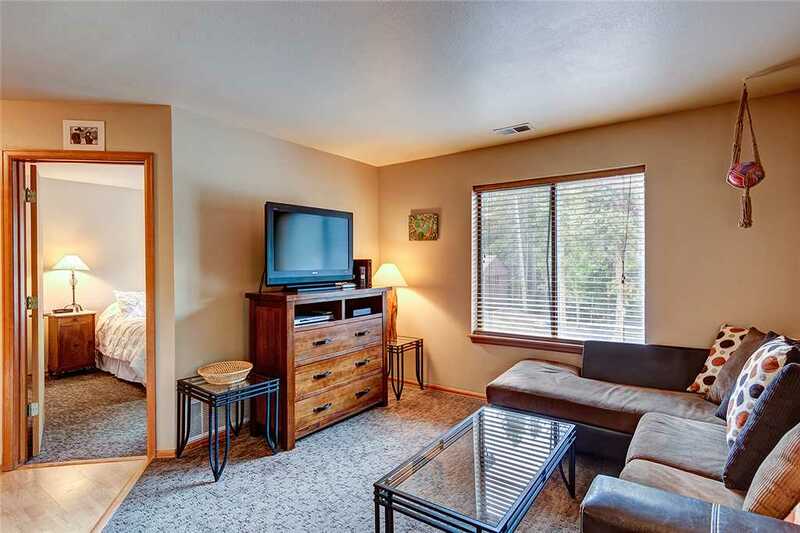 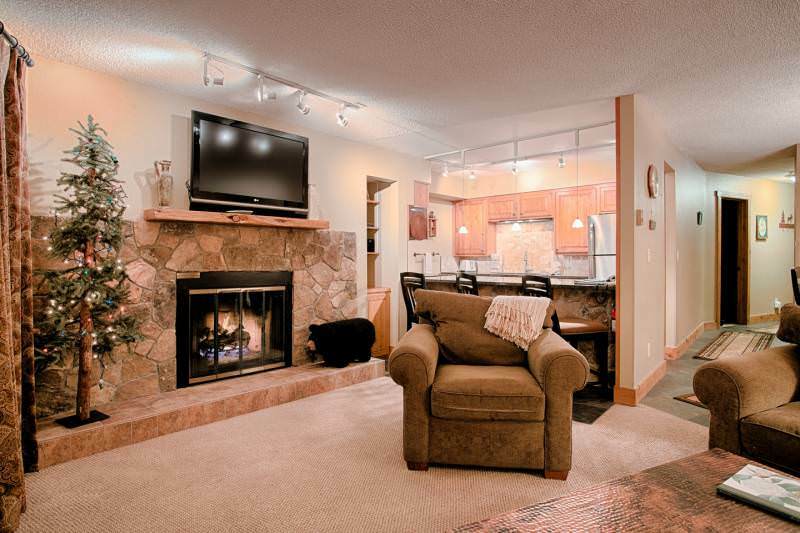 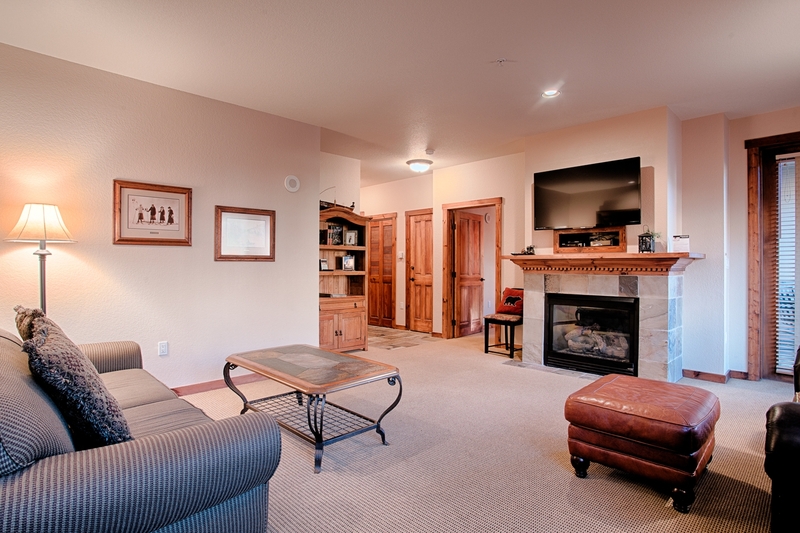 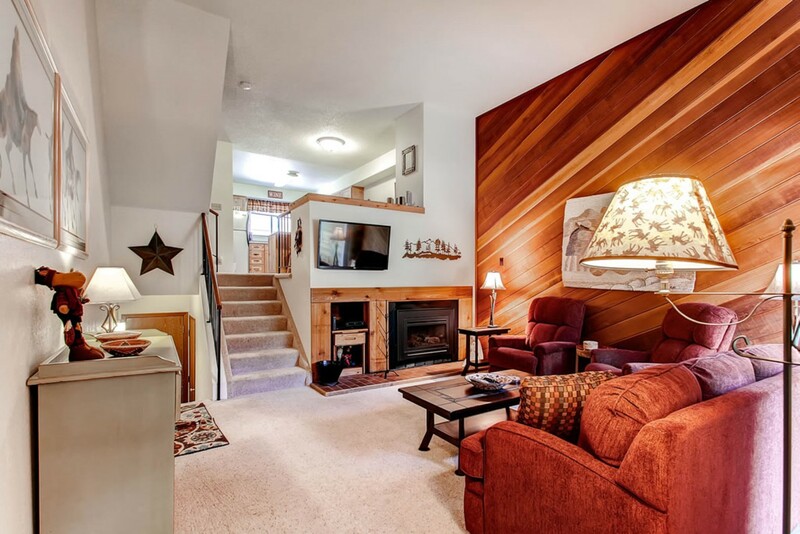 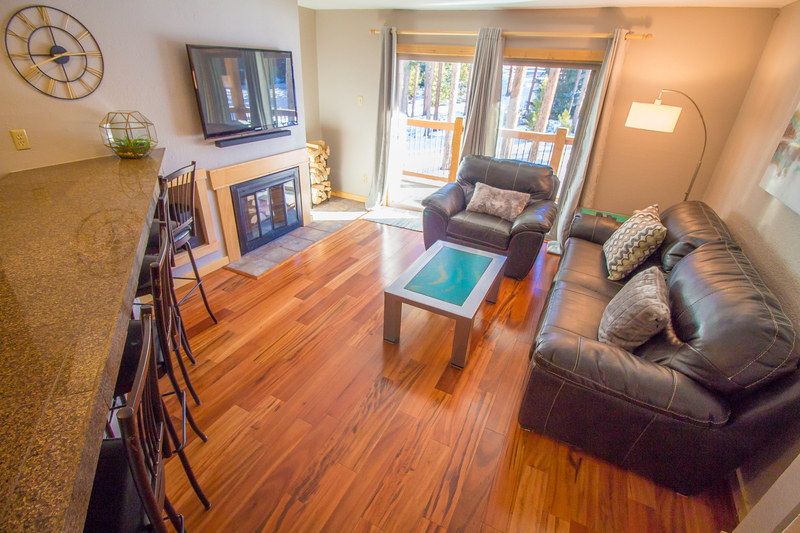 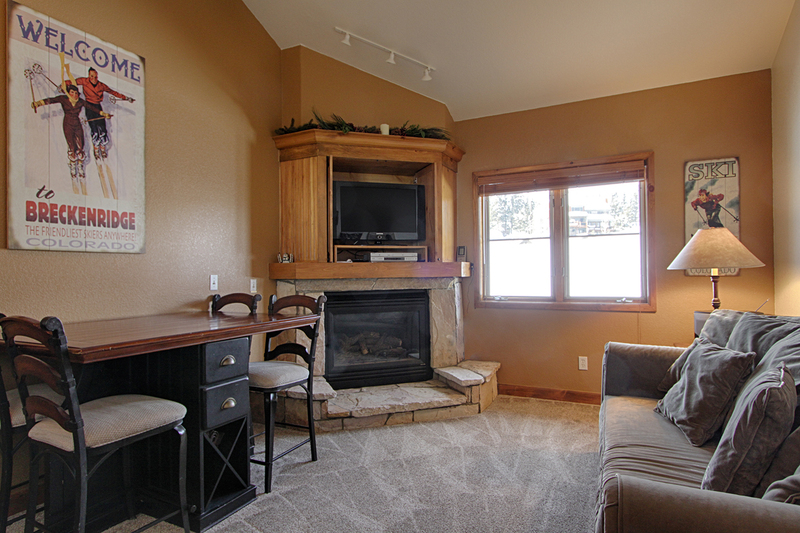 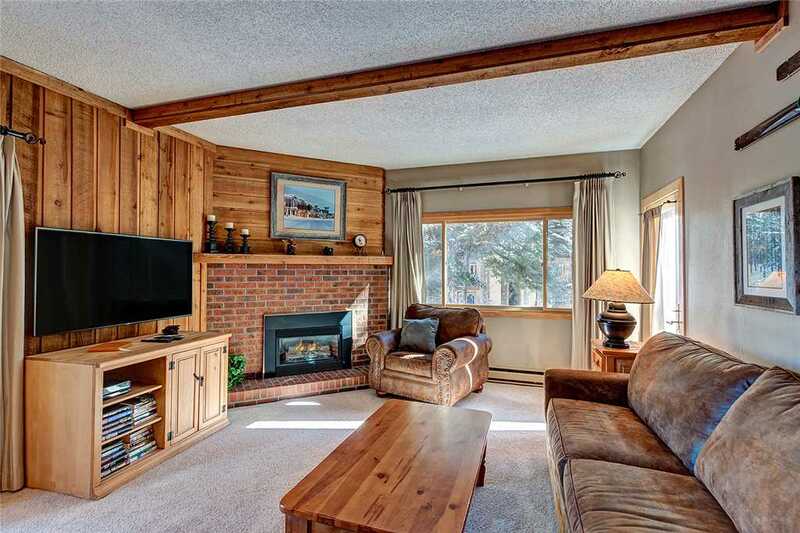 This 424 square foot, one bedroom condo has one bathroom and a fun layout for a ski retreat. 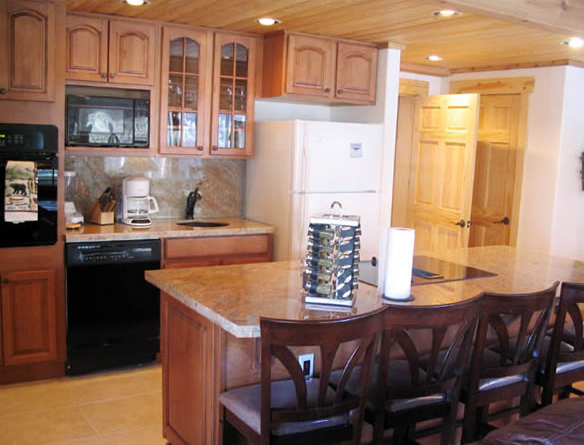 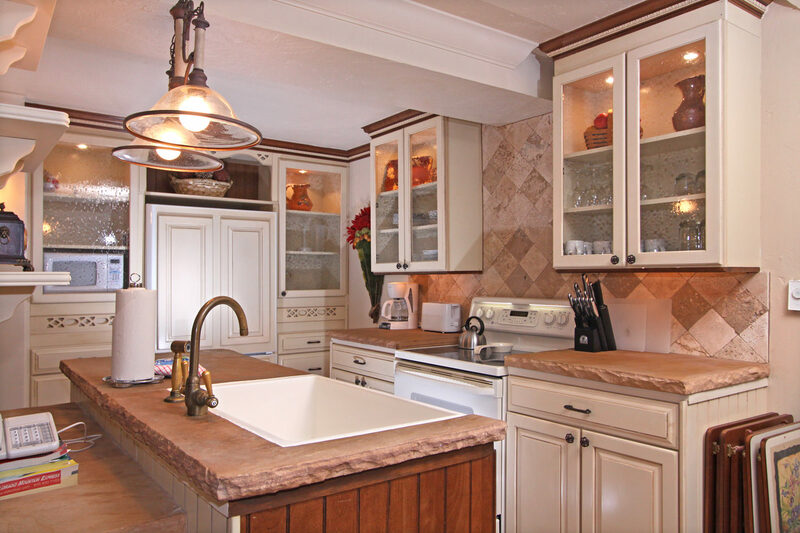 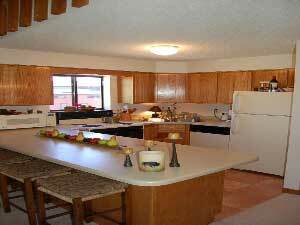 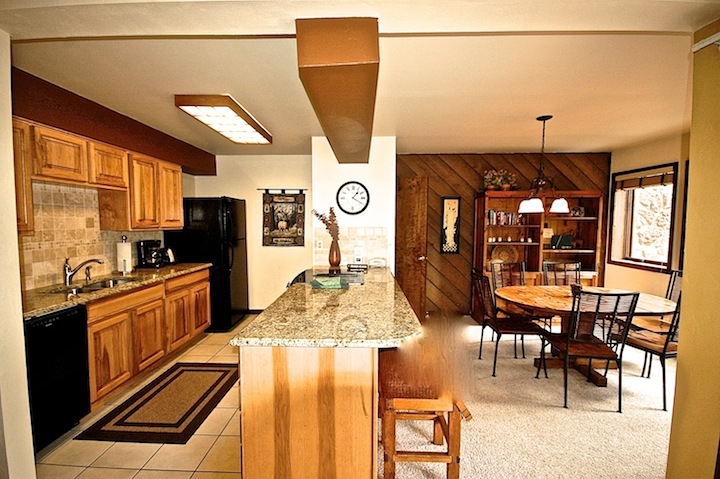 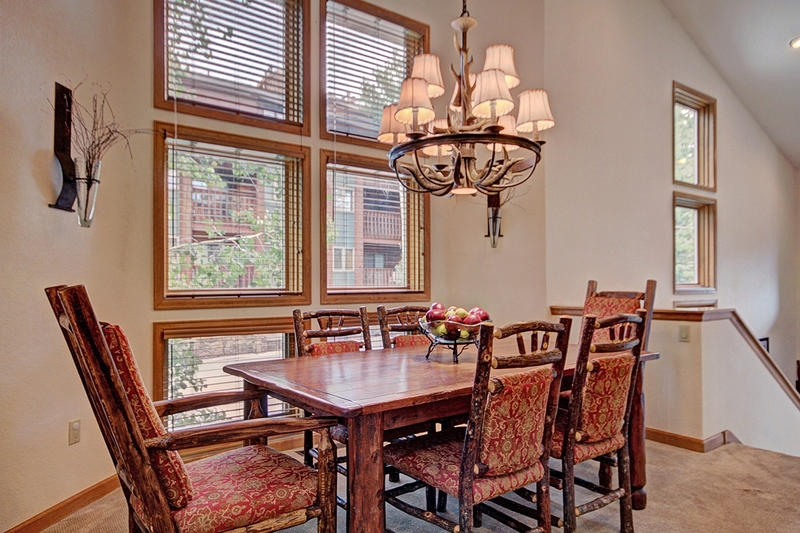 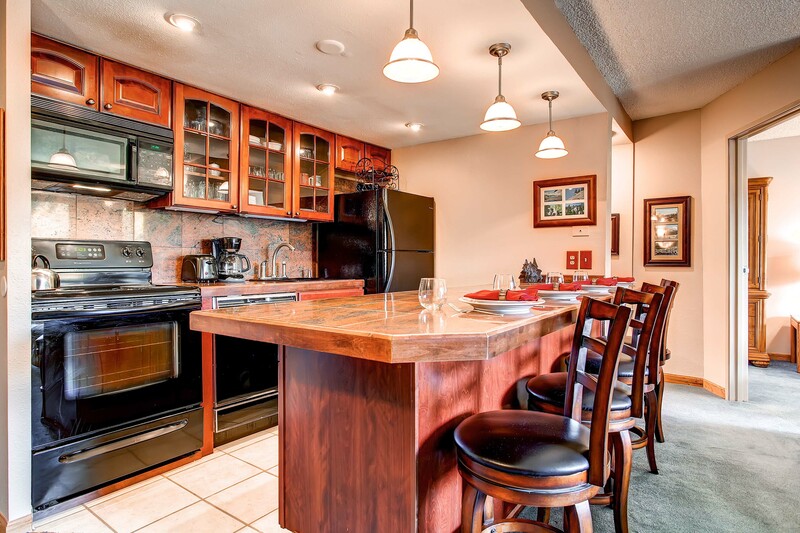 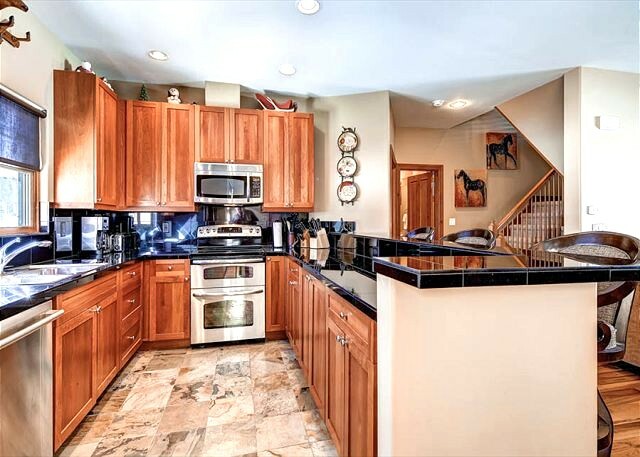 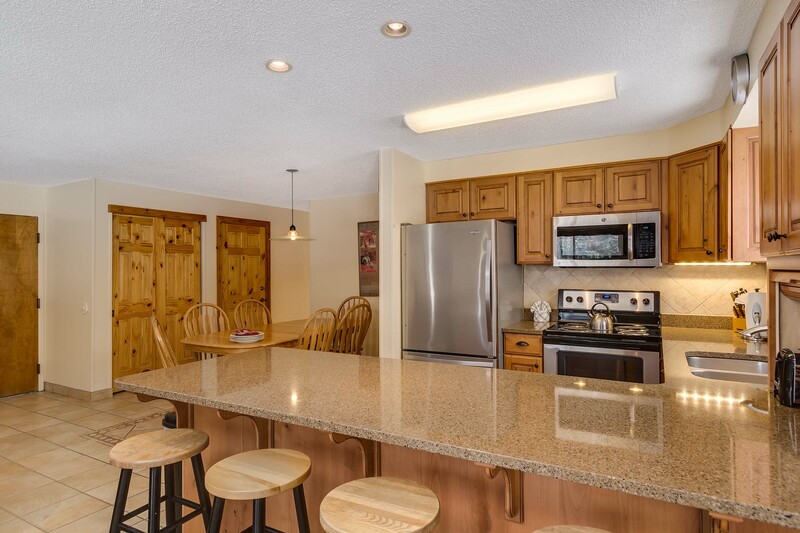 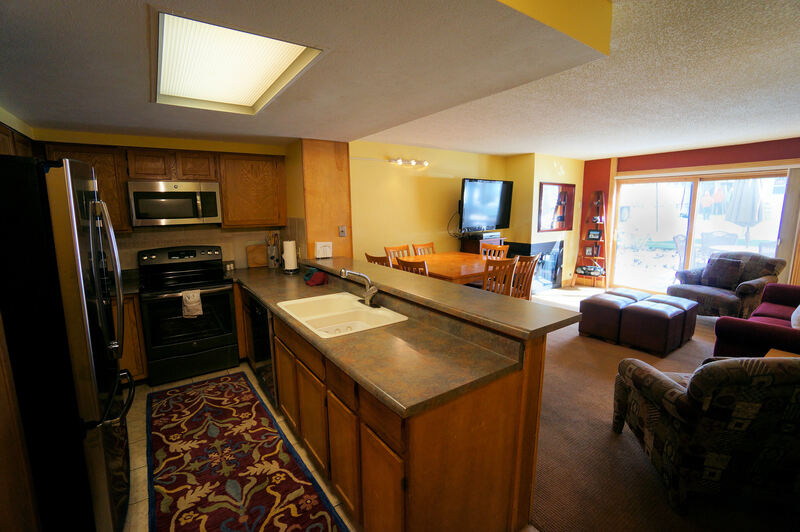 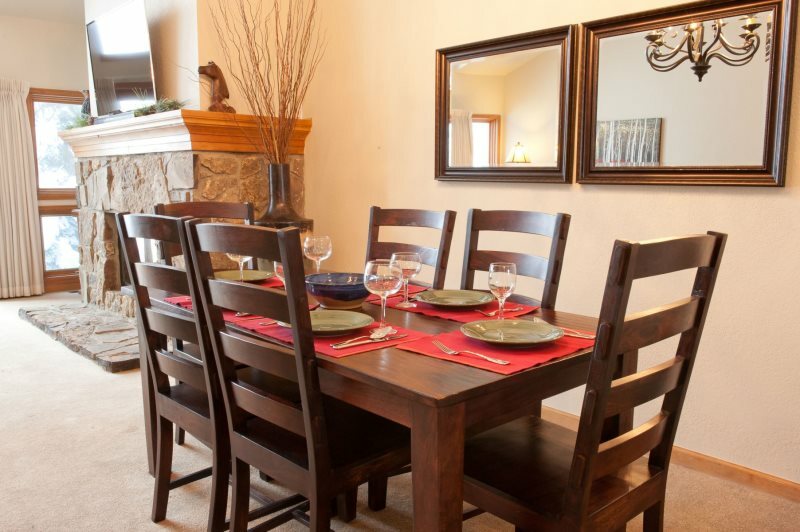 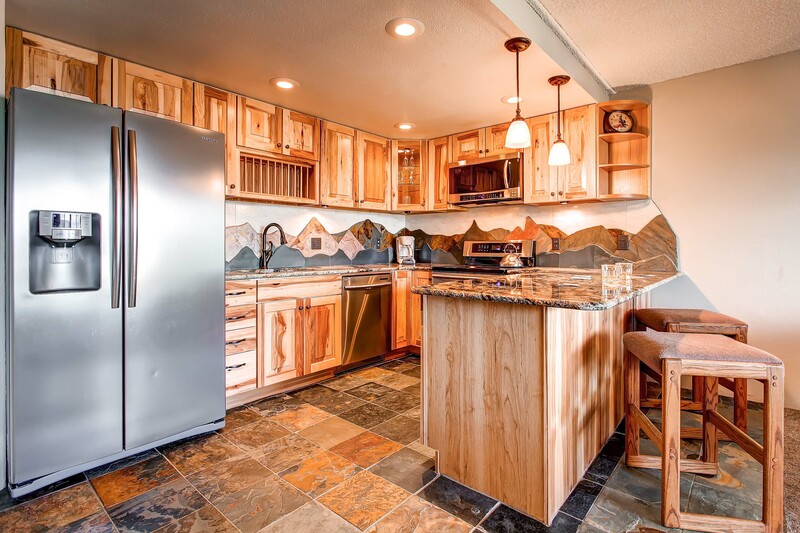 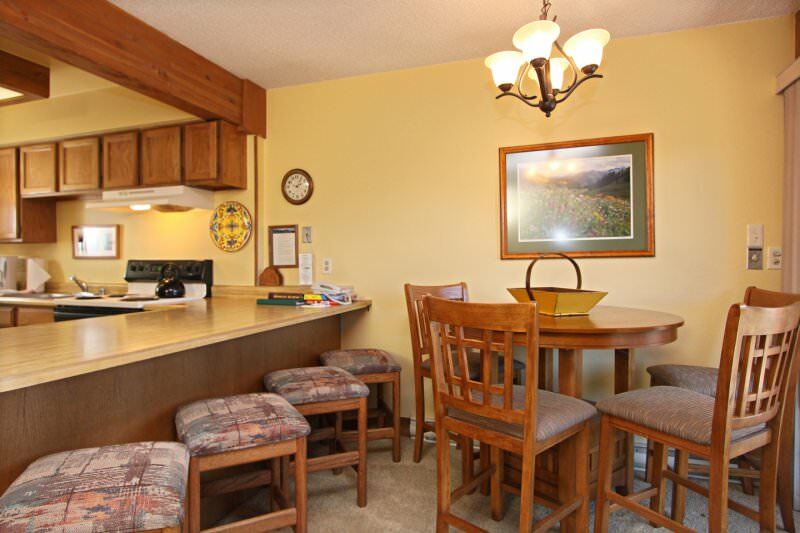 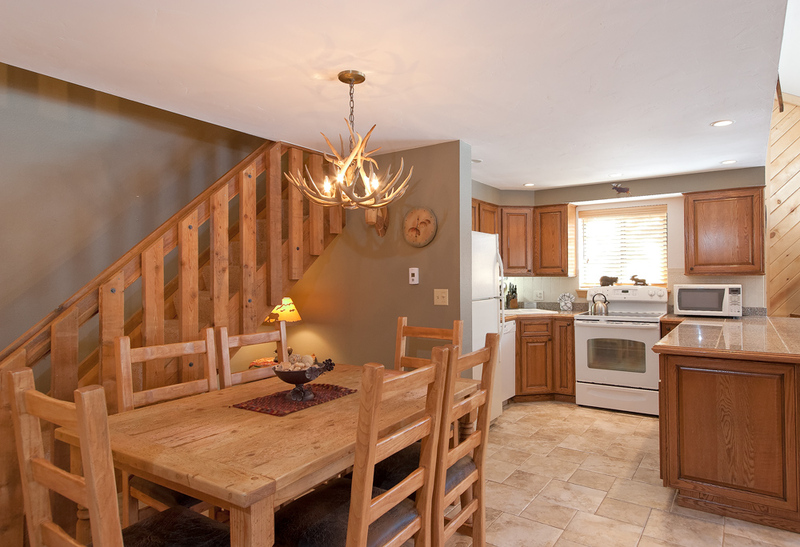 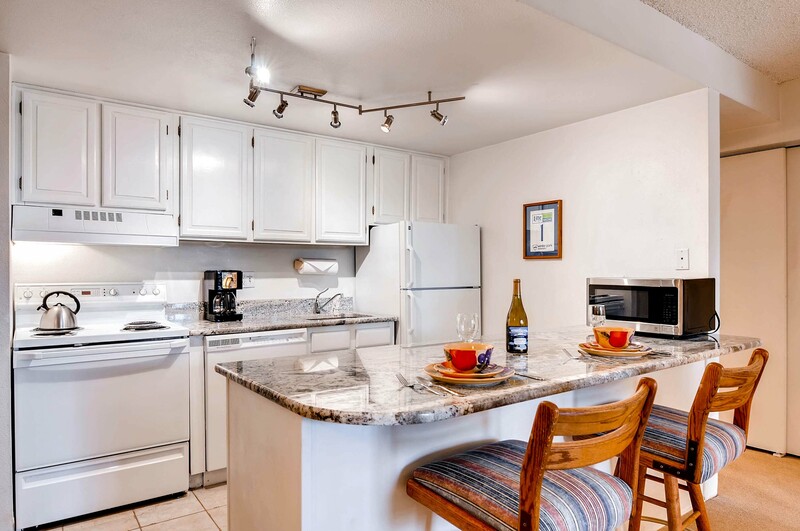 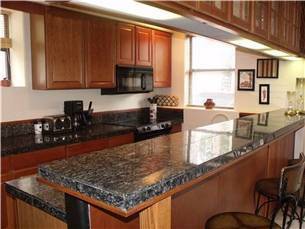 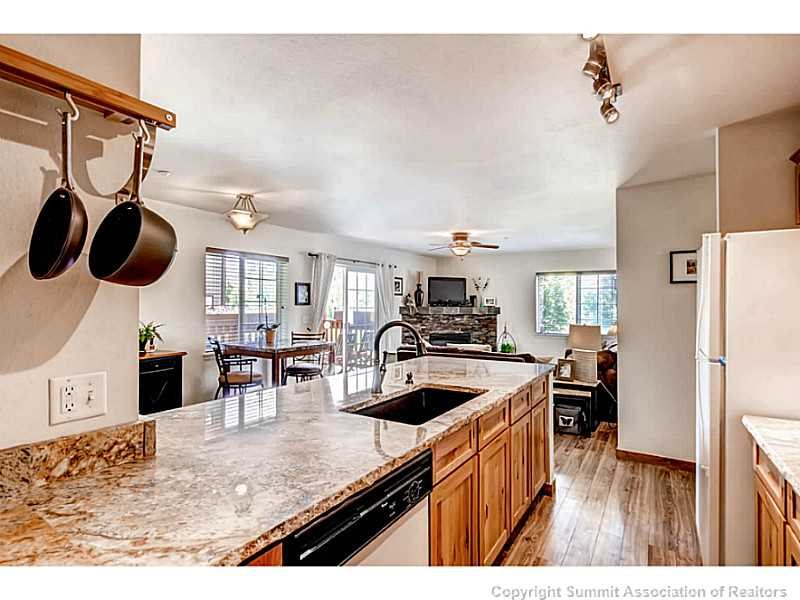 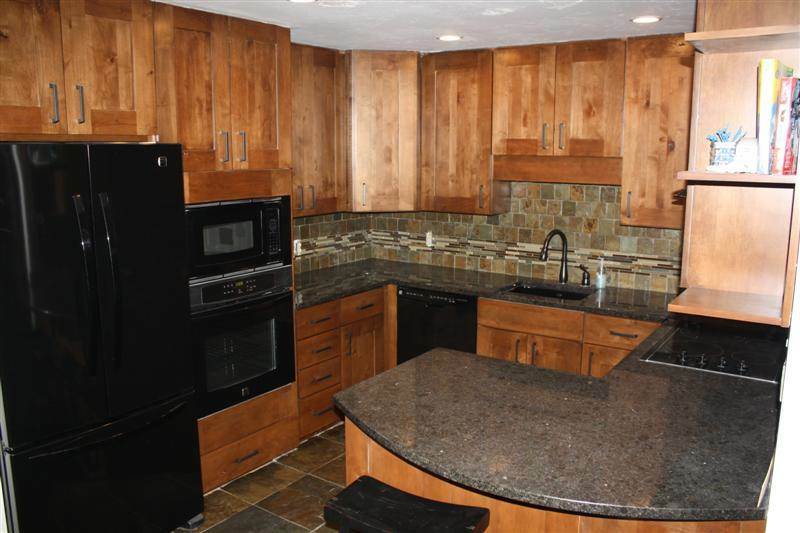 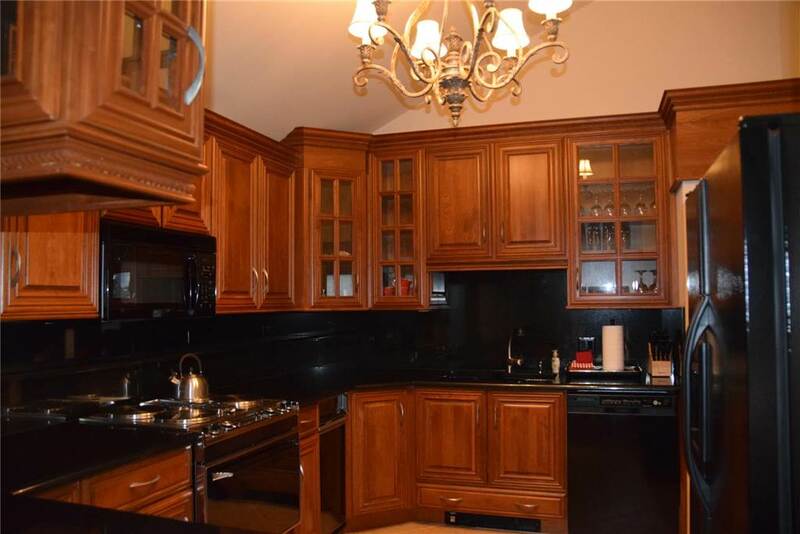 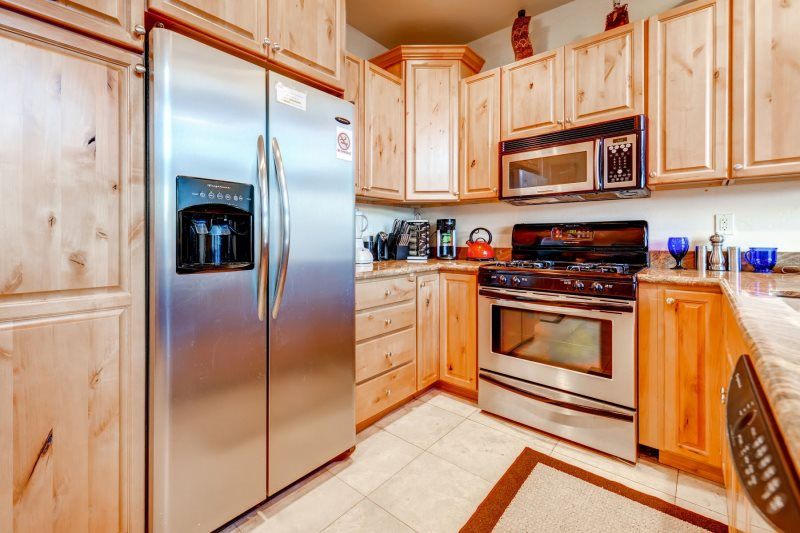 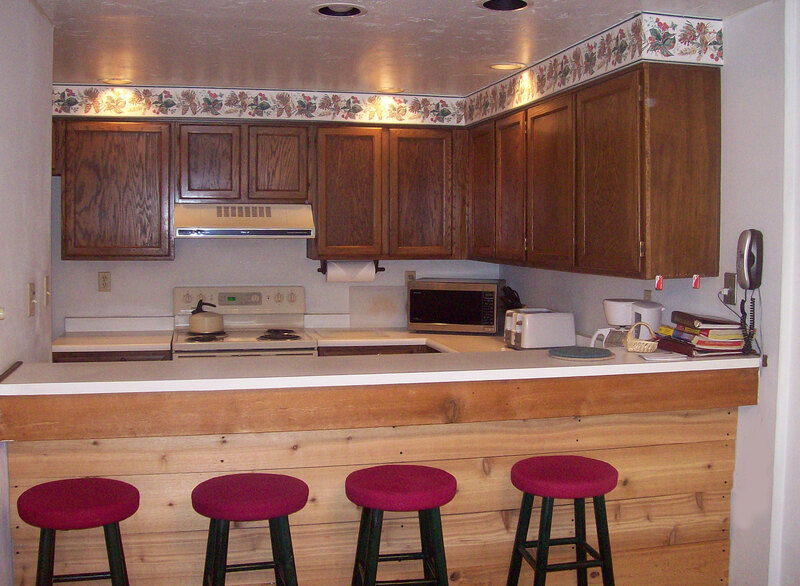 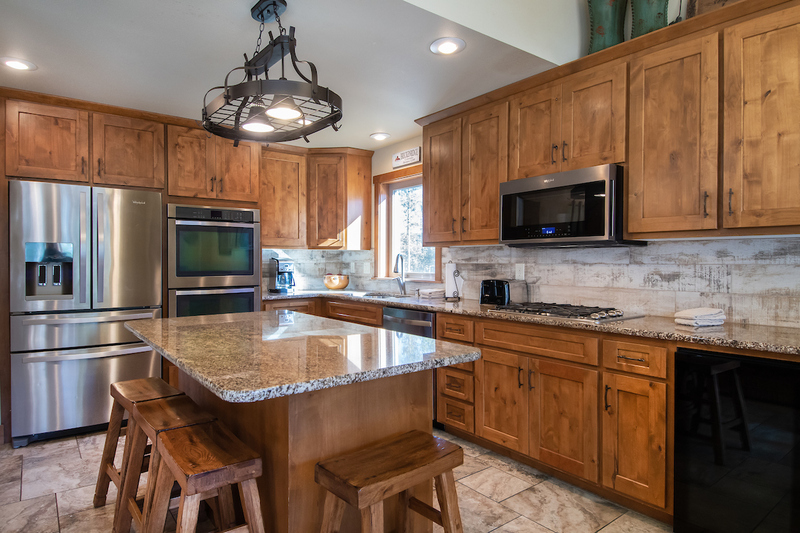 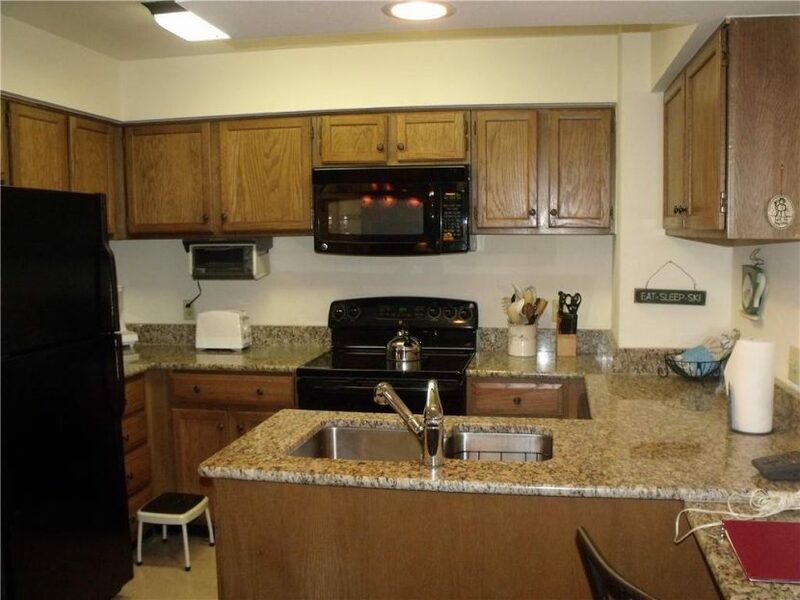 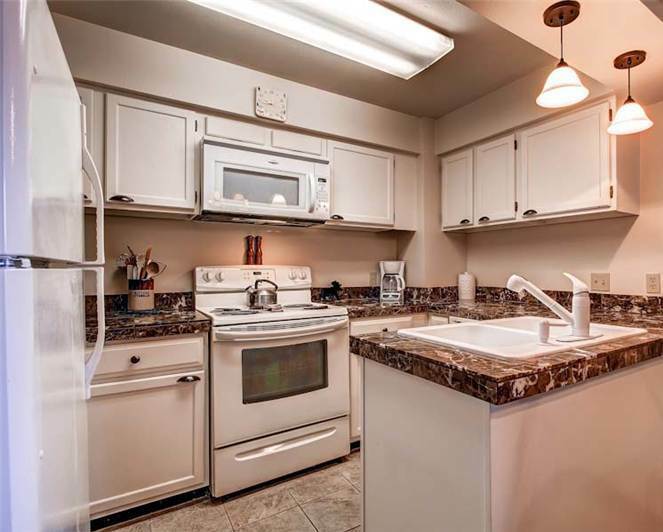 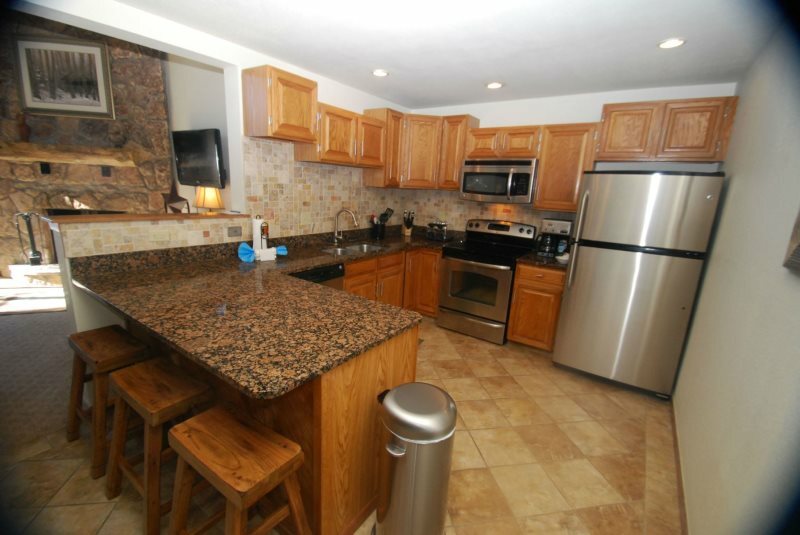 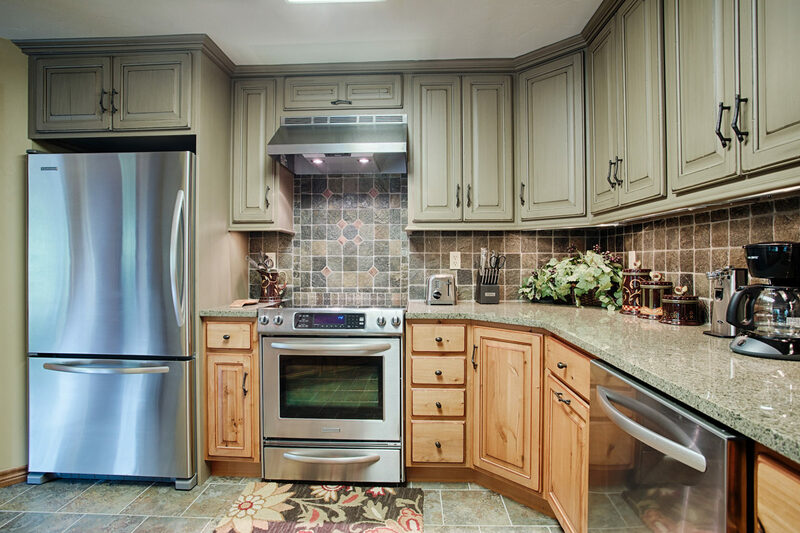 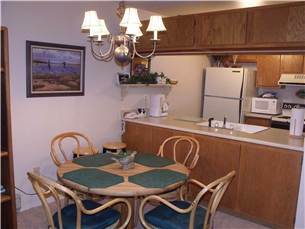 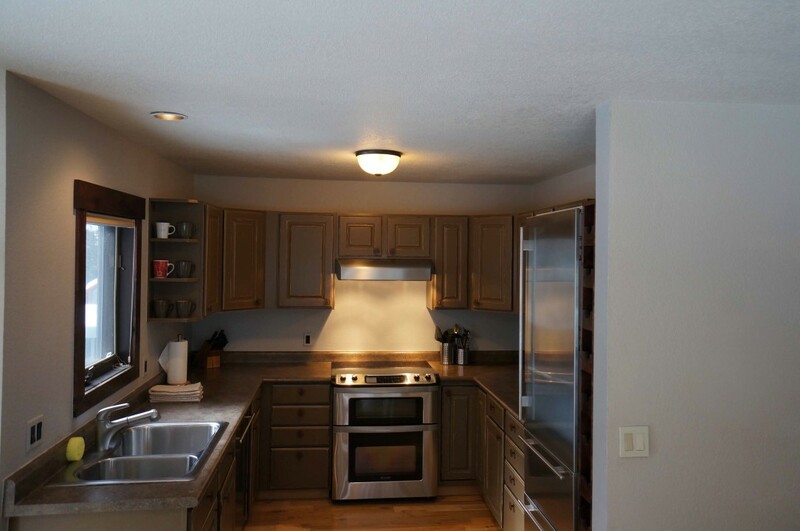 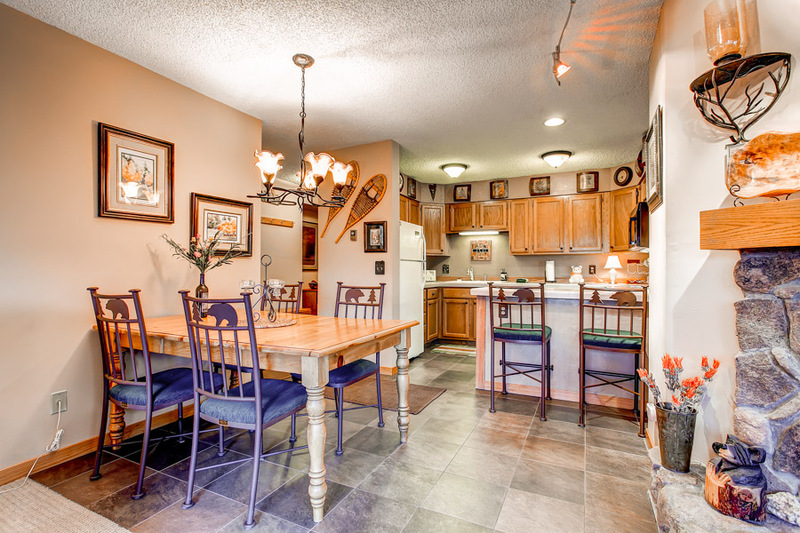 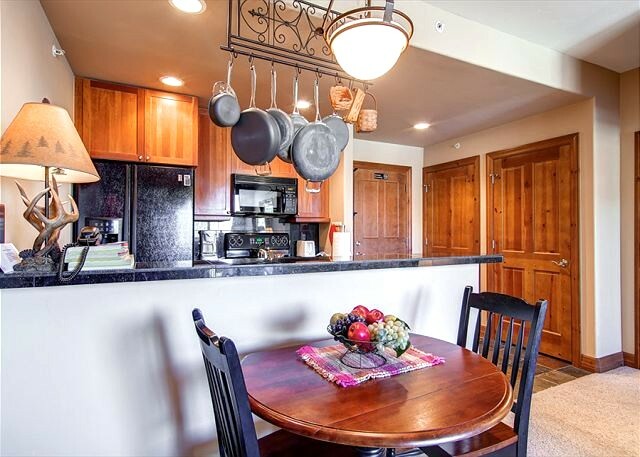 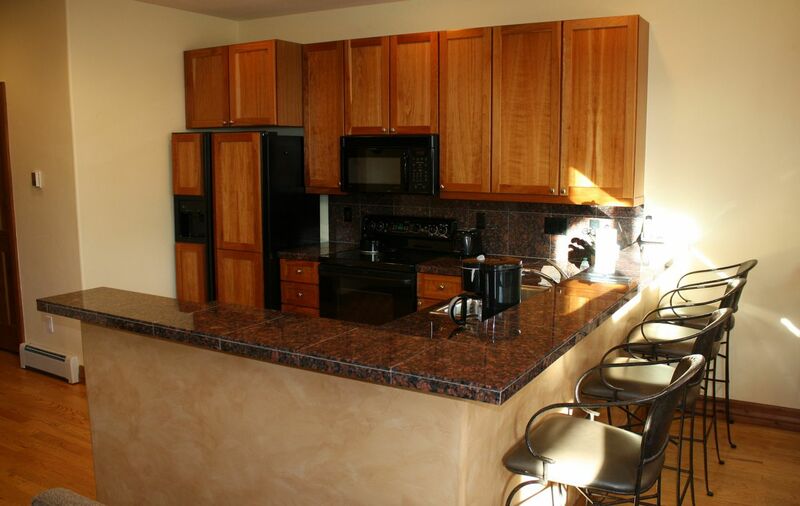 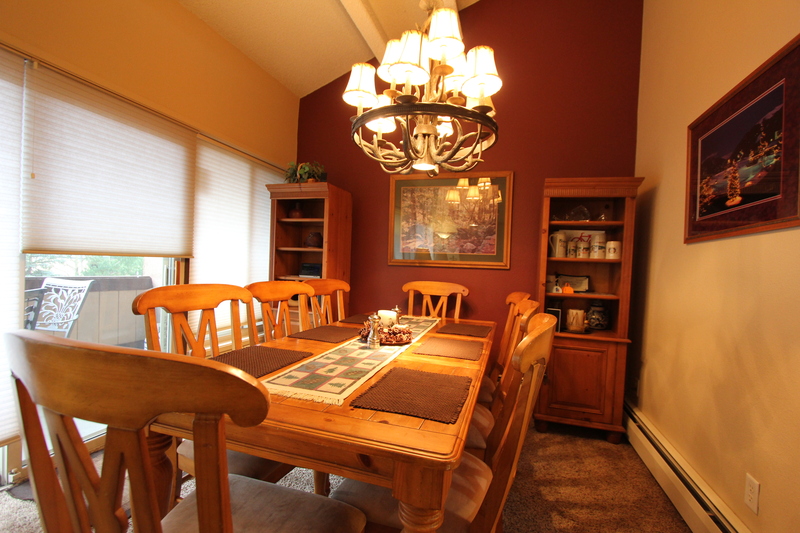 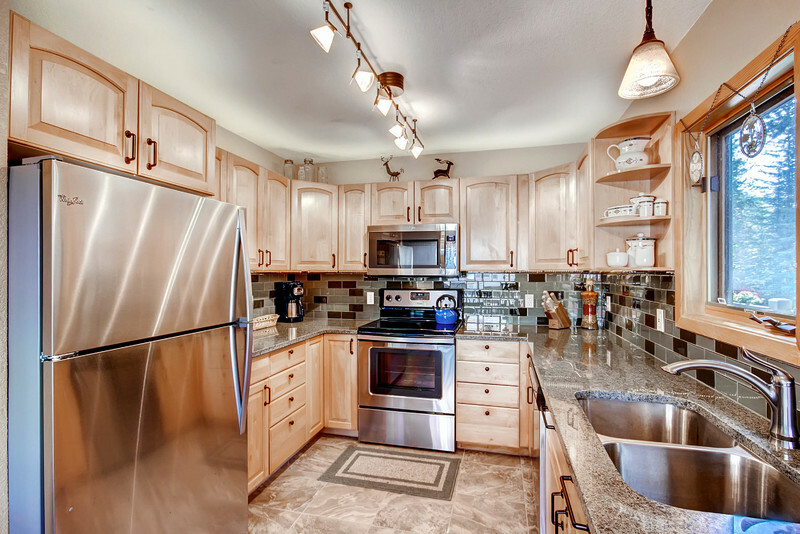 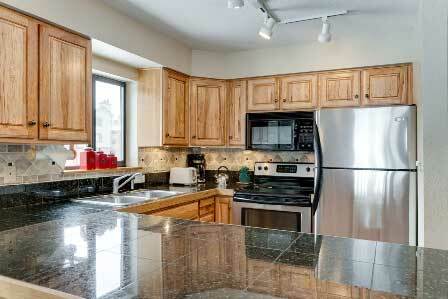 There is a fully equipped, wood cabinet kitchen that includes a microwave, dishwasher, refrigerator and coffee maker. 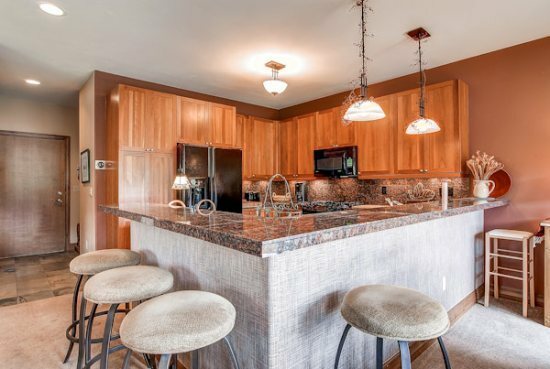 Enjoy a late night drink or your favorite home cooked dish in the comfort of your own unit at the countertop bar with seating for four. 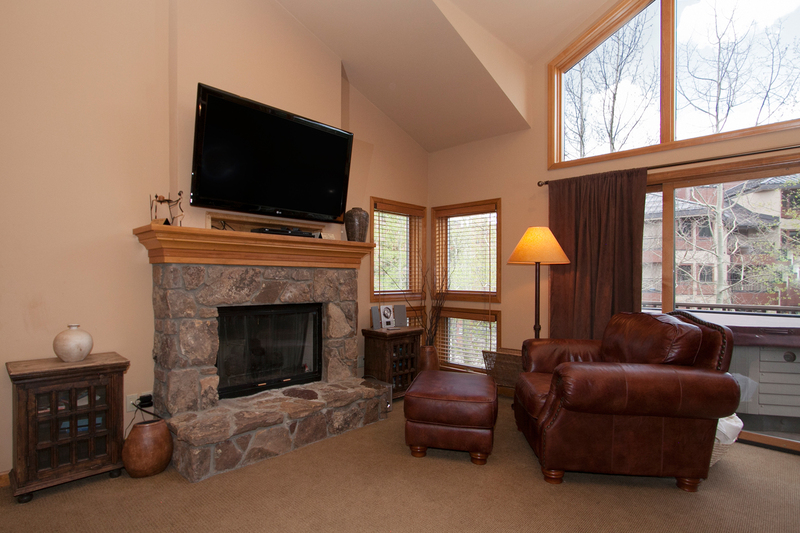 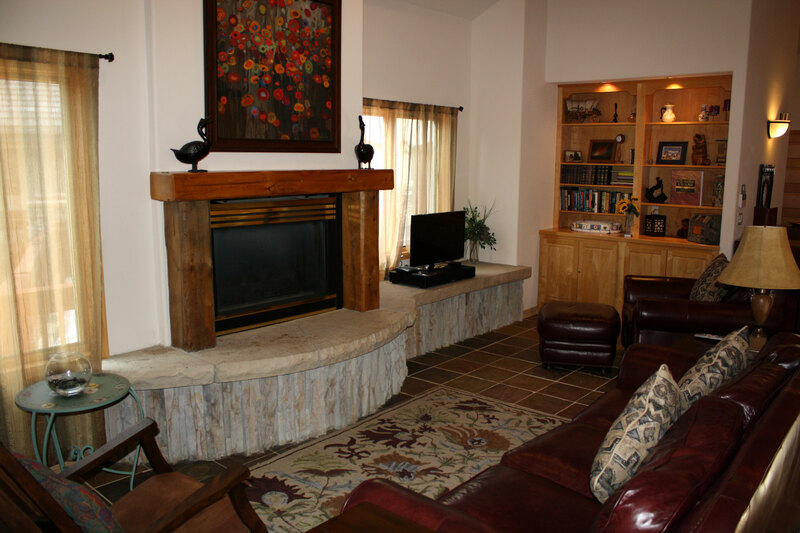 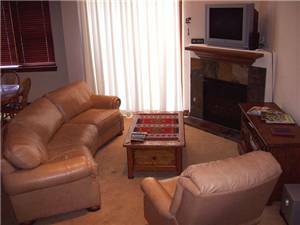 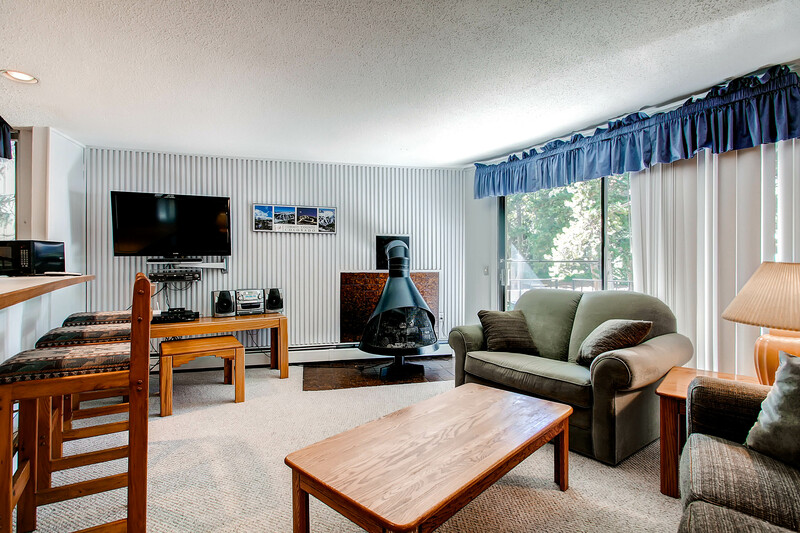 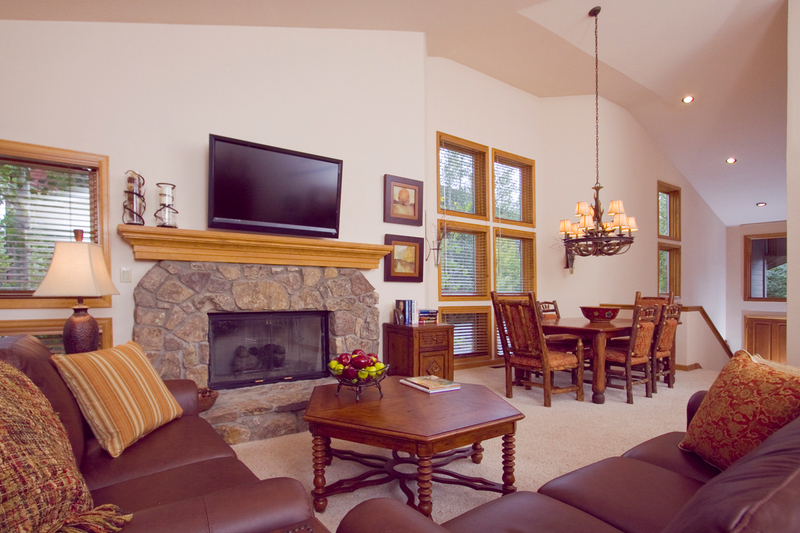 Enjoy hosting another couple or group of friends while watching your favorite DVD movie on the flat screen TV. 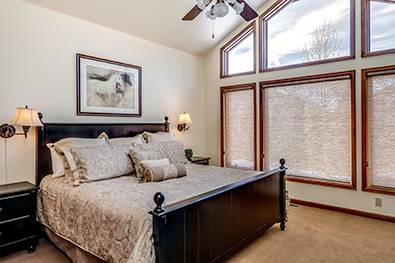 The bedroom has a Queen bed encased in comfortable floral bedding and is surrounded by bedside windows that light the room well. 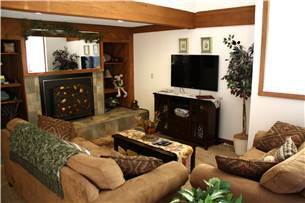 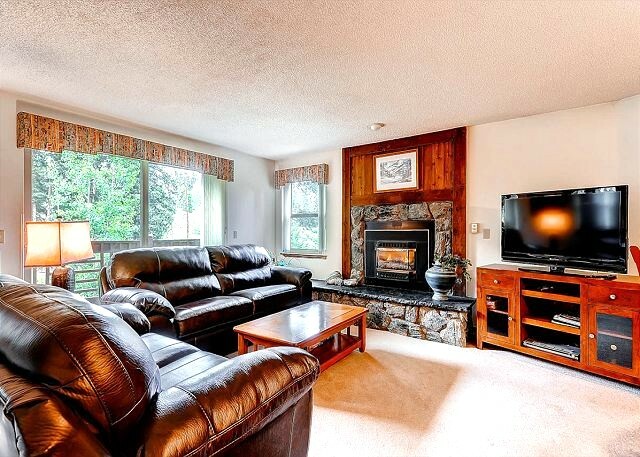 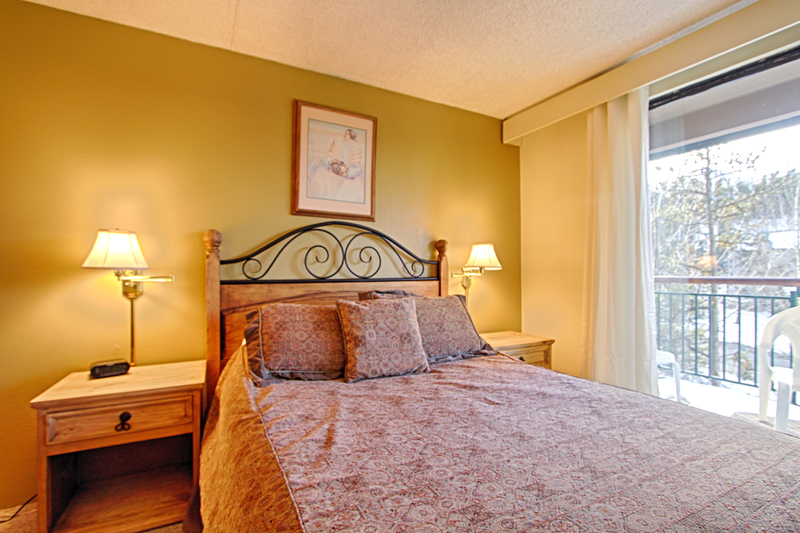 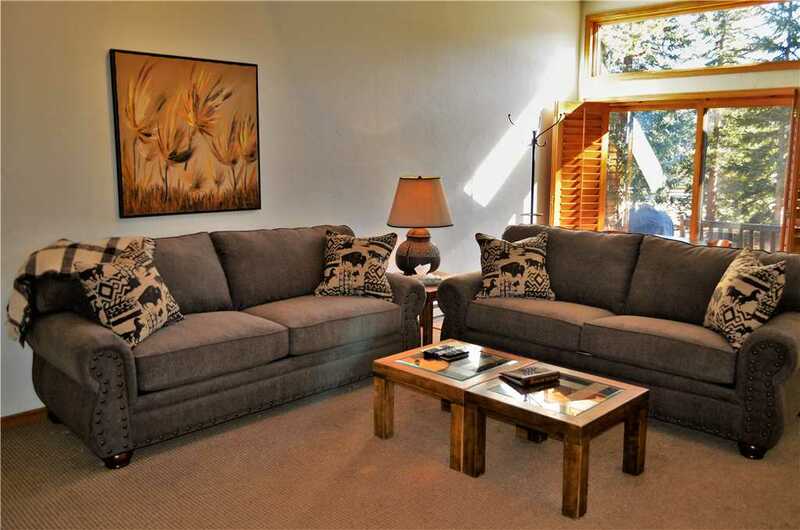 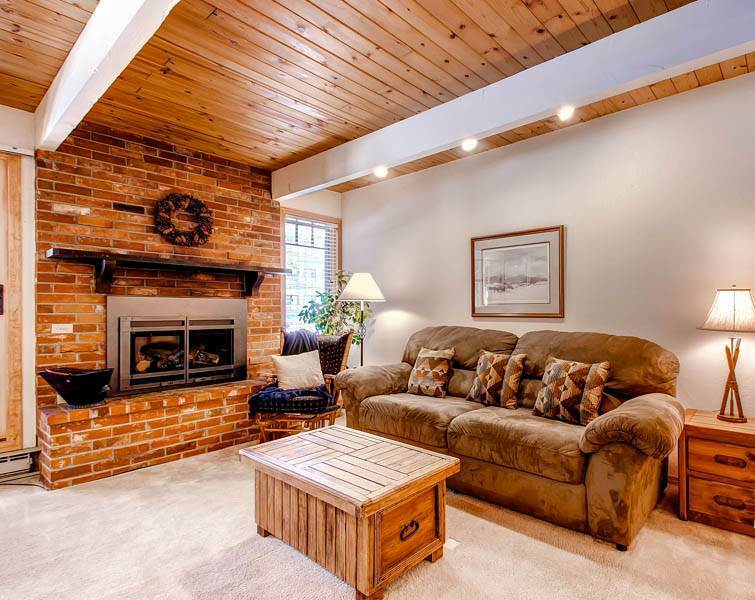 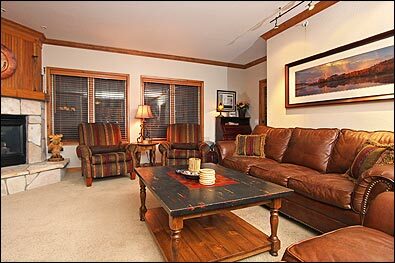 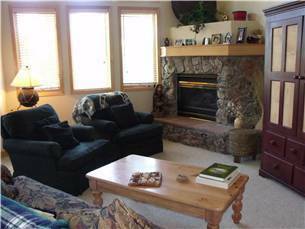 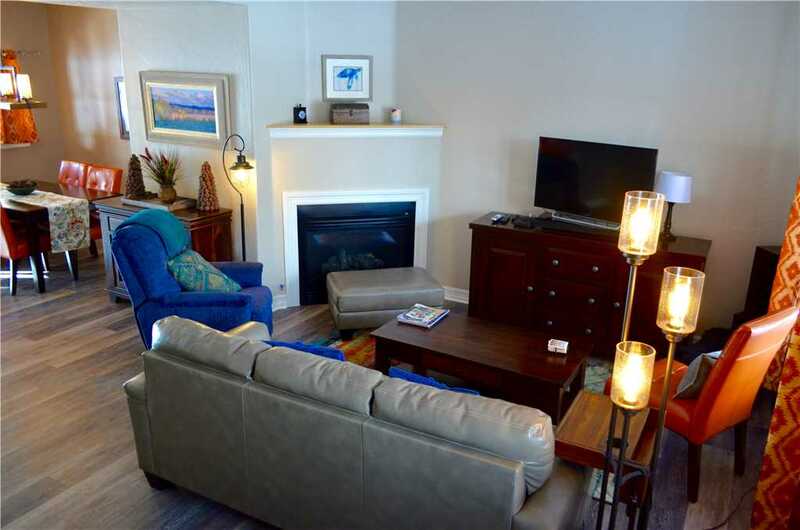 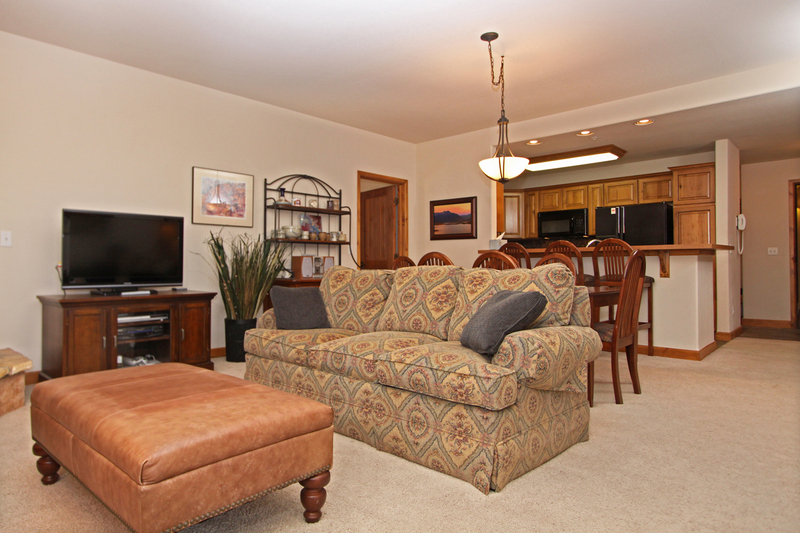 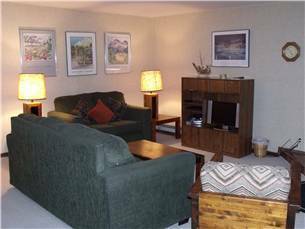 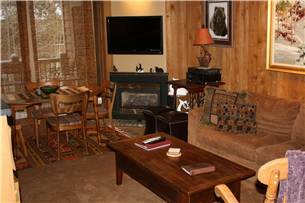 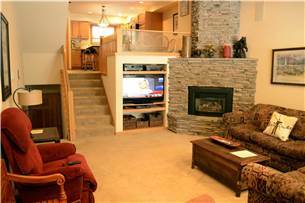 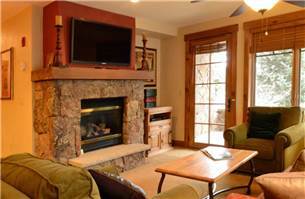 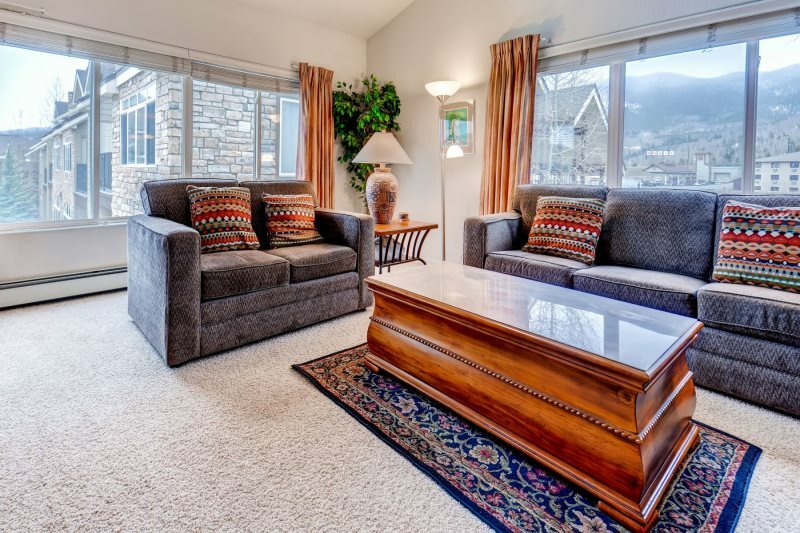 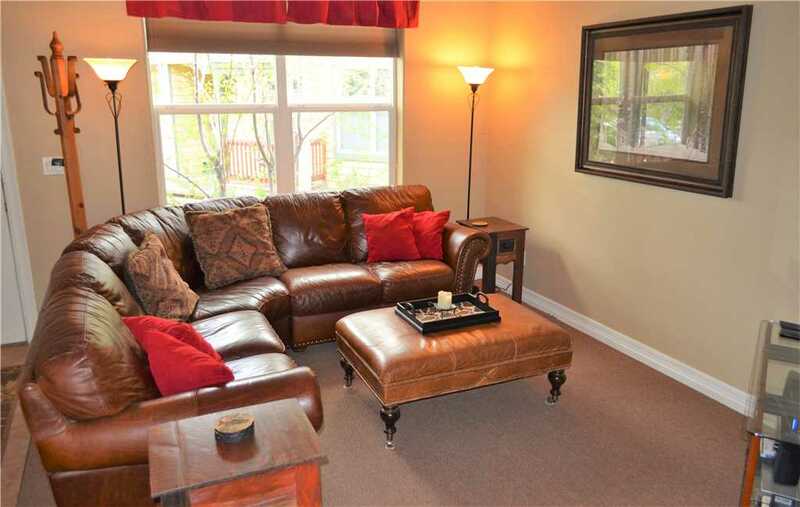 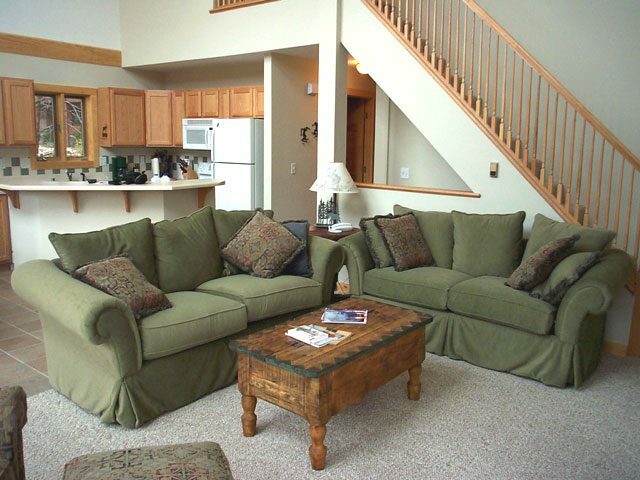 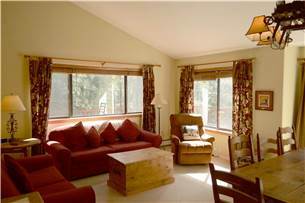 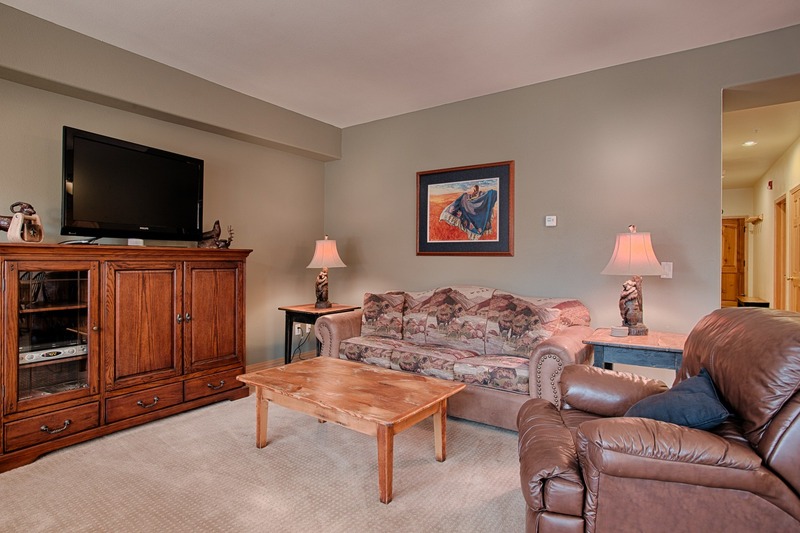 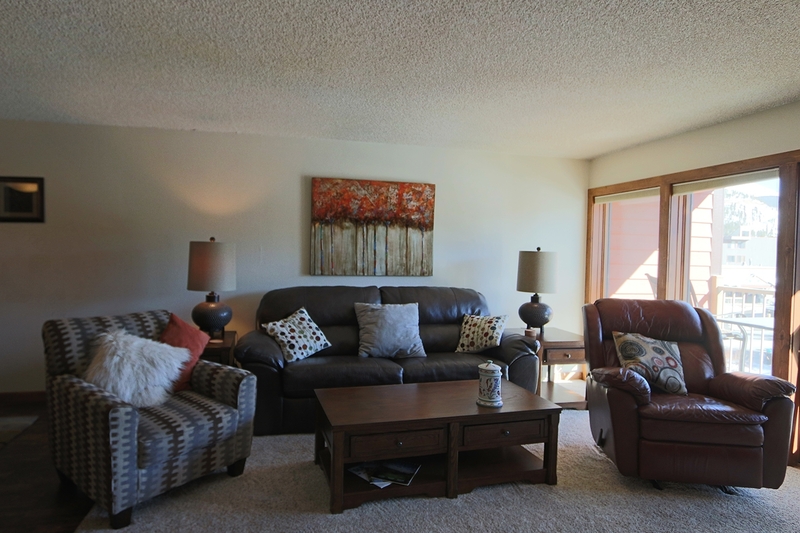 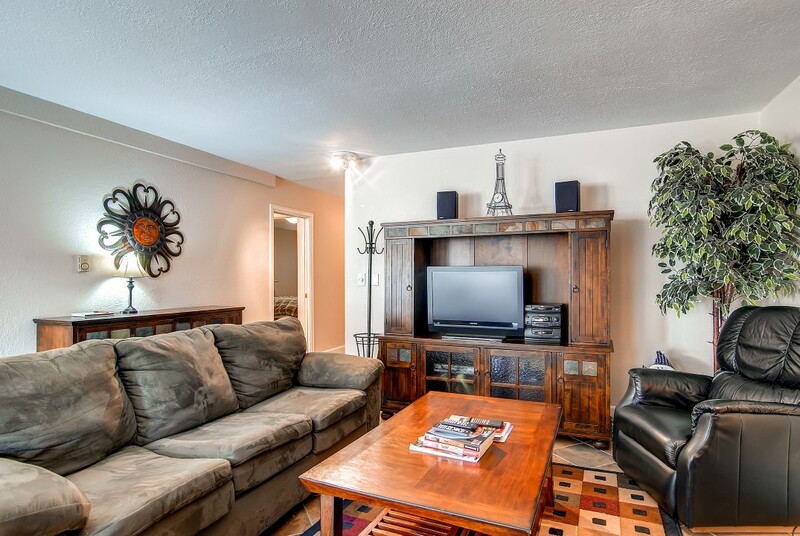 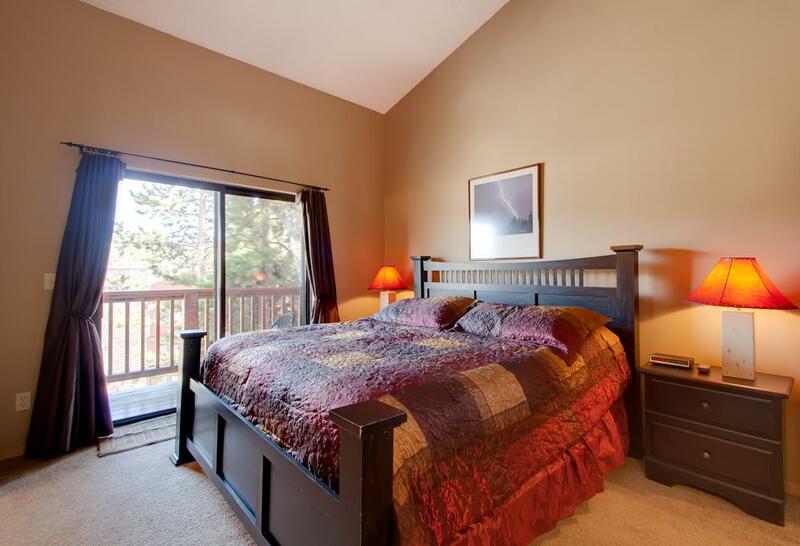 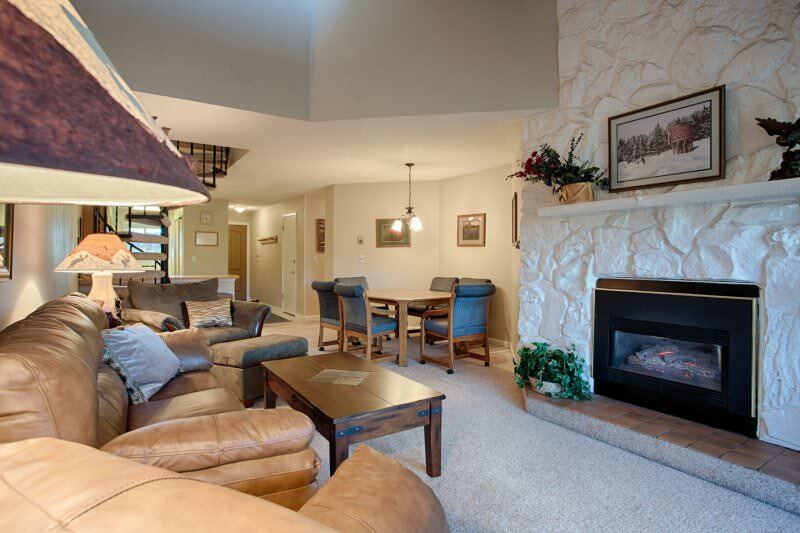 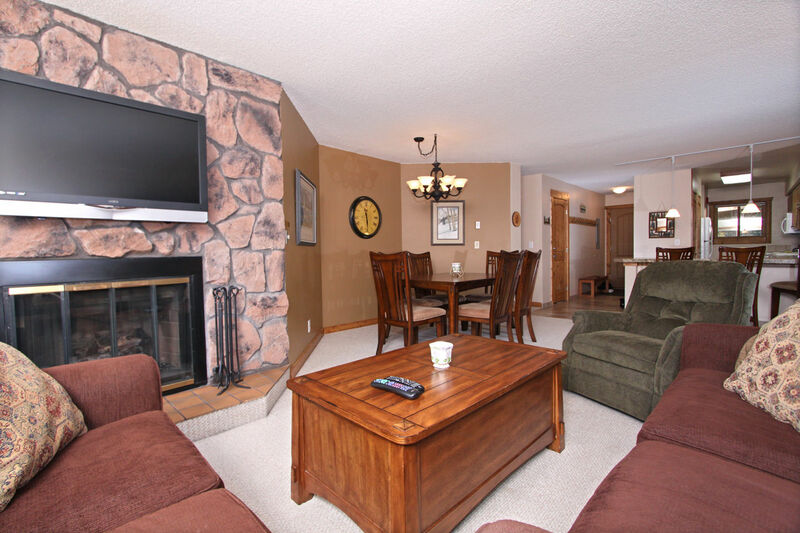 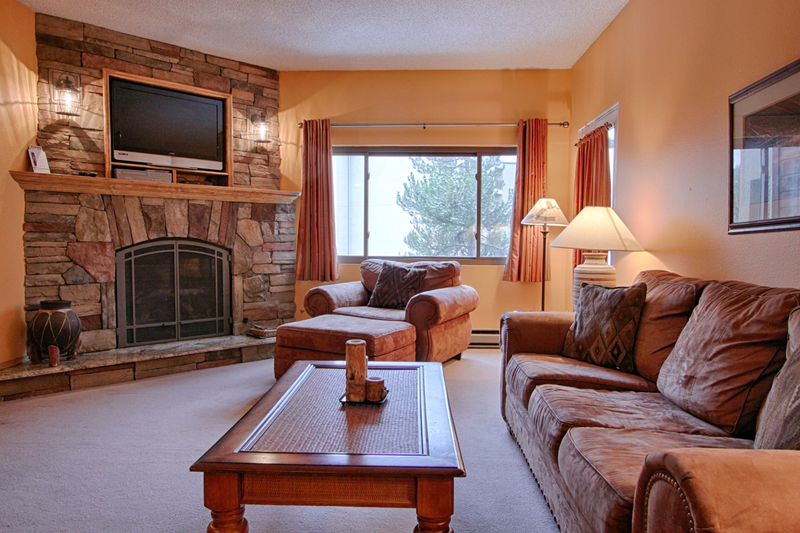 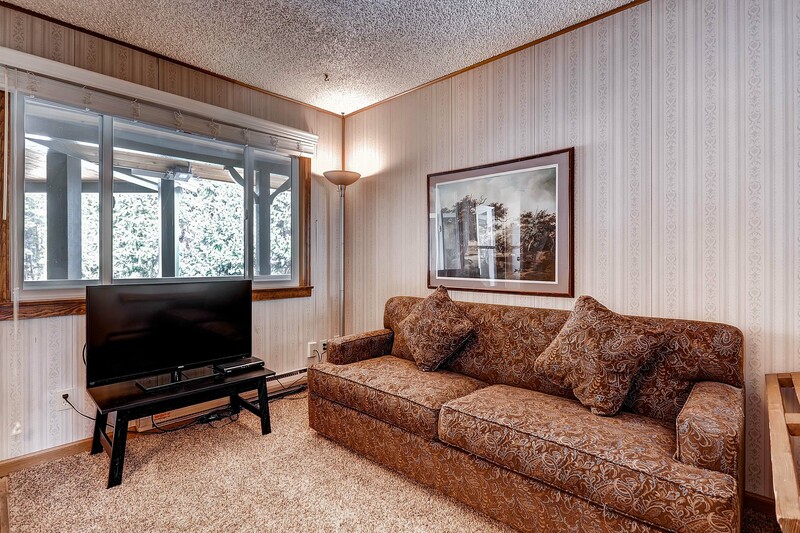 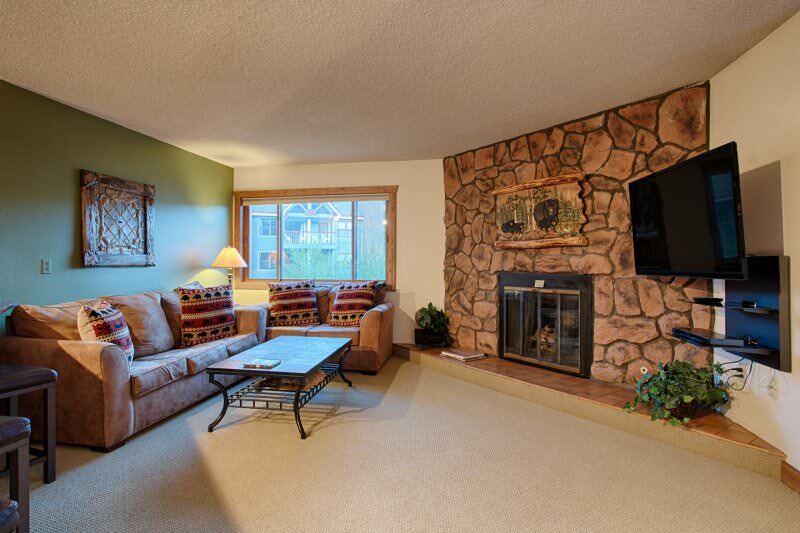 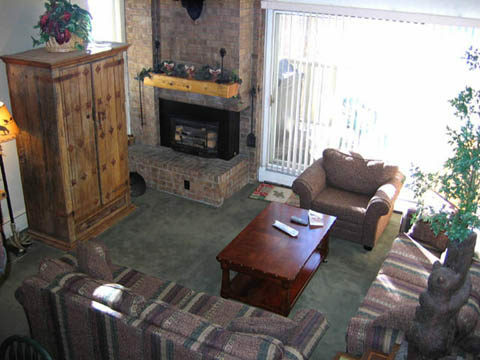 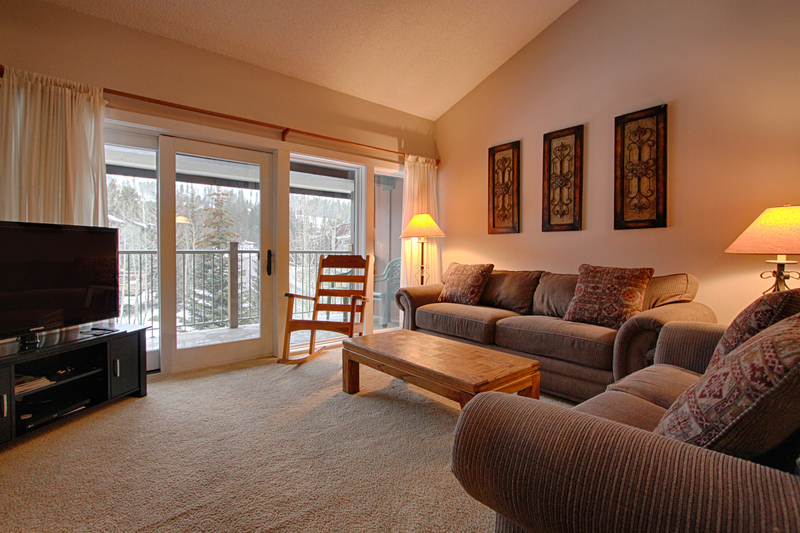 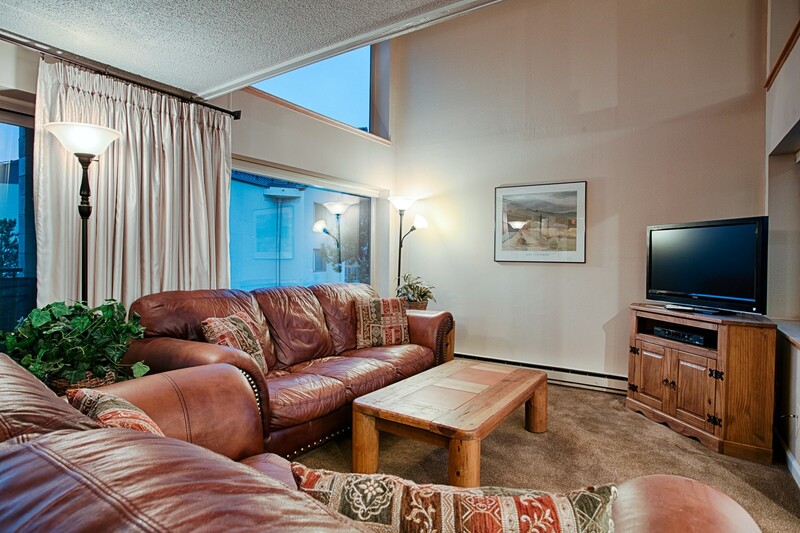 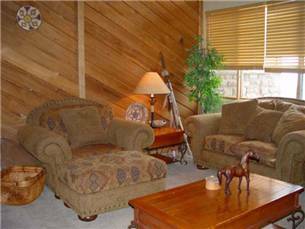 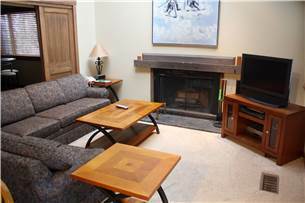 The condo is also furnished with a Queen sofa sleeper allowing accommodations for four people. 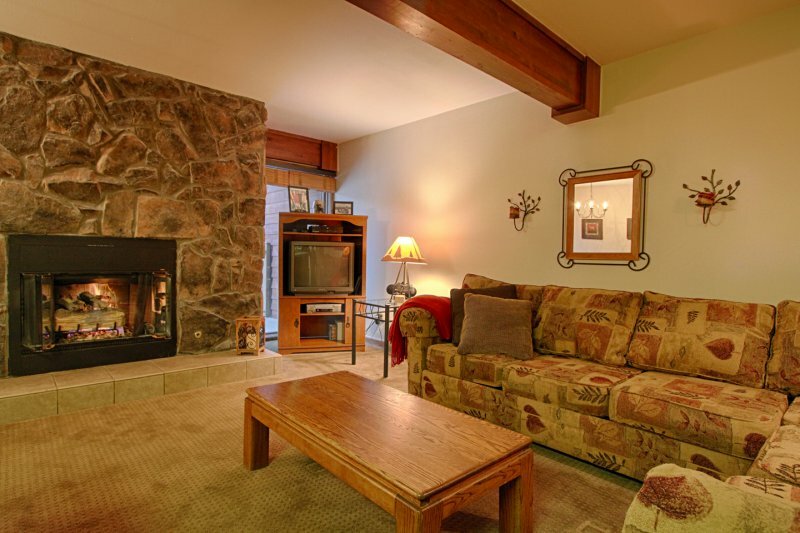 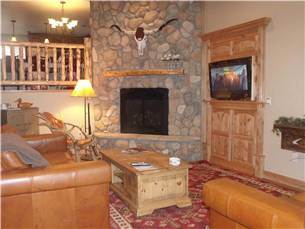 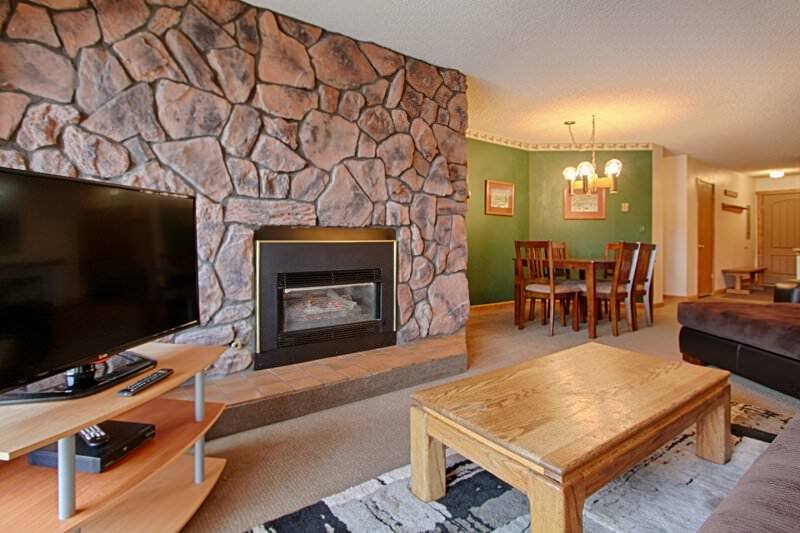 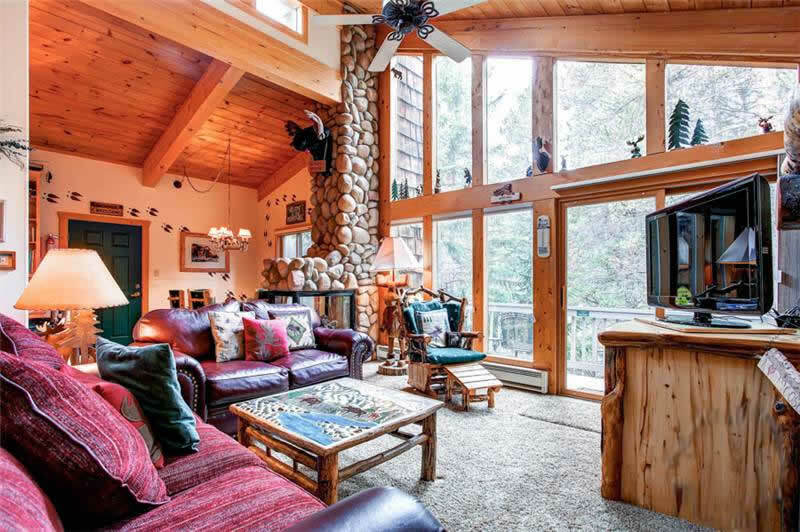 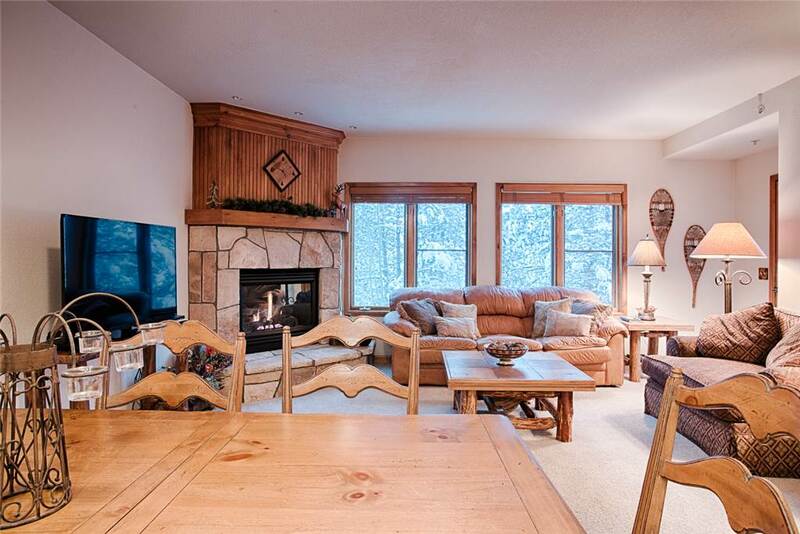 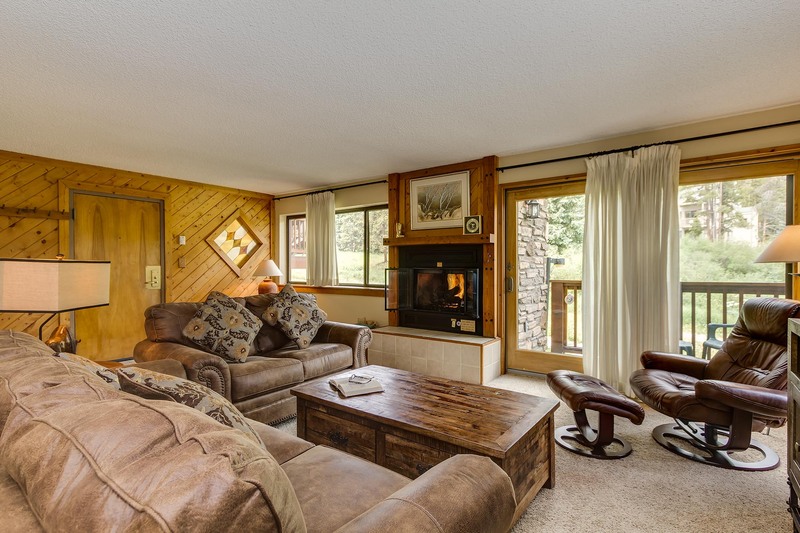 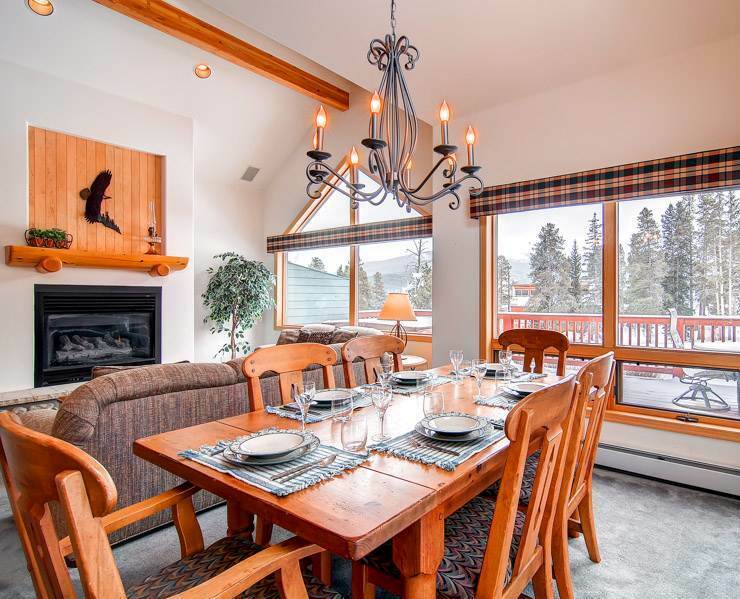 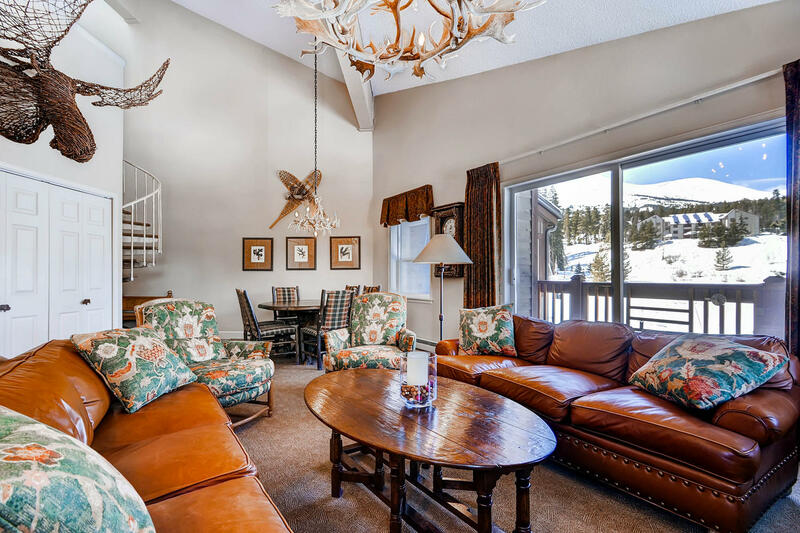 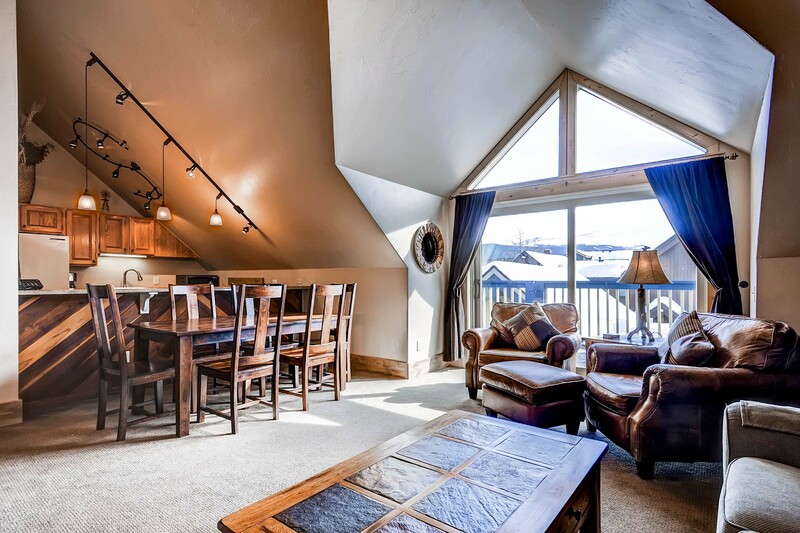 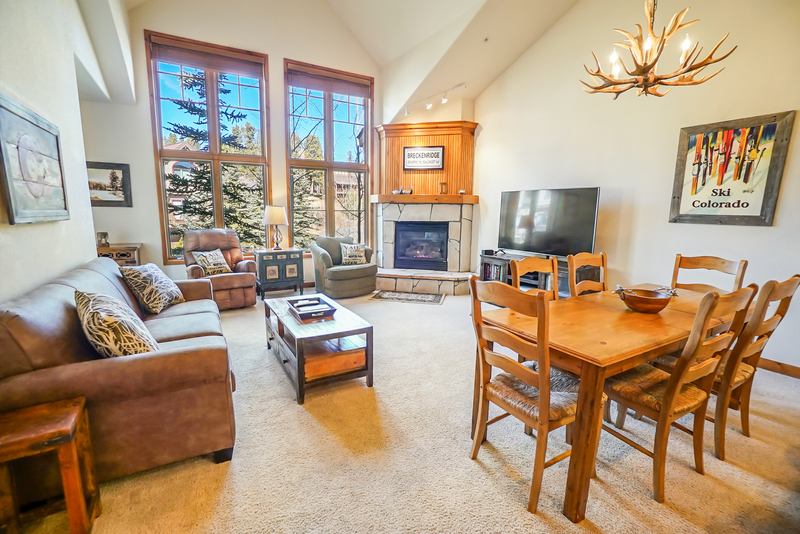 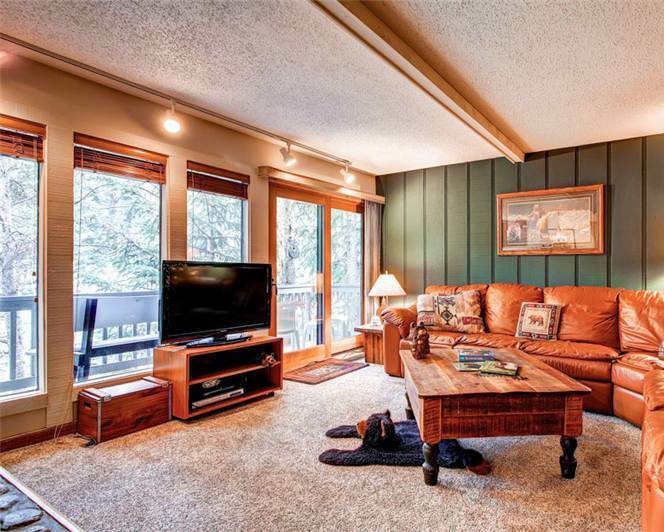 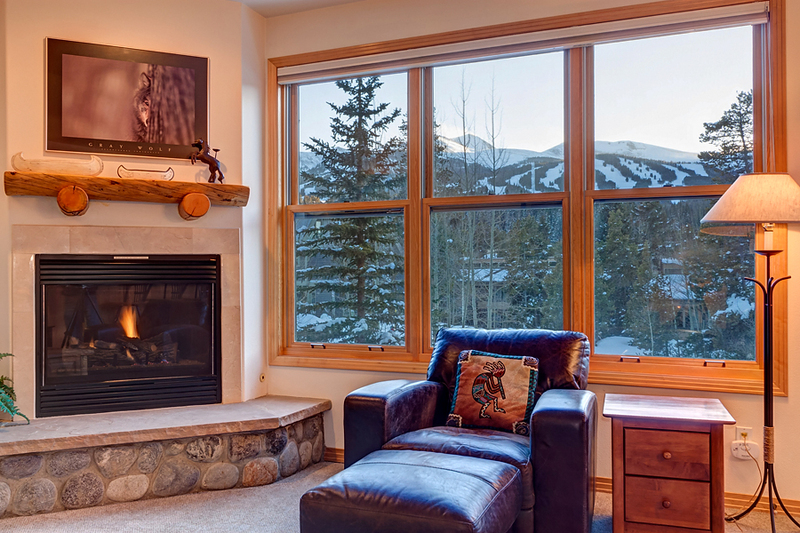 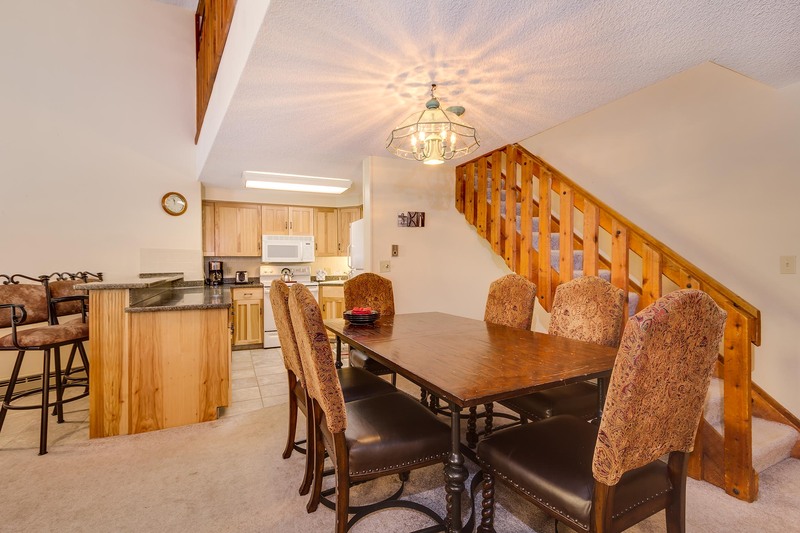 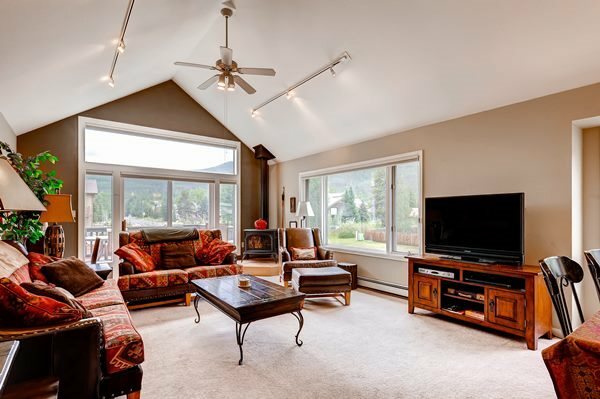 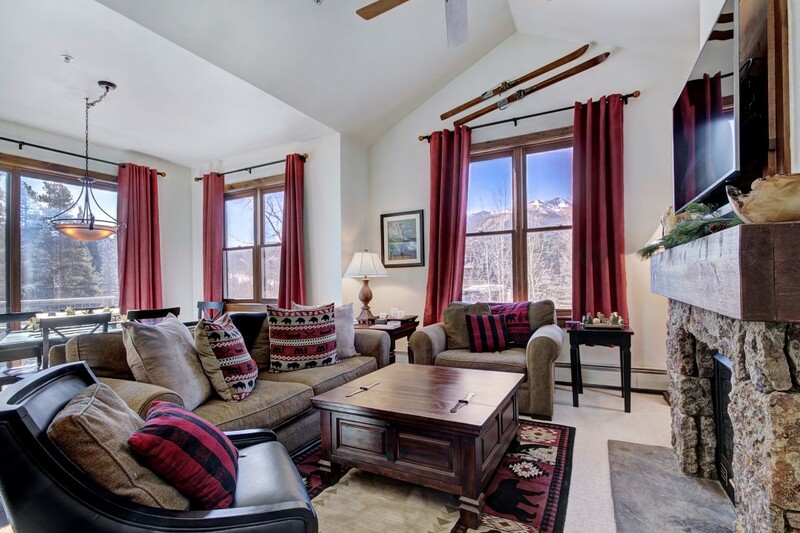 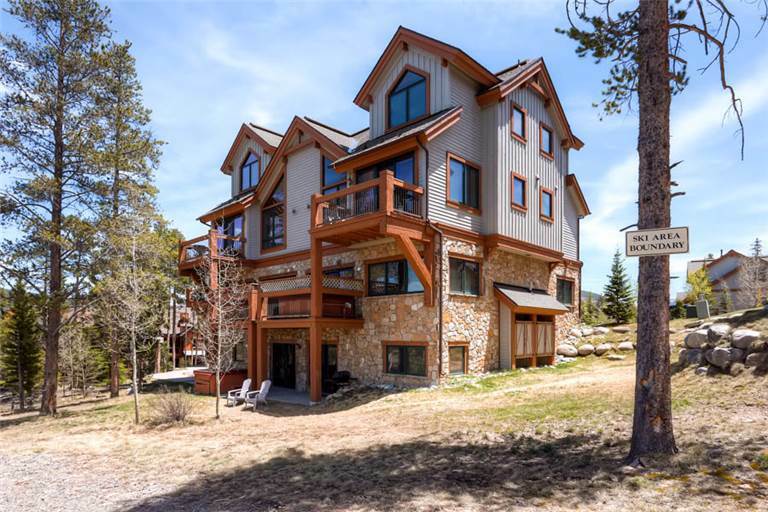 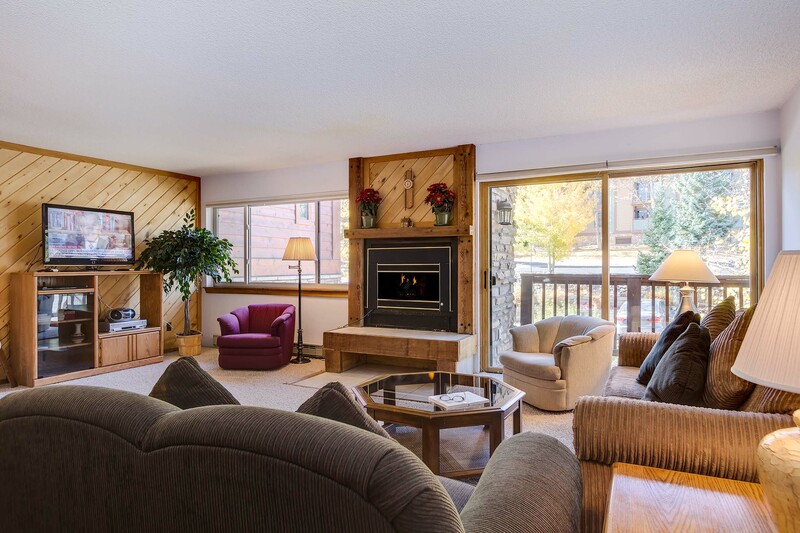 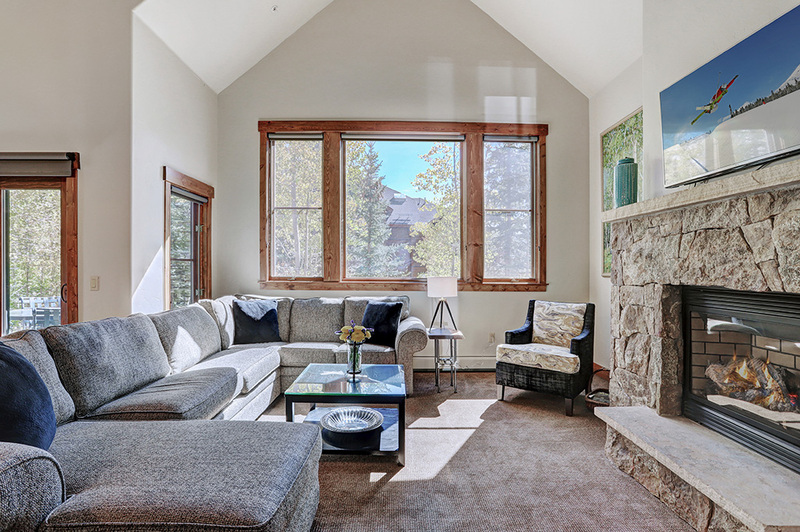 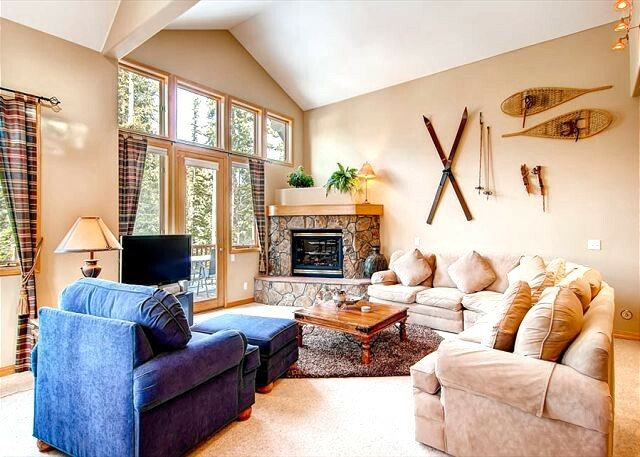 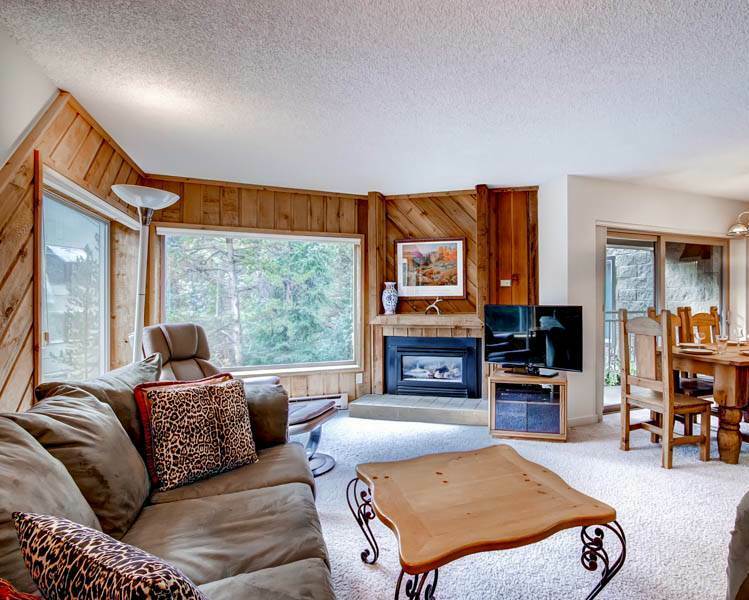 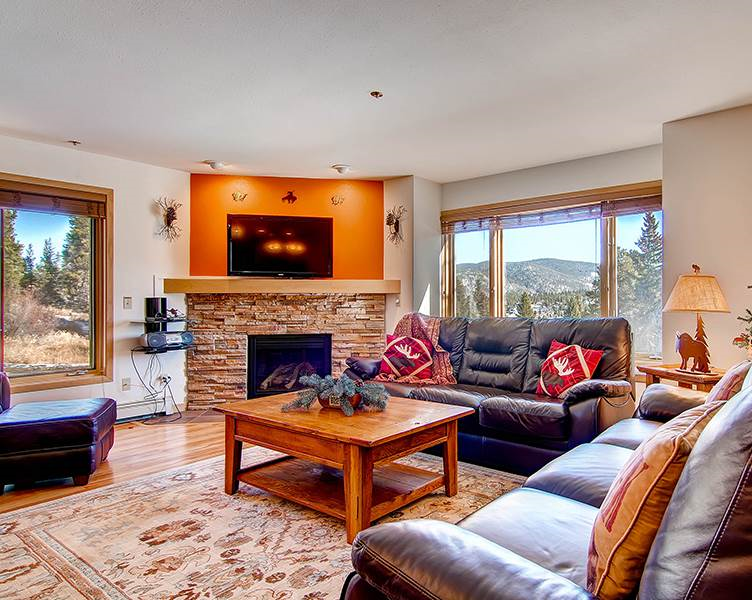 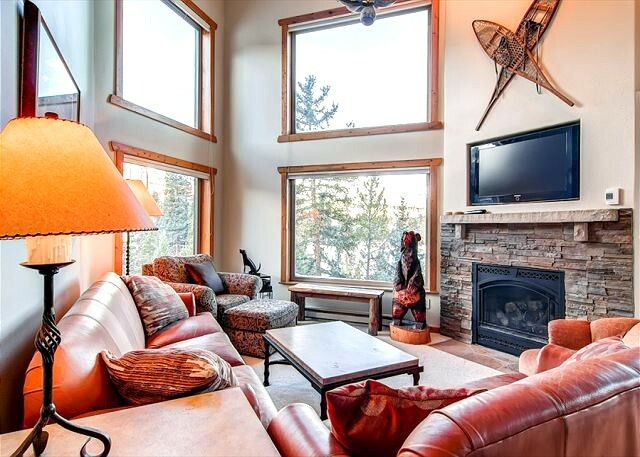 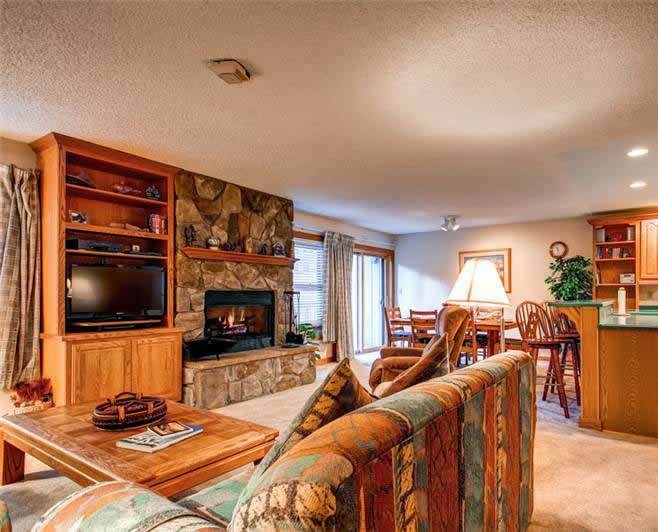 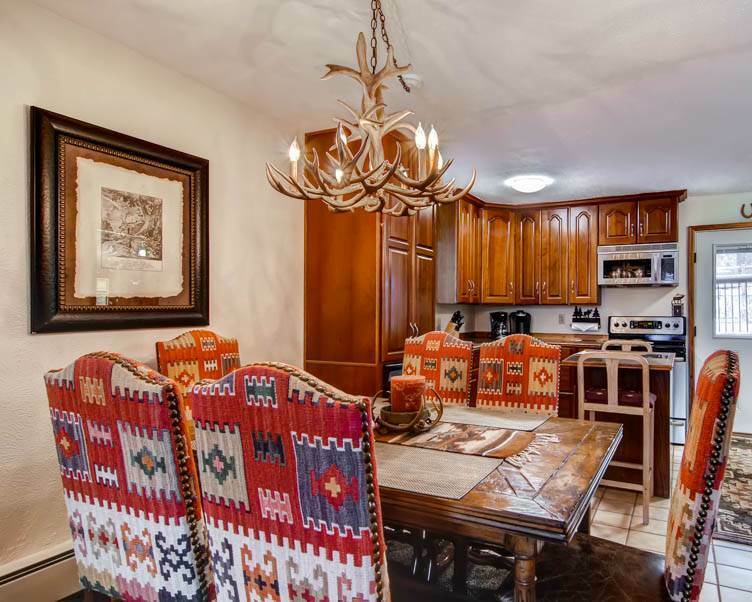 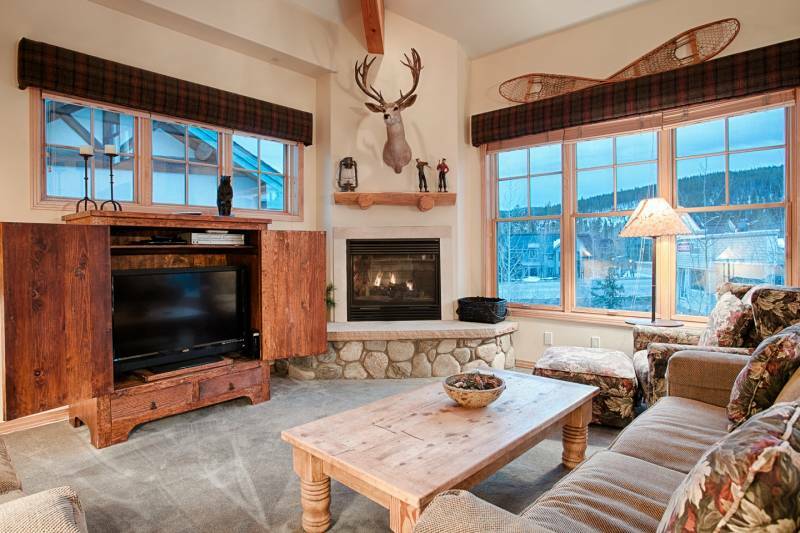 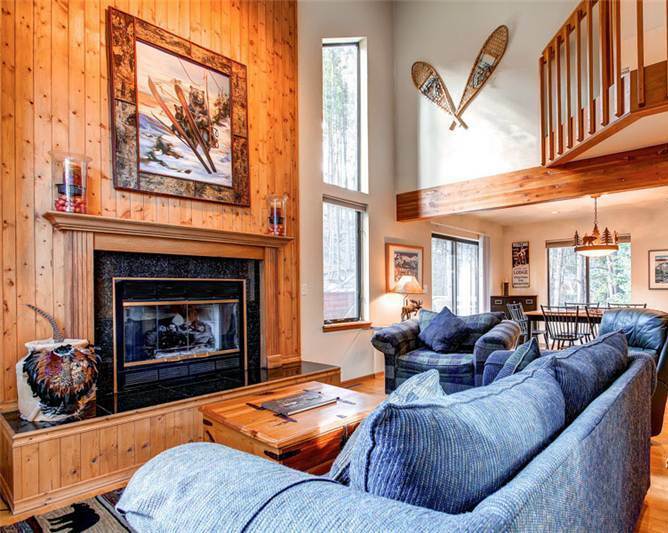 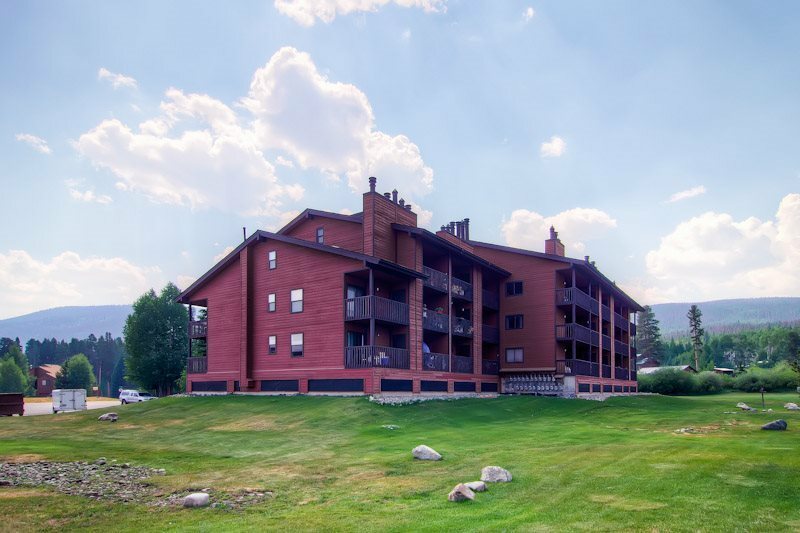 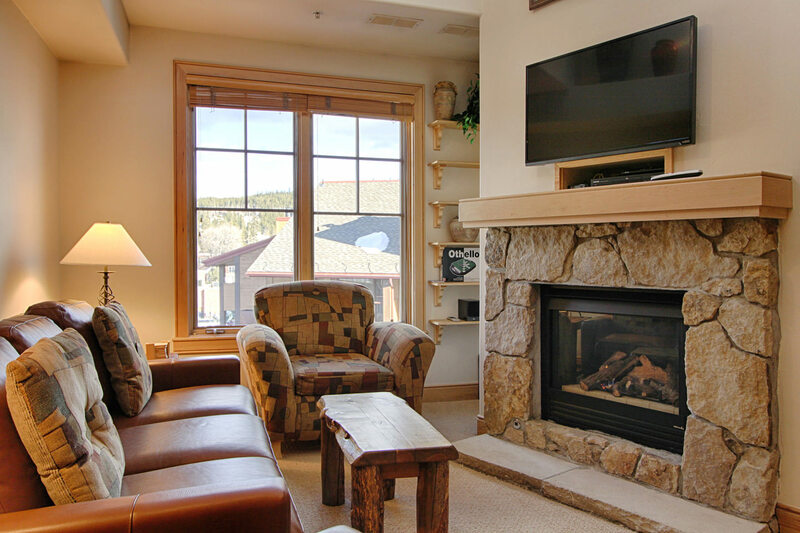 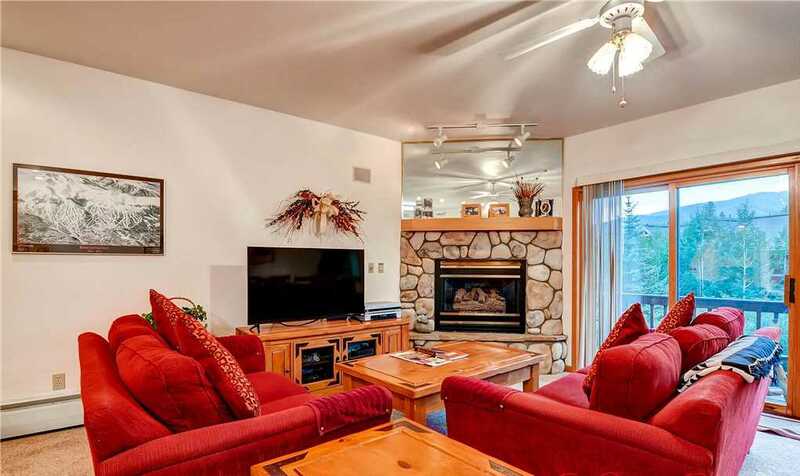 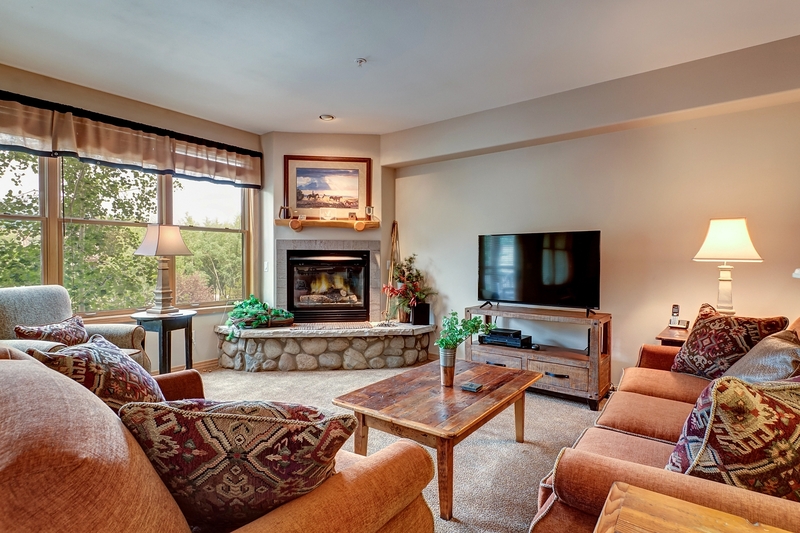 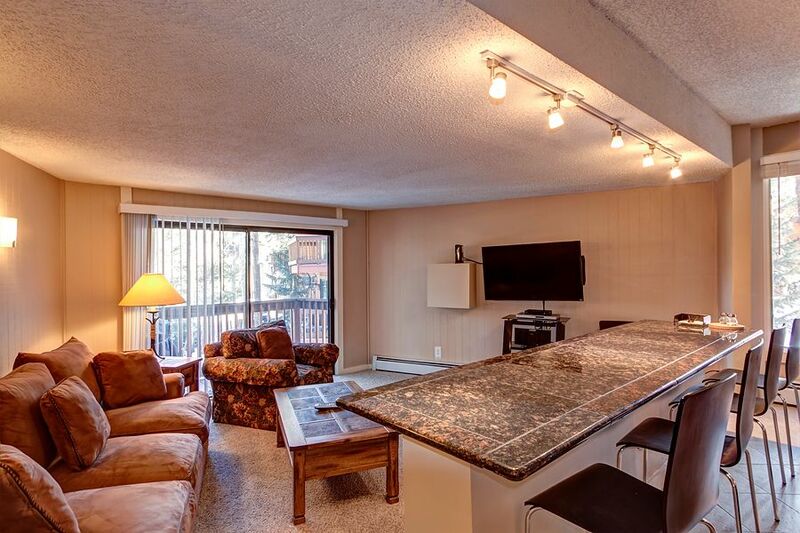 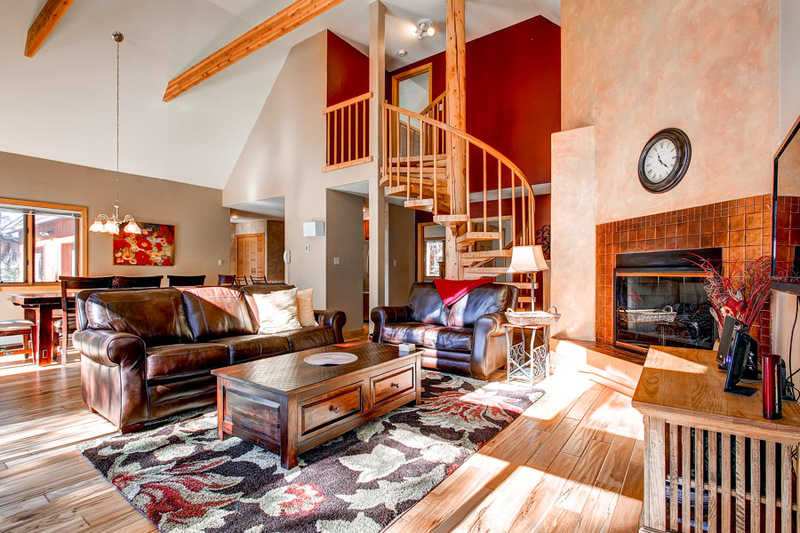 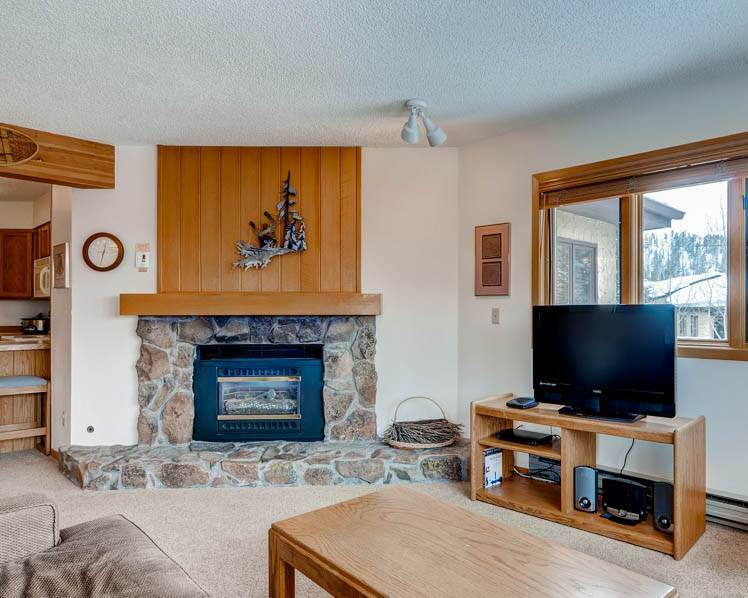 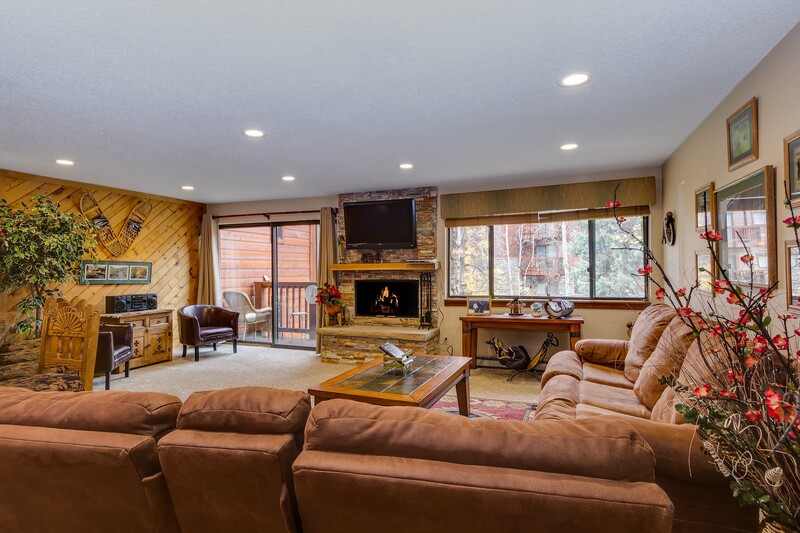 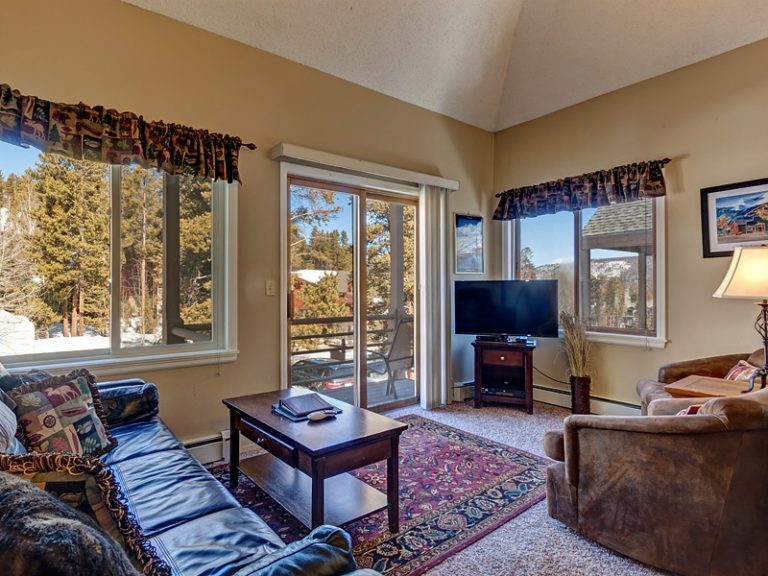 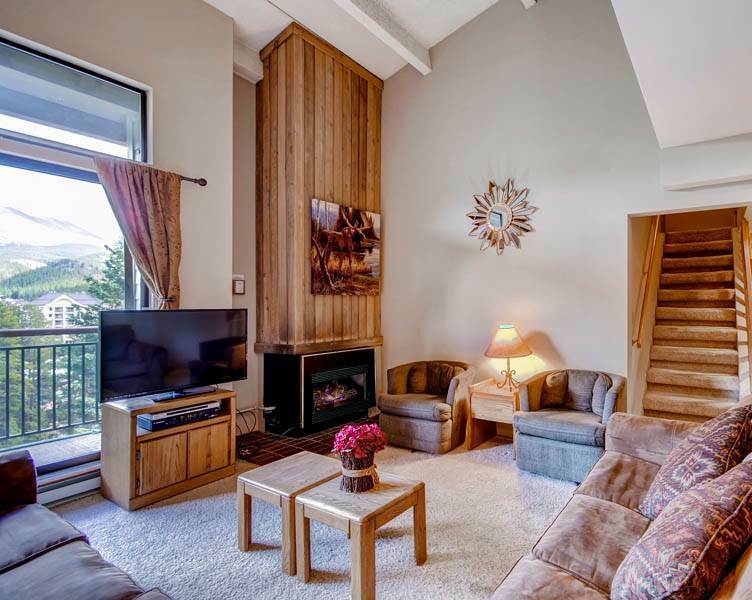 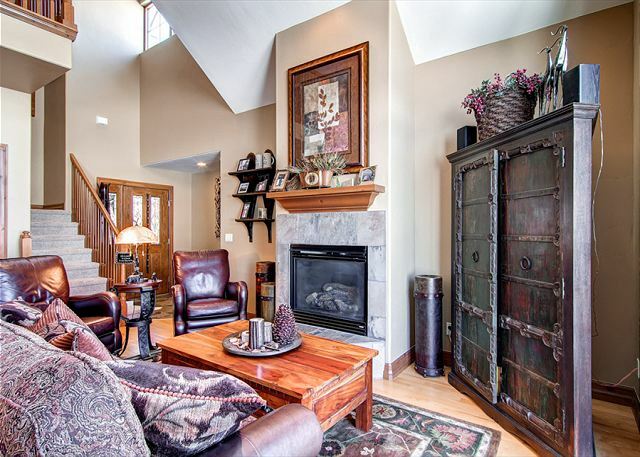 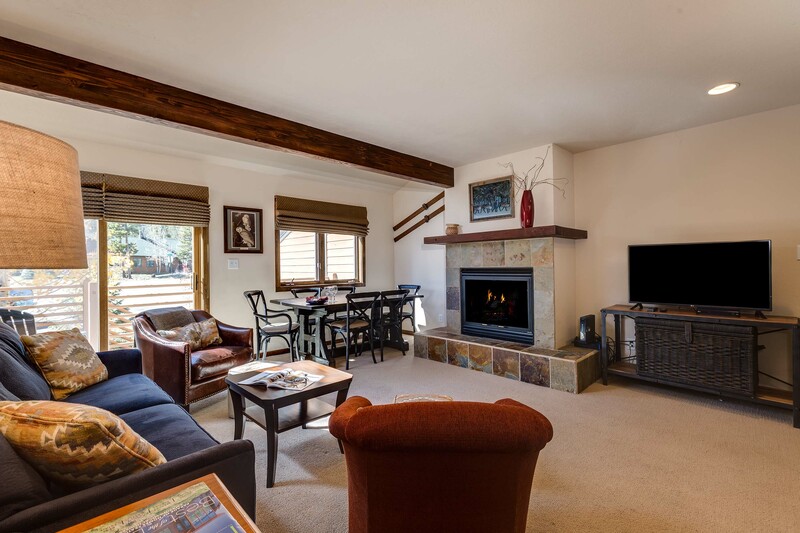 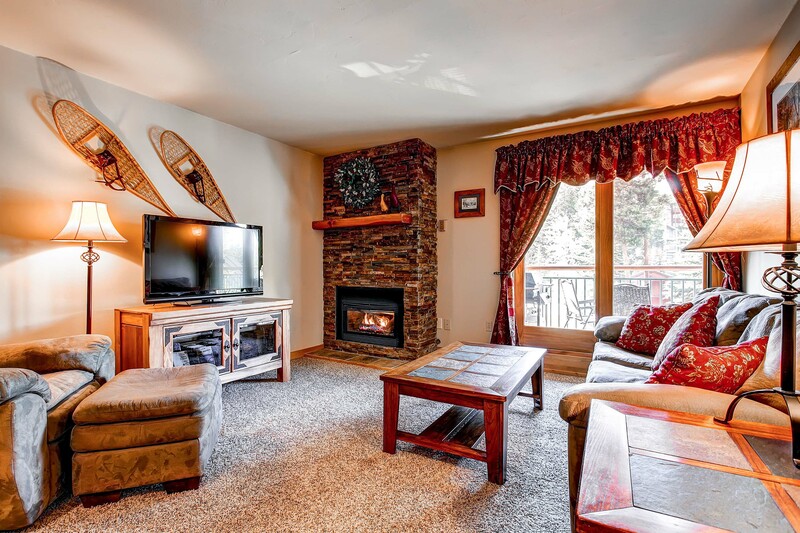 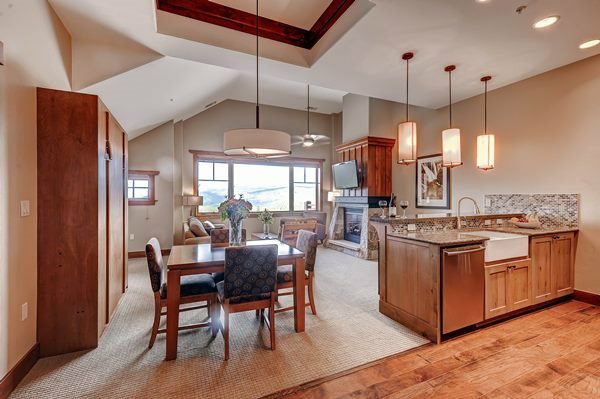 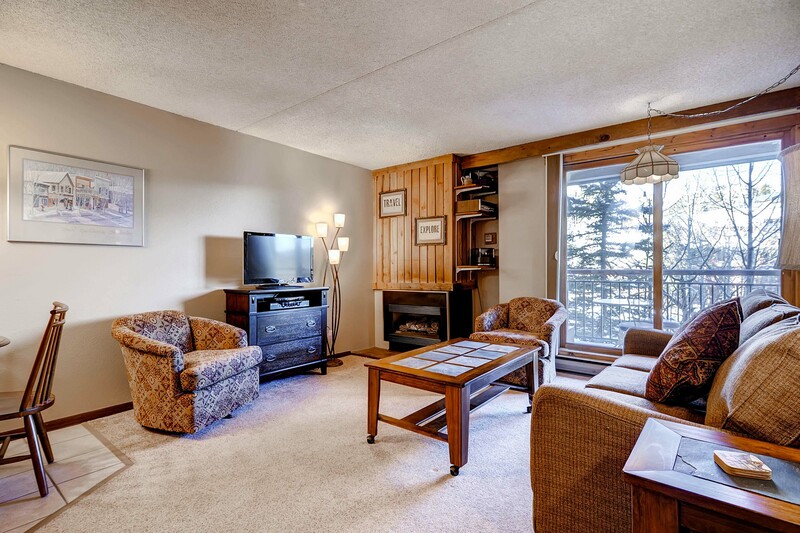 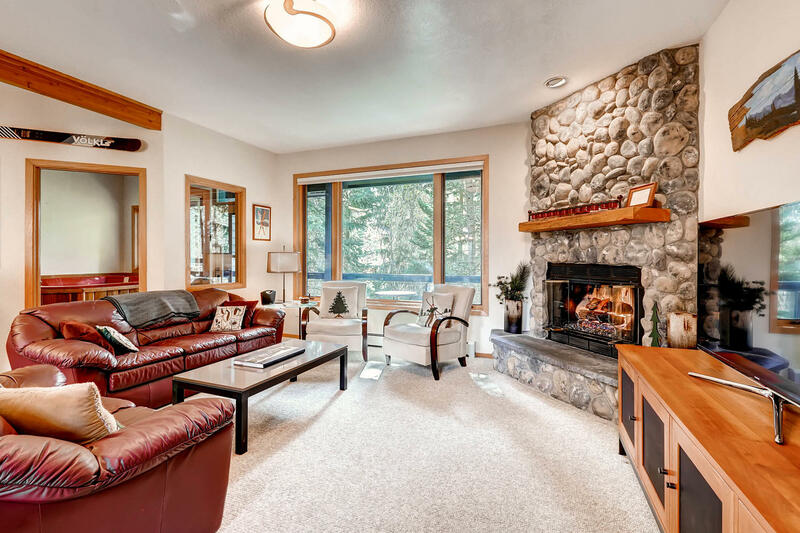 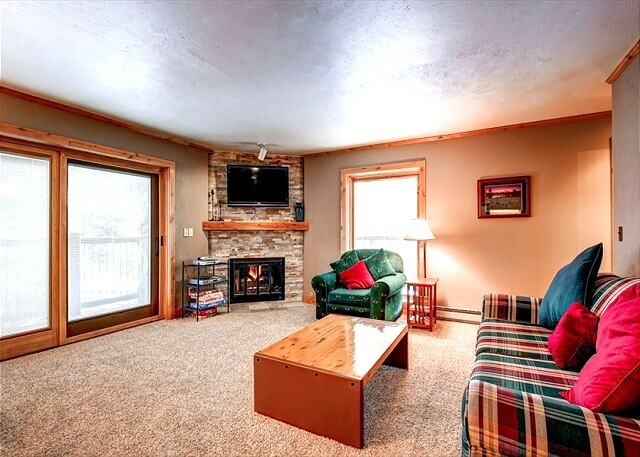 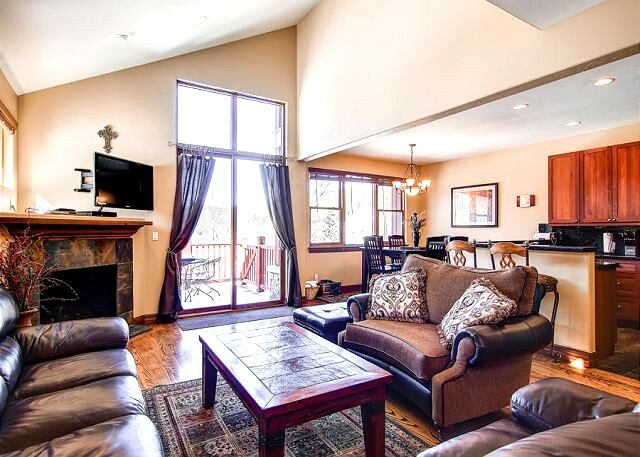 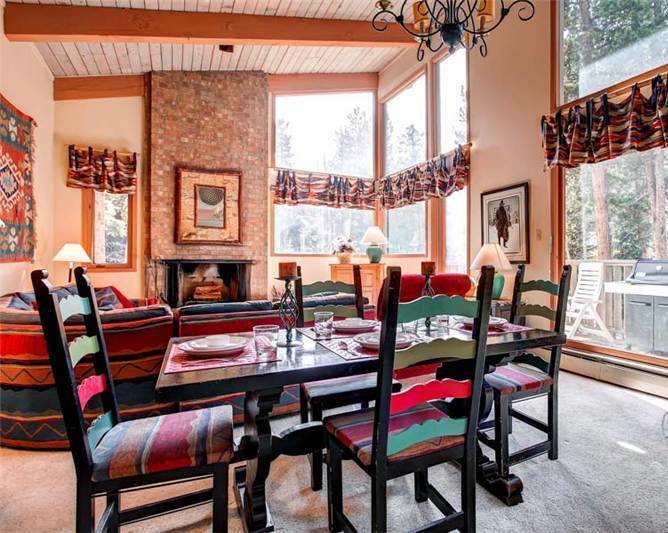 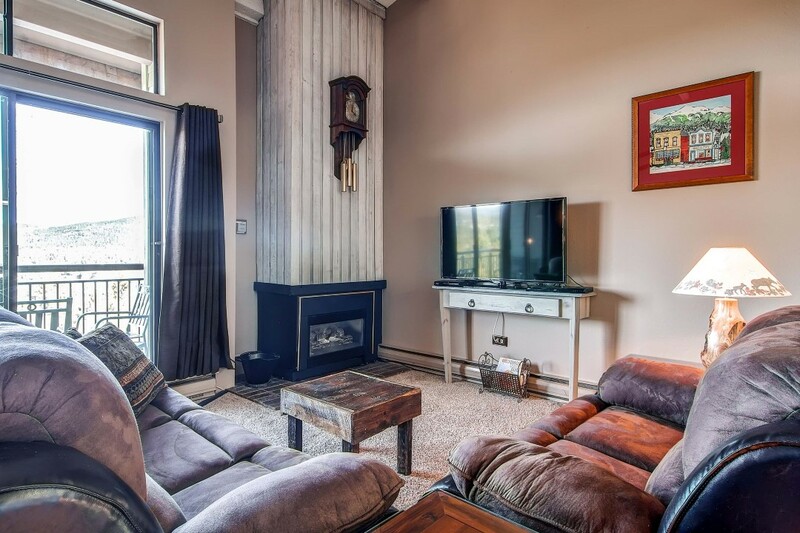 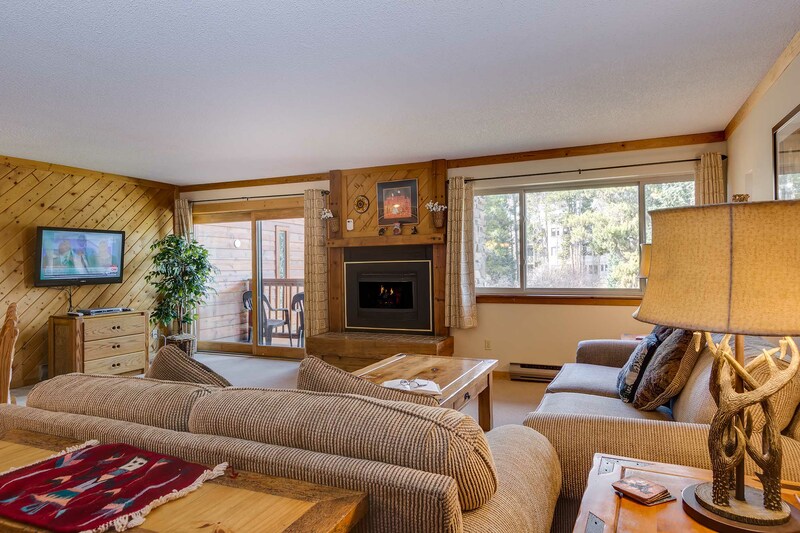 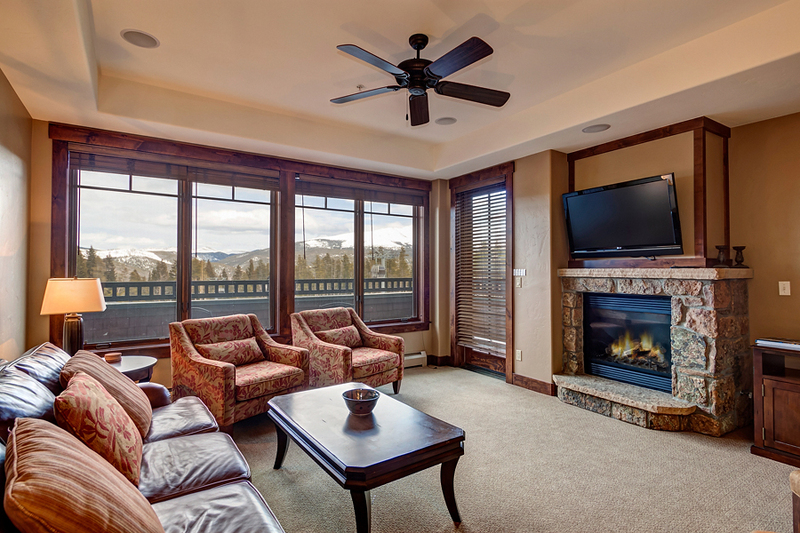 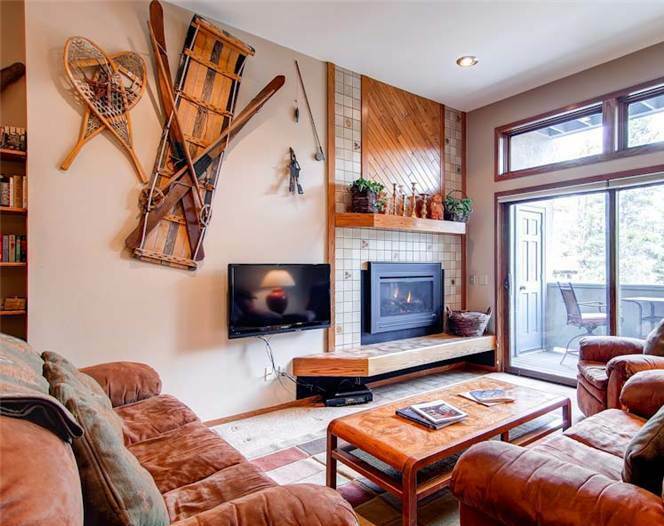 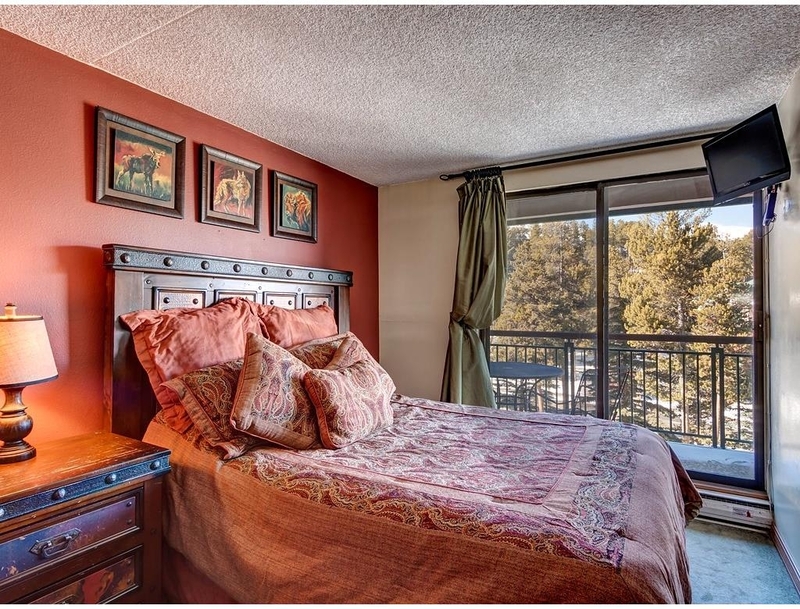 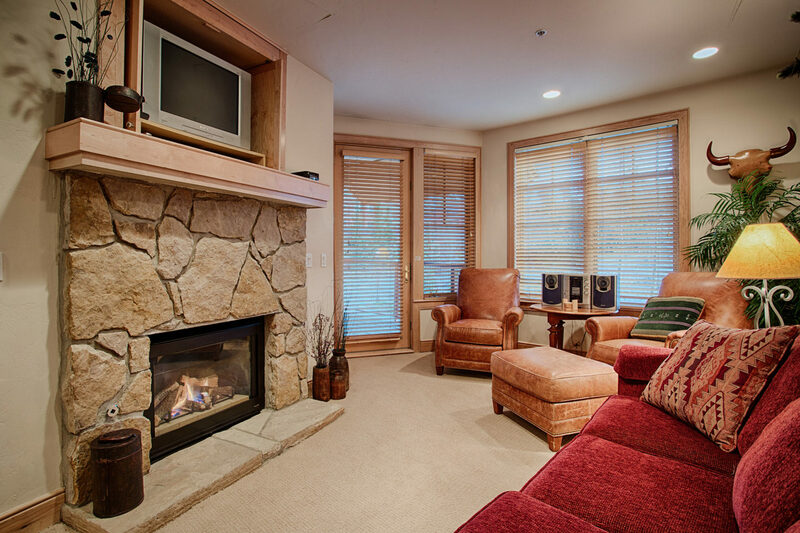 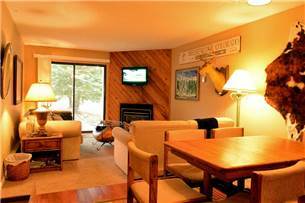 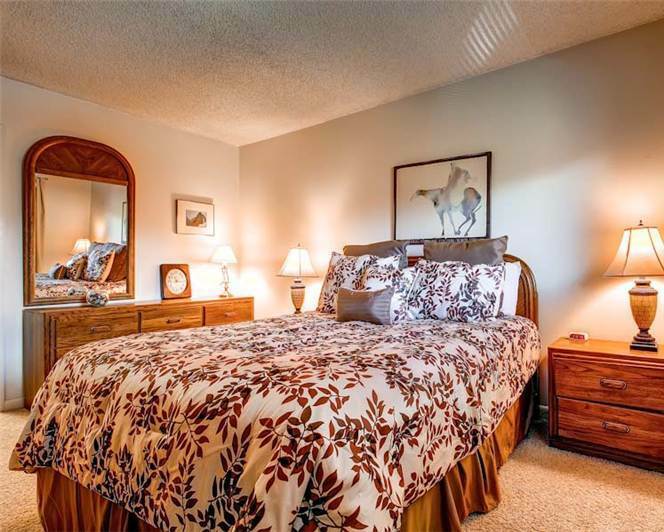 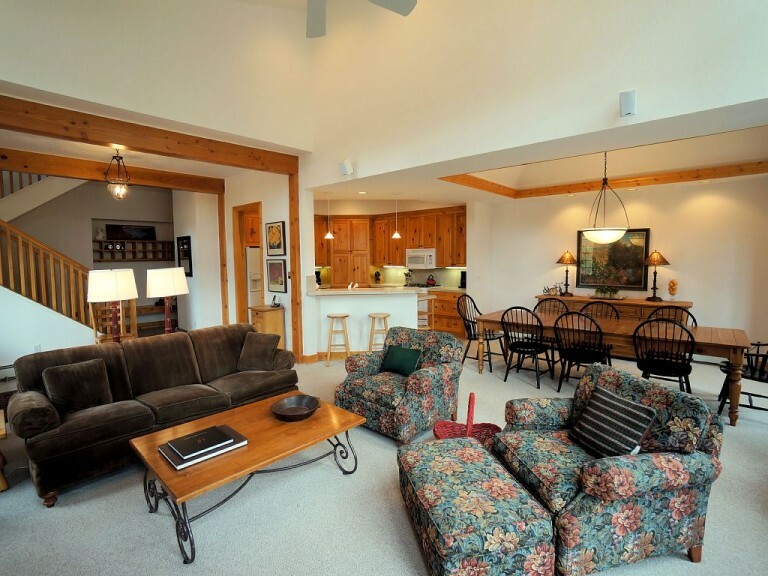 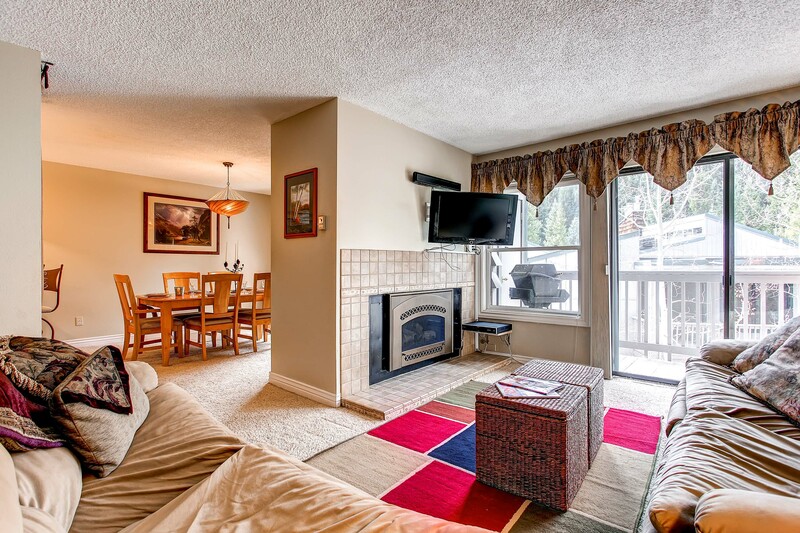 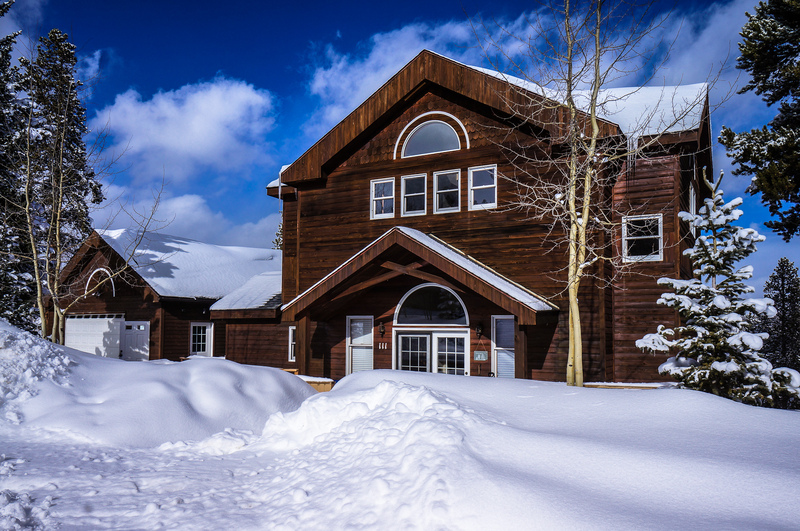 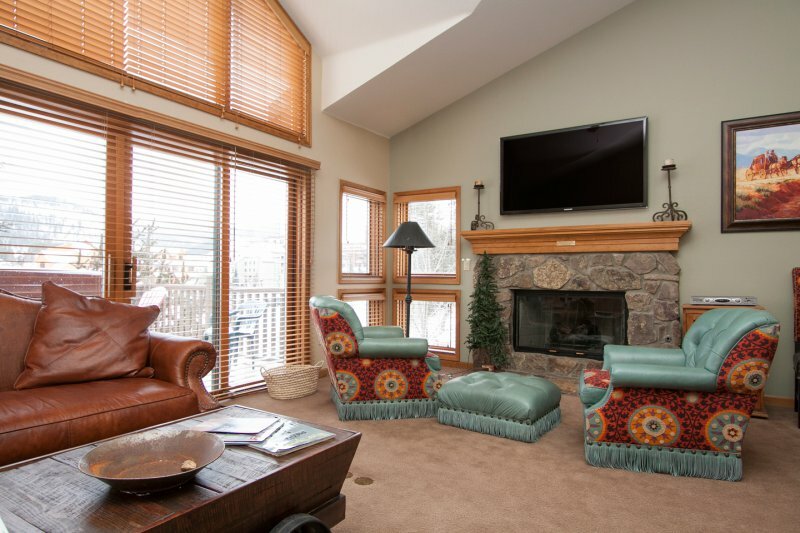 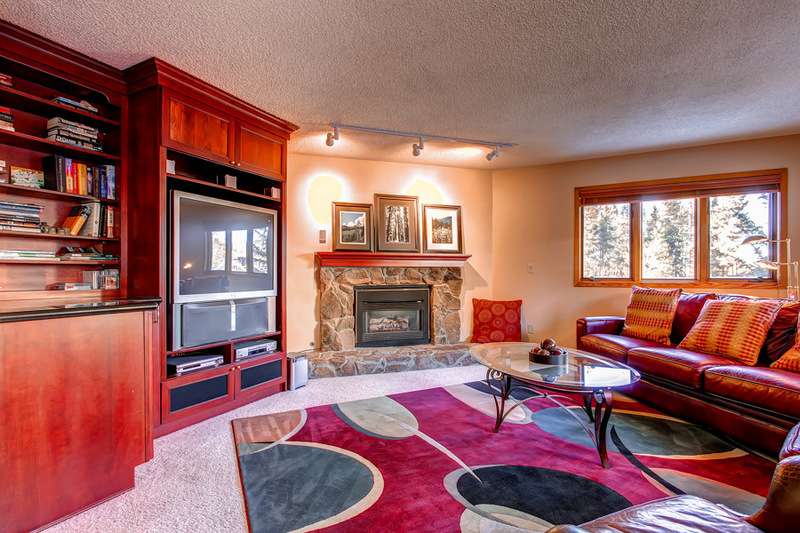 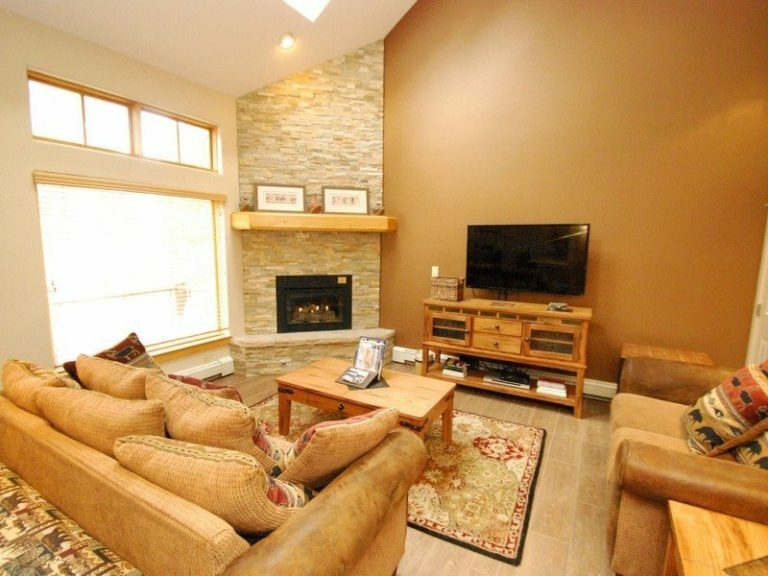 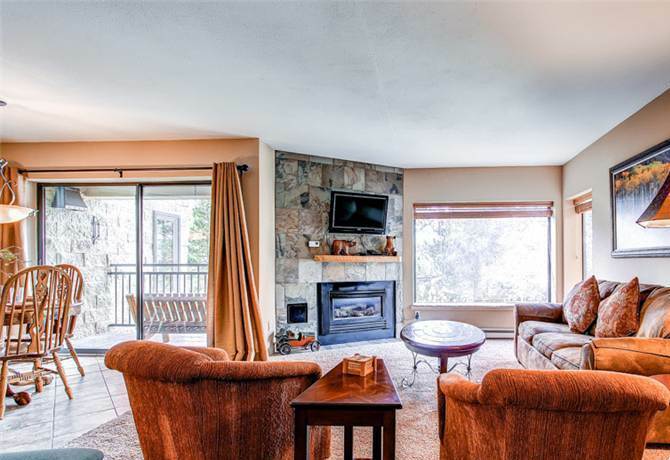 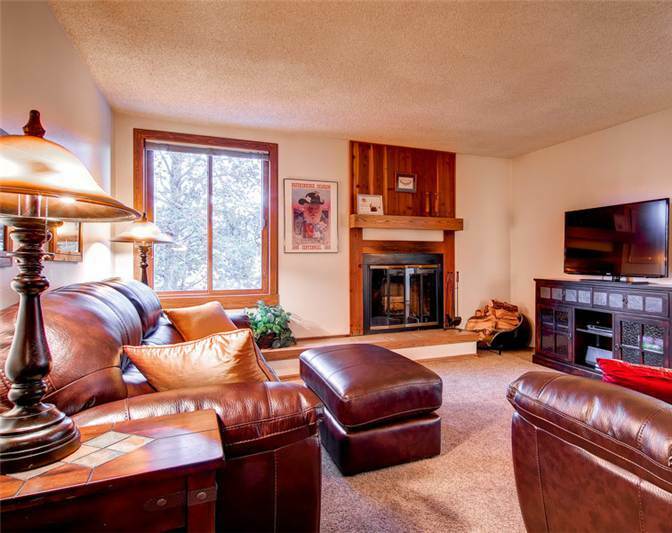 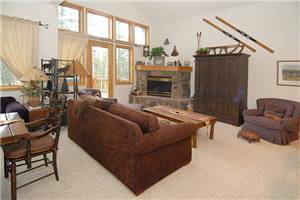 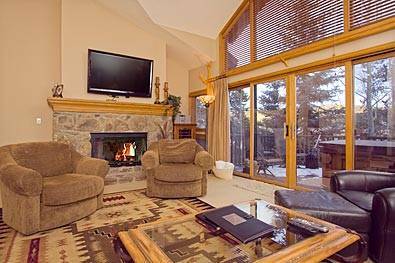 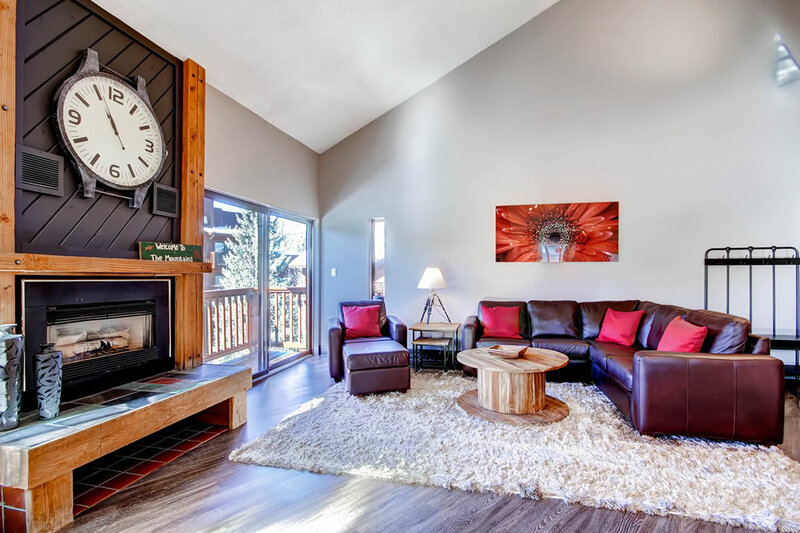 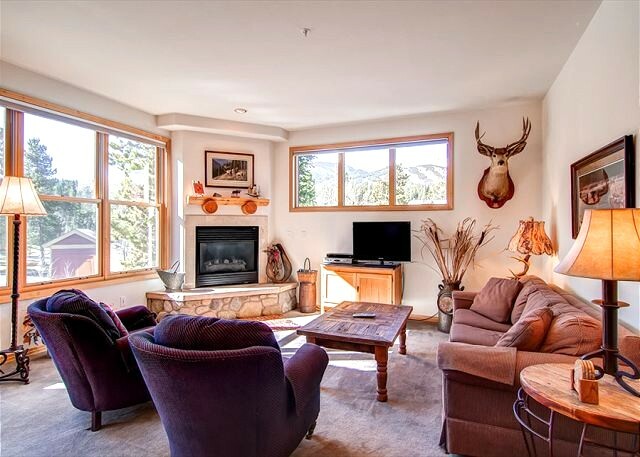 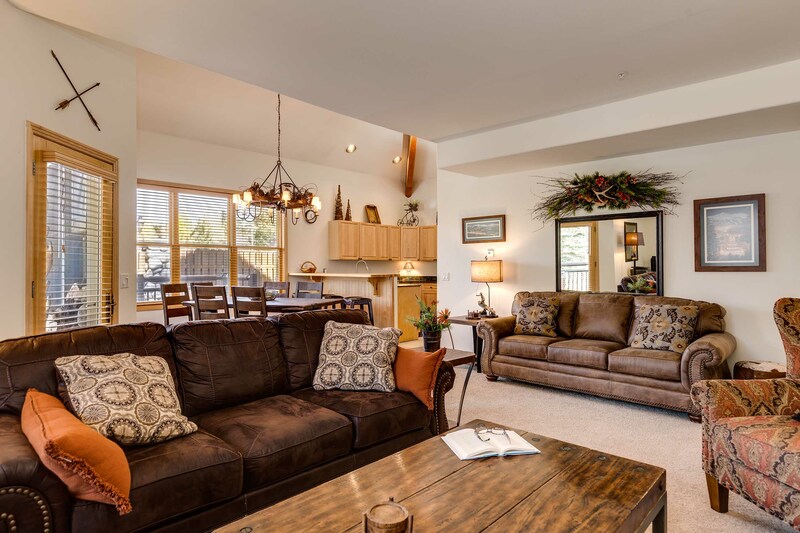 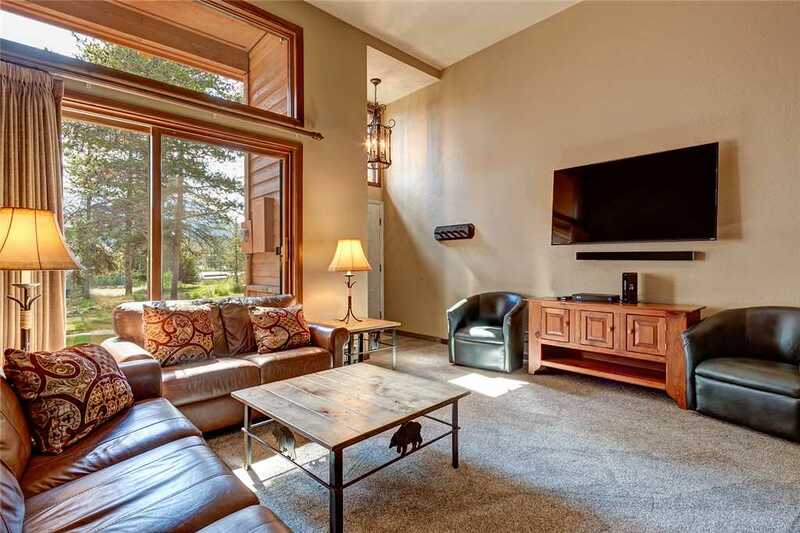 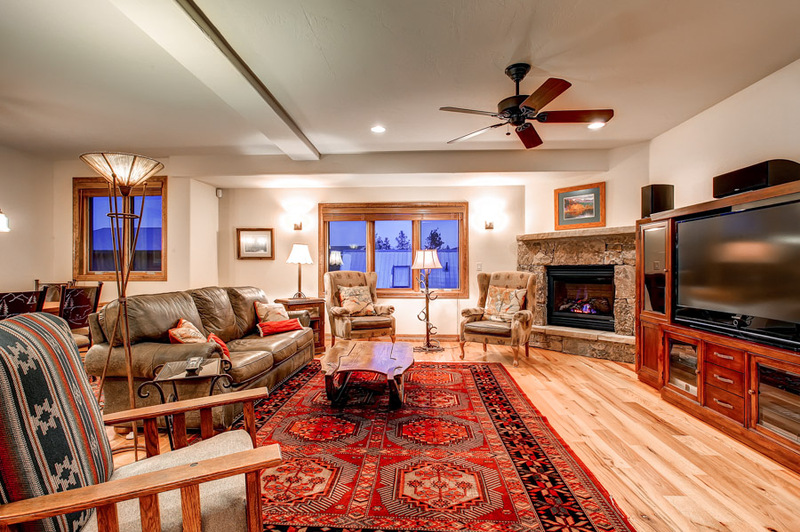 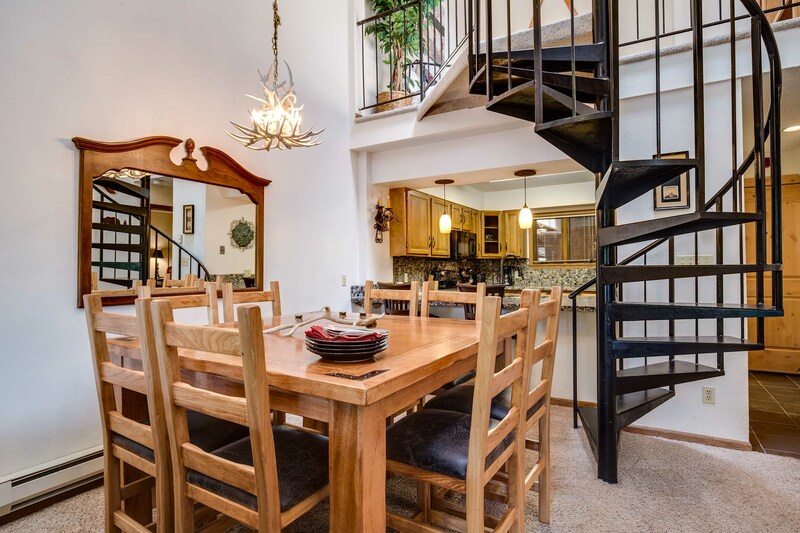 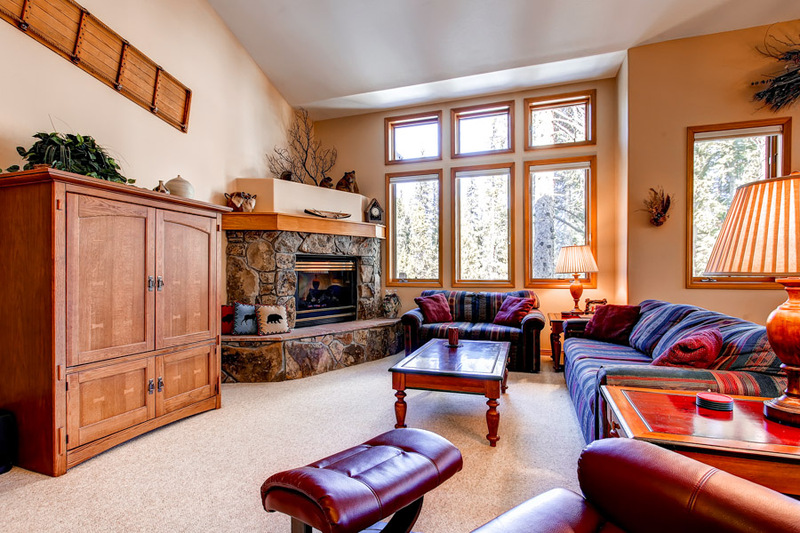 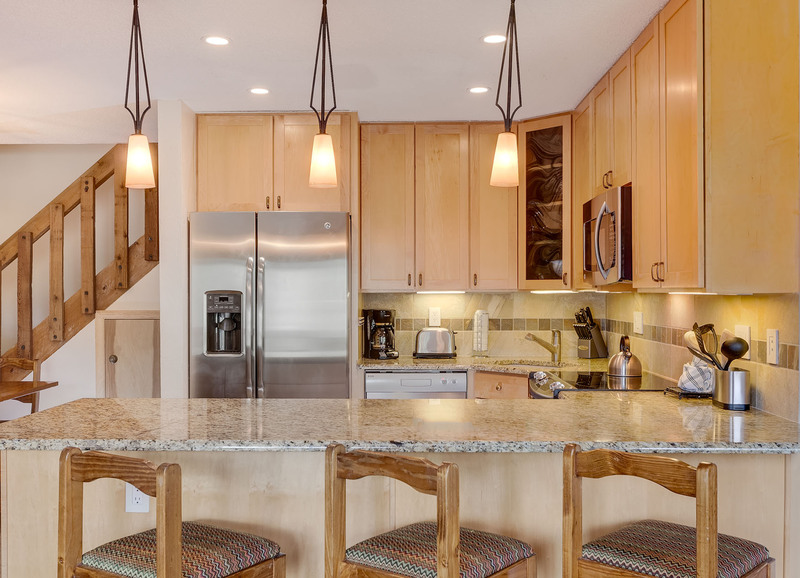 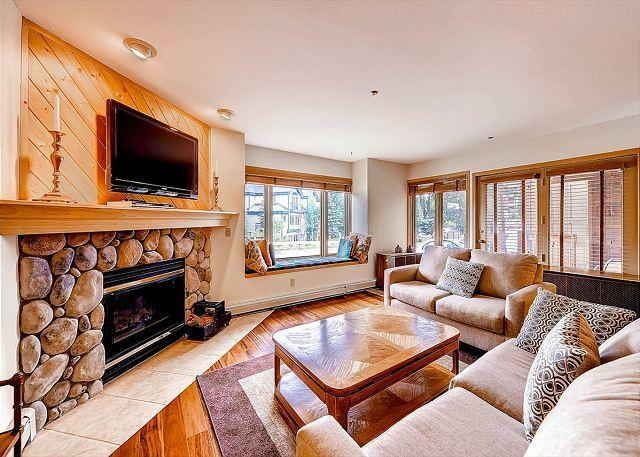 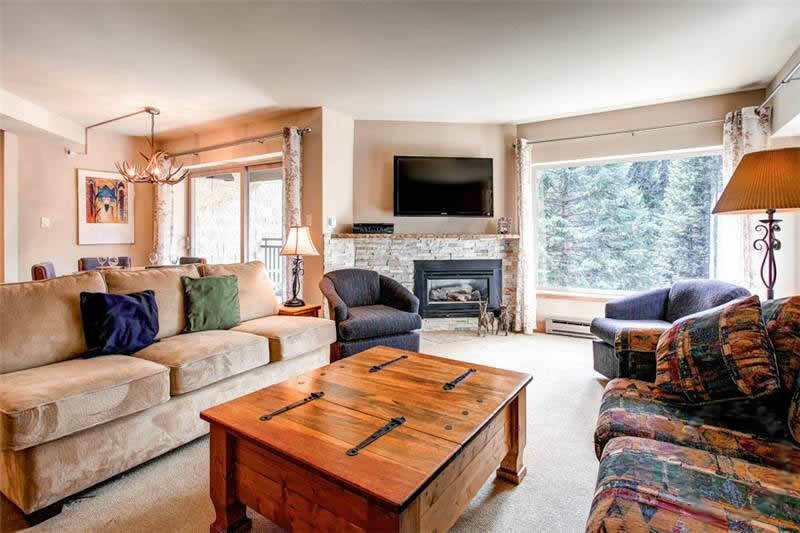 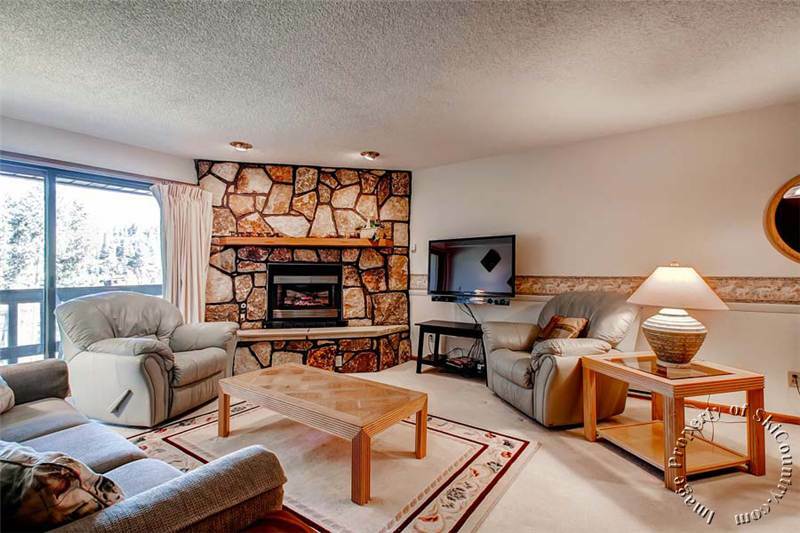 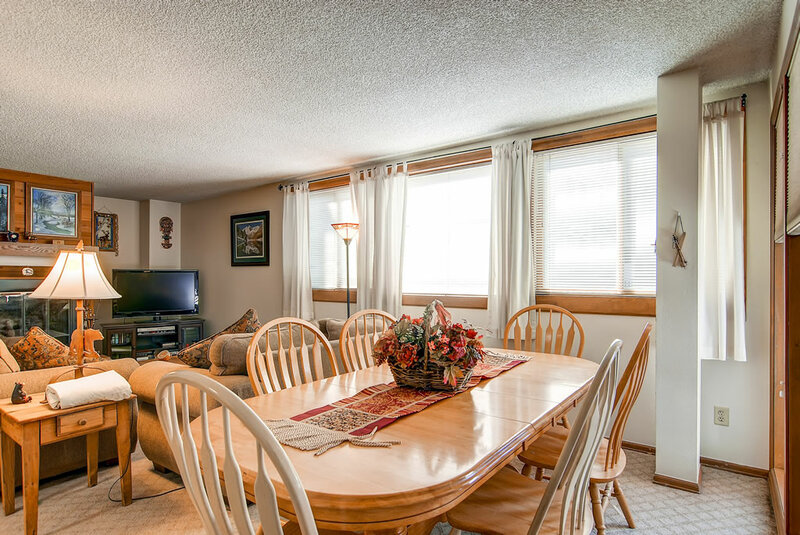 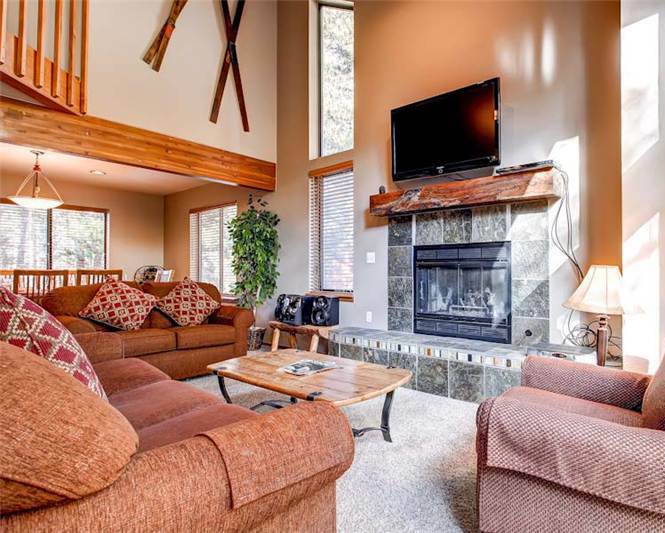 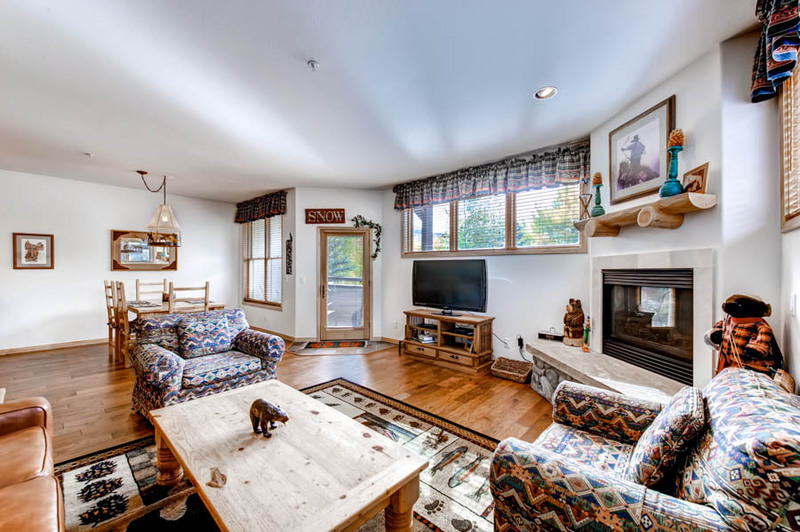 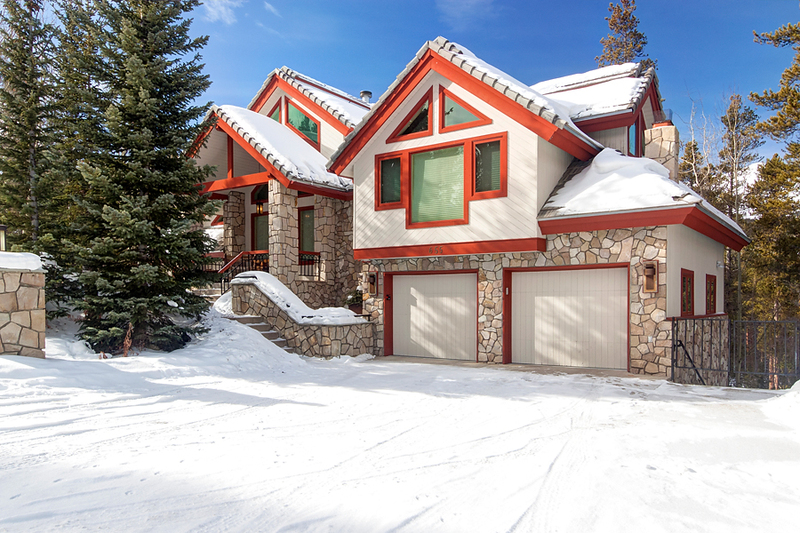 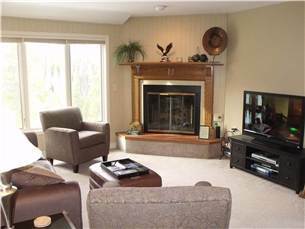 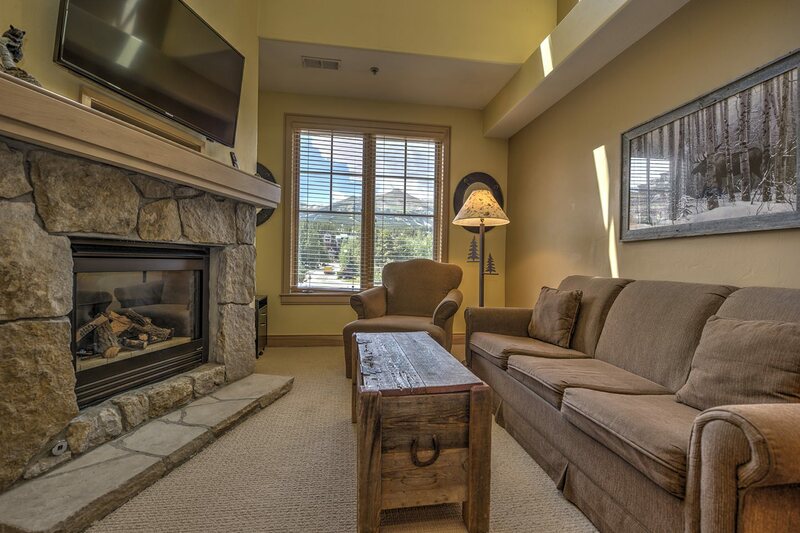 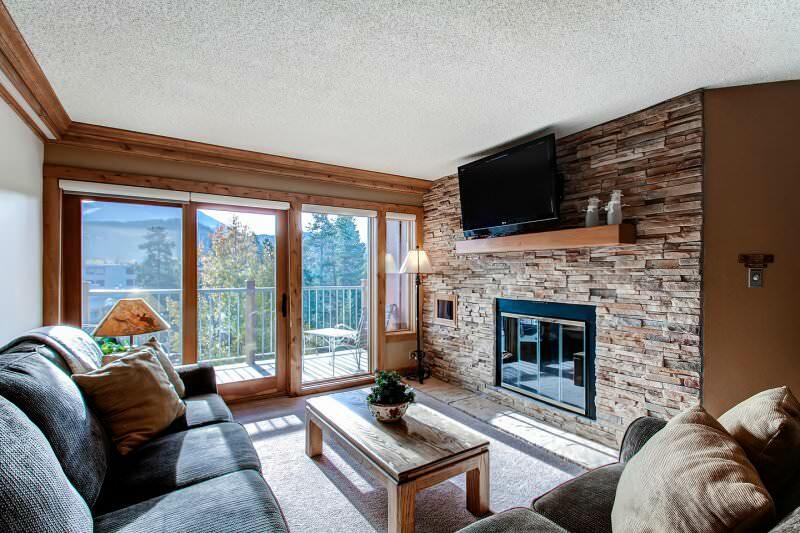 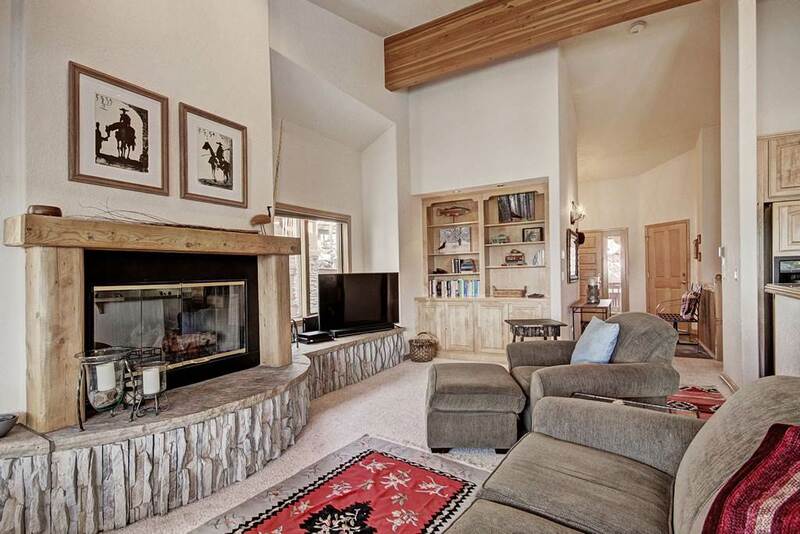 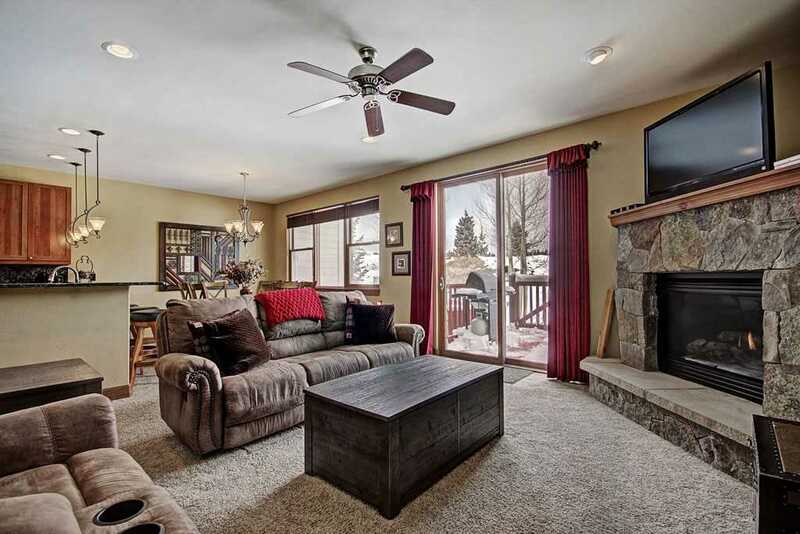 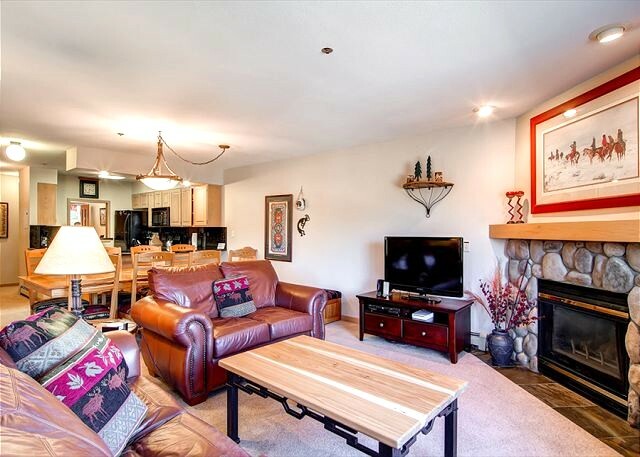 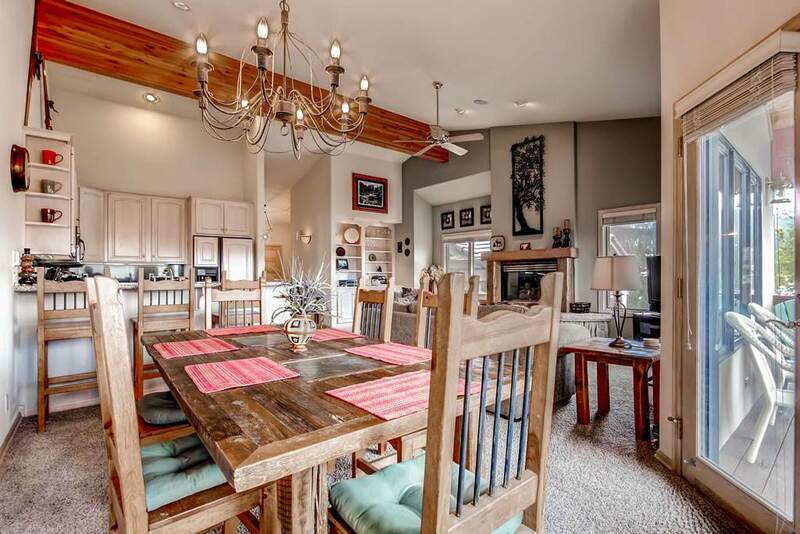 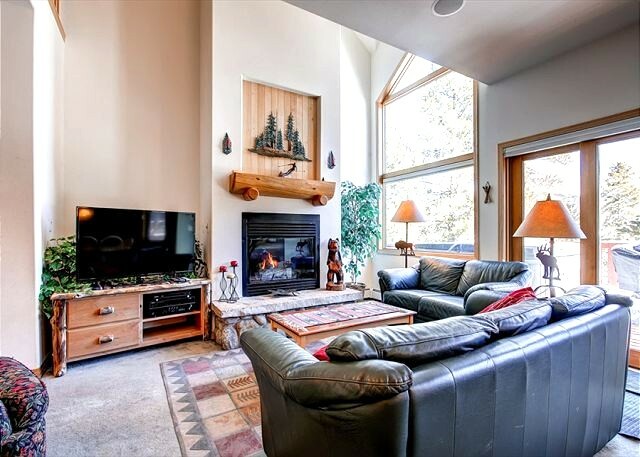 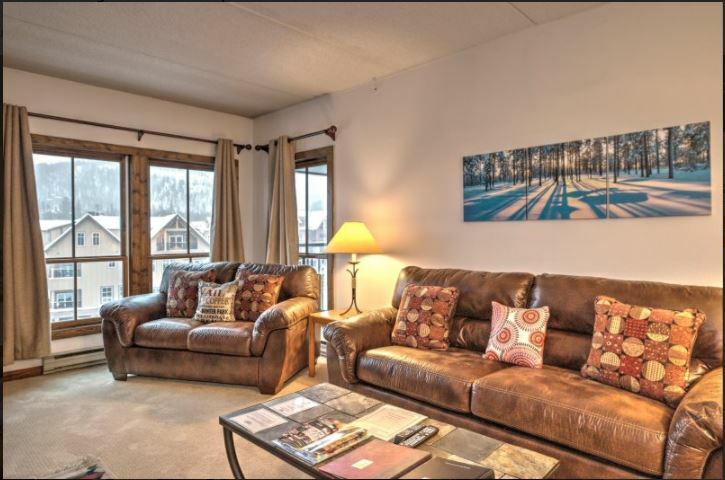 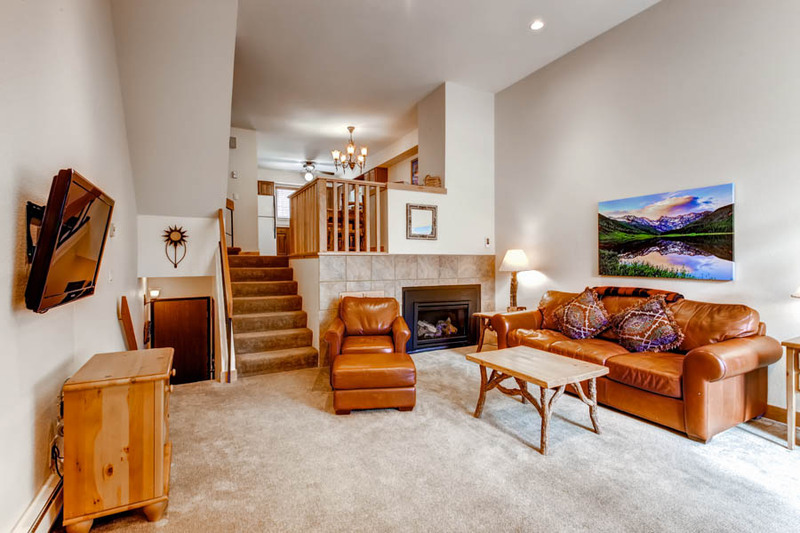 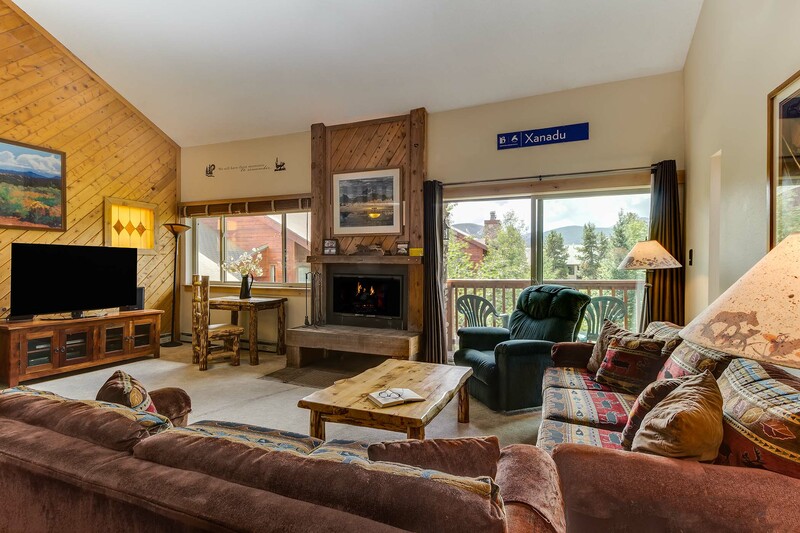 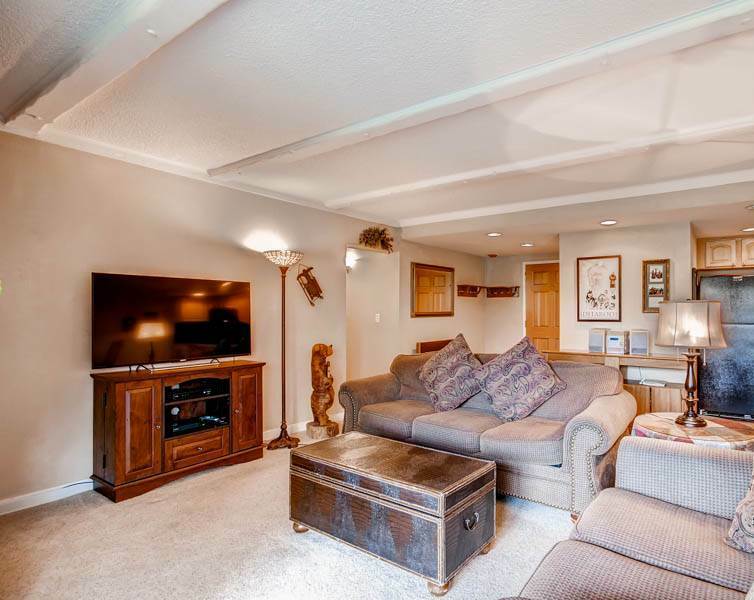 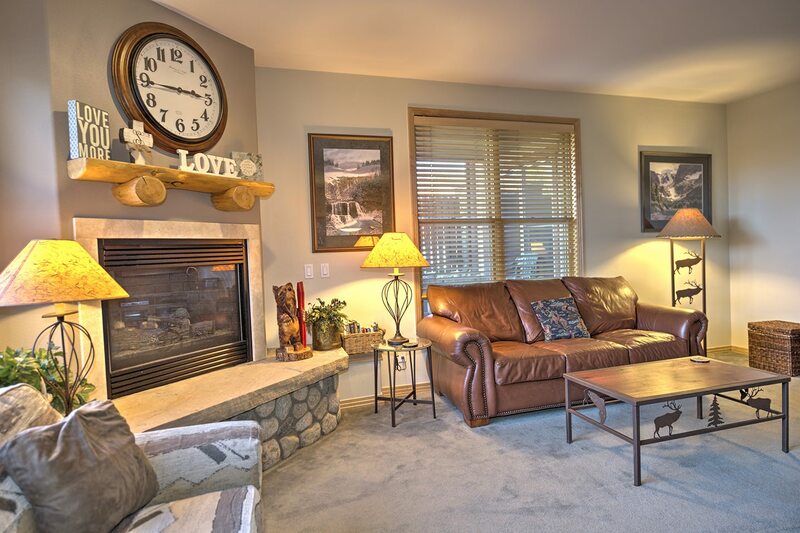 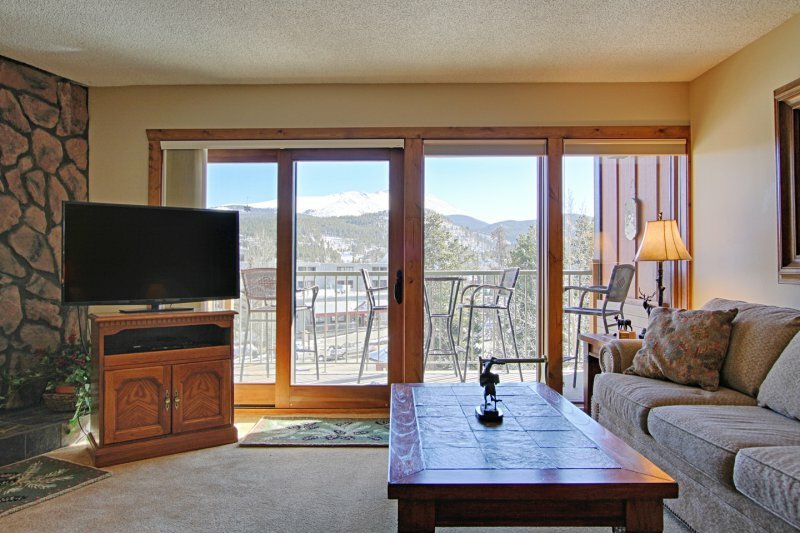 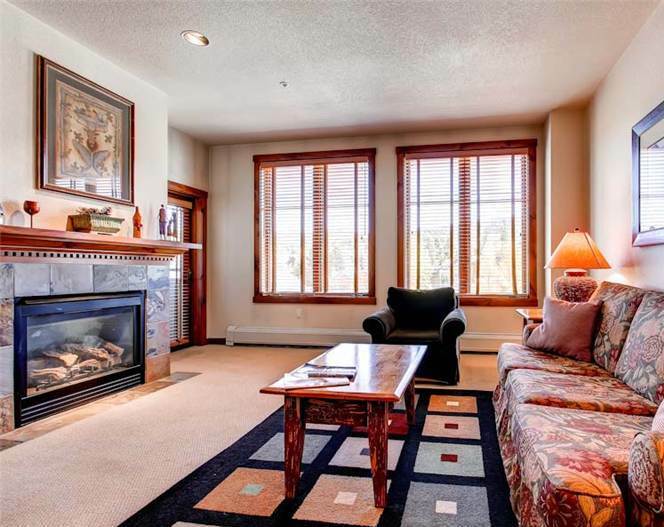 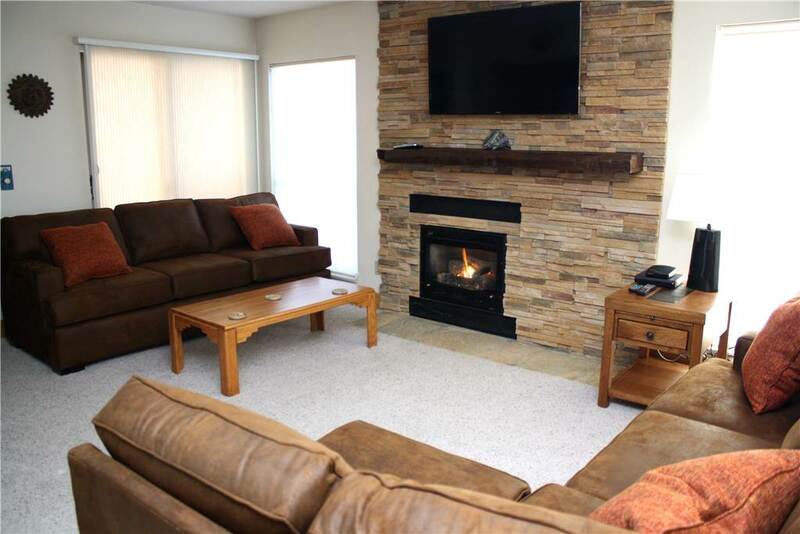 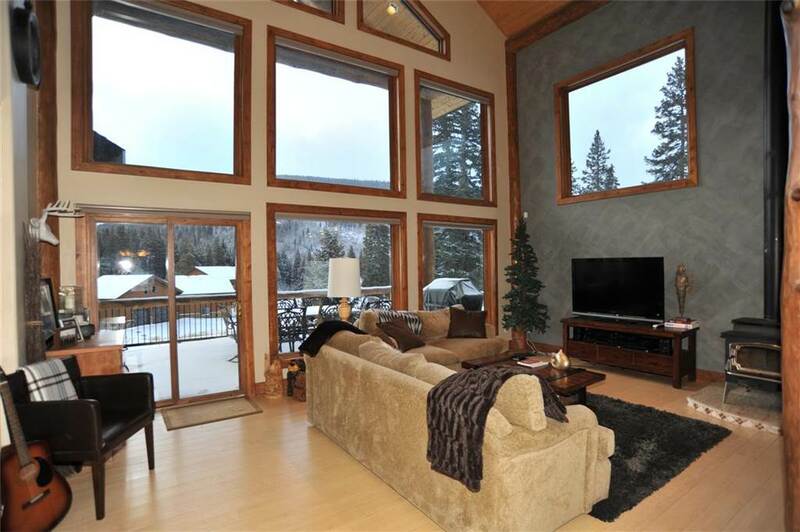 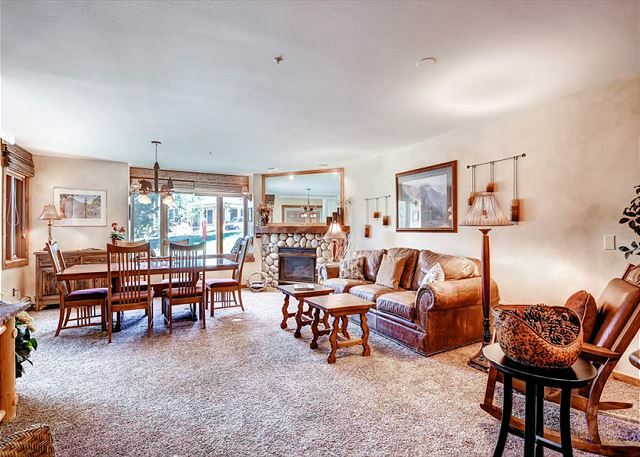 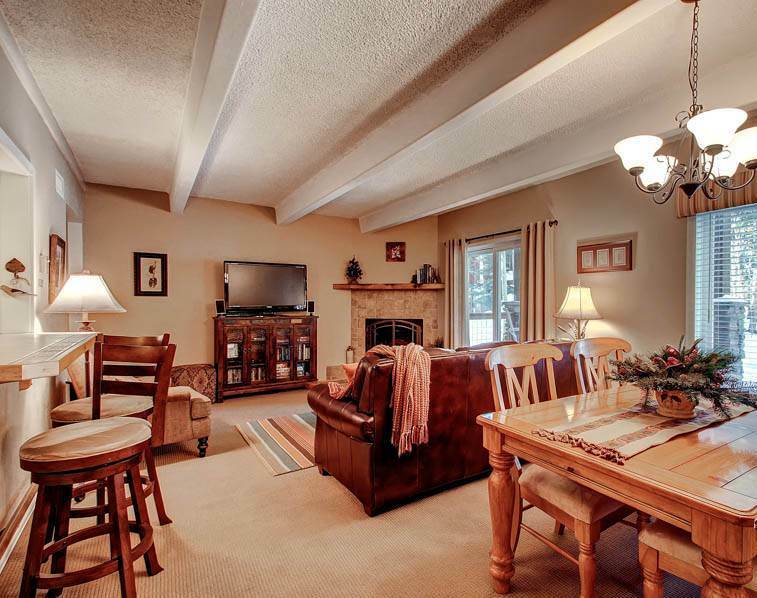 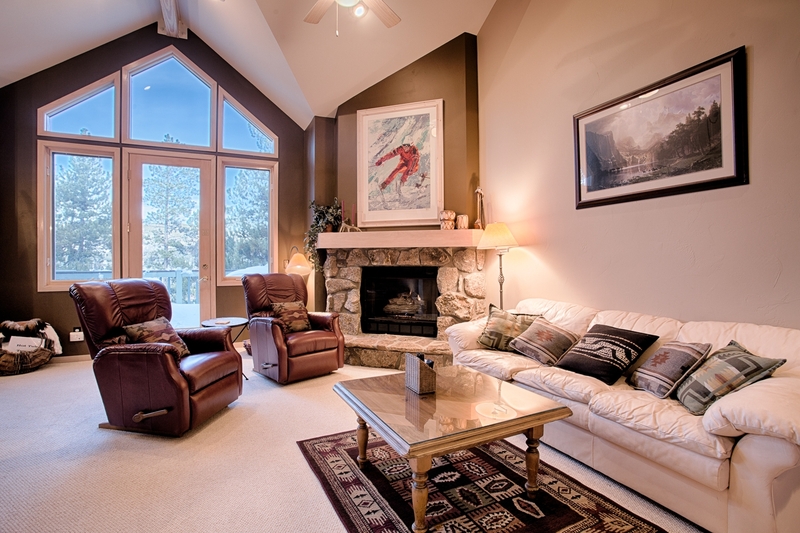 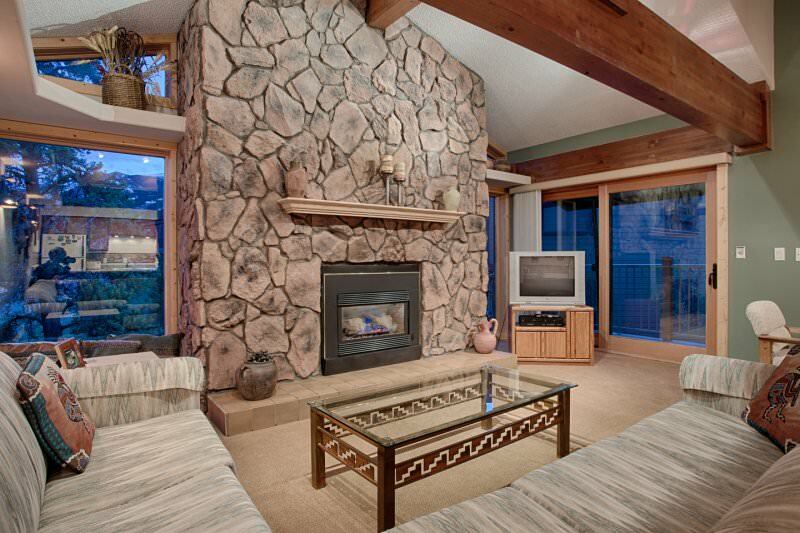 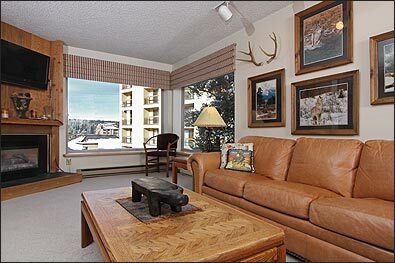 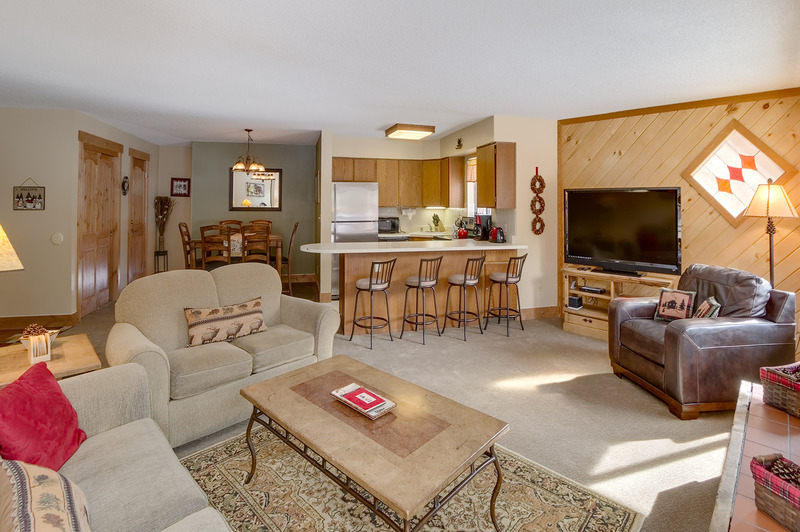 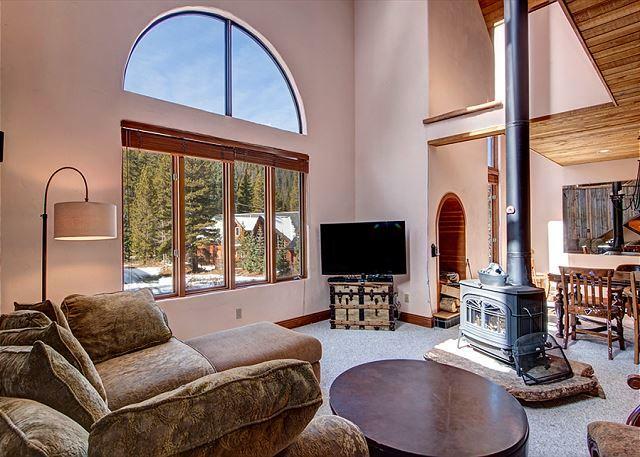 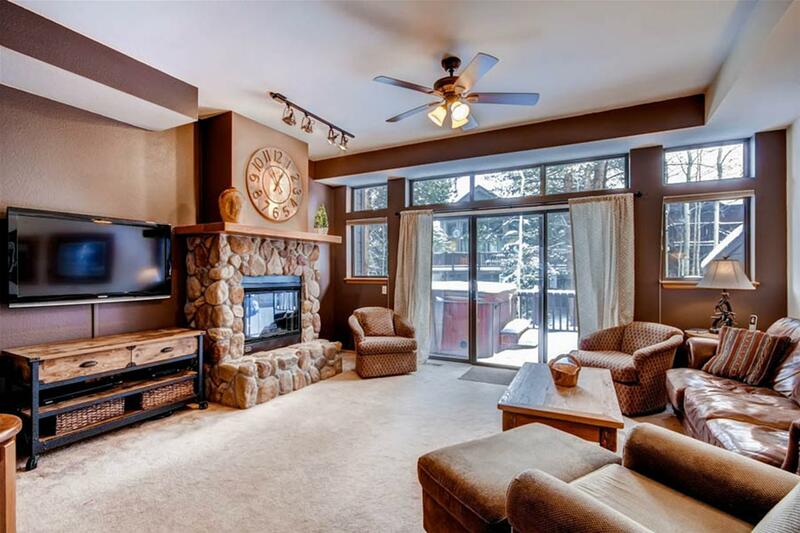 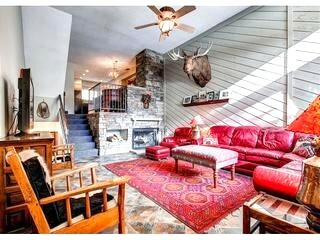 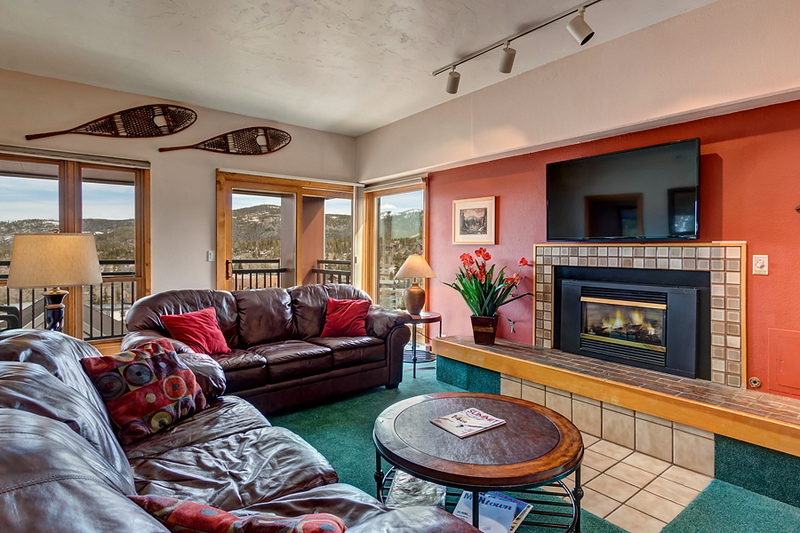 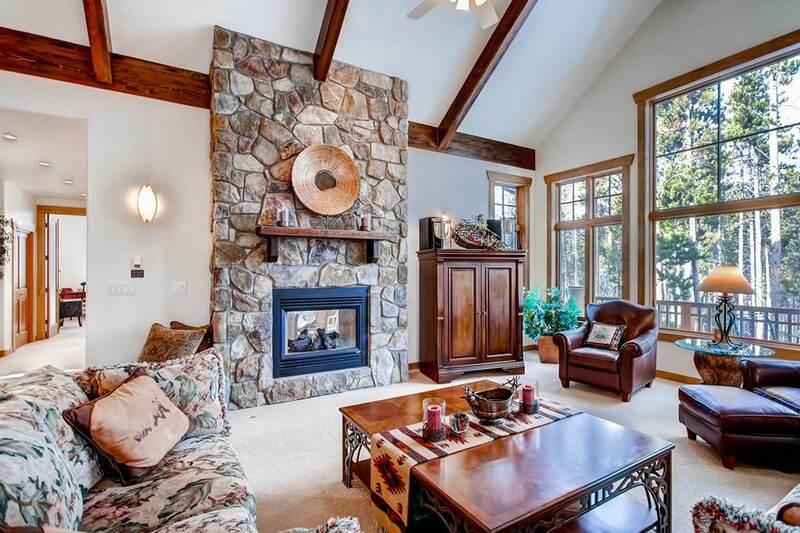 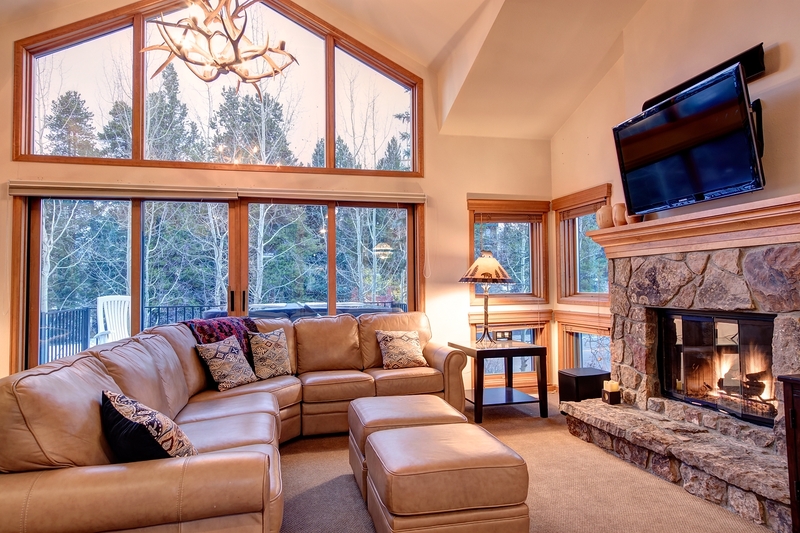 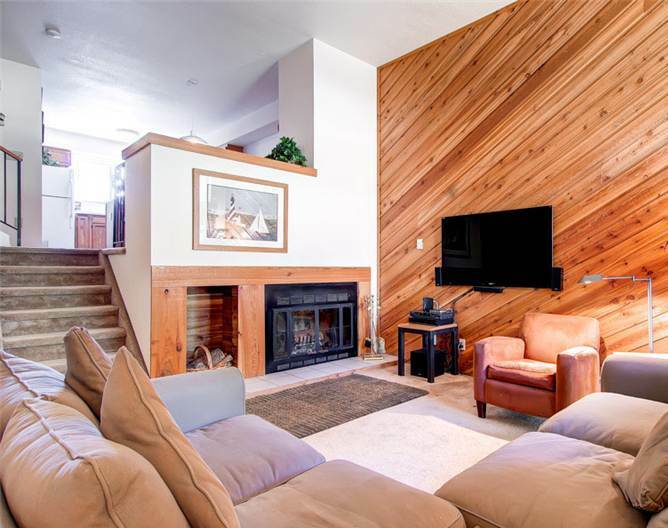 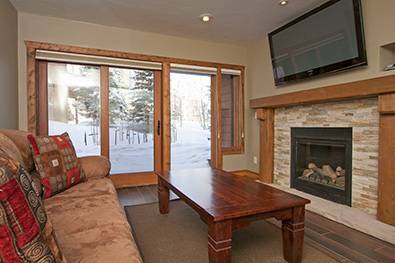 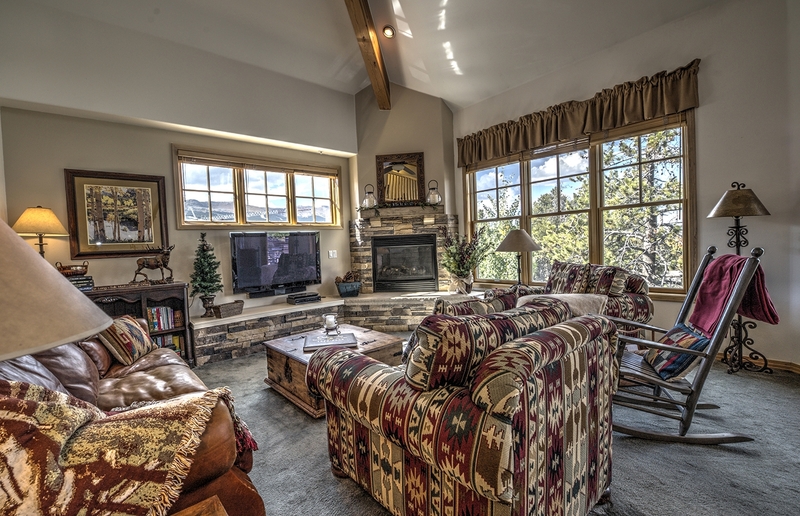 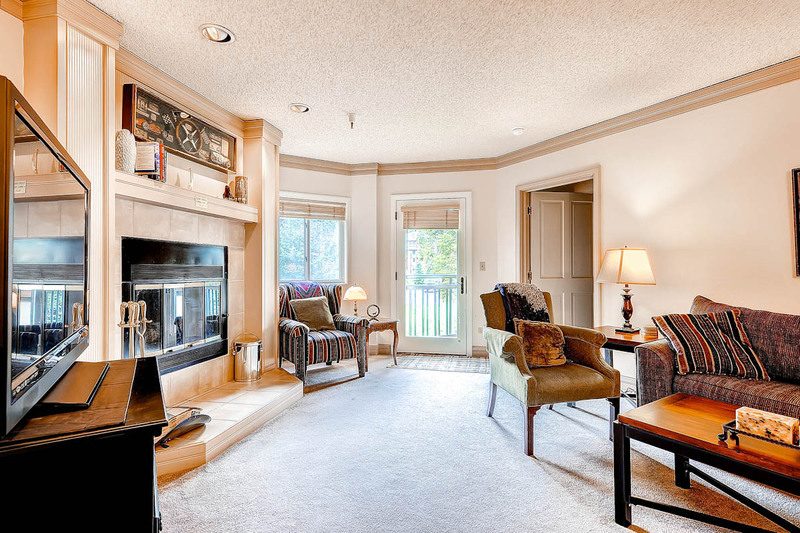 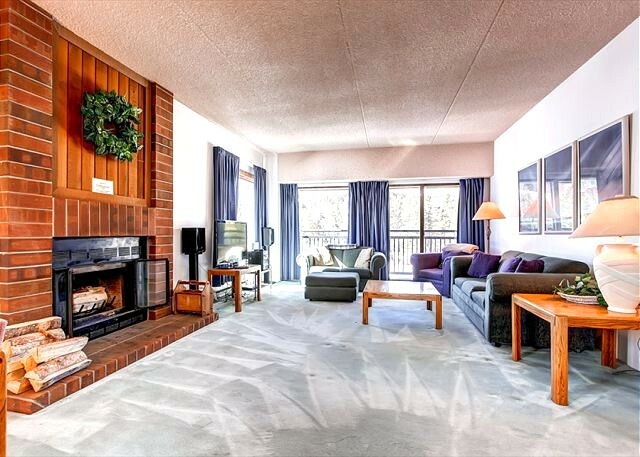 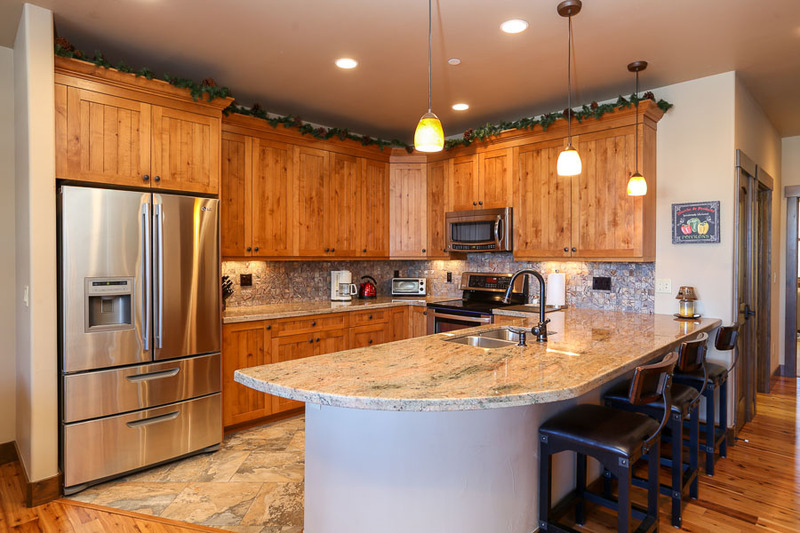 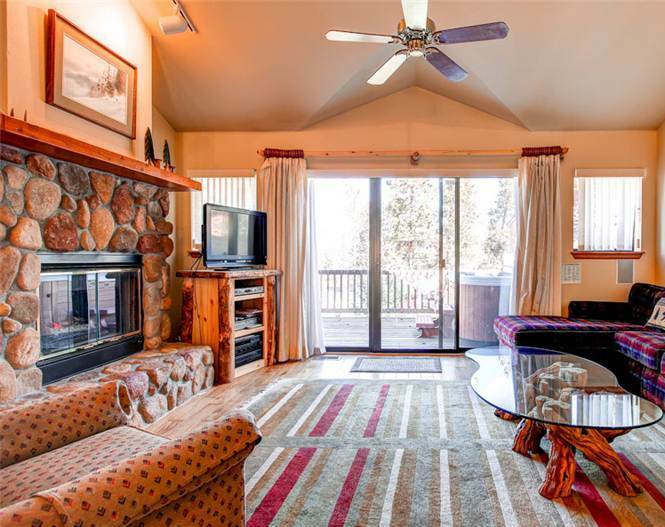 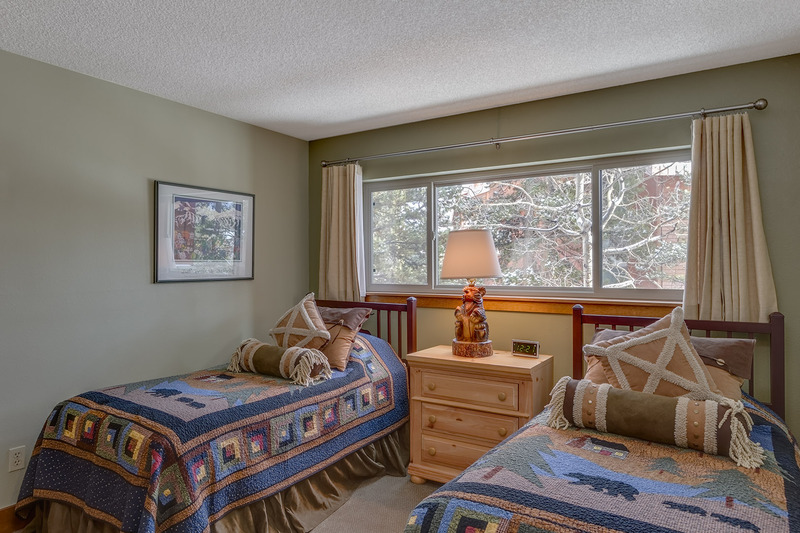 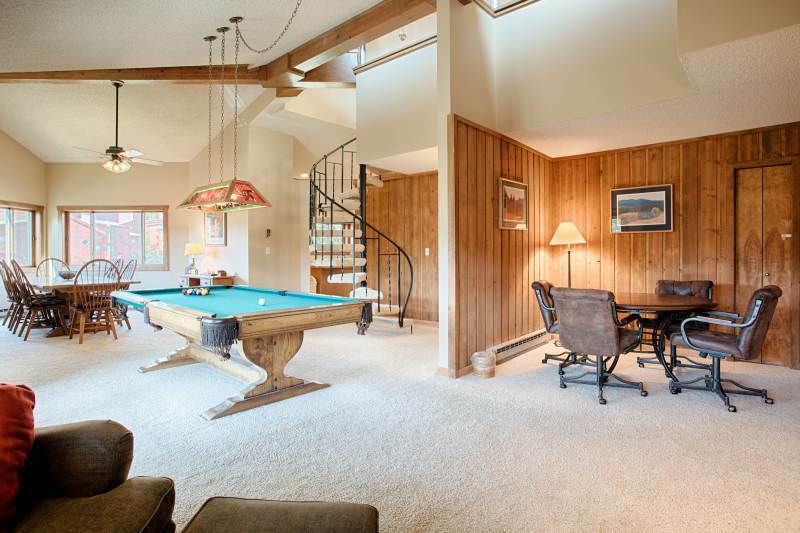 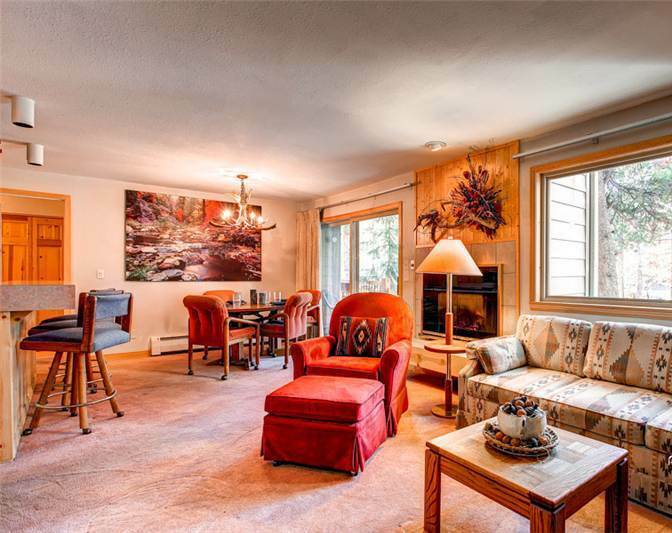 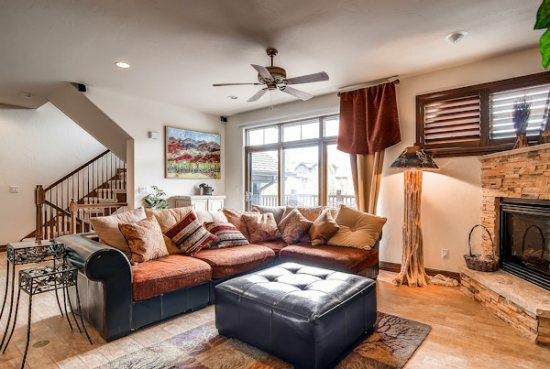 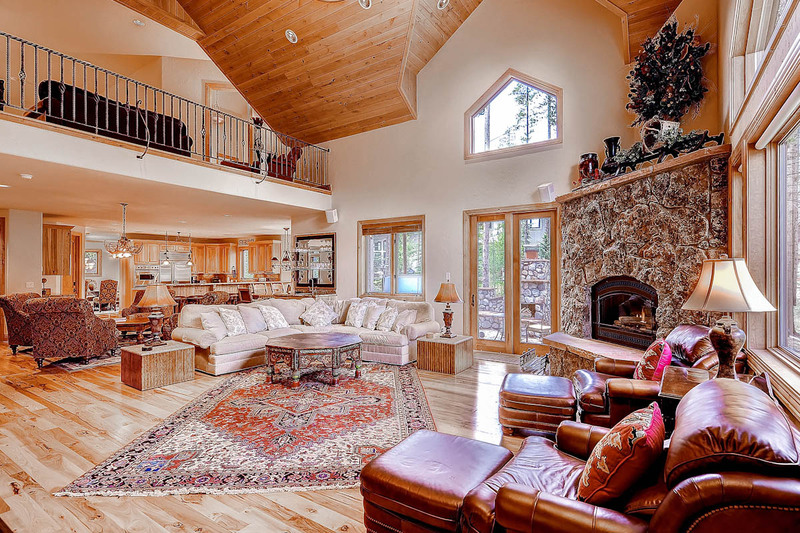 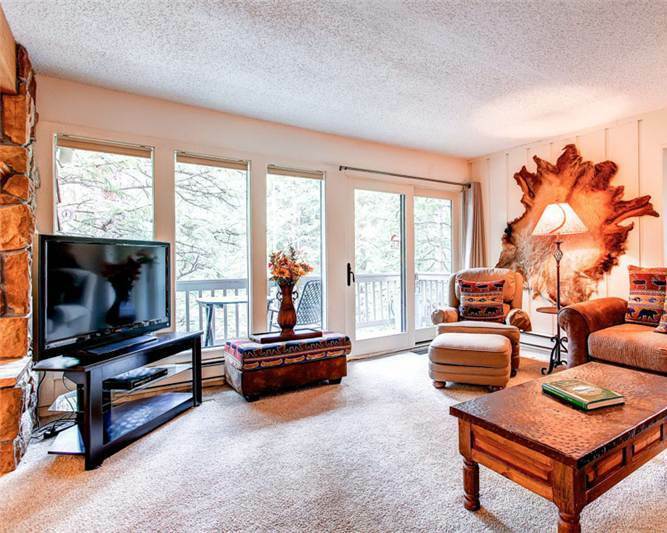 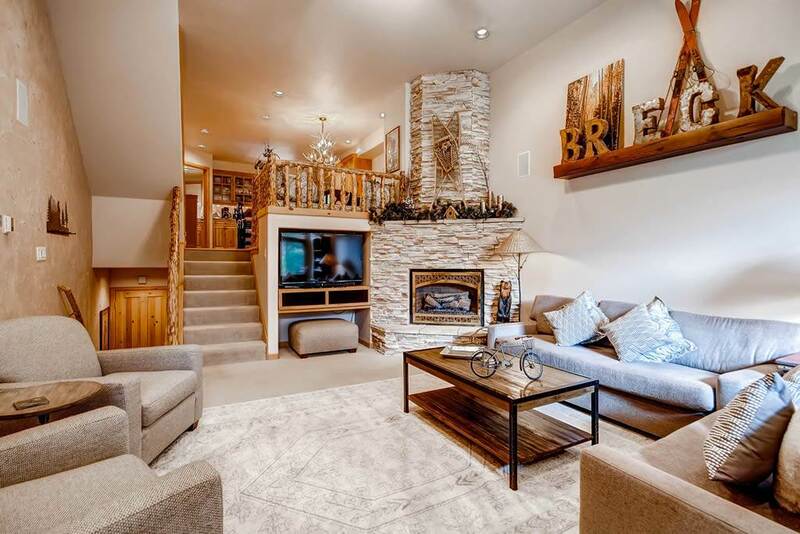 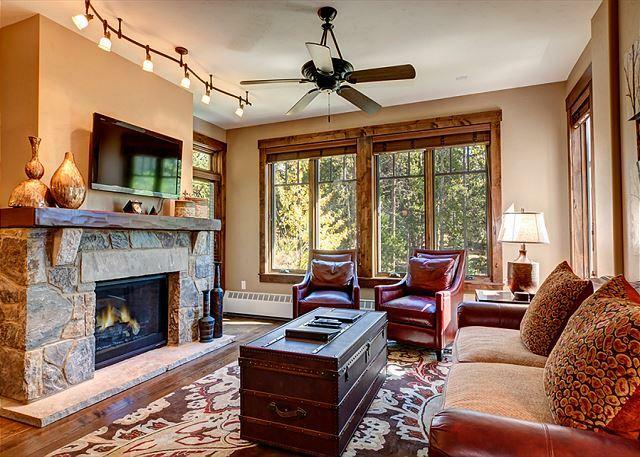 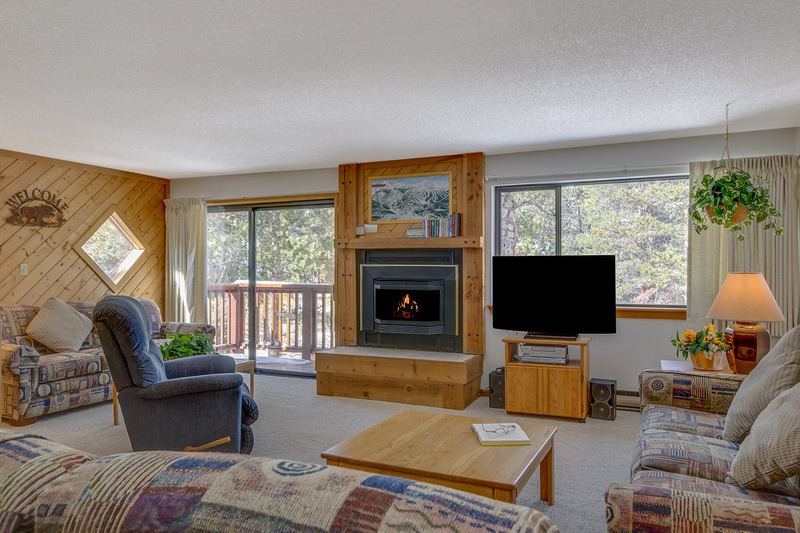 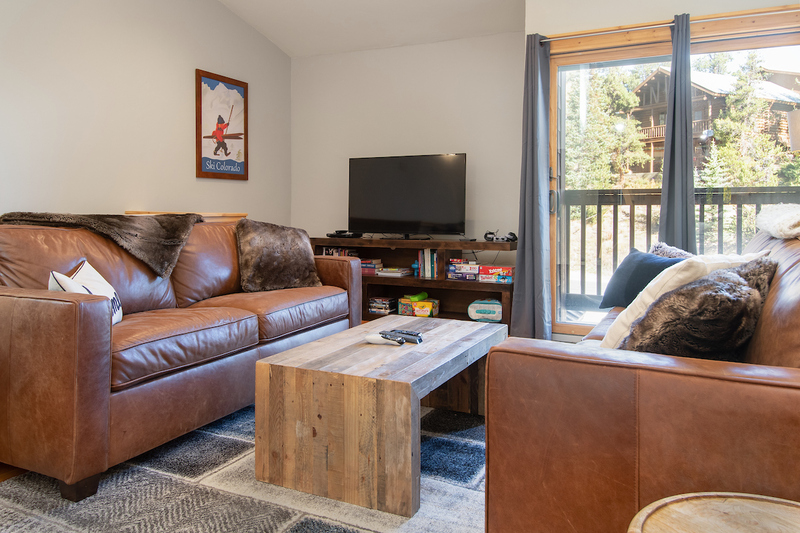 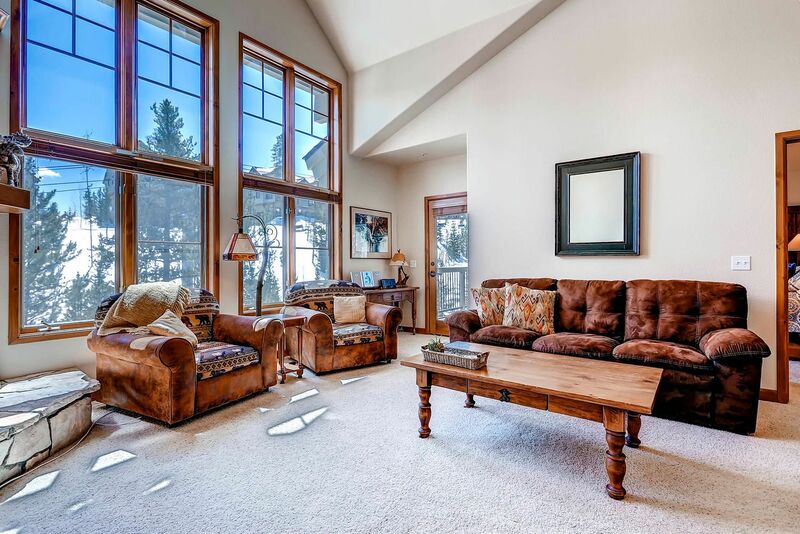 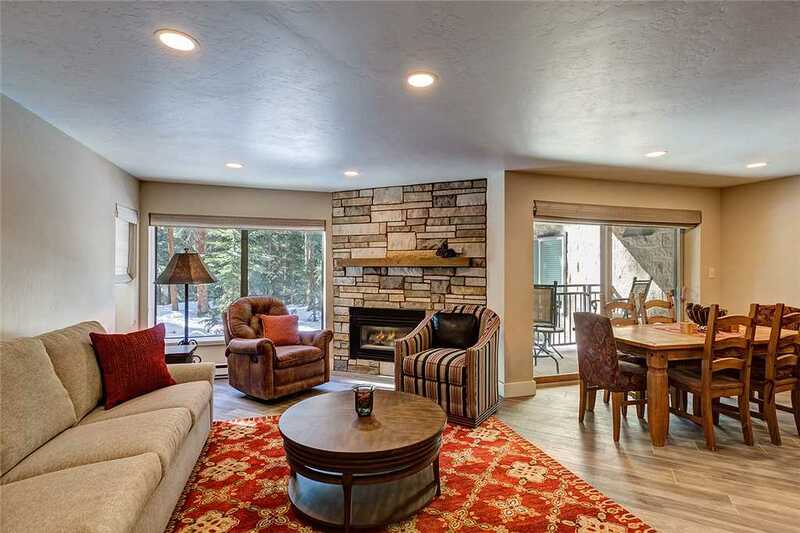 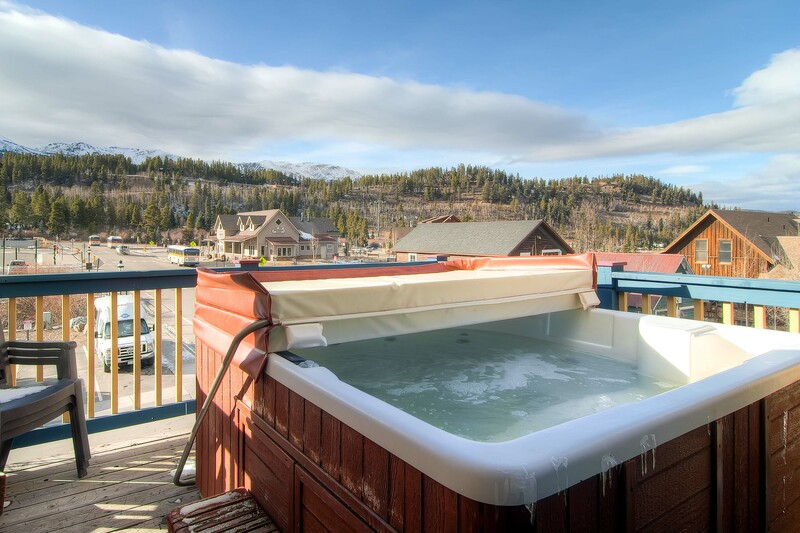 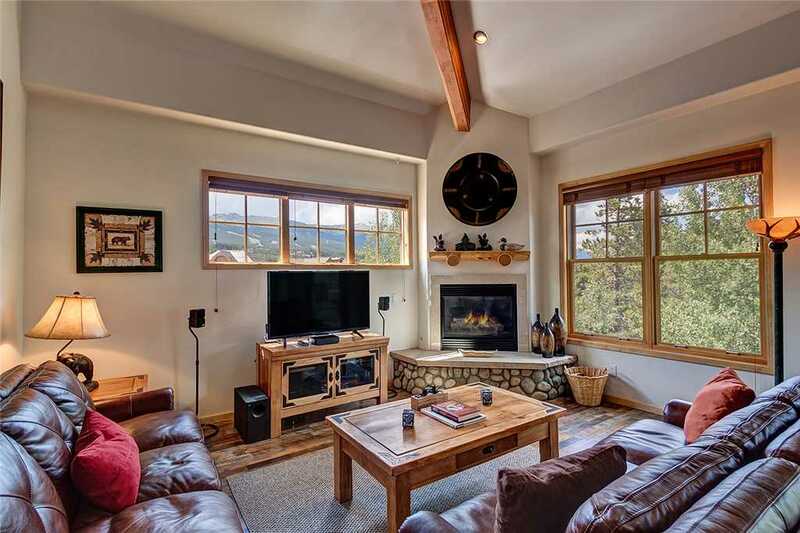 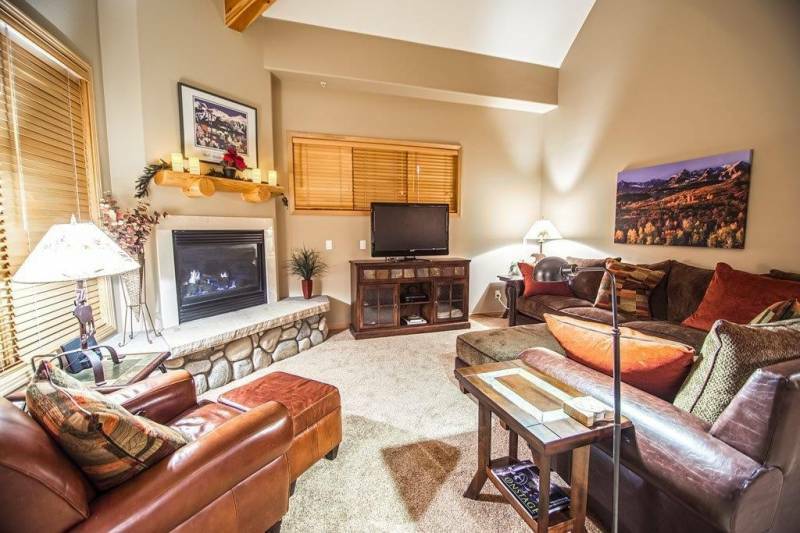 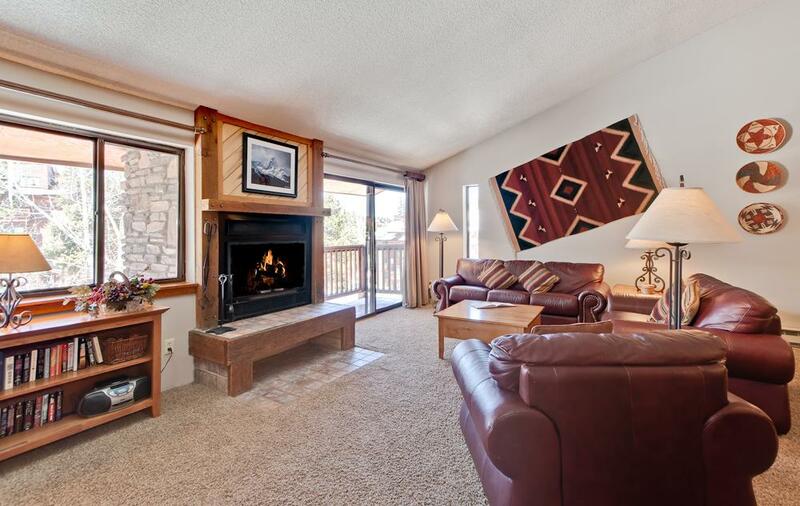 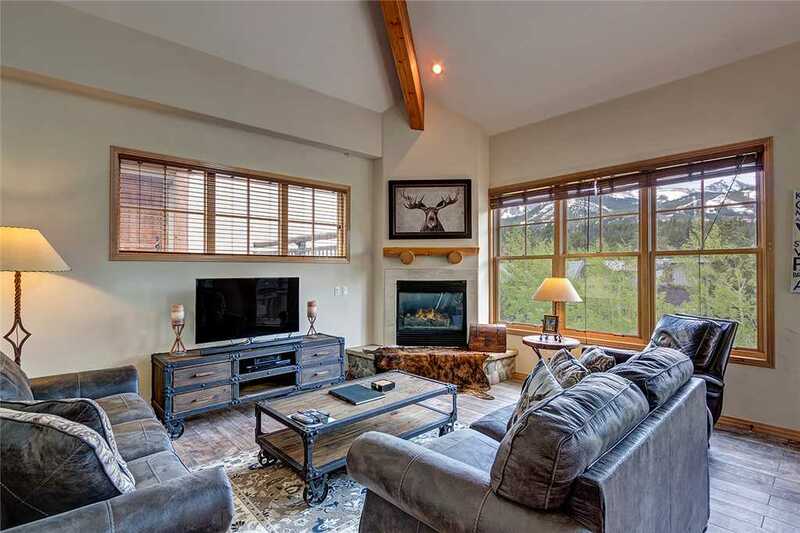 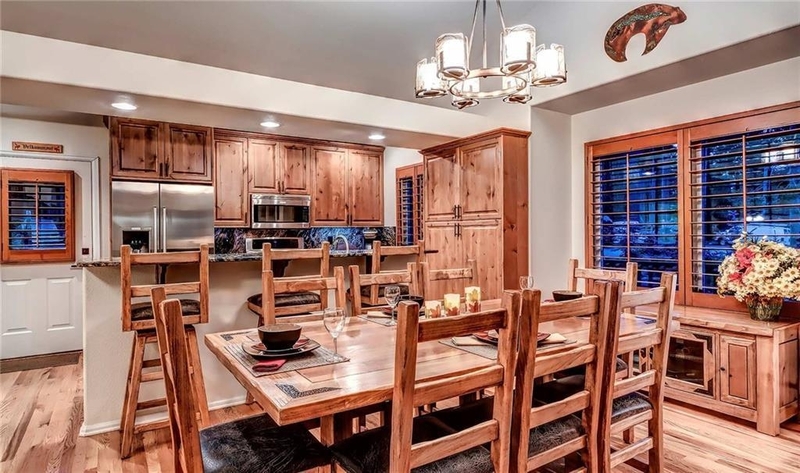 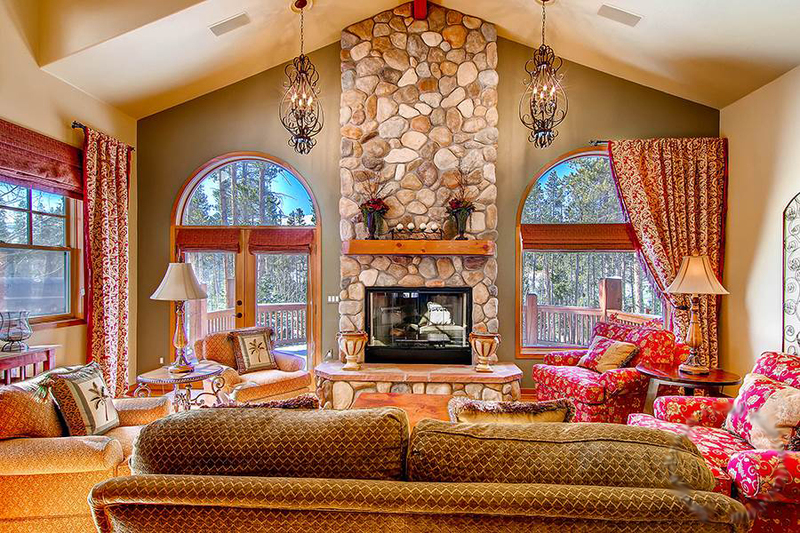 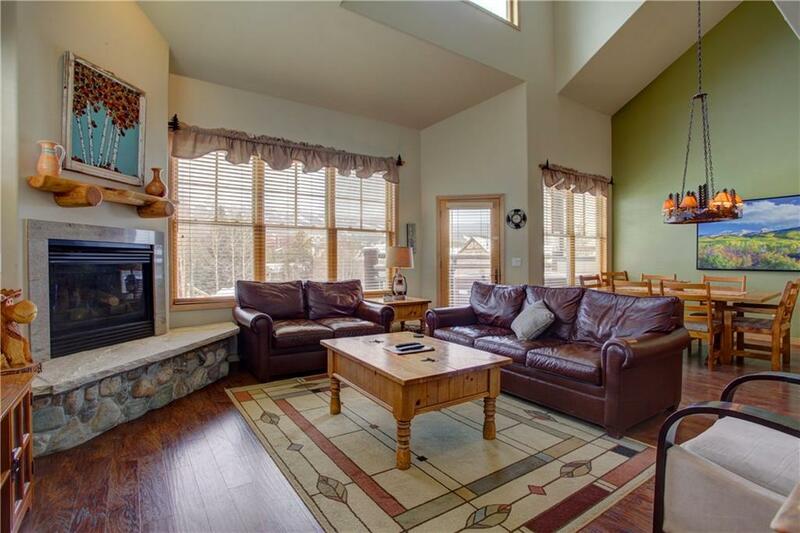 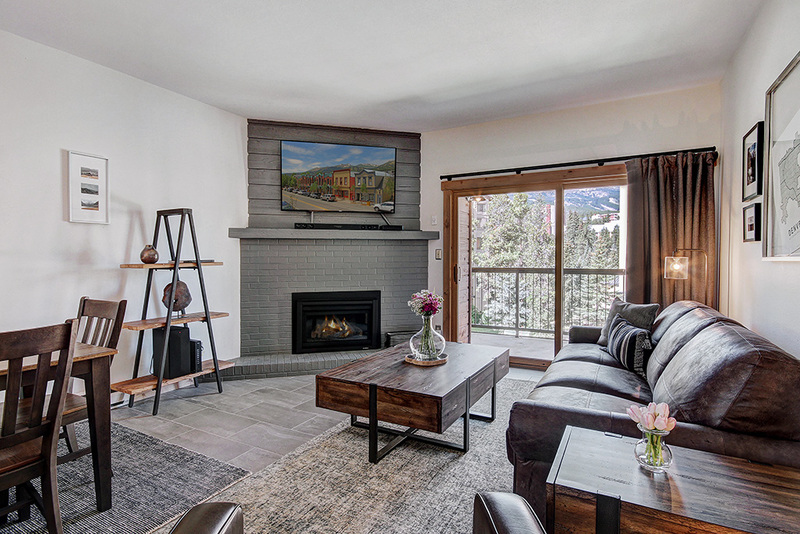 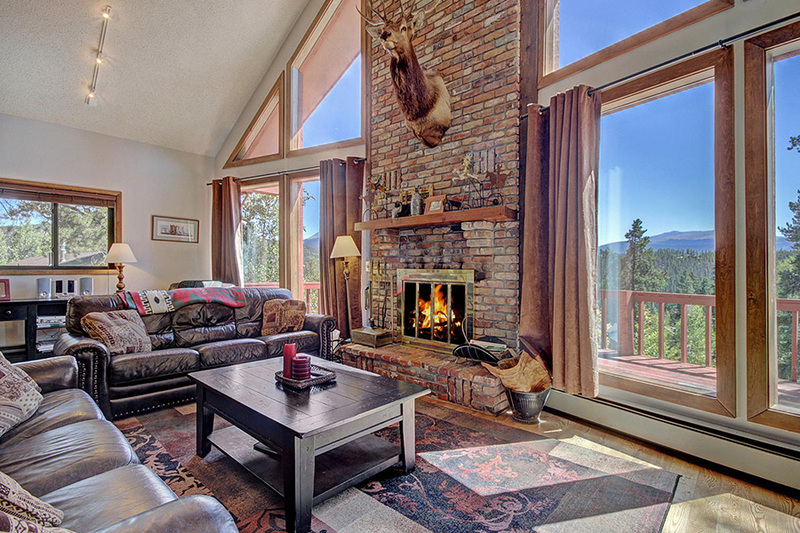 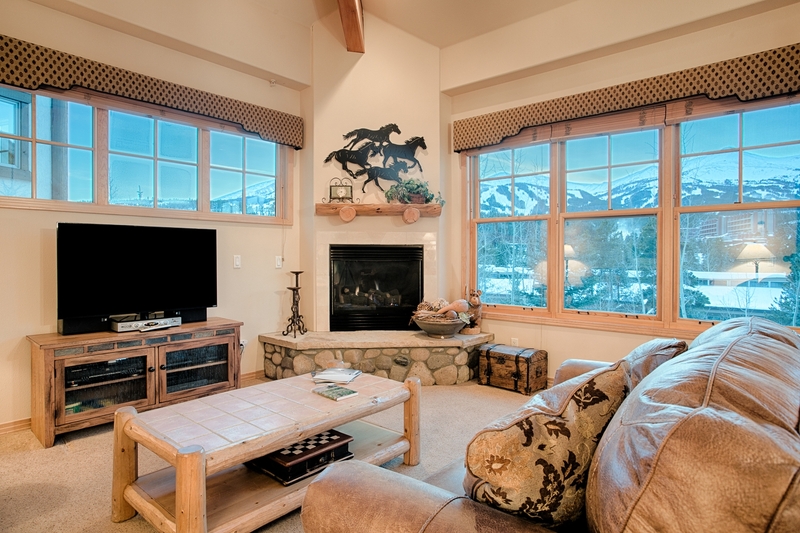 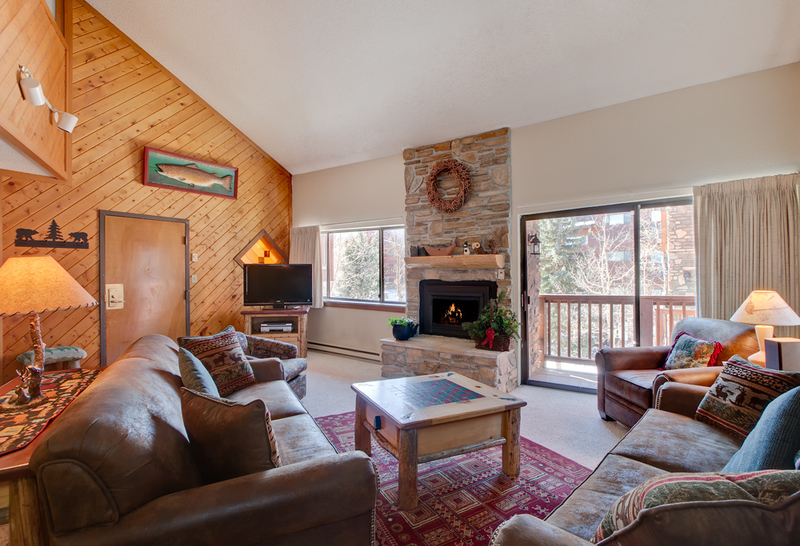 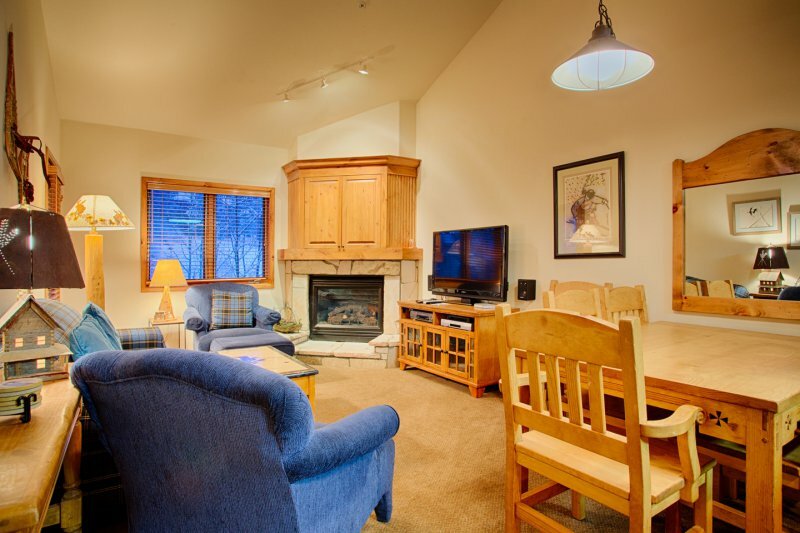 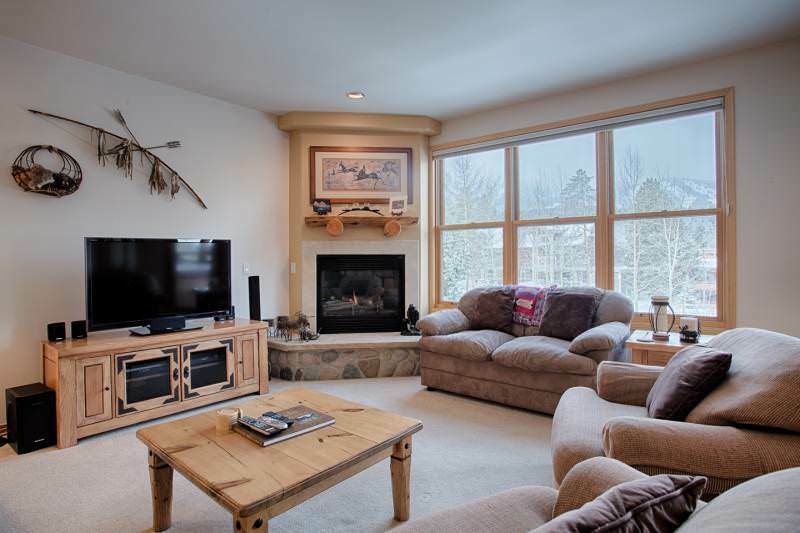 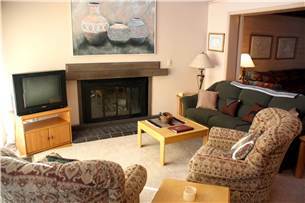 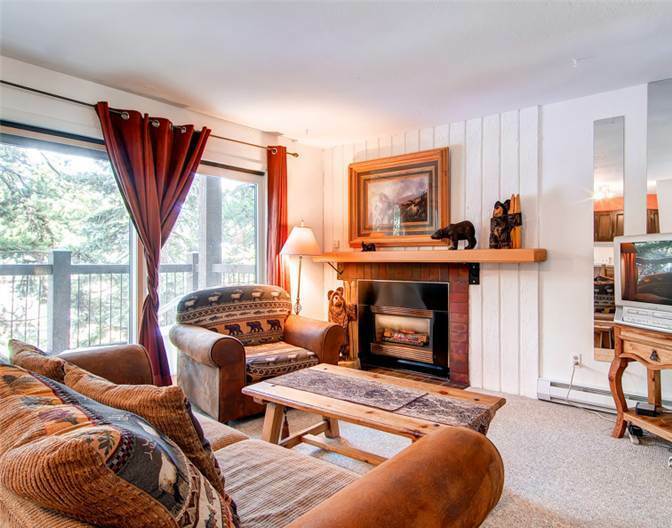 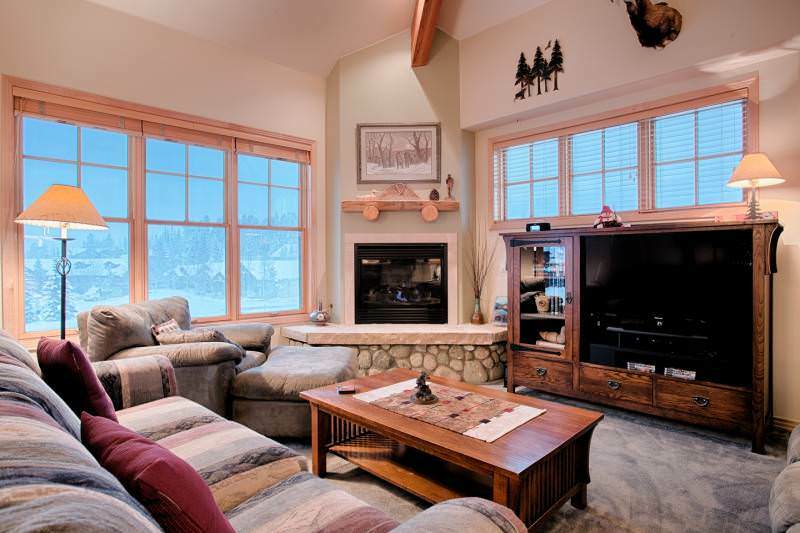 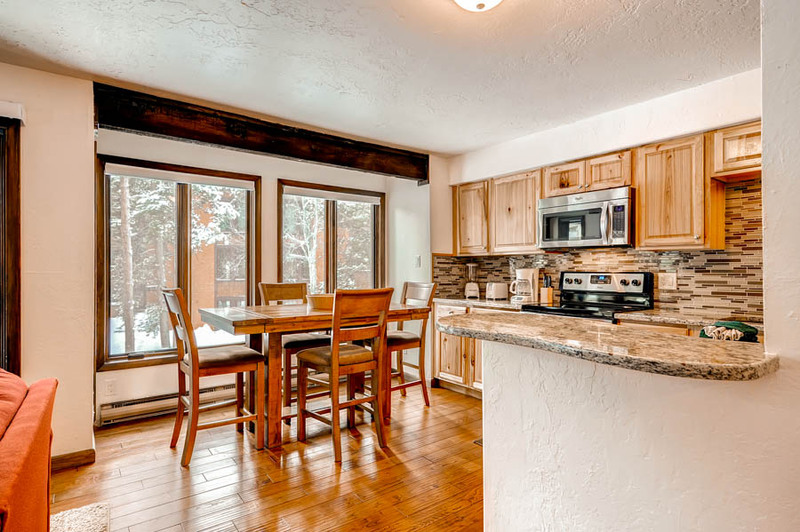 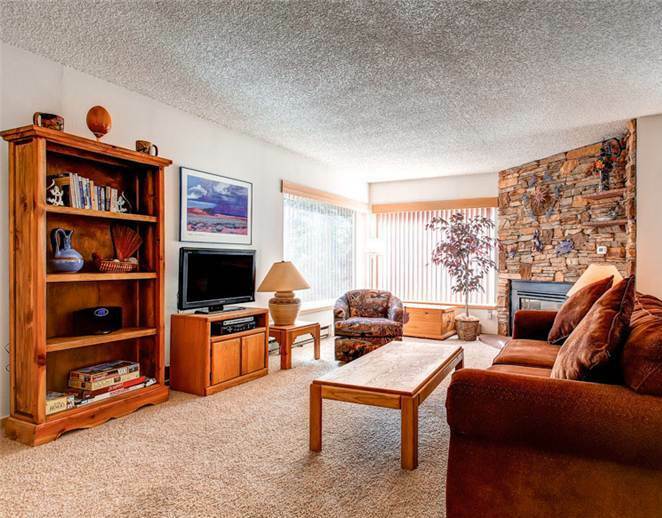 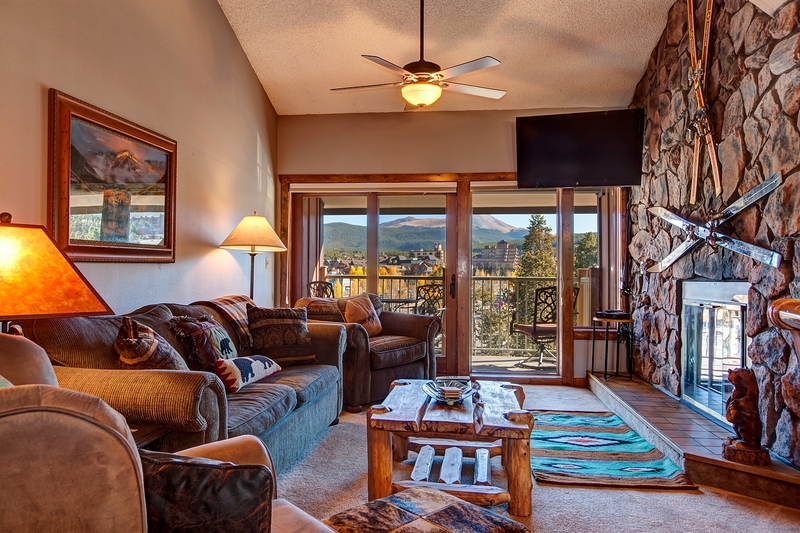 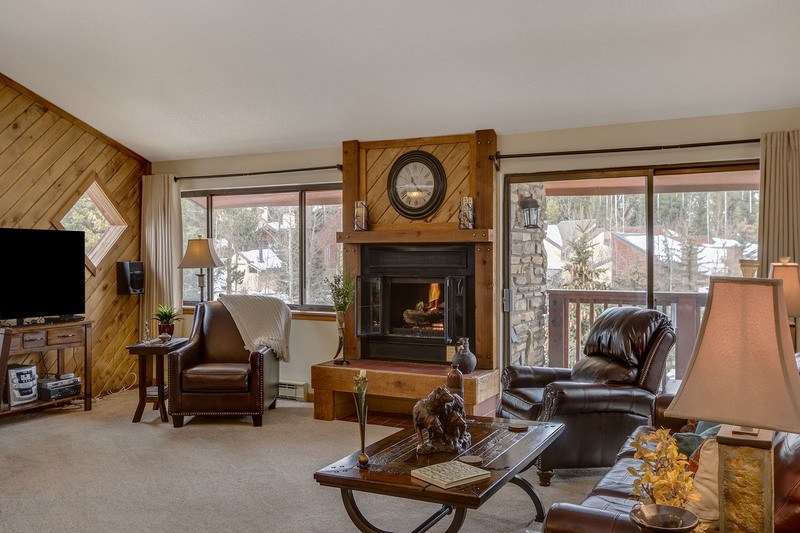 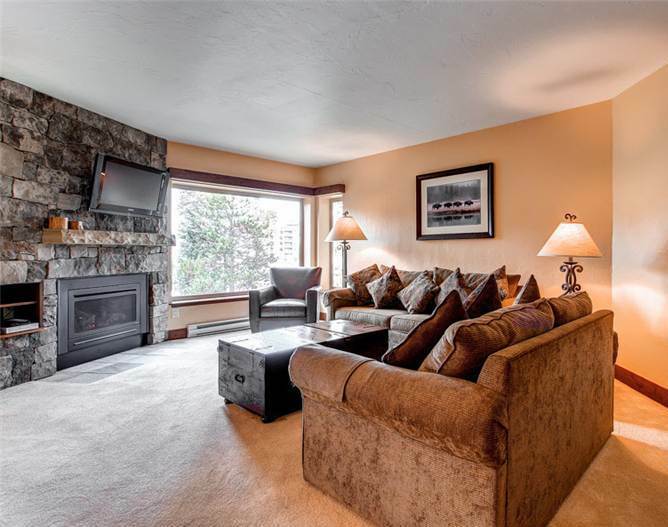 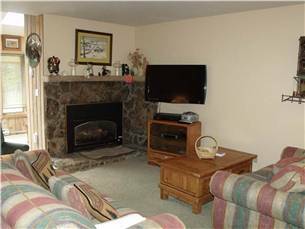 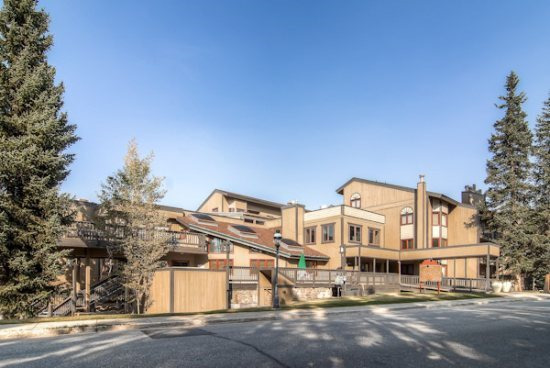 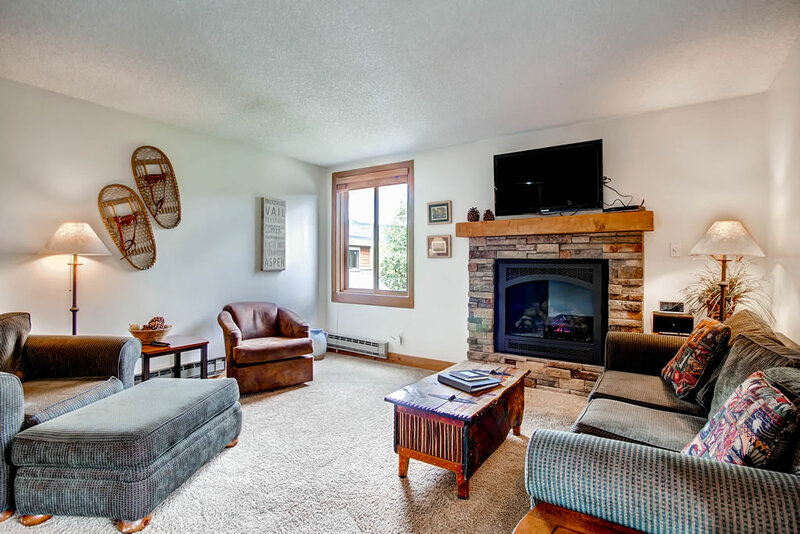 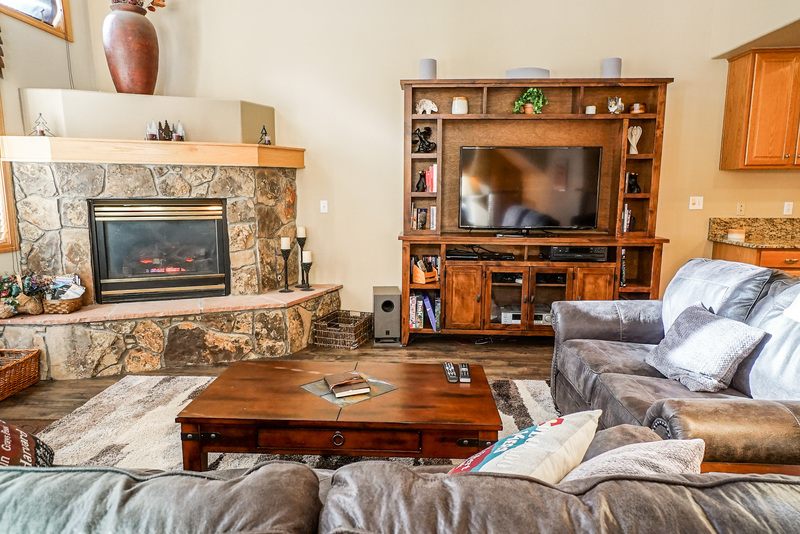 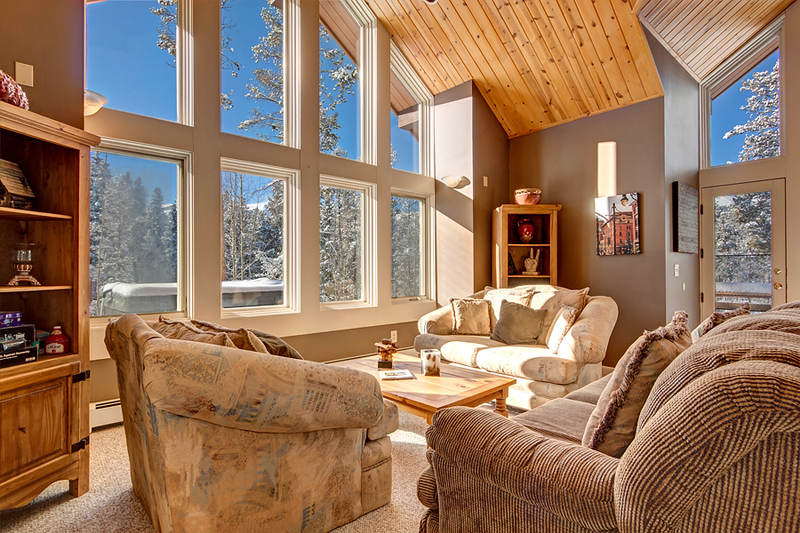 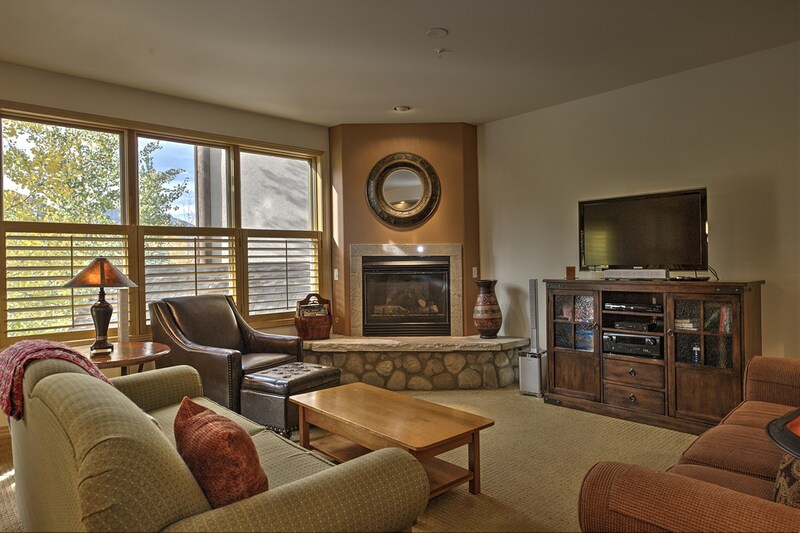 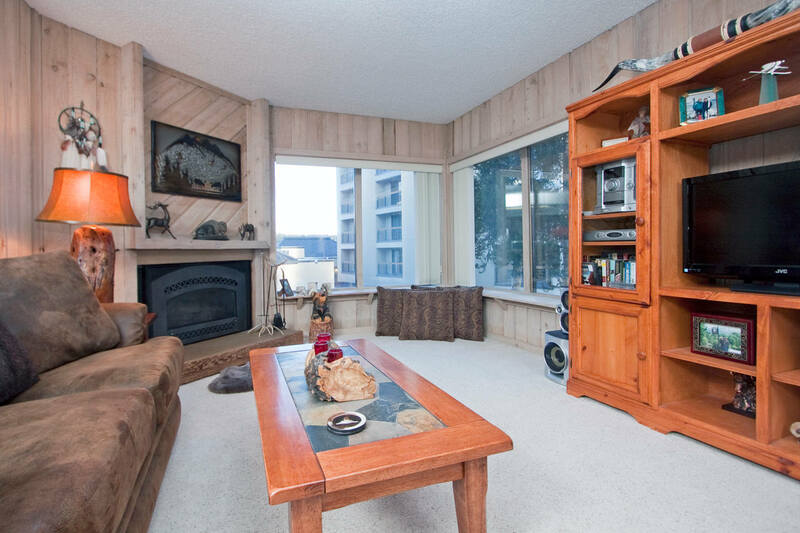 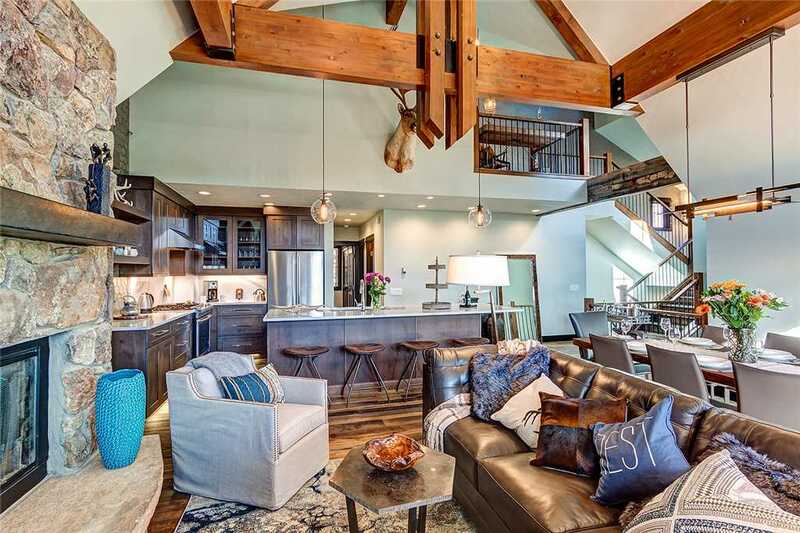 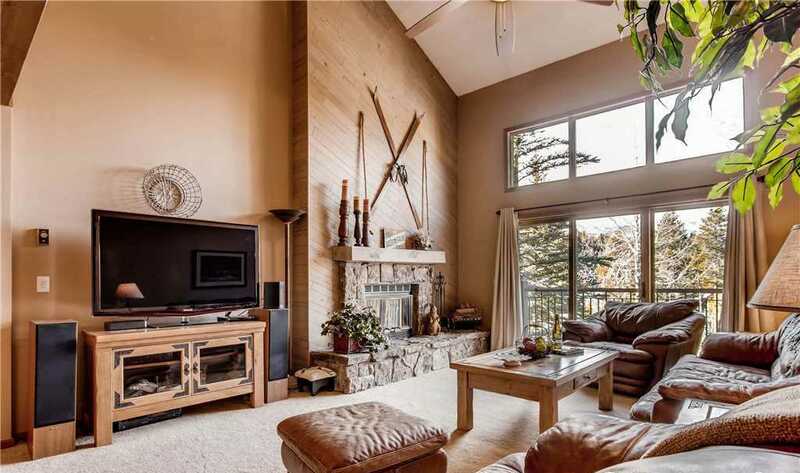 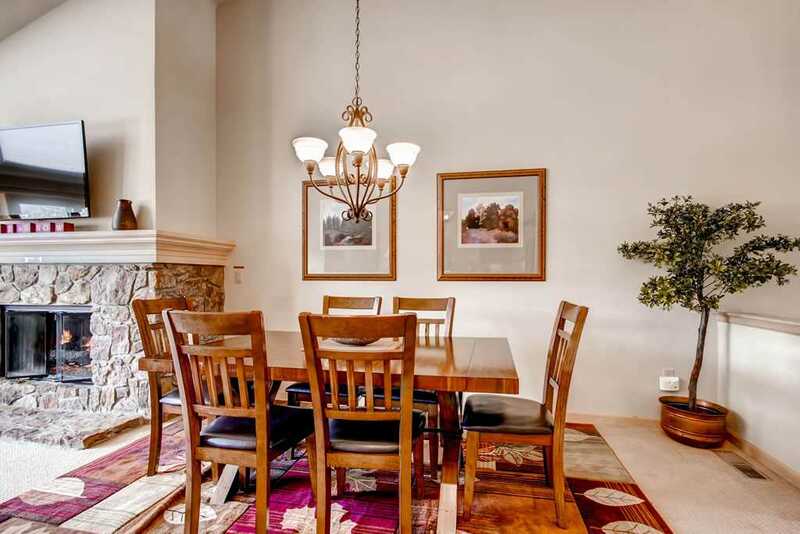 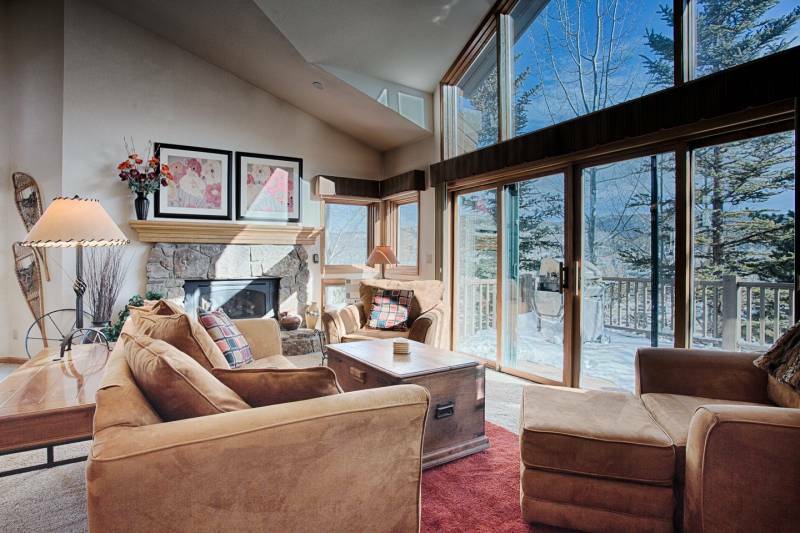 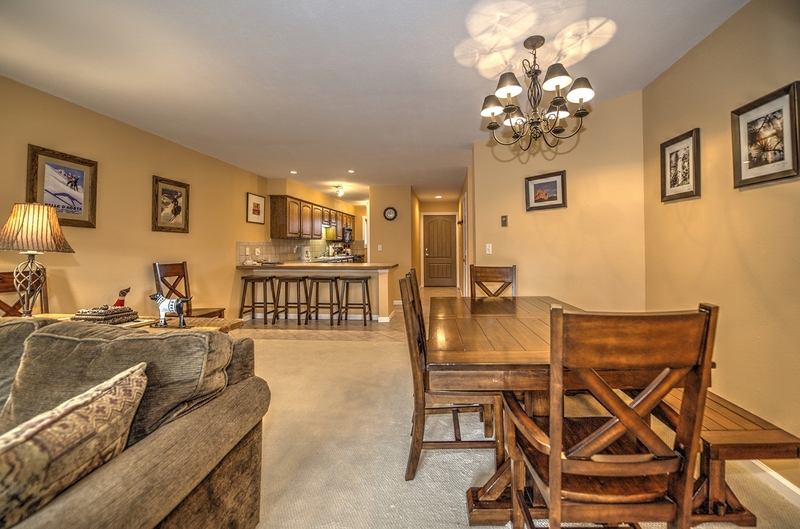 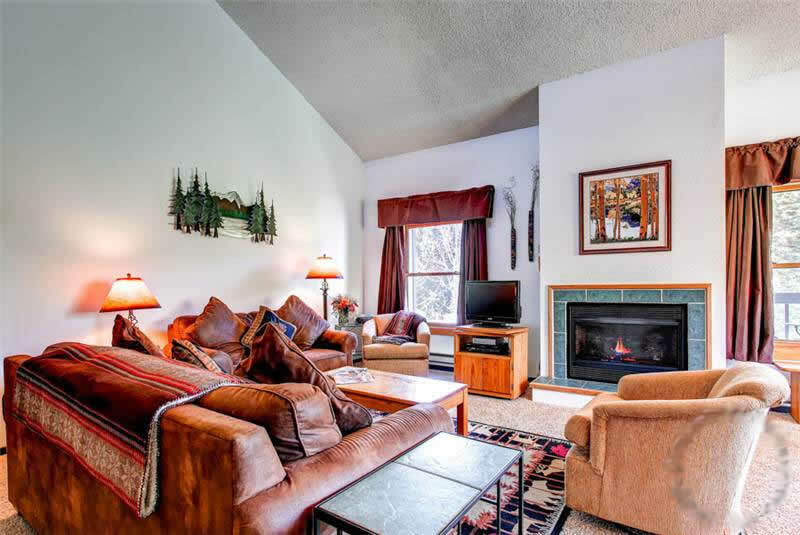 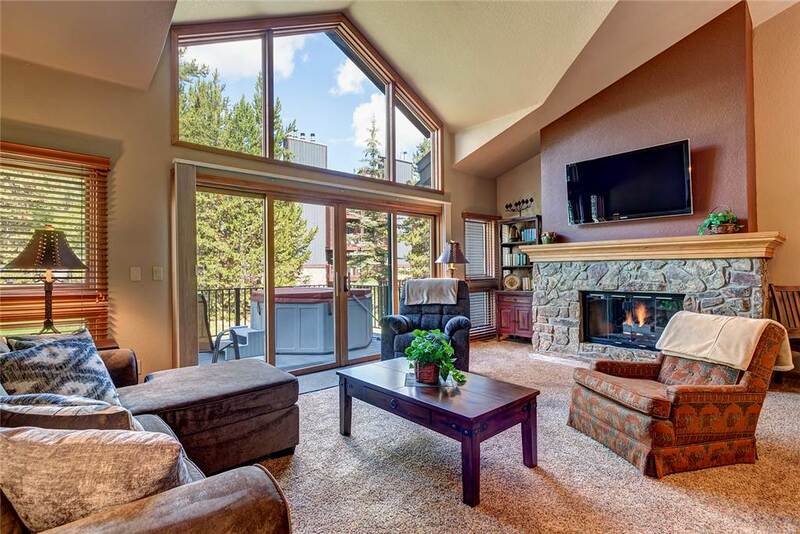 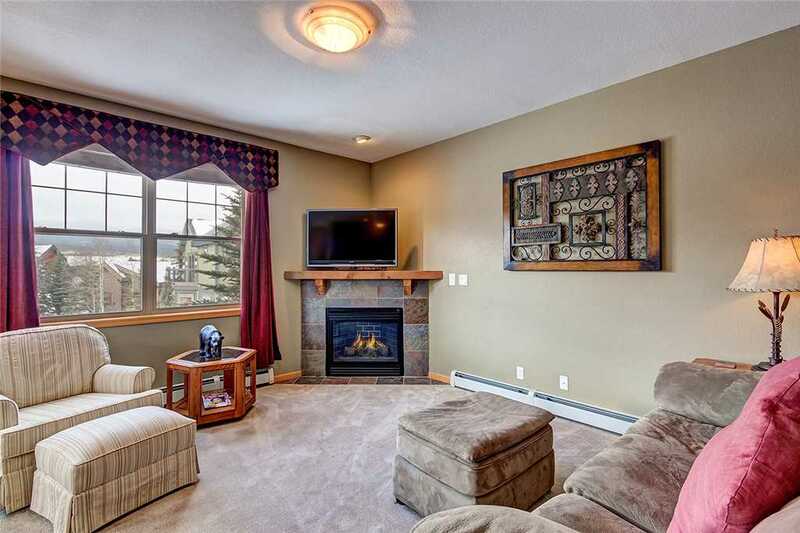 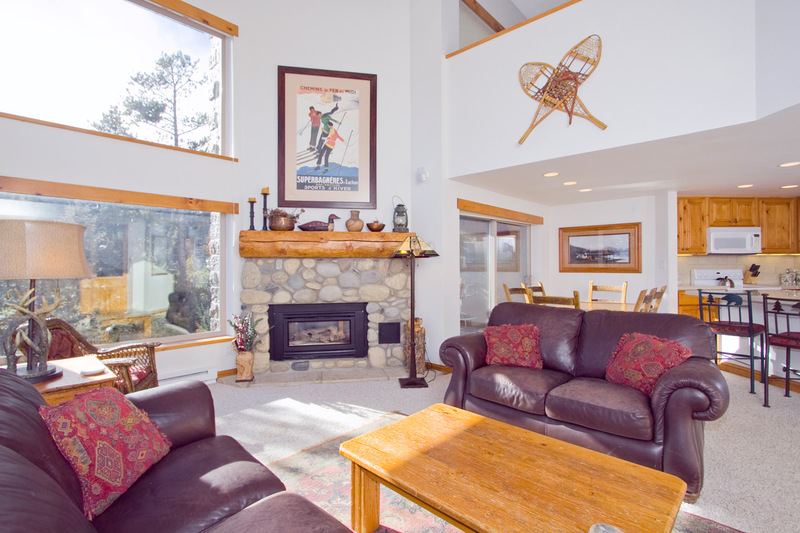 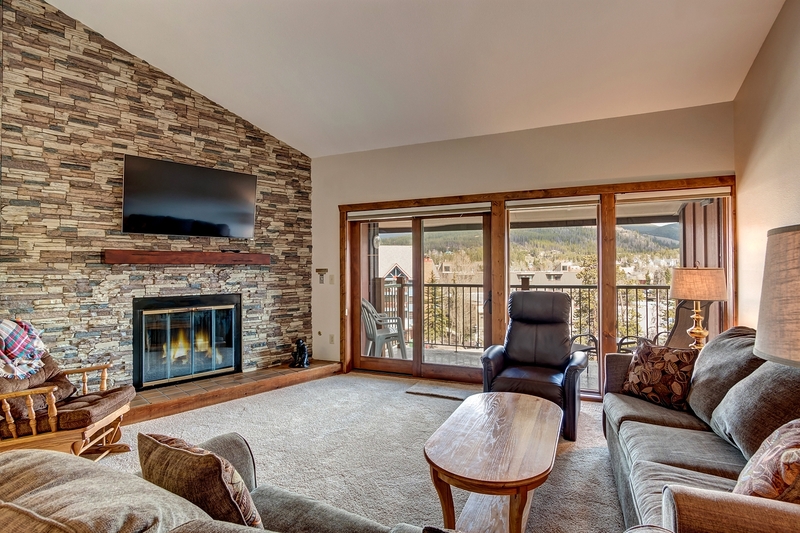 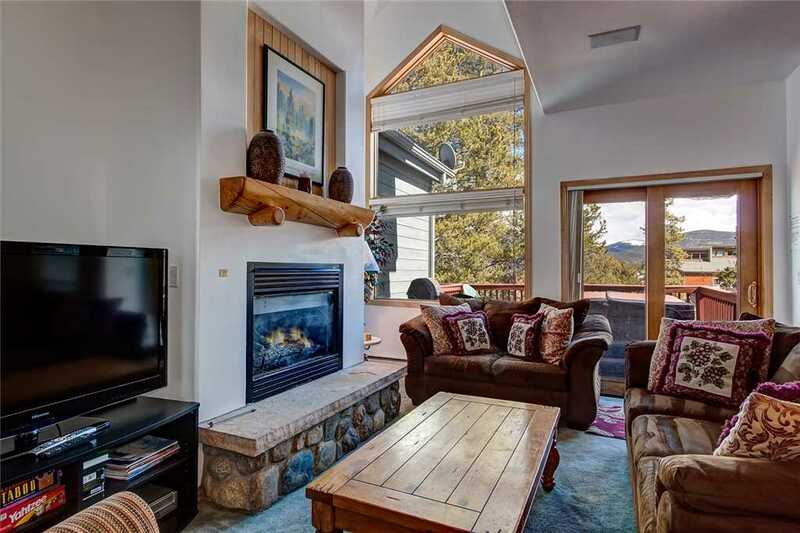 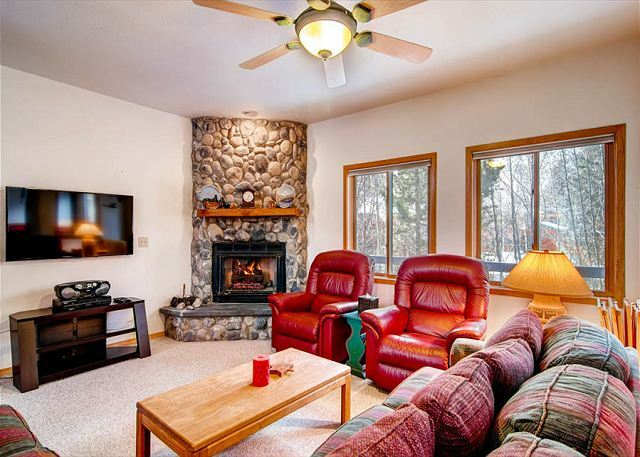 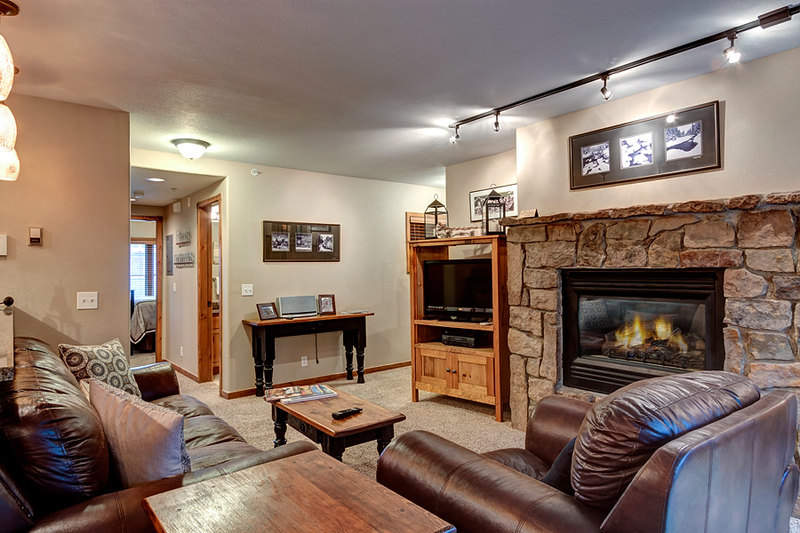 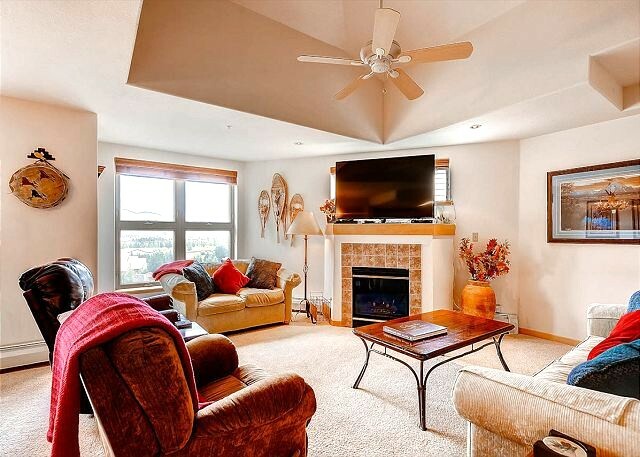 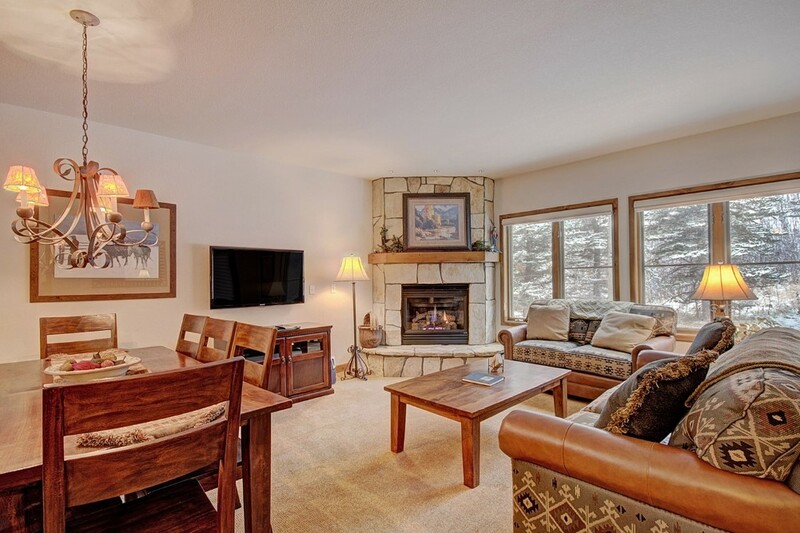 Besides being in an ultimate Ski-In/Ski-Out location, there are a variety of amenities that make this condo an amazing find. 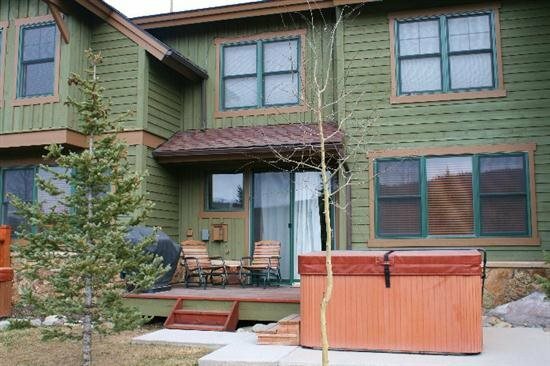 Wireless internet, a private walk out patio from the unit, an on-site ski shop, large outdoor hot tub, two indoor hot tubs, a Club House with deck and BBQ grills, washer and dryer in unit and convenient access to the Breckenridge Free Ride shuttle stop right out front of the building. 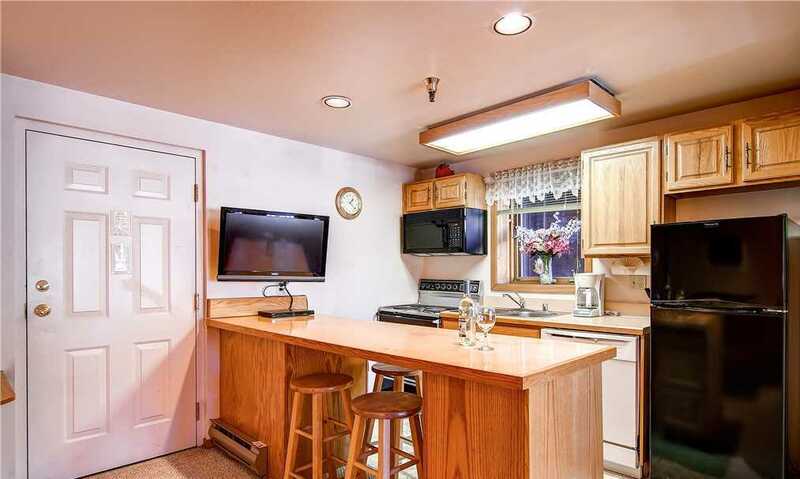 This unit only allows for one vehicle.